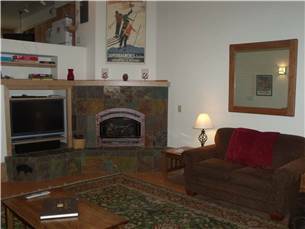 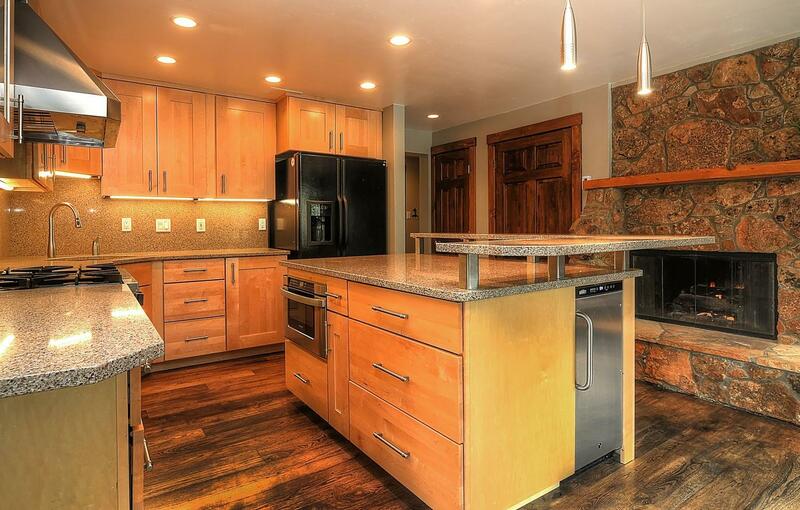 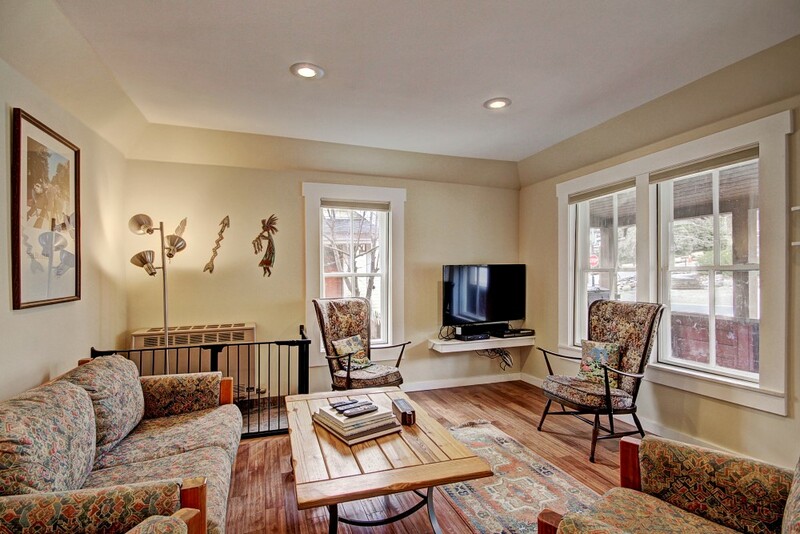 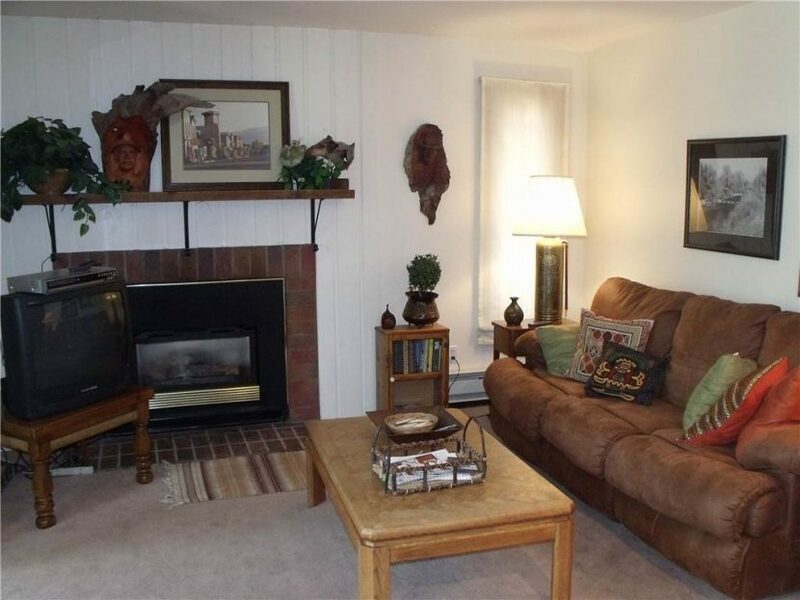 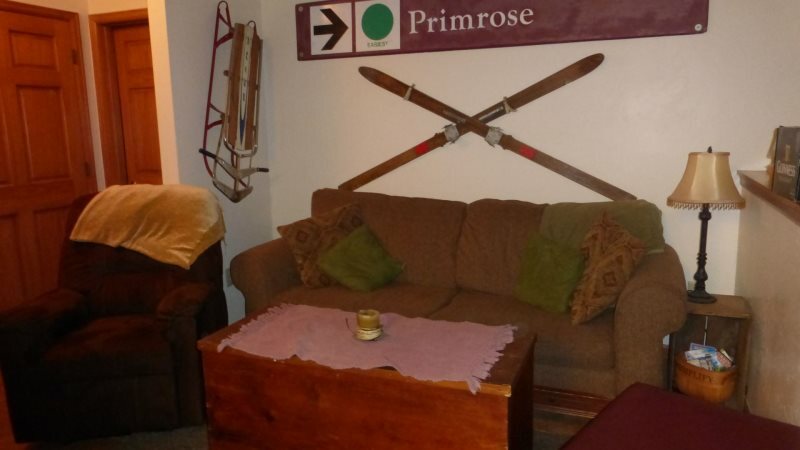 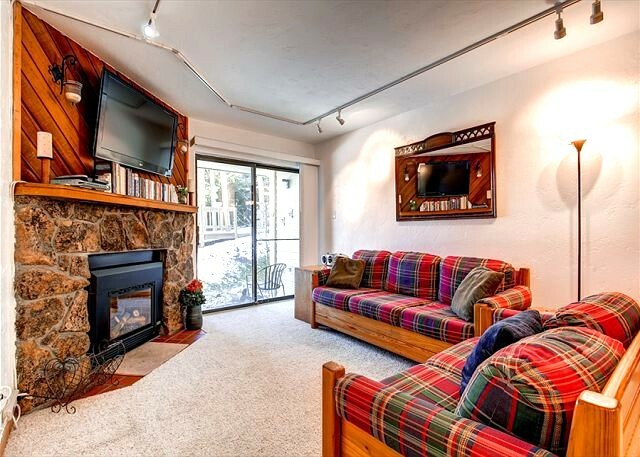 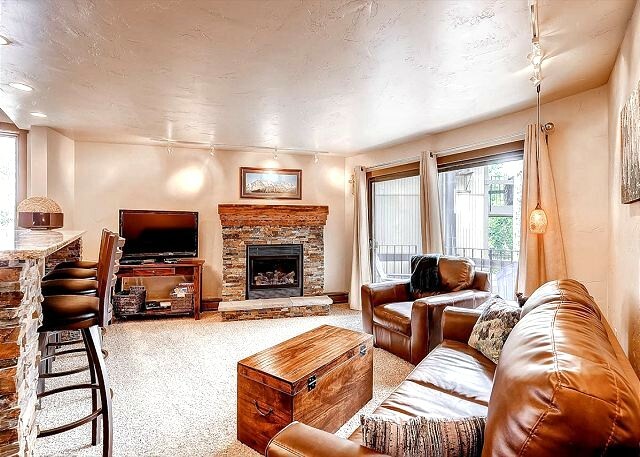 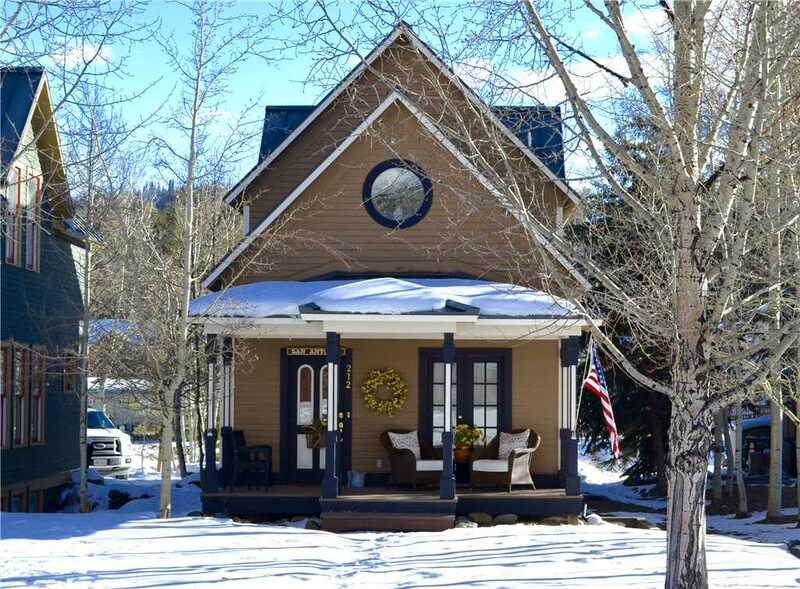 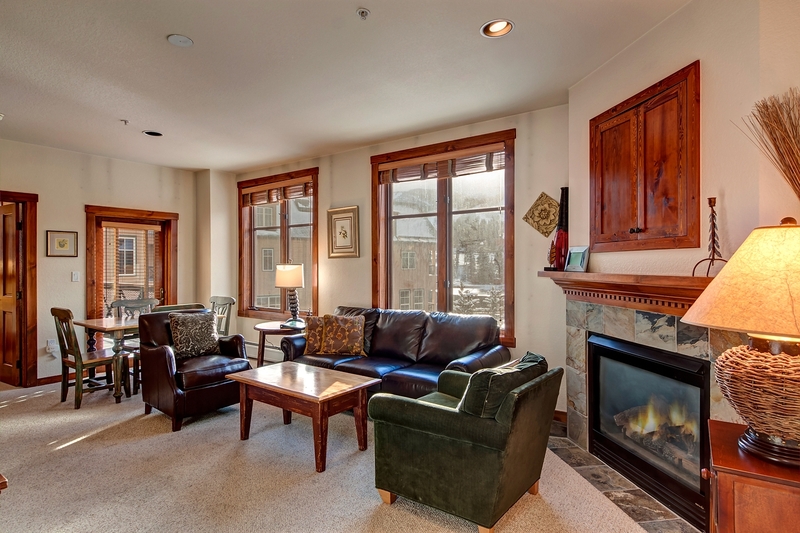 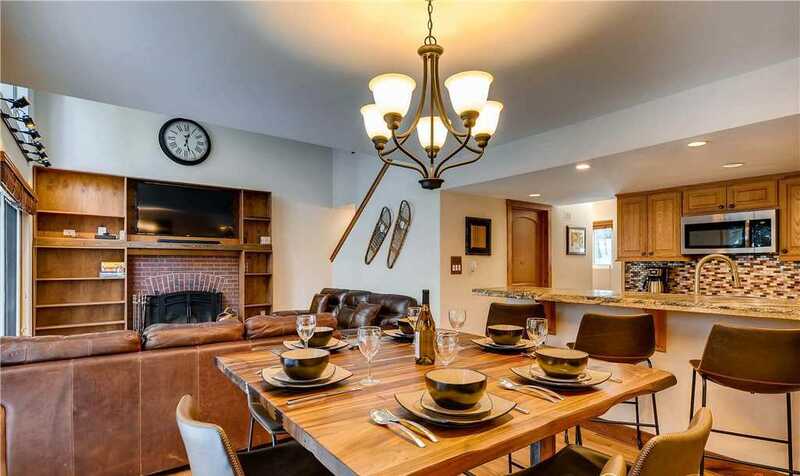 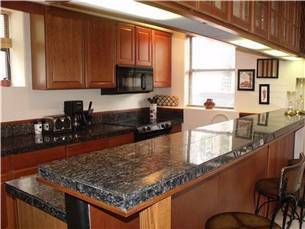 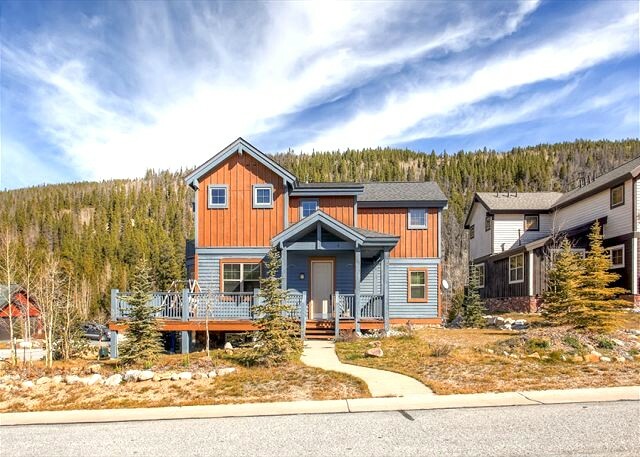 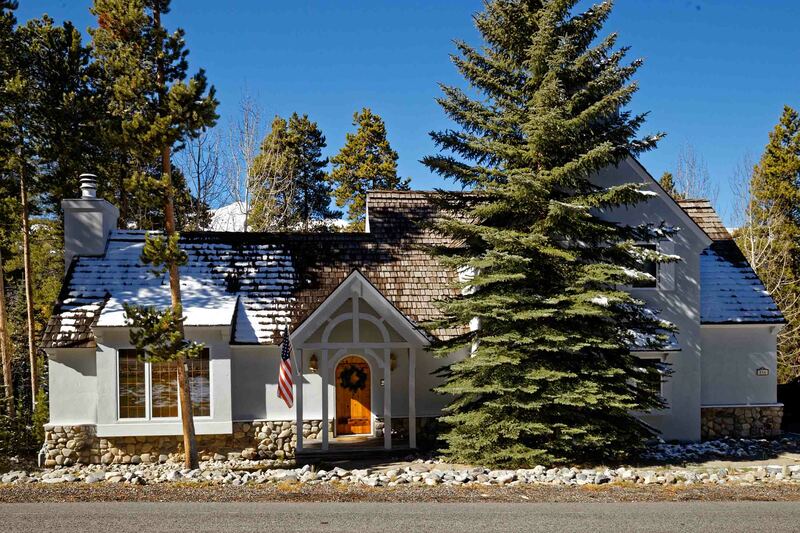 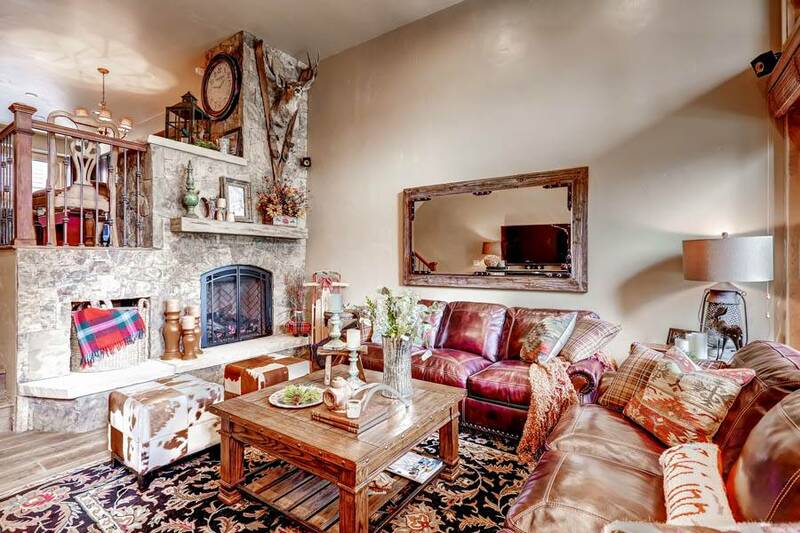 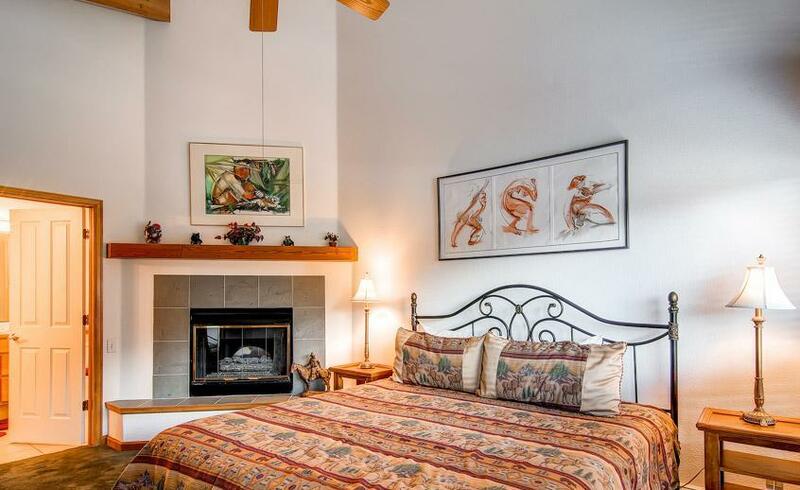 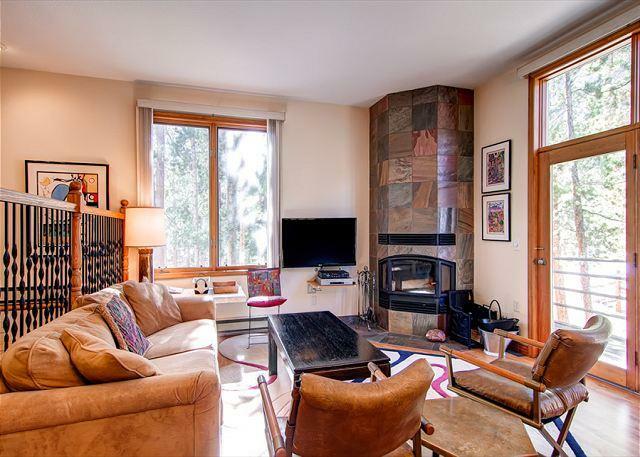 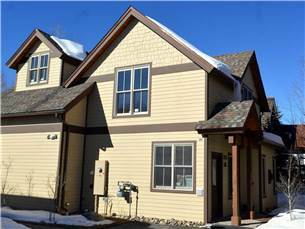 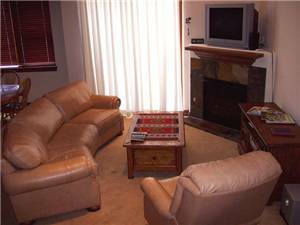 This economical condo is located in the Historic District on French Street, about 3 blocks to Main Street and only 1/2 block to the stop for the free shuttle to the slopes. 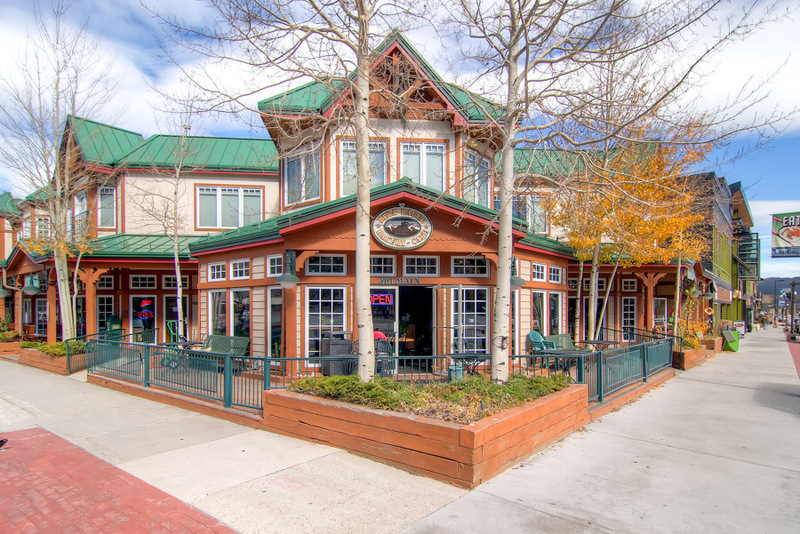 It’s a short walk to all the shops, restaurants & nightlife! 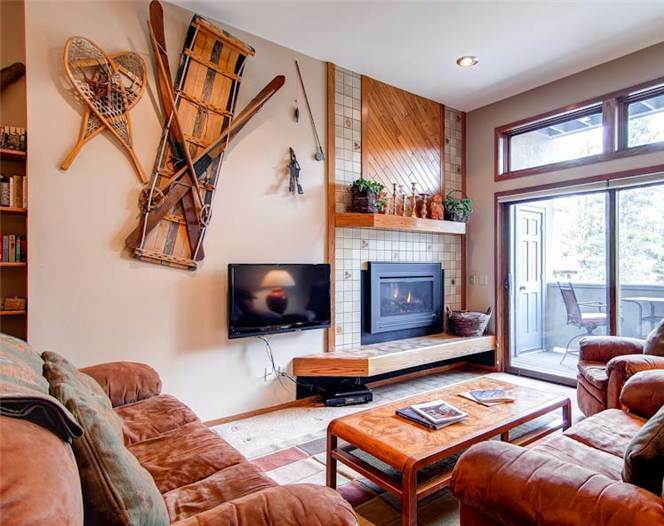 Bring your sled! 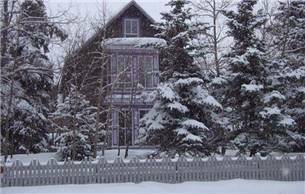 Carter Park is nearby with its famous sledding hill during the winter and tennis courts, playground & dog park during the summer. 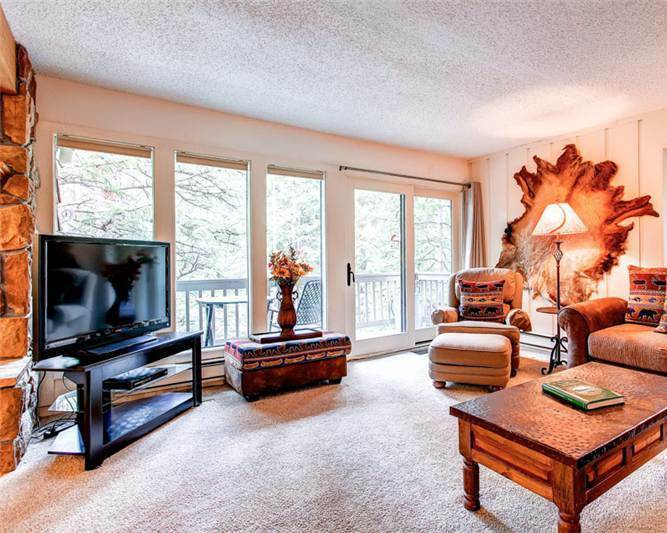 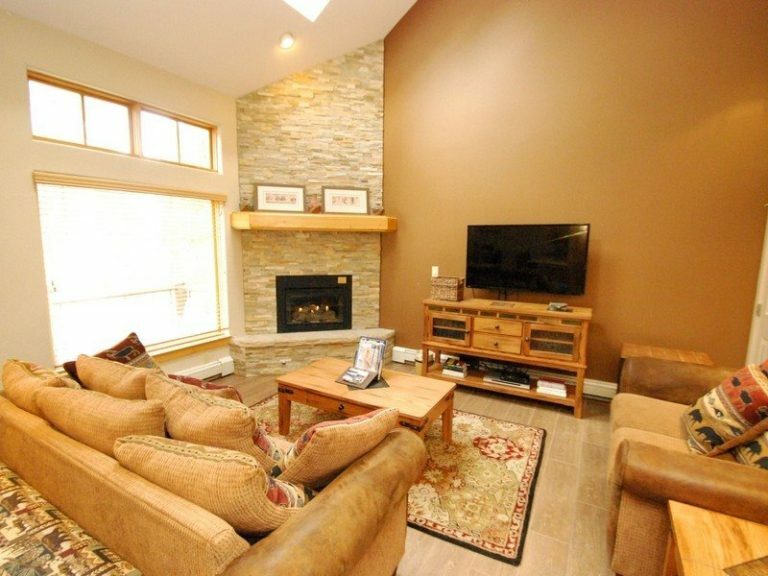 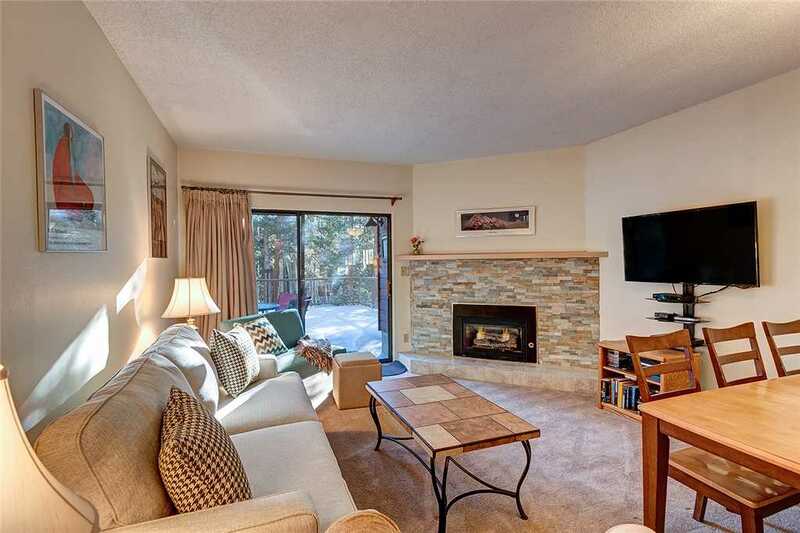 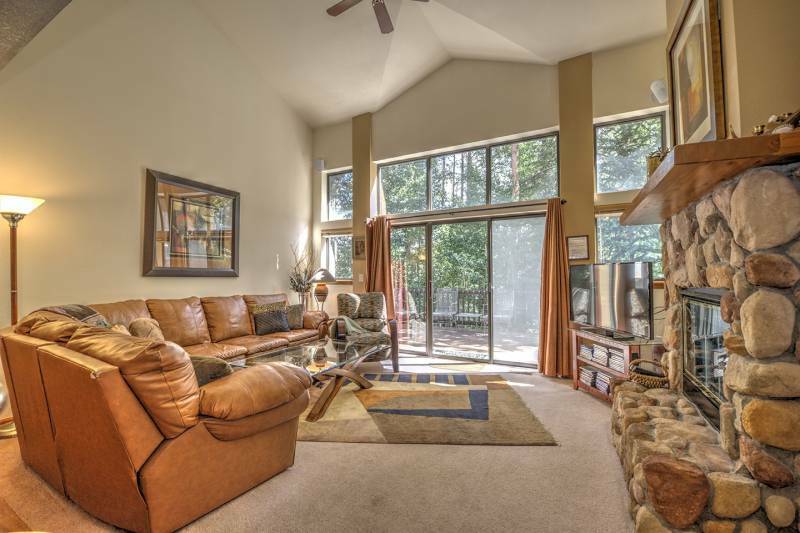 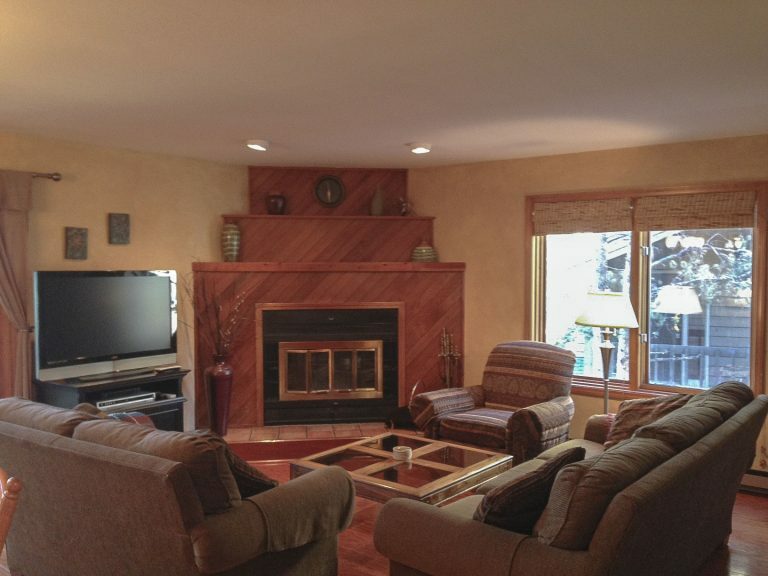 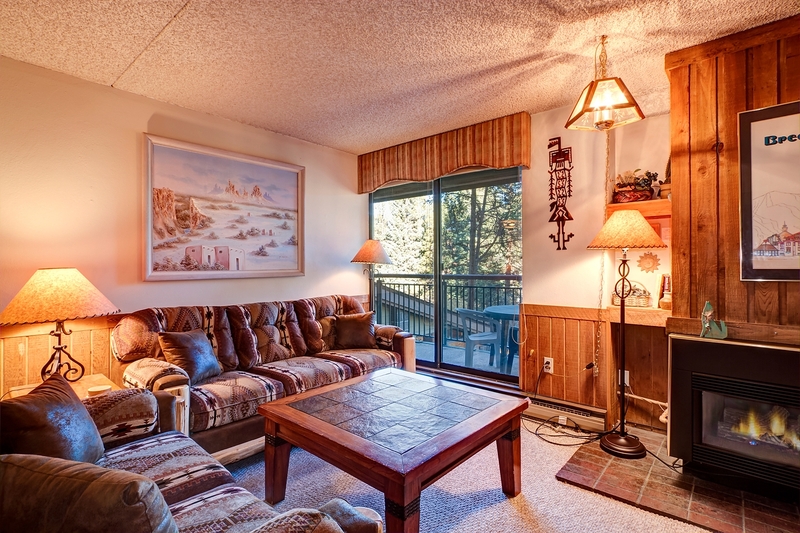 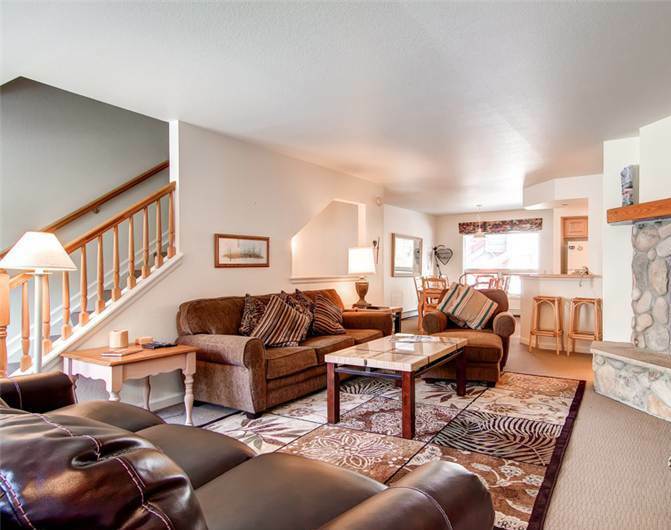 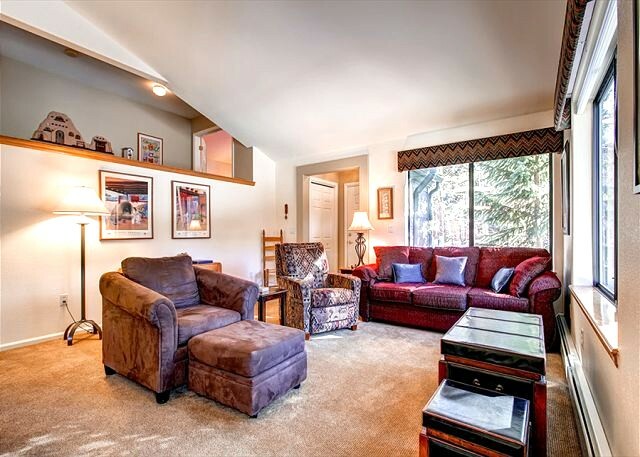 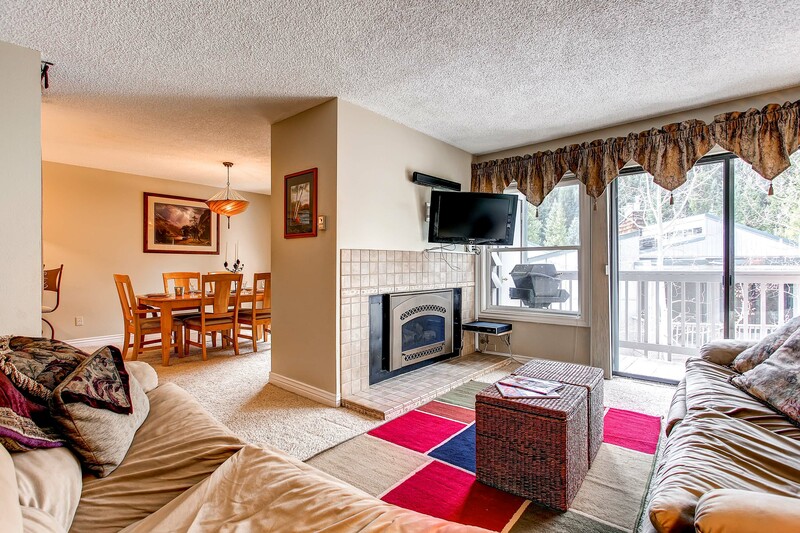 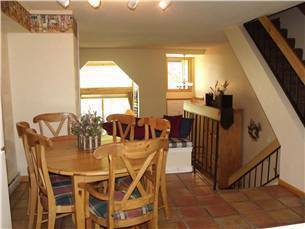 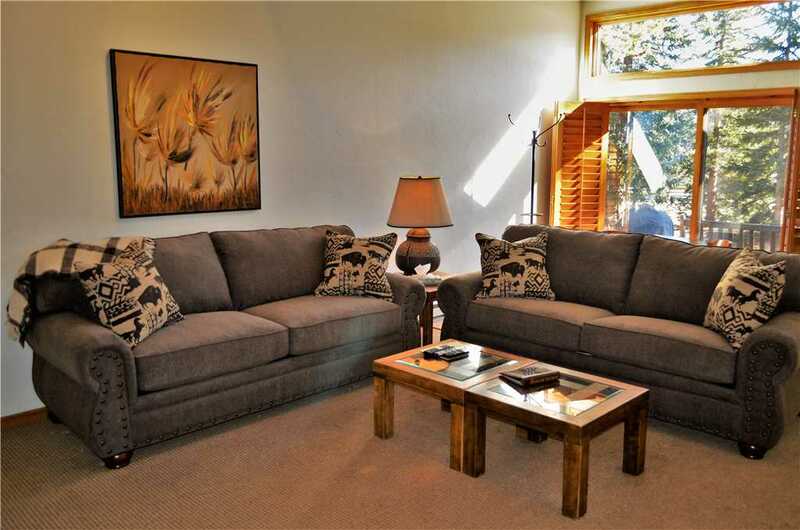 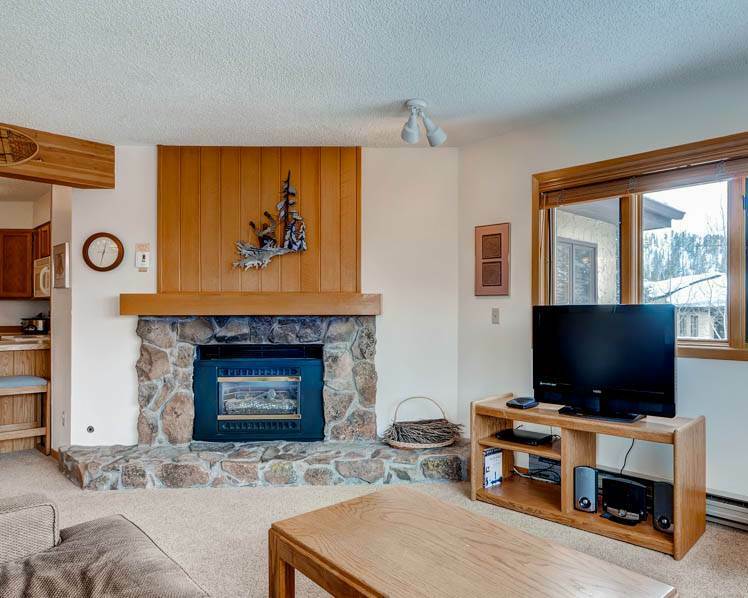 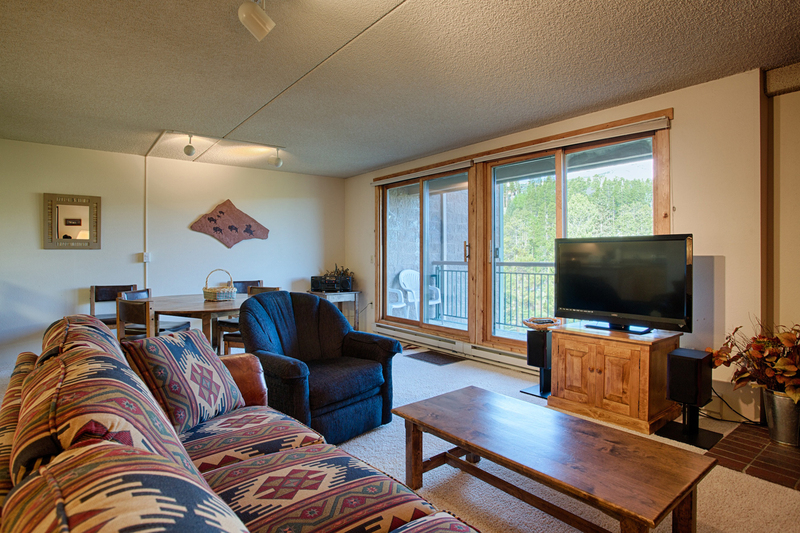 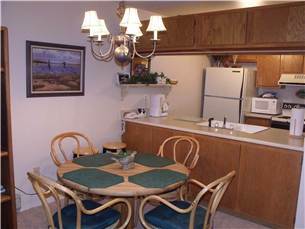 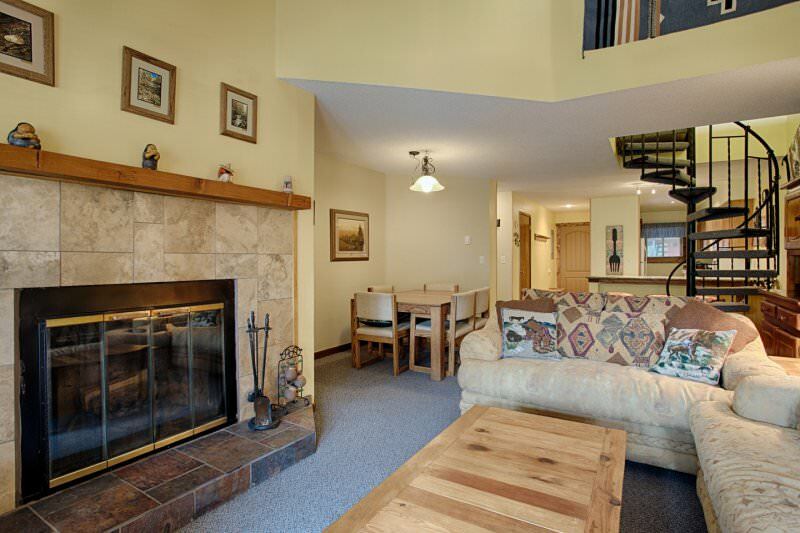 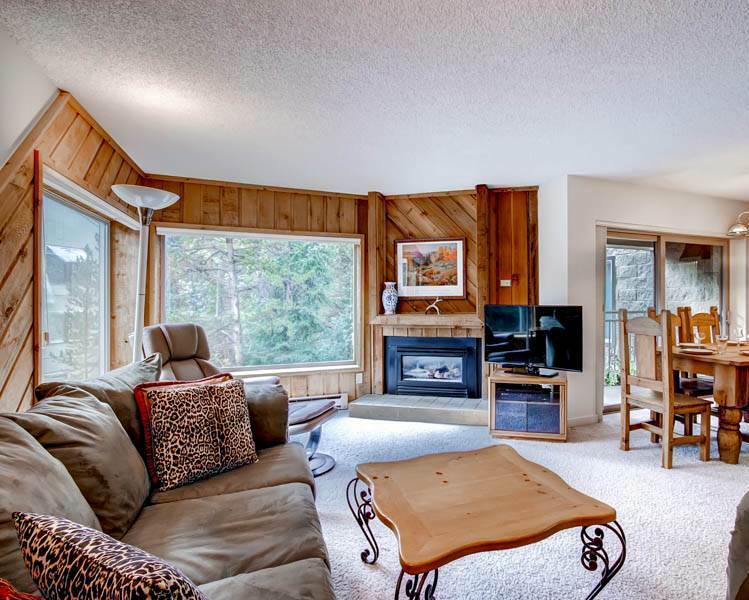 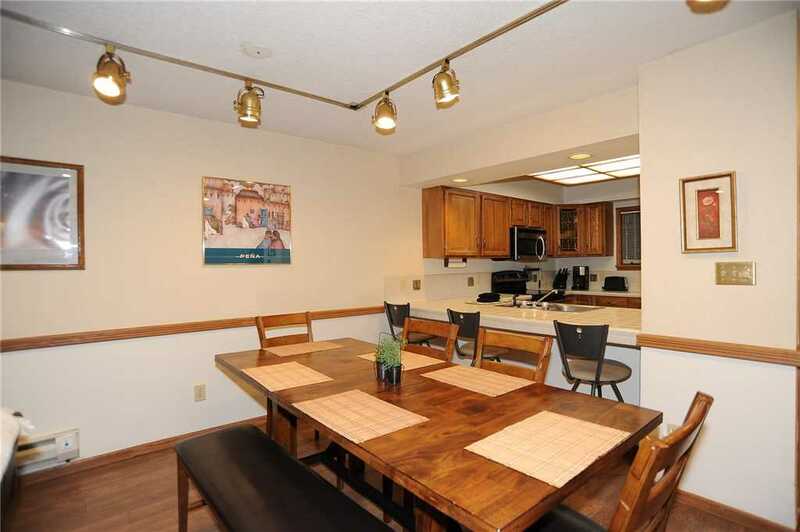 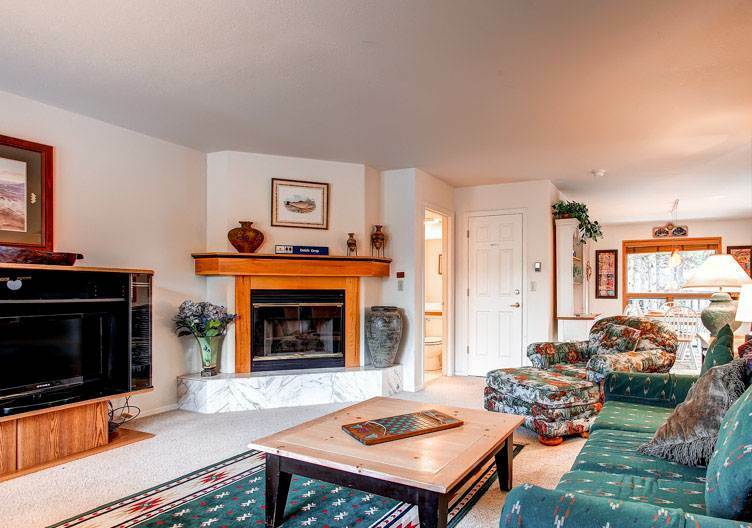 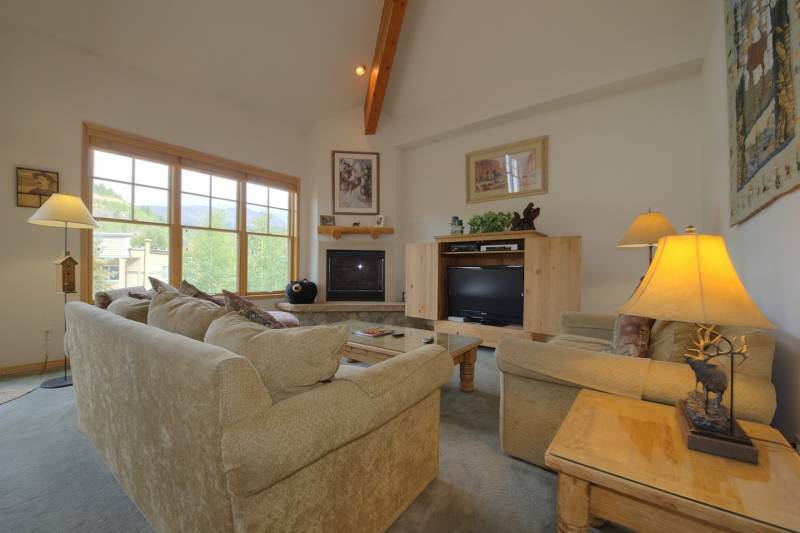 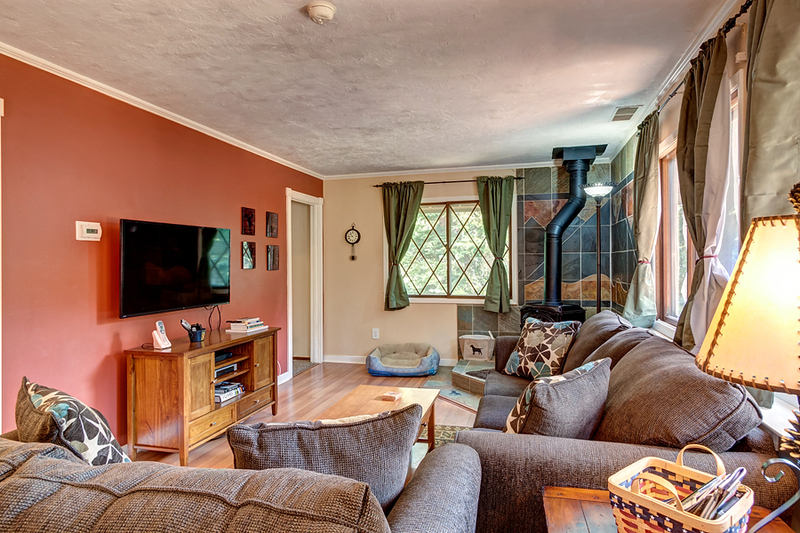 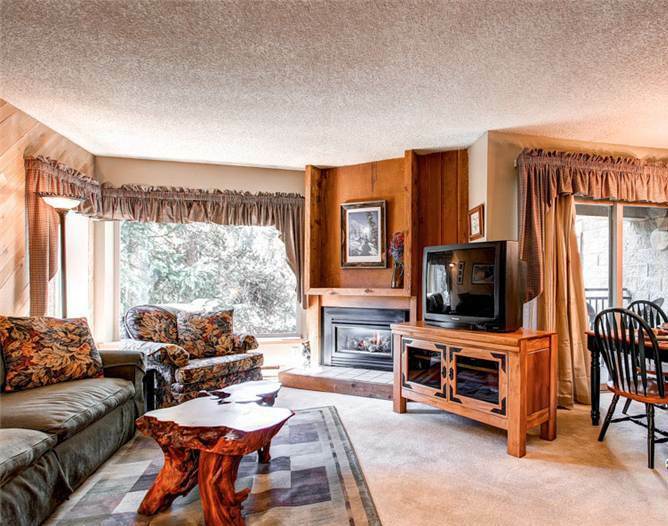 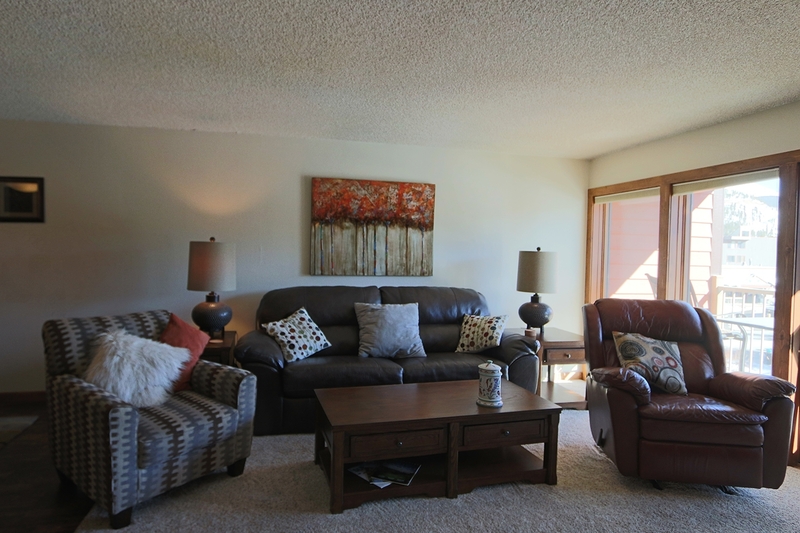 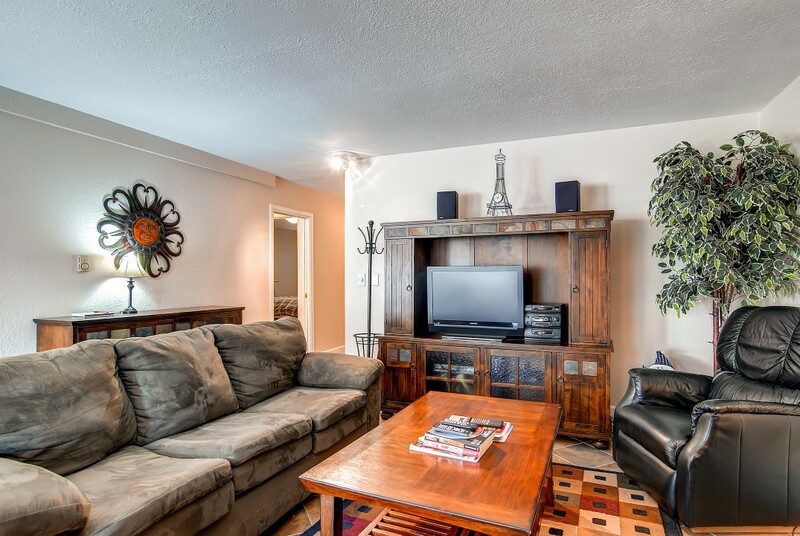 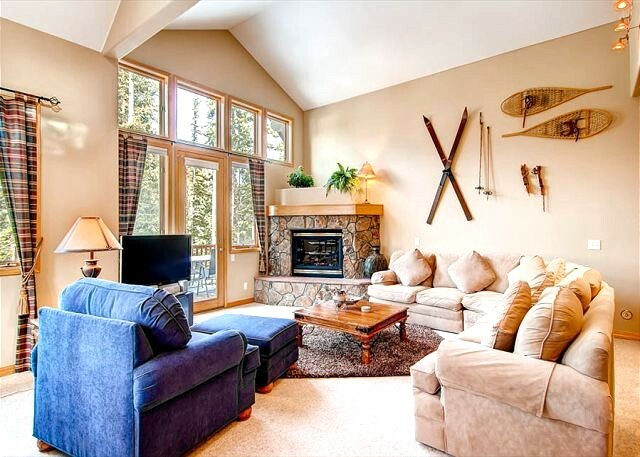 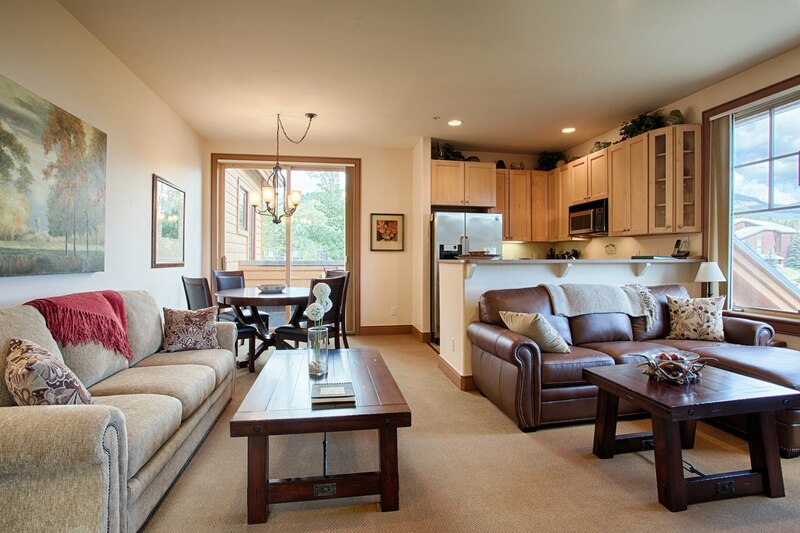 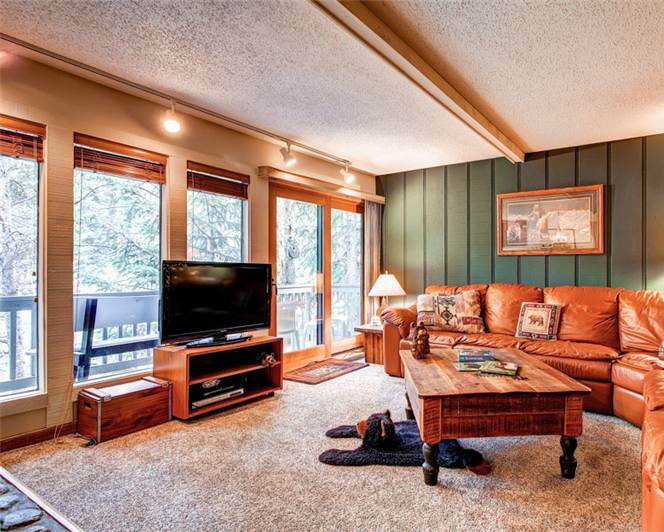 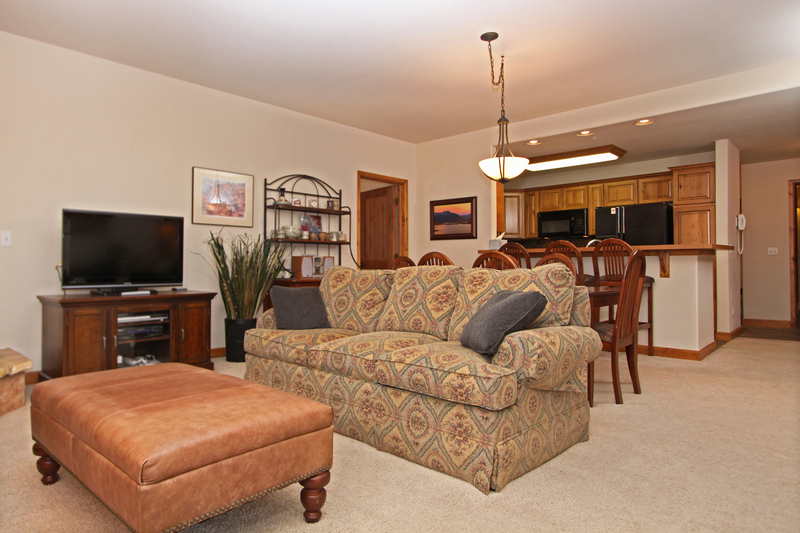 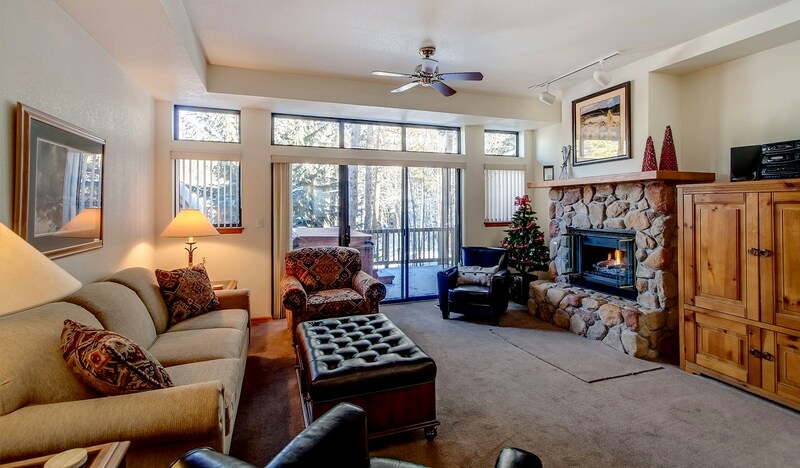 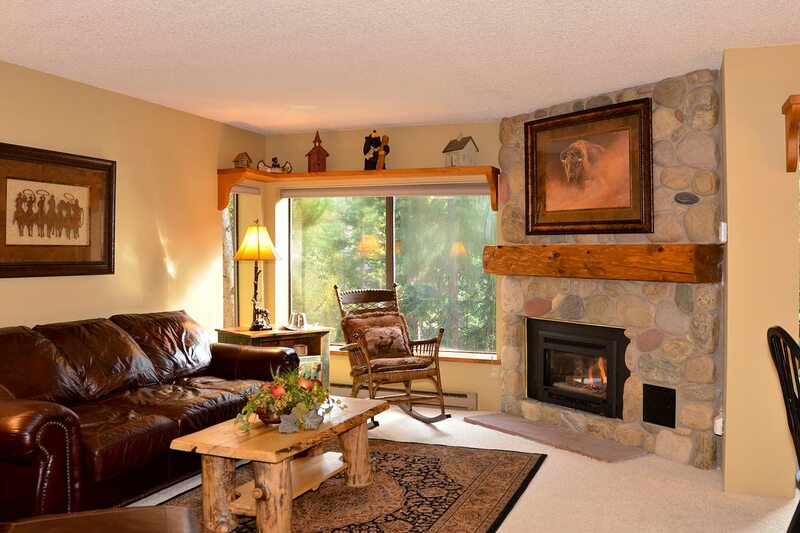 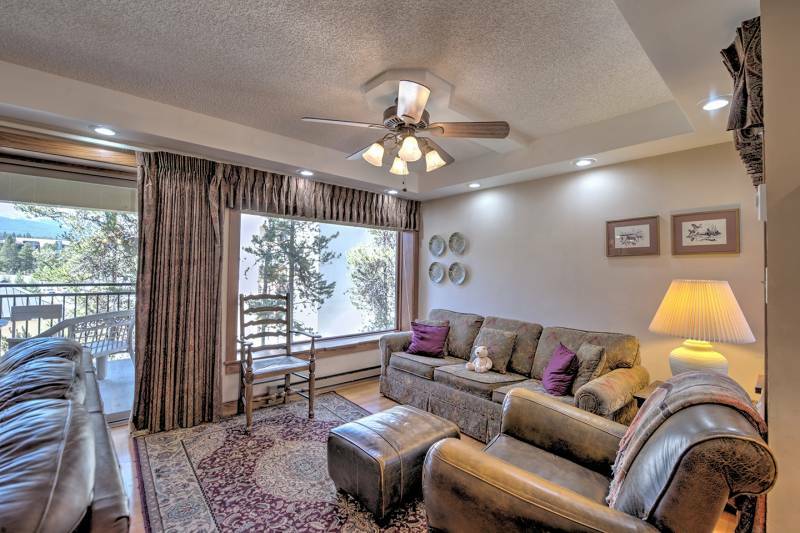 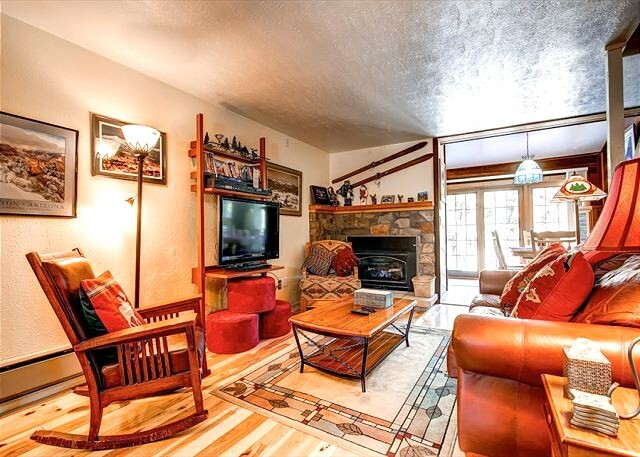 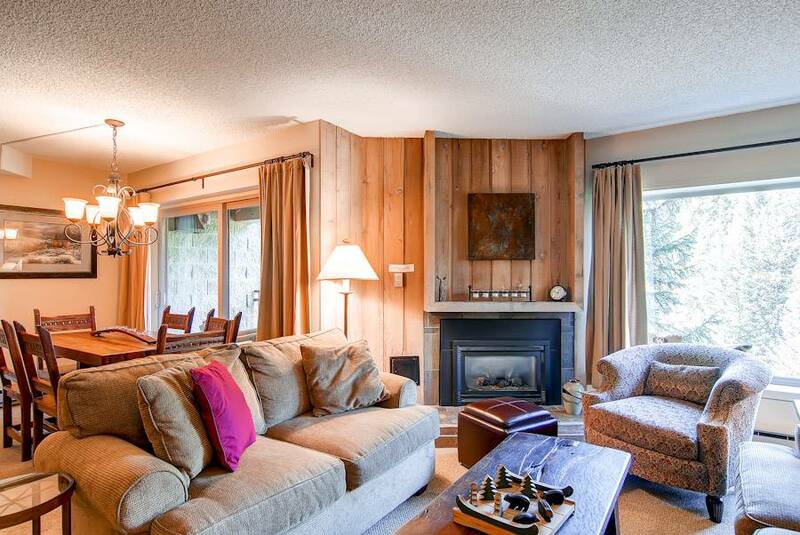 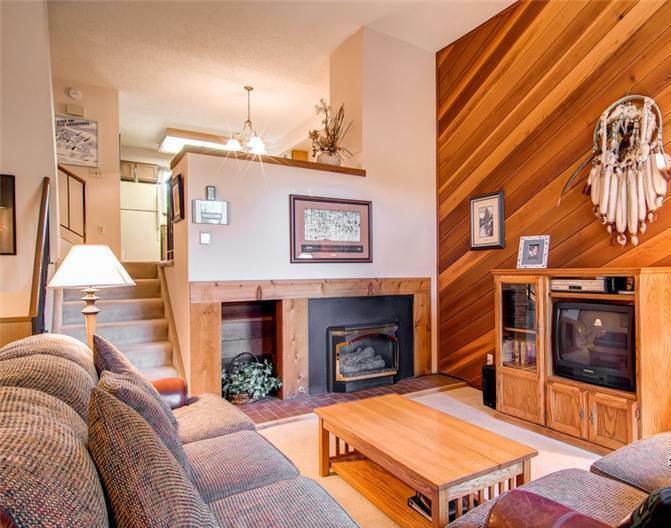 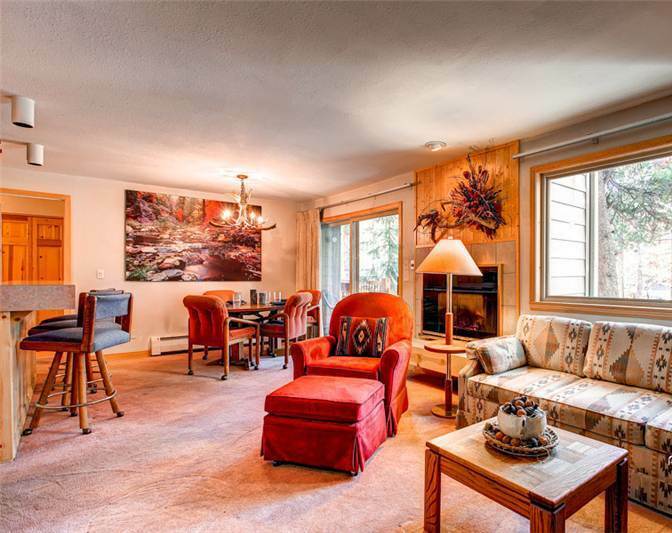 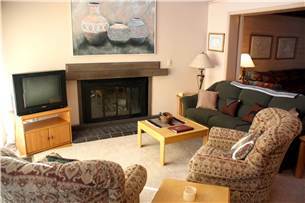 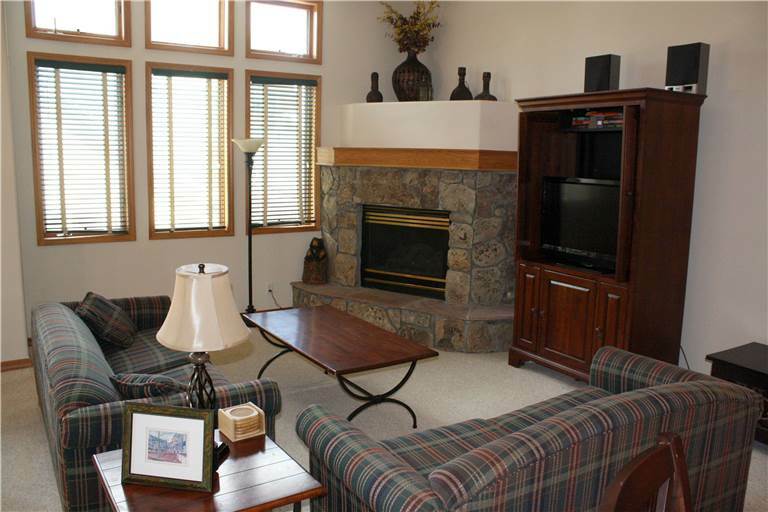 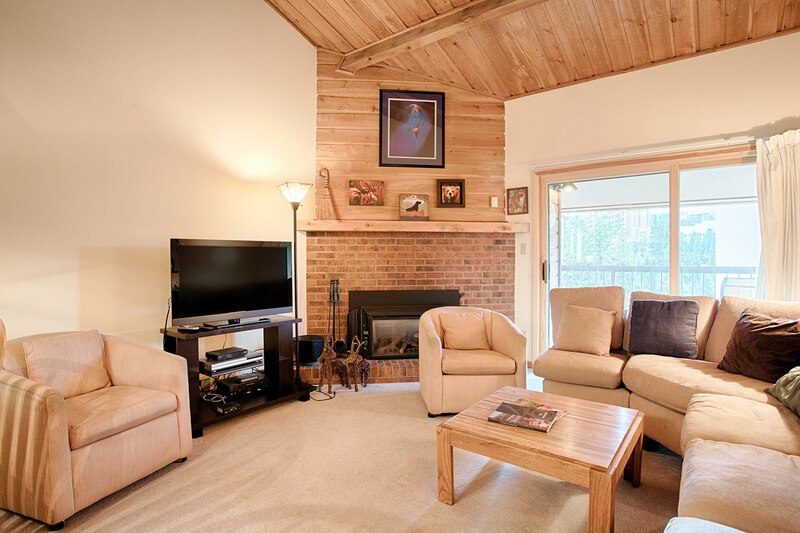 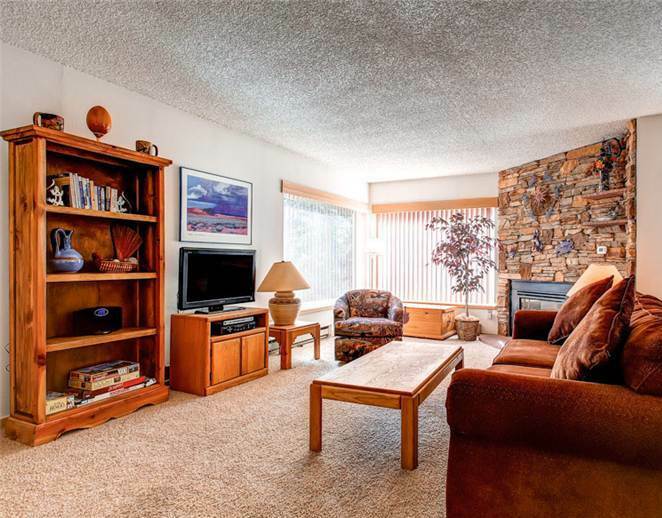 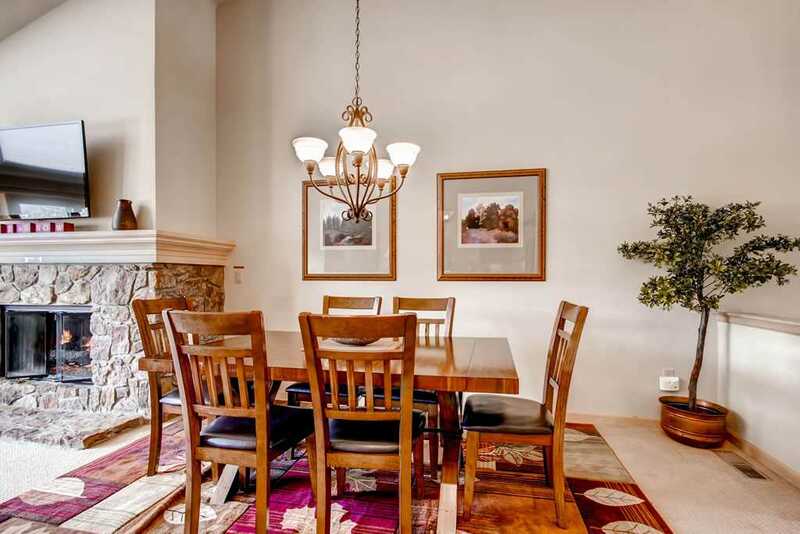 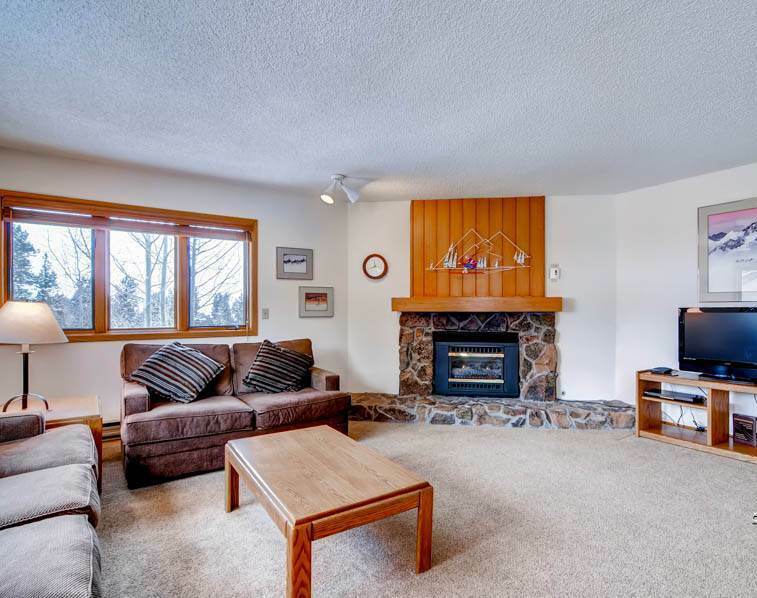 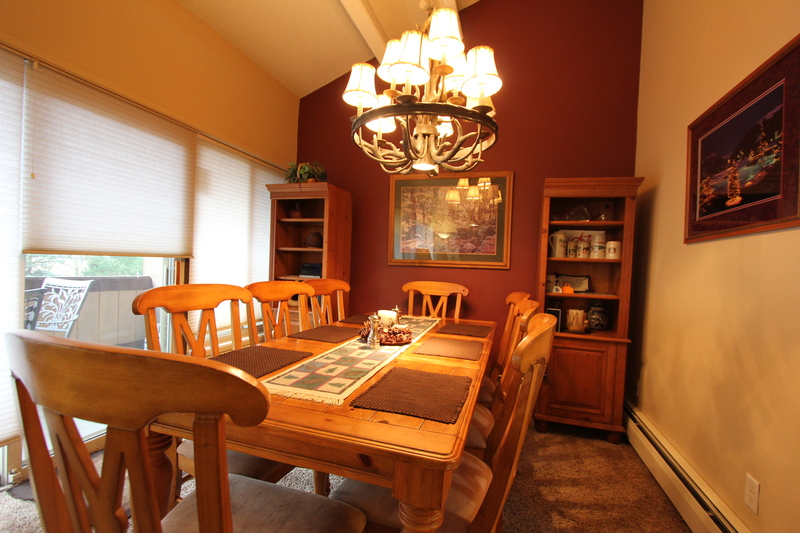 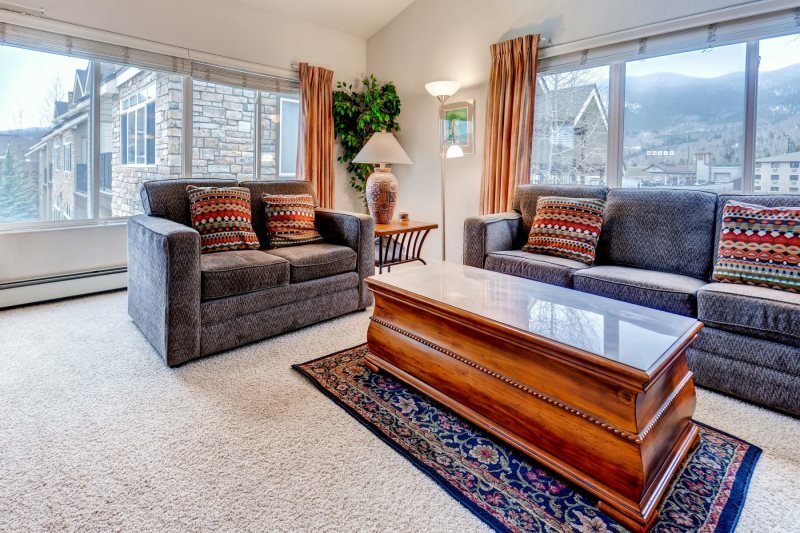 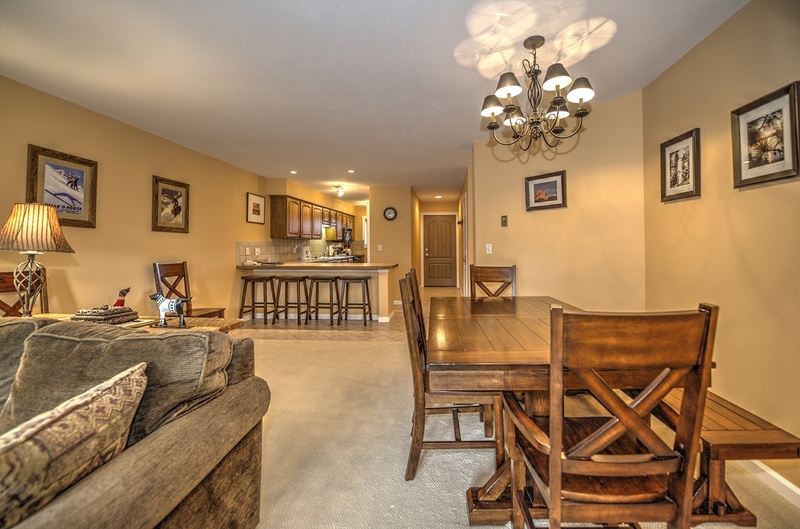 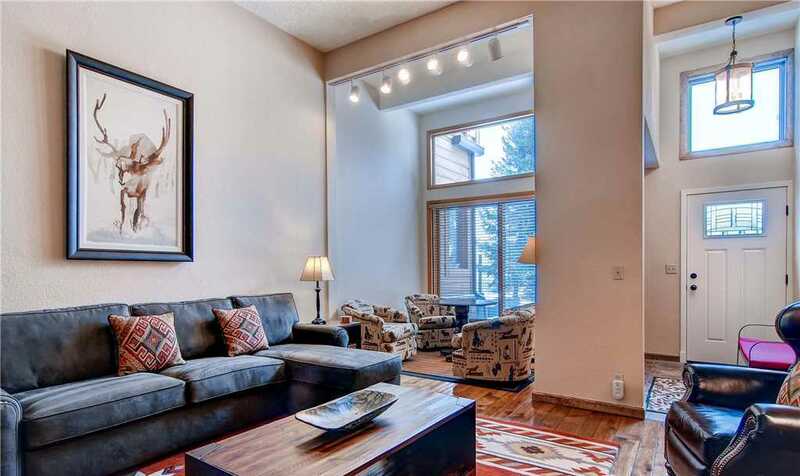 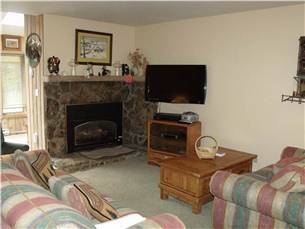 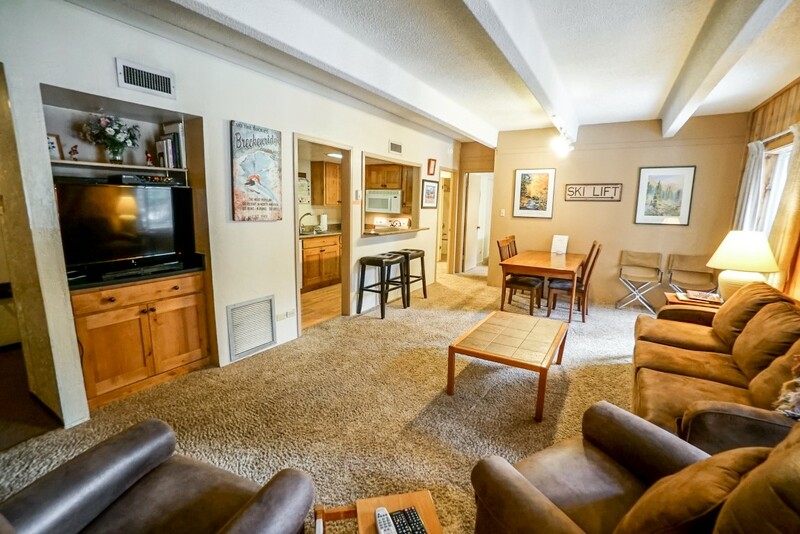 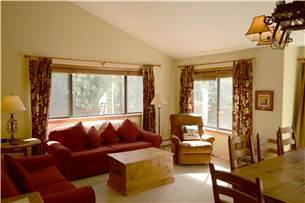 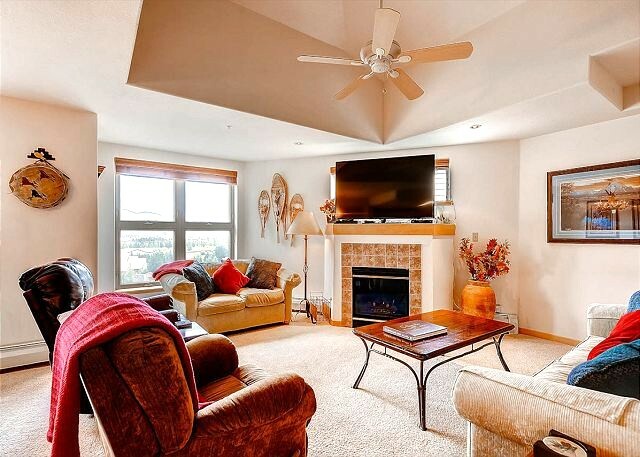 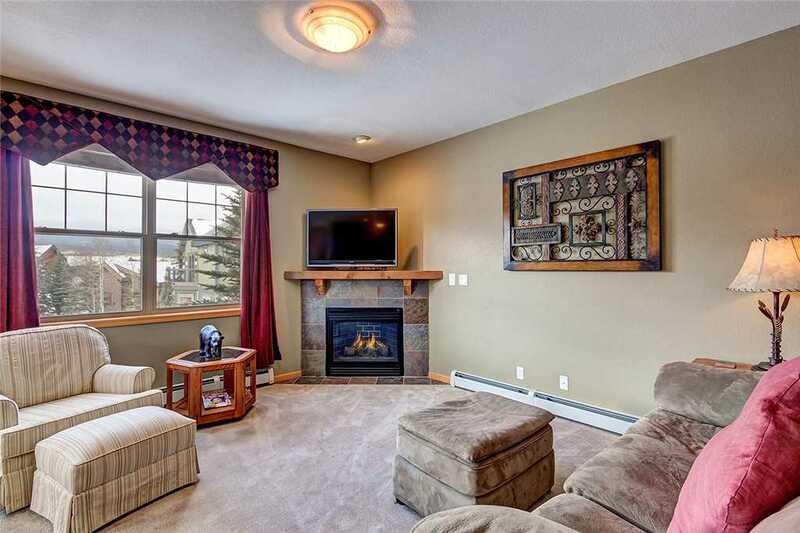 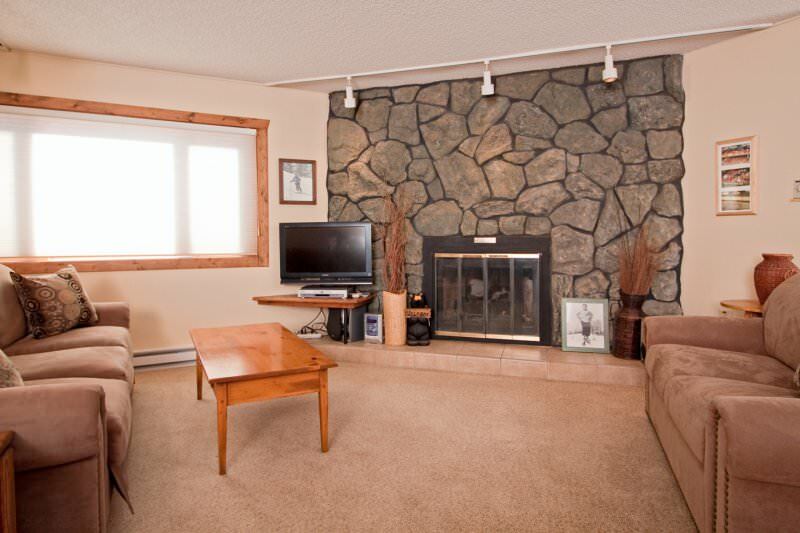 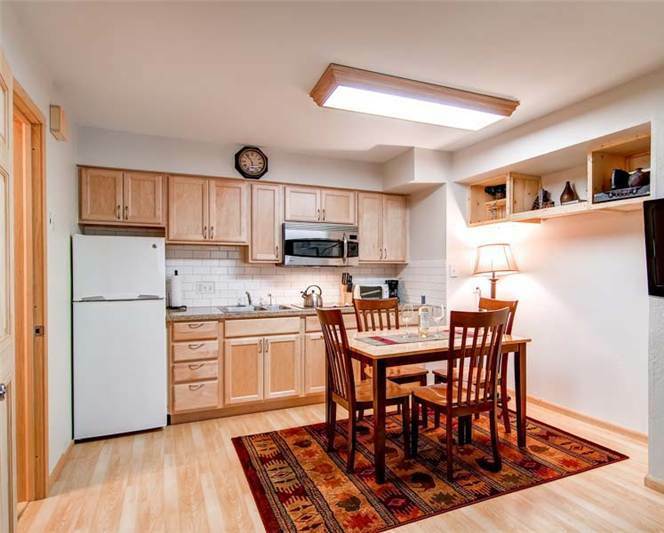 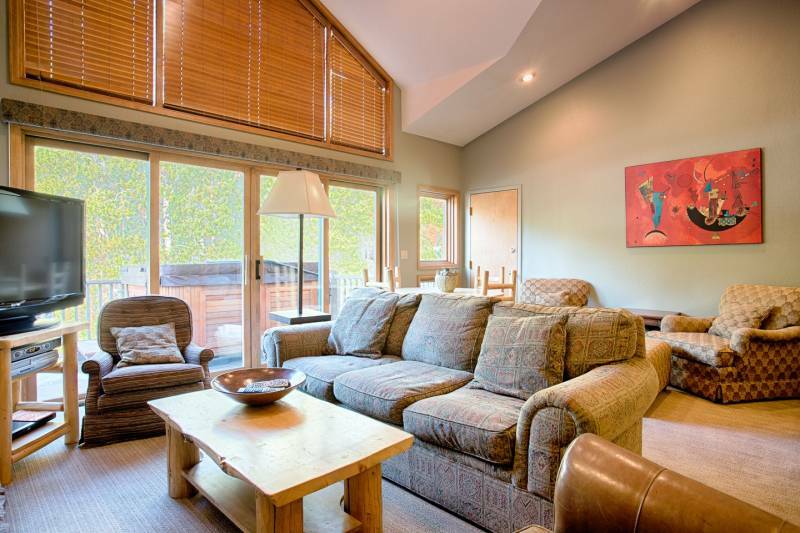 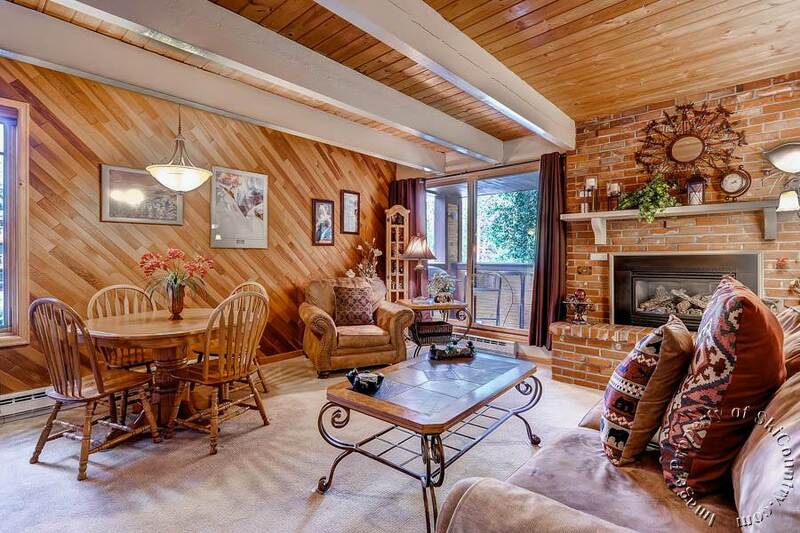 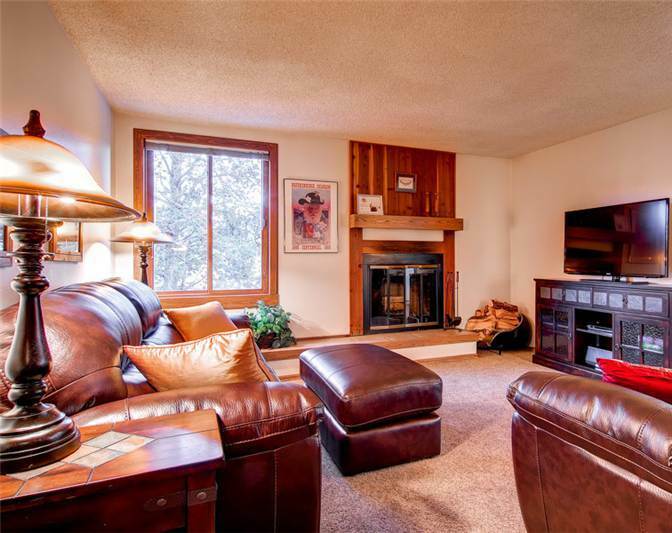 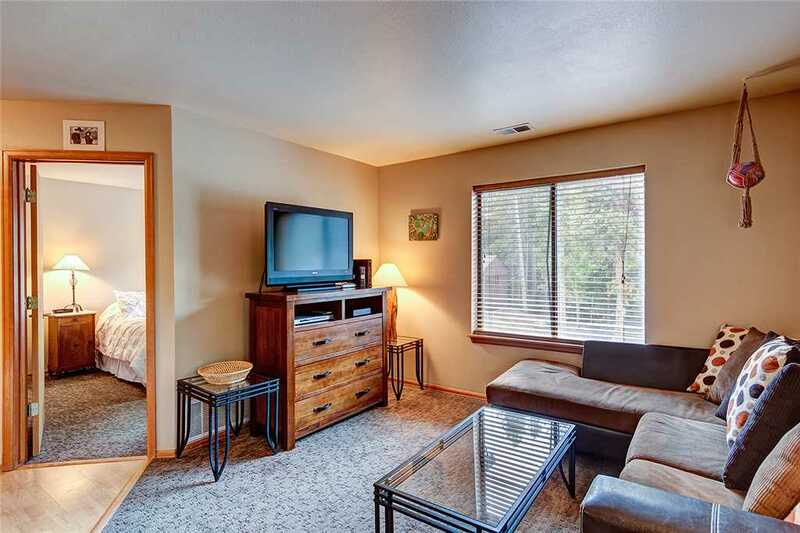 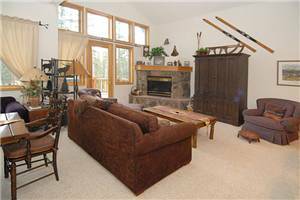 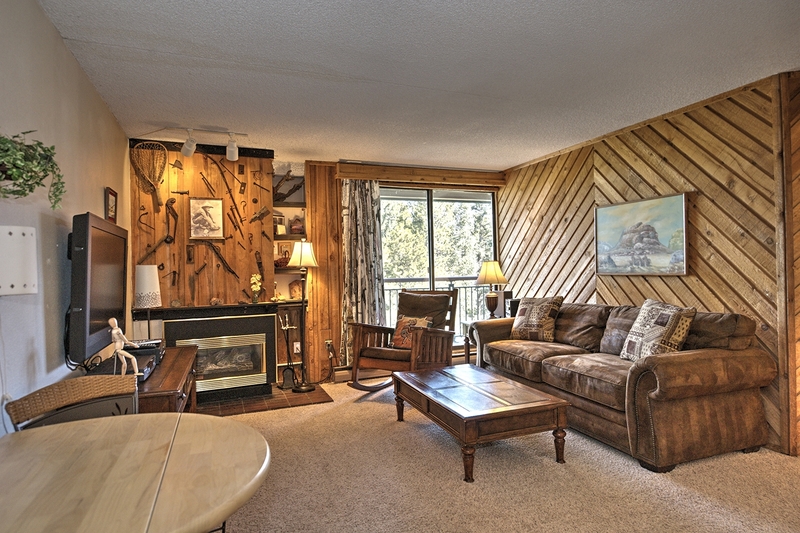 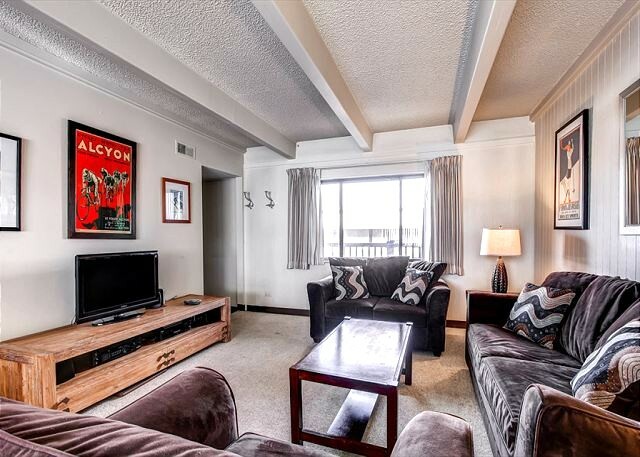 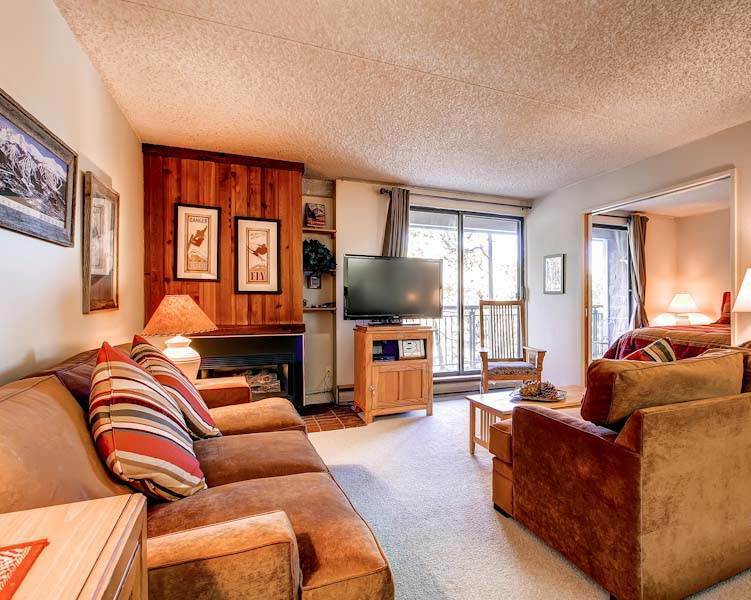 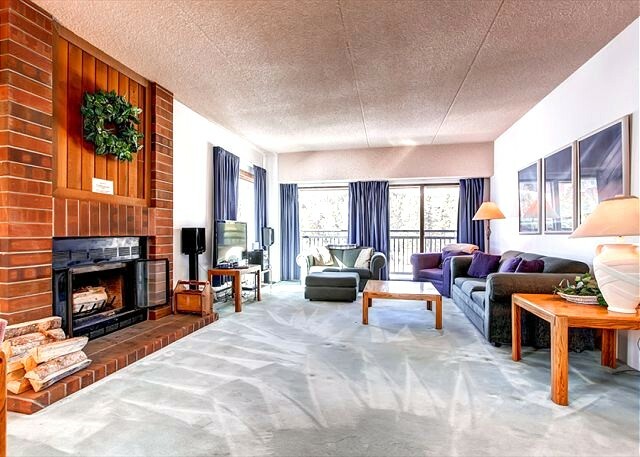 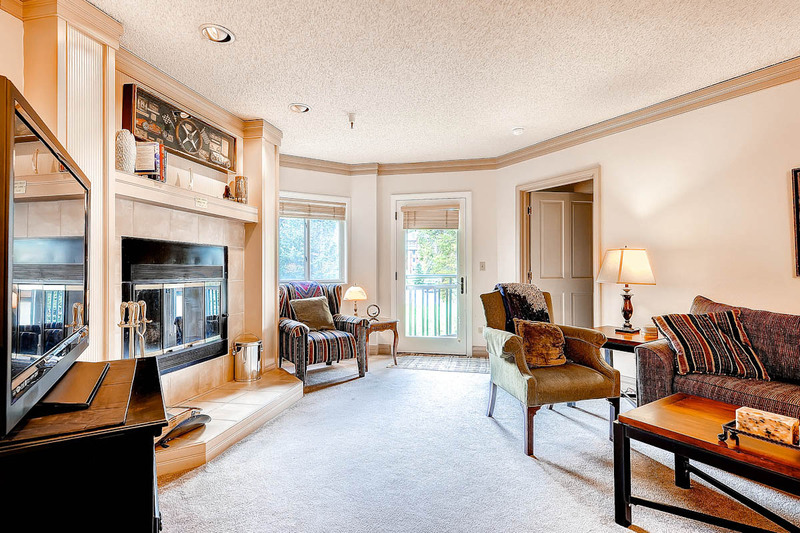 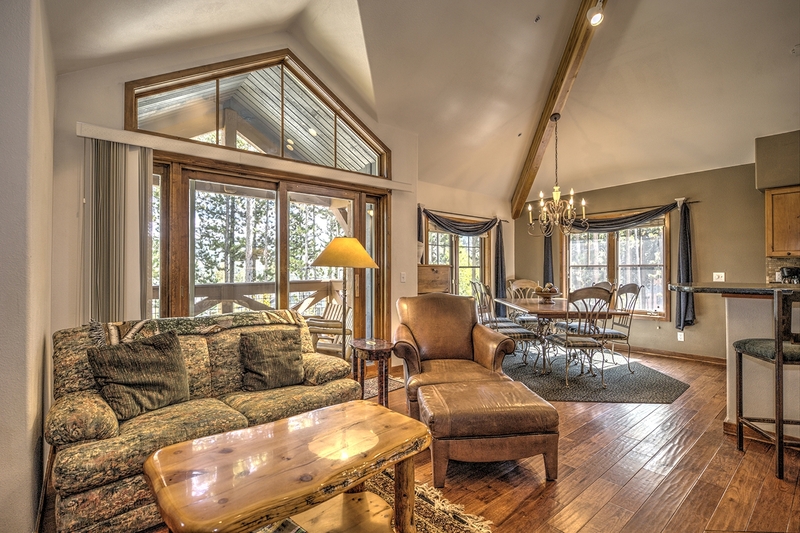 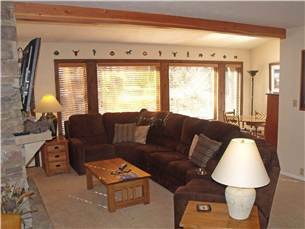 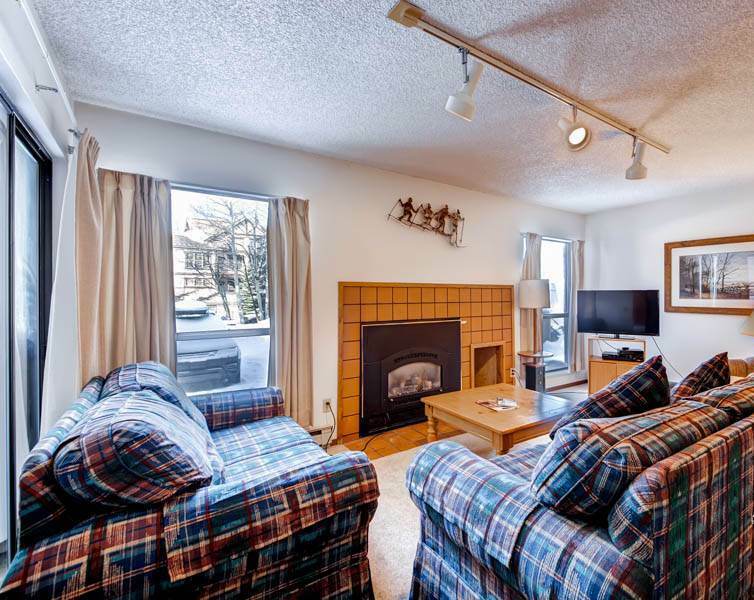 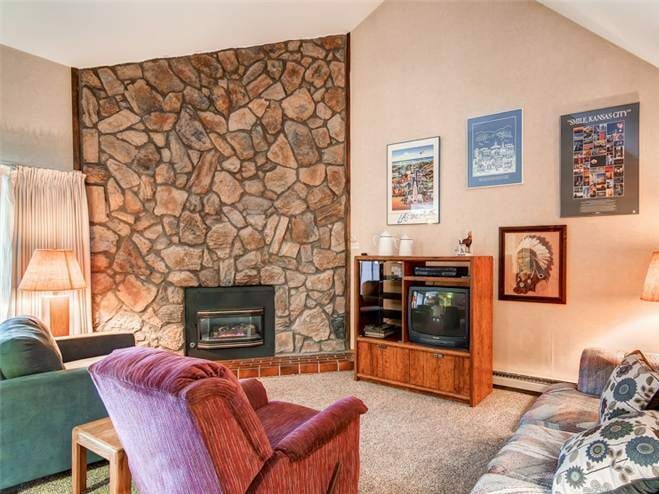 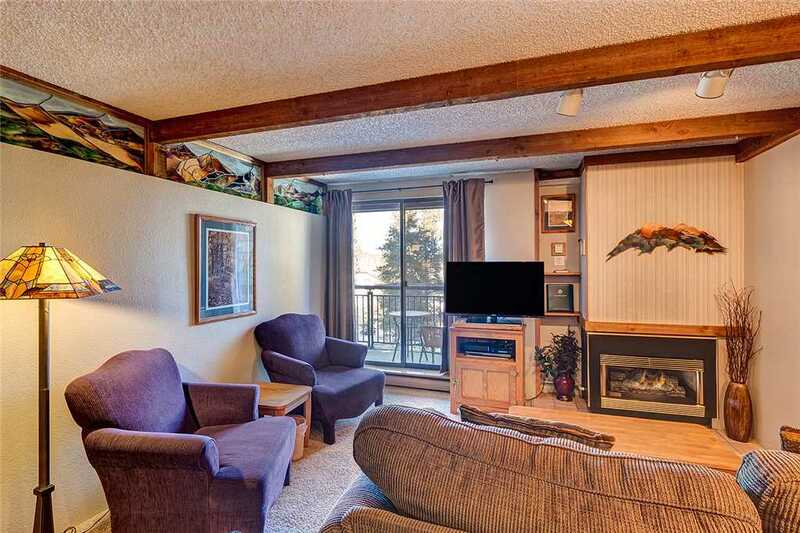 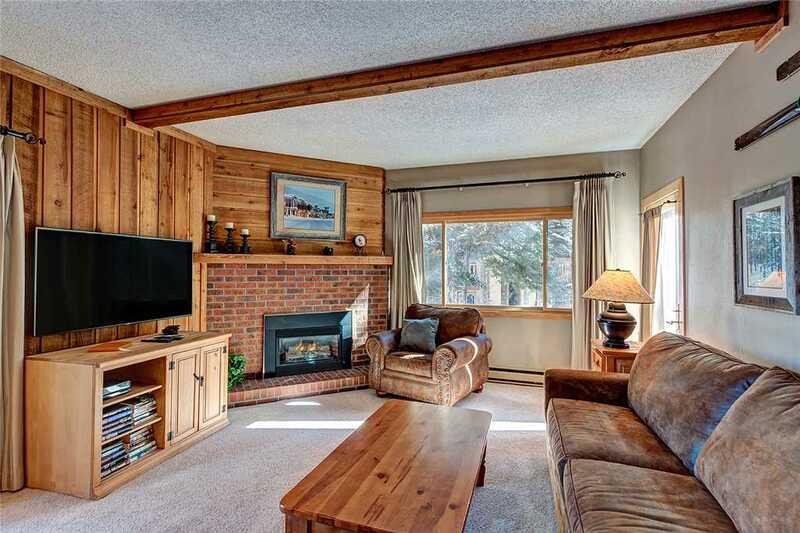 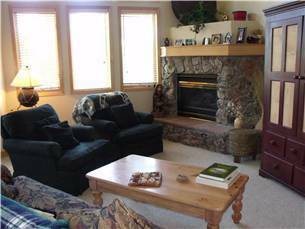 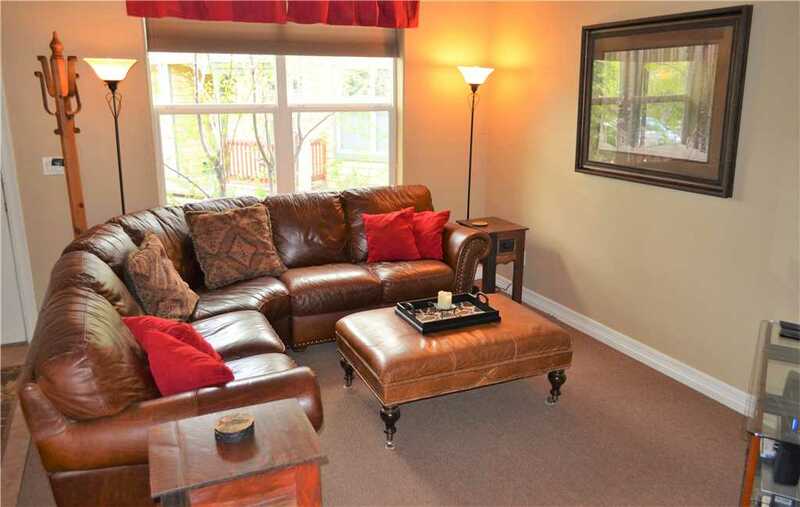 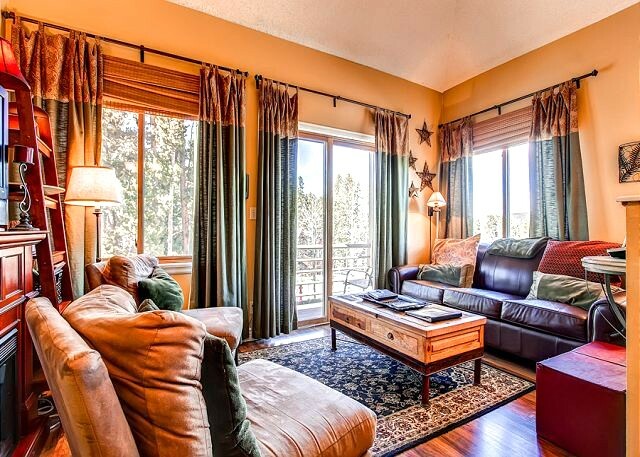 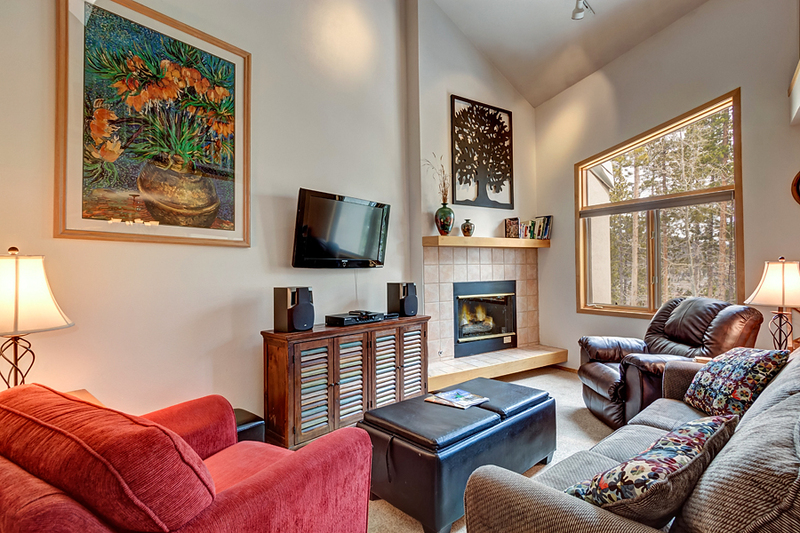 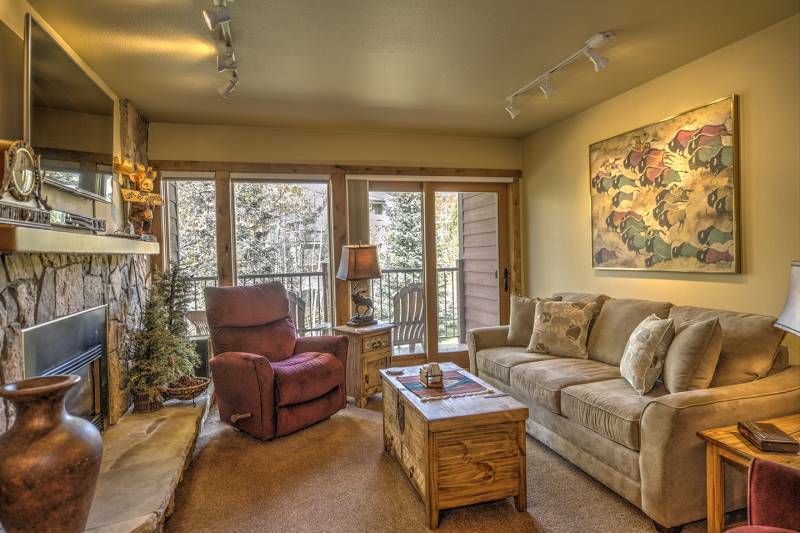 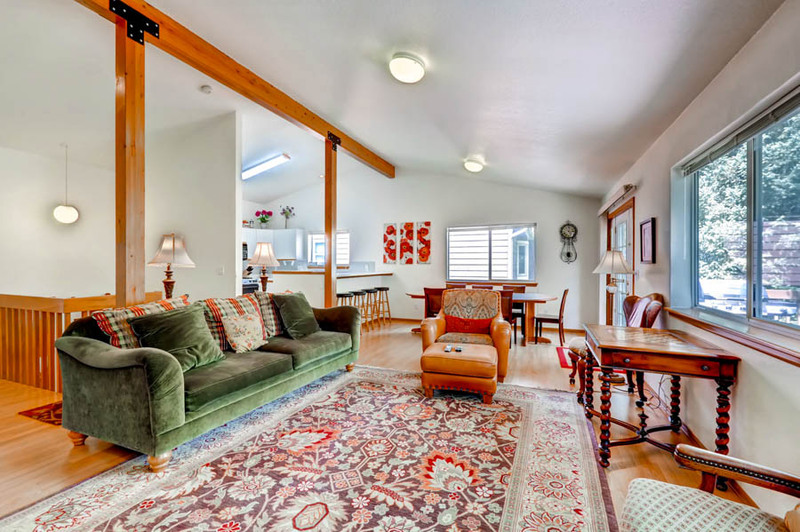 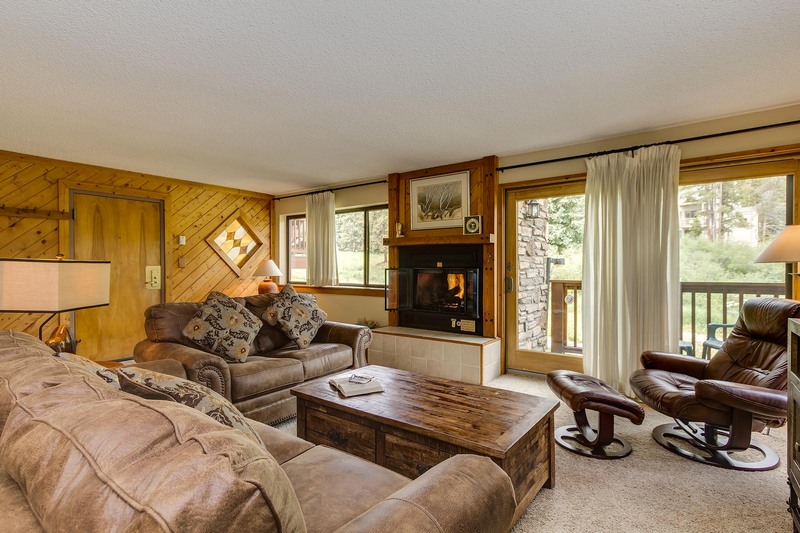 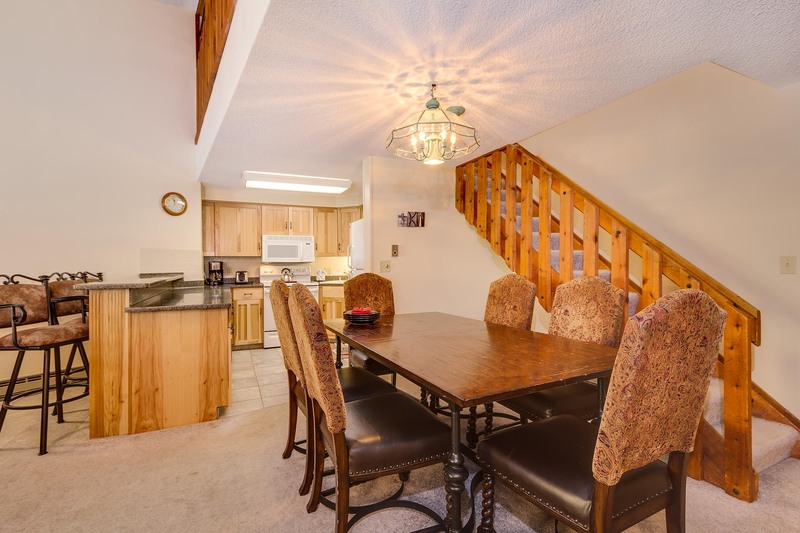 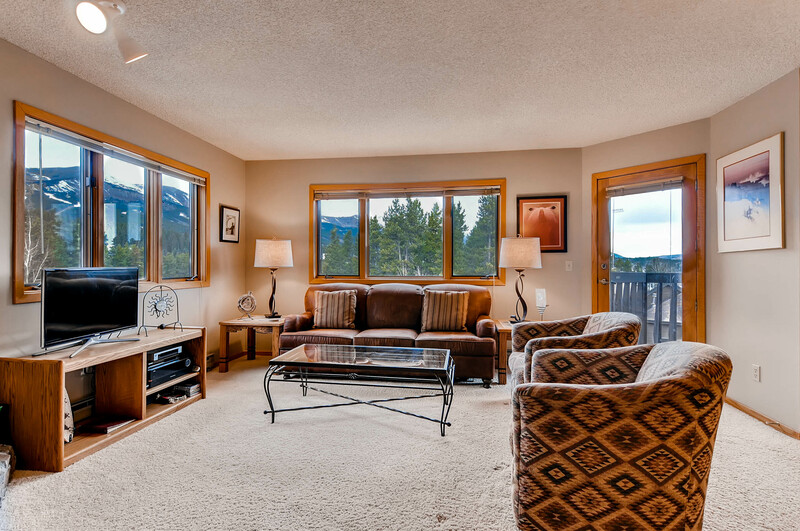 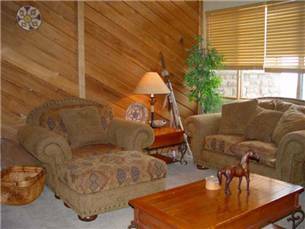 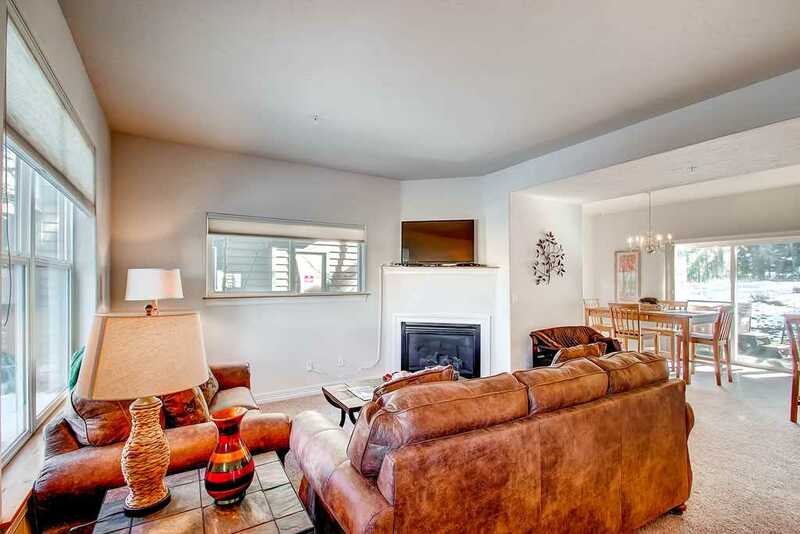 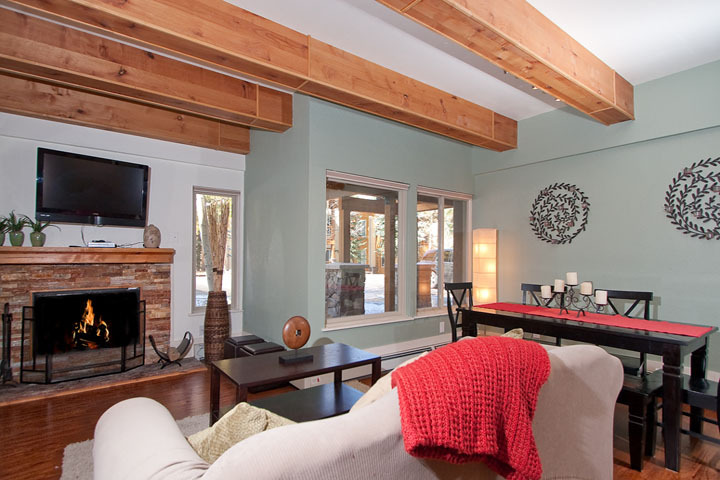 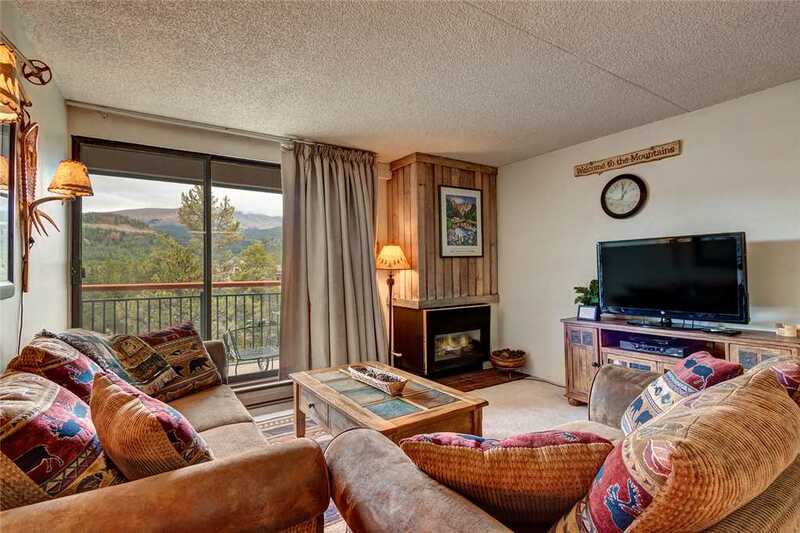 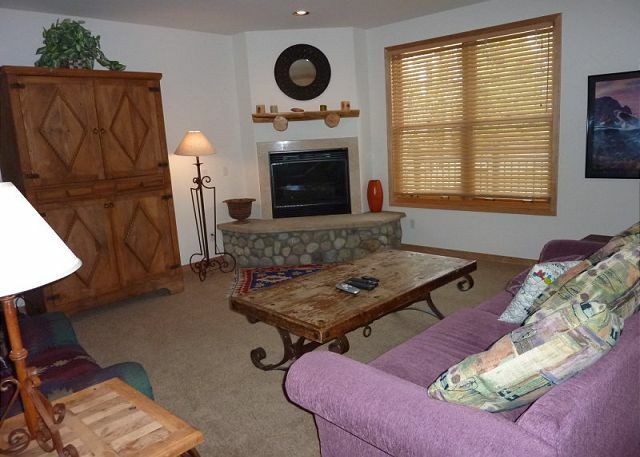 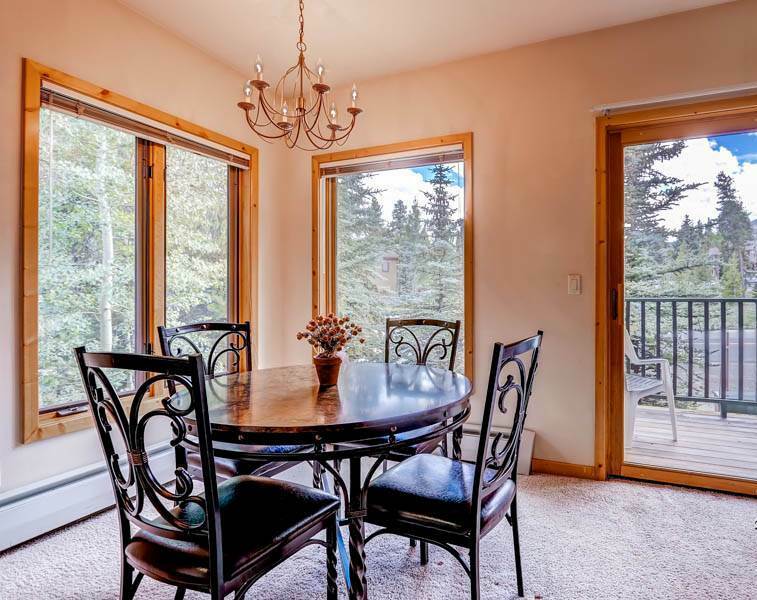 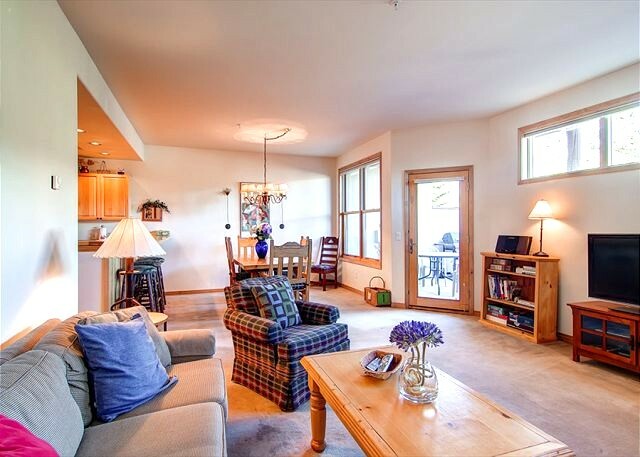 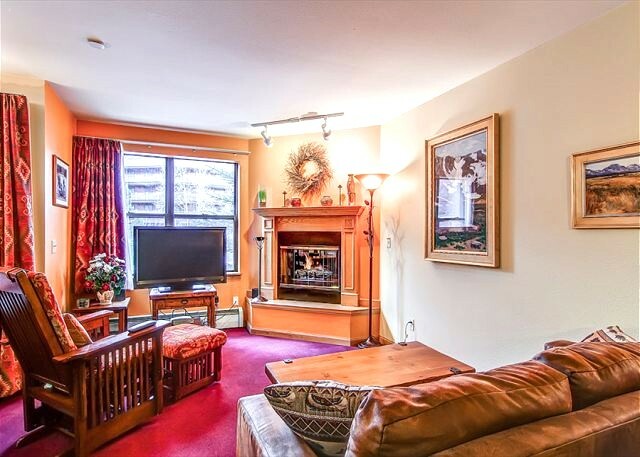 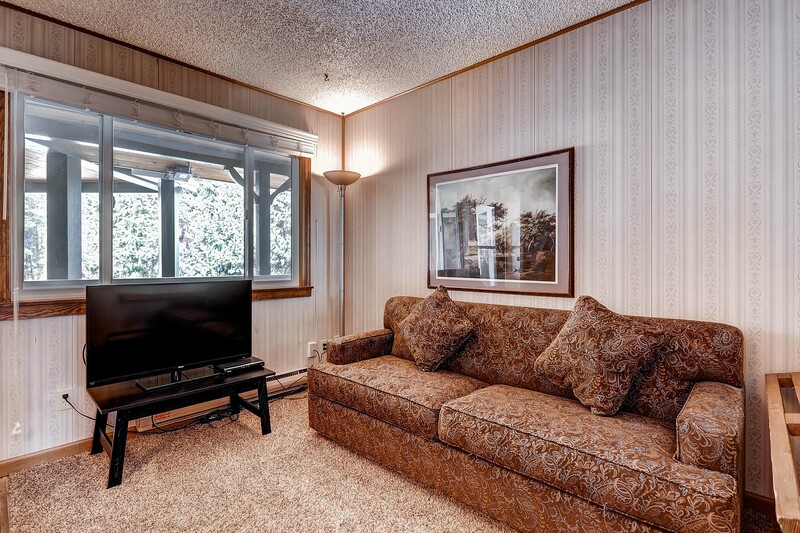 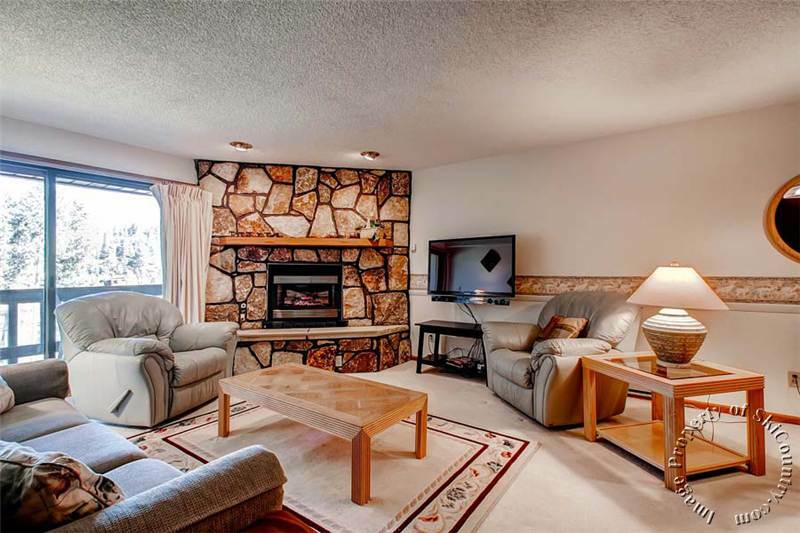 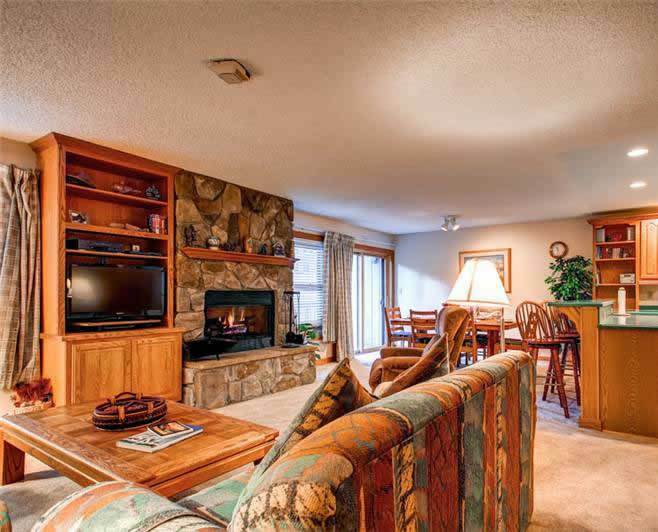 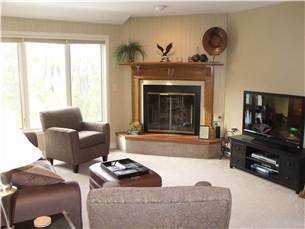 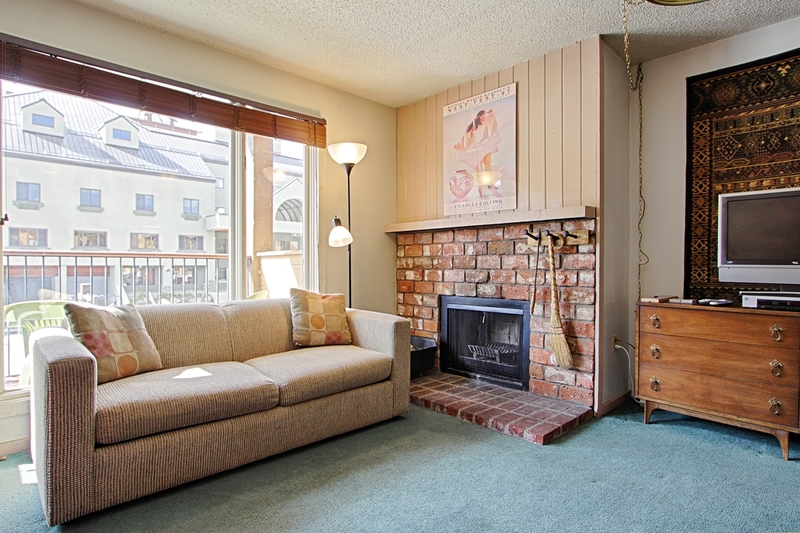 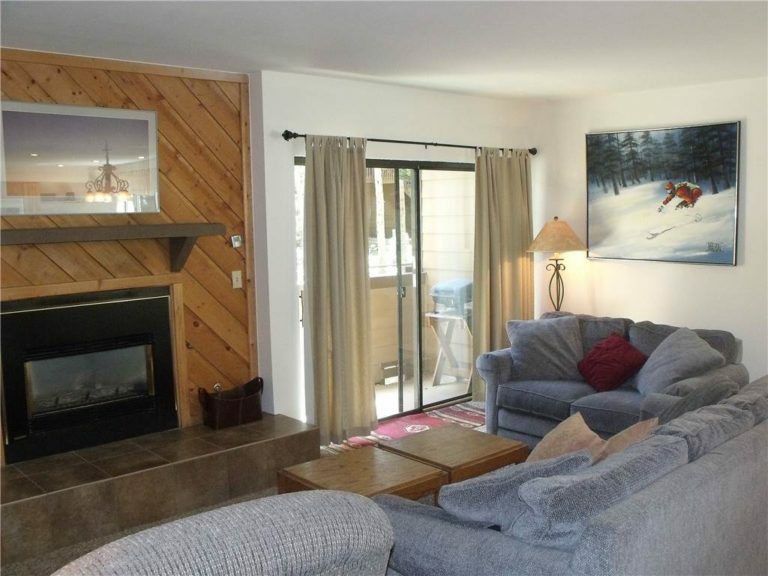 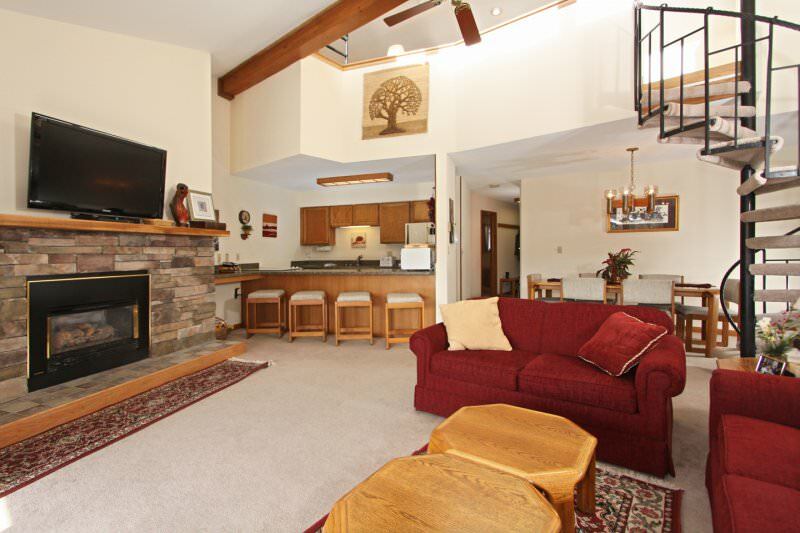 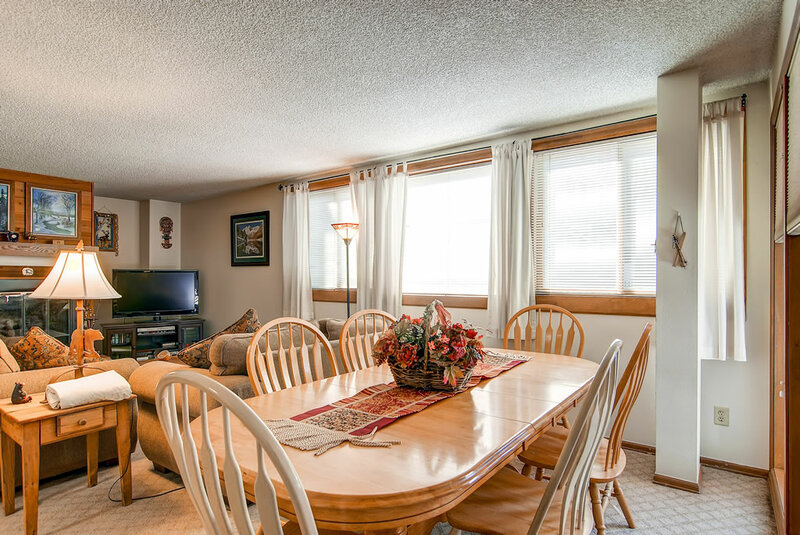 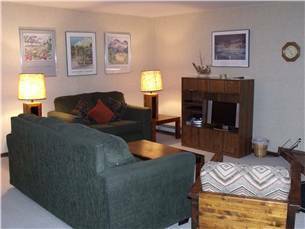 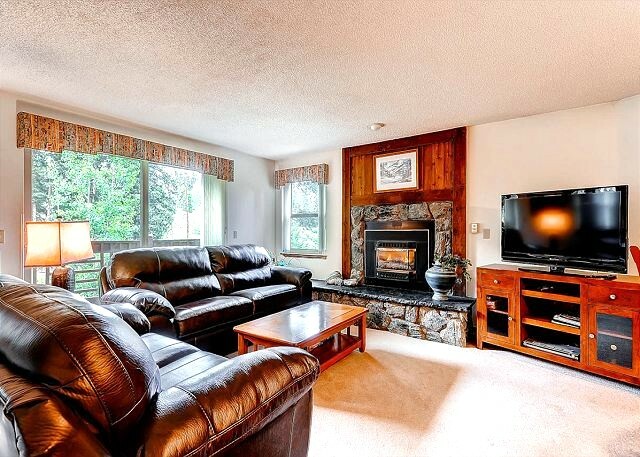 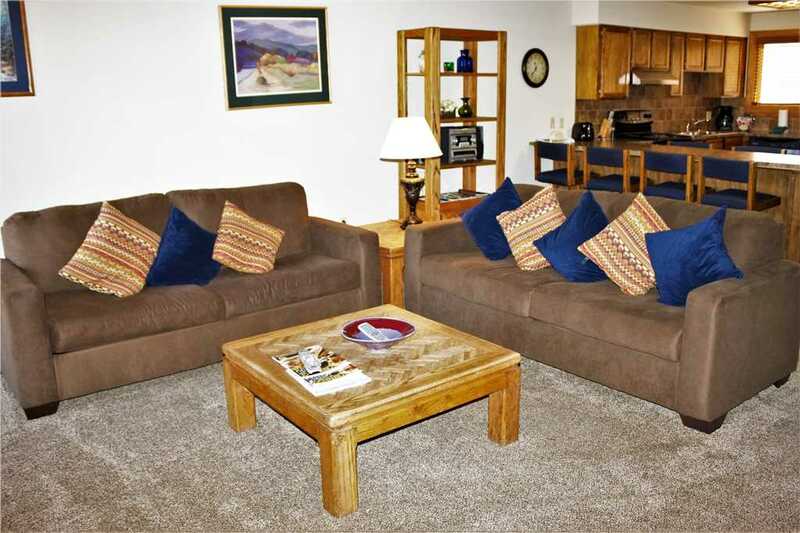 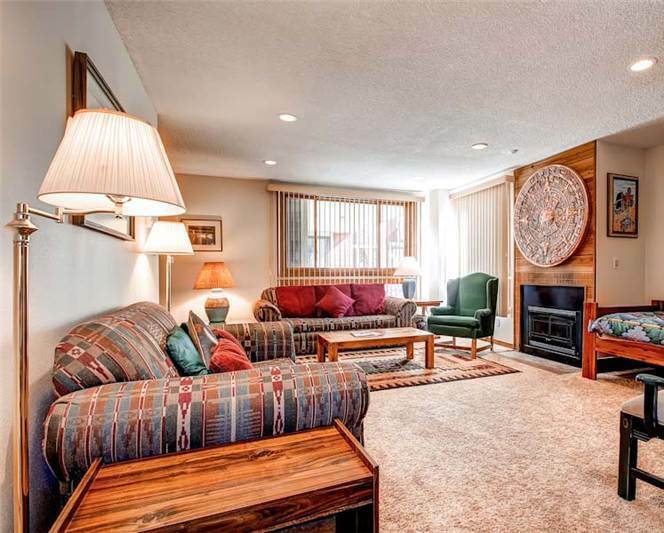 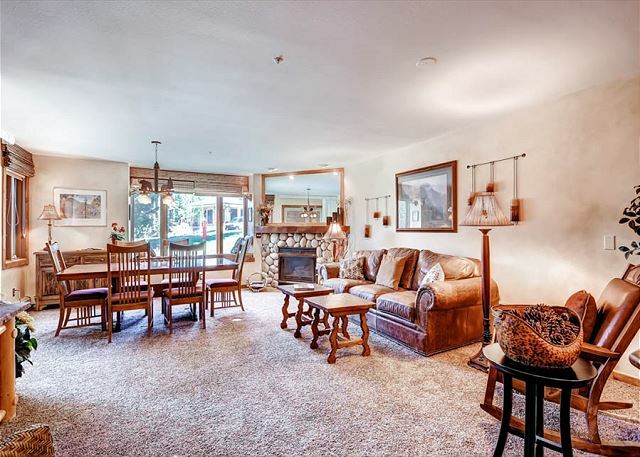 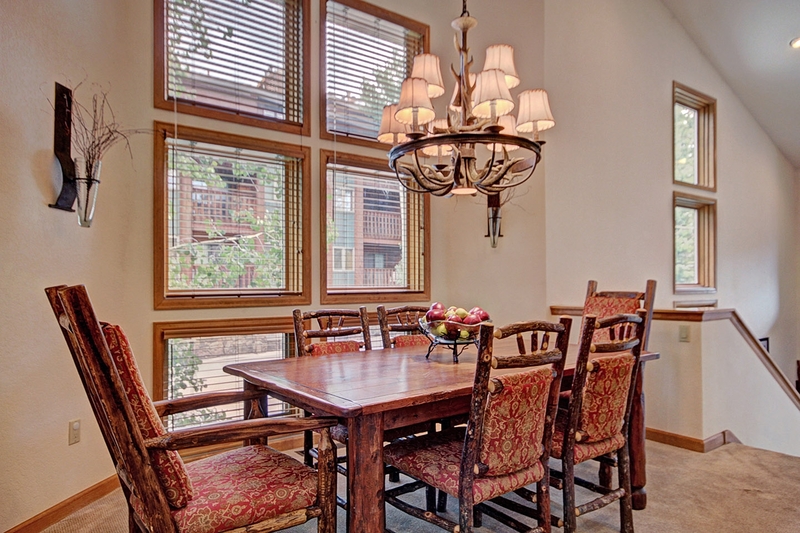 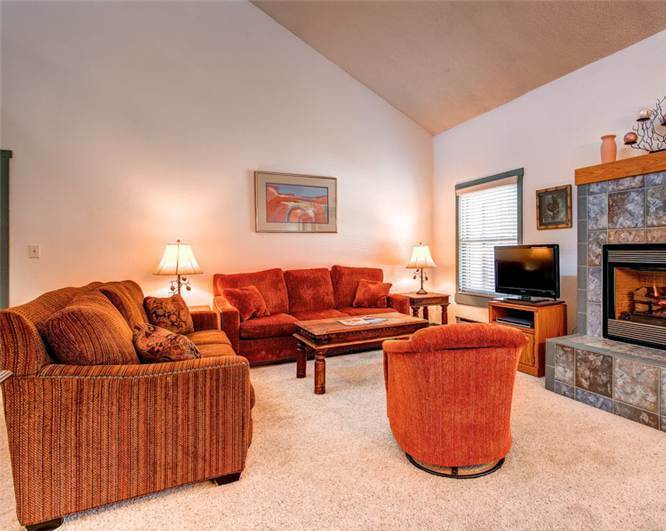 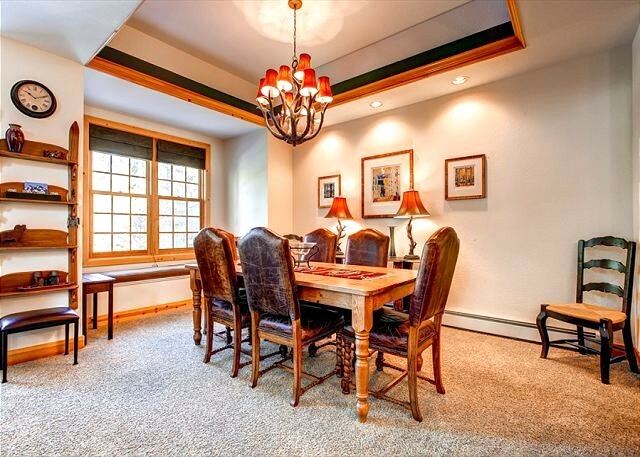 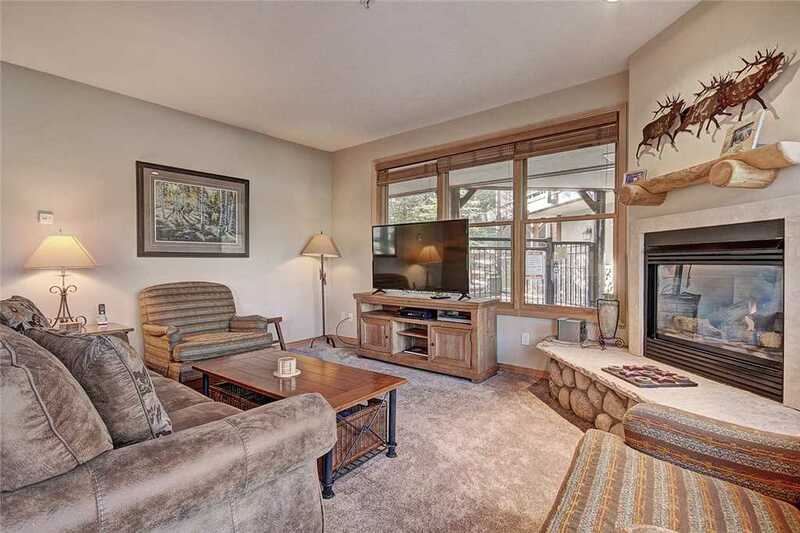 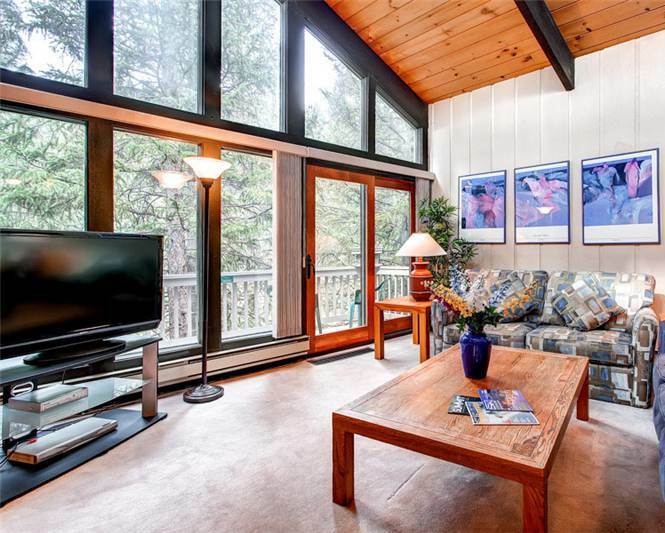 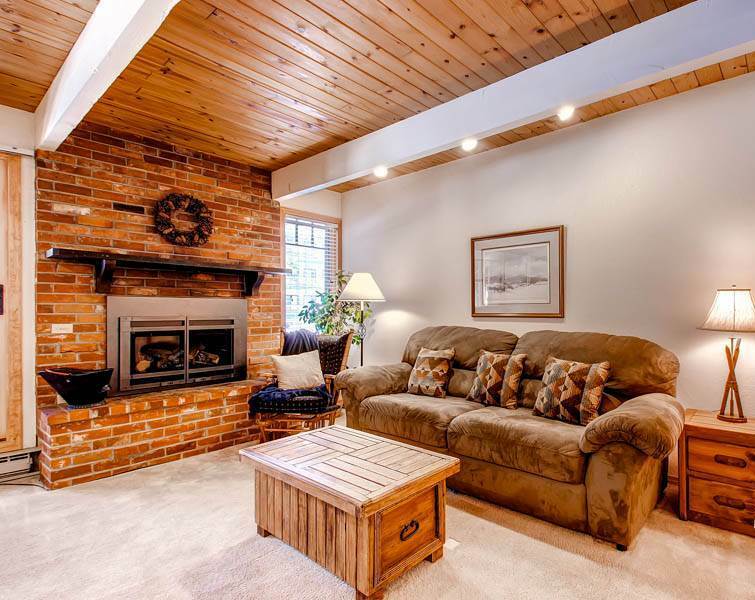 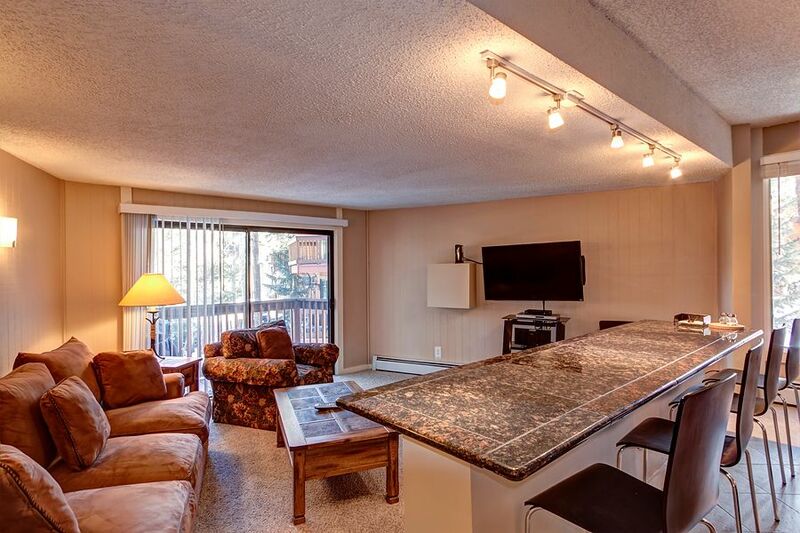 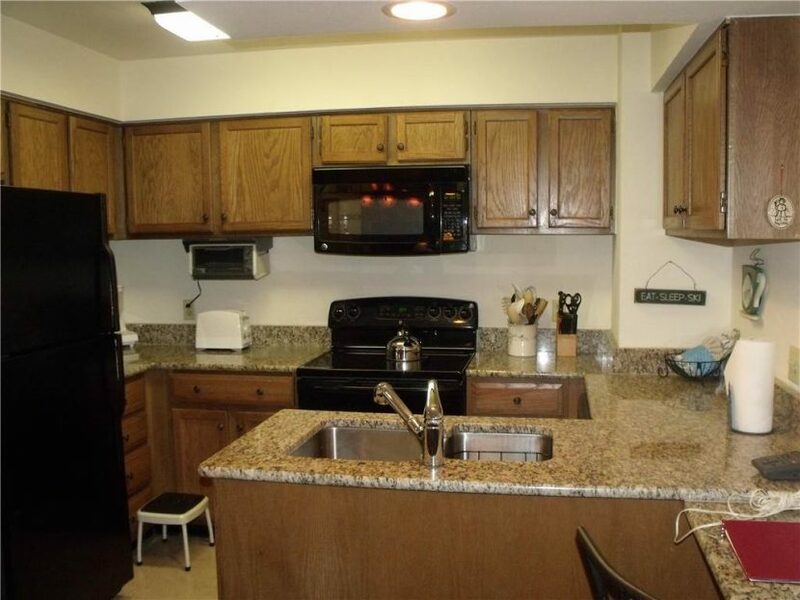 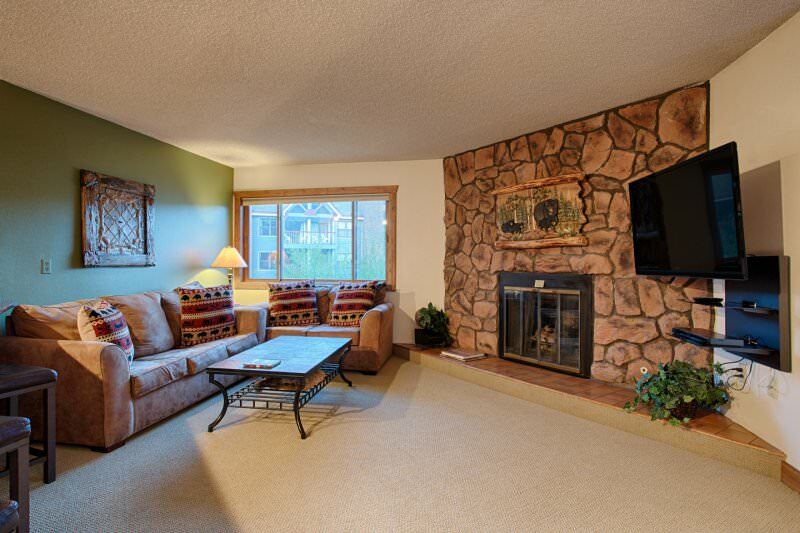 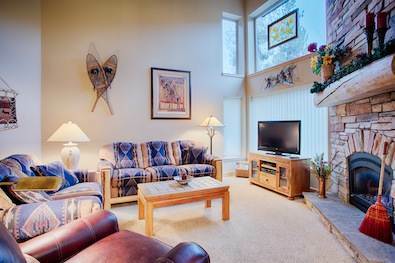 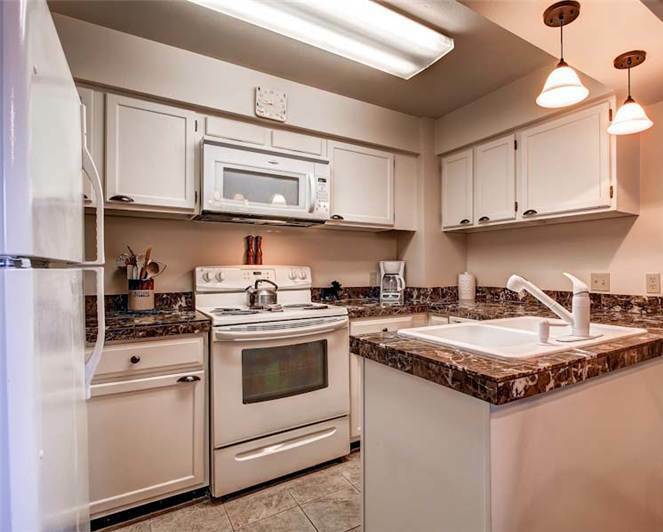 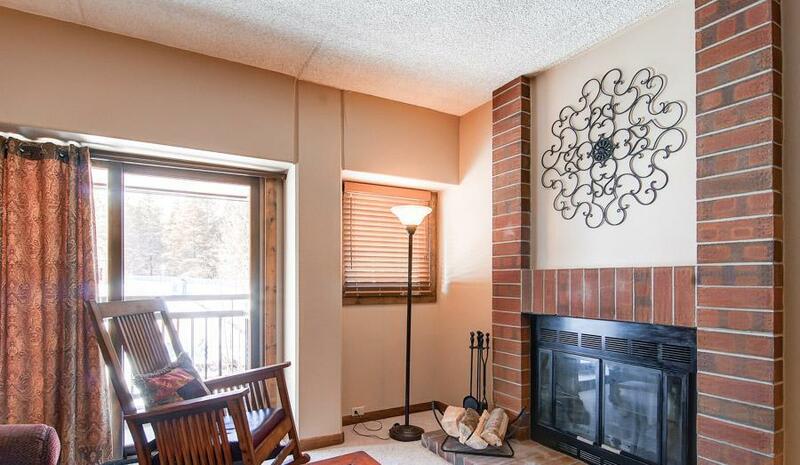 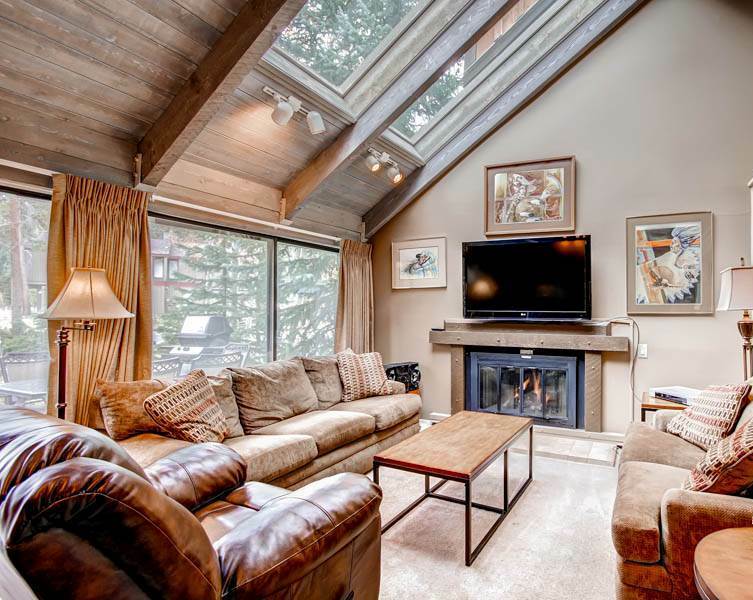 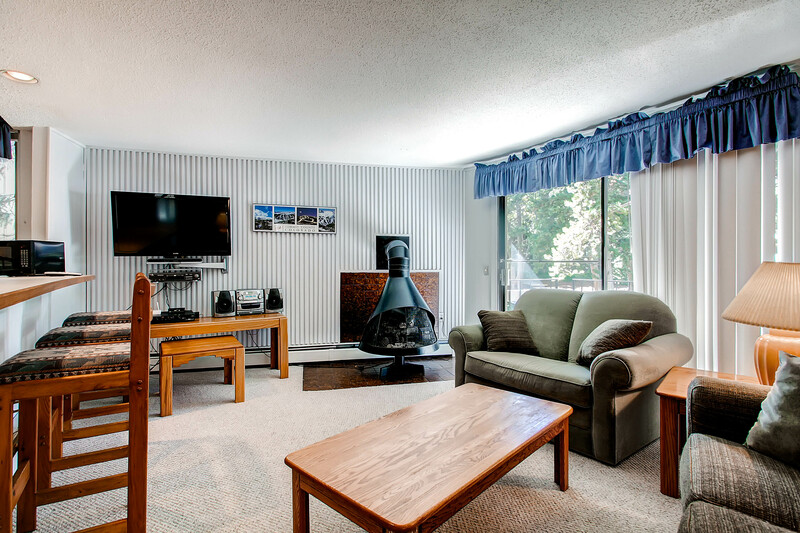 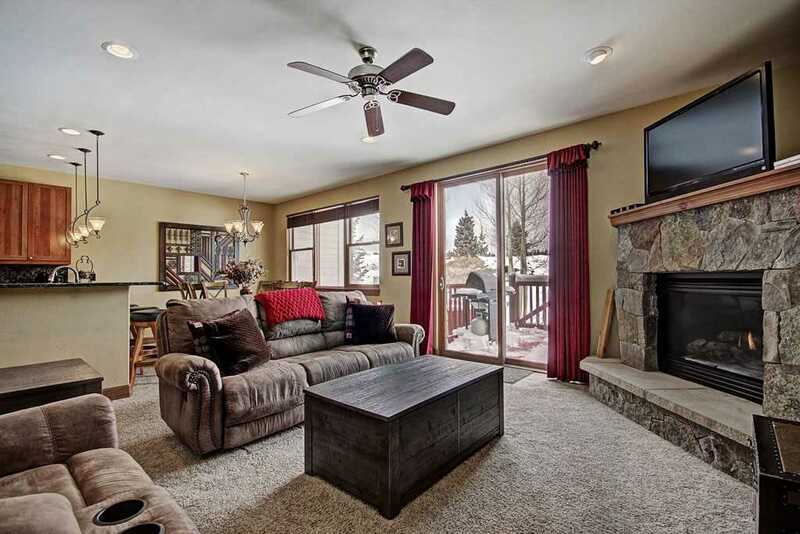 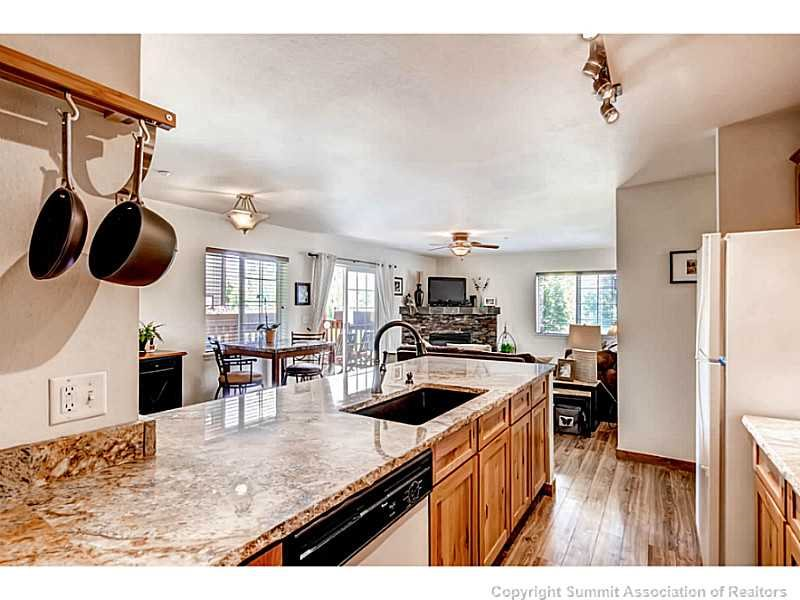 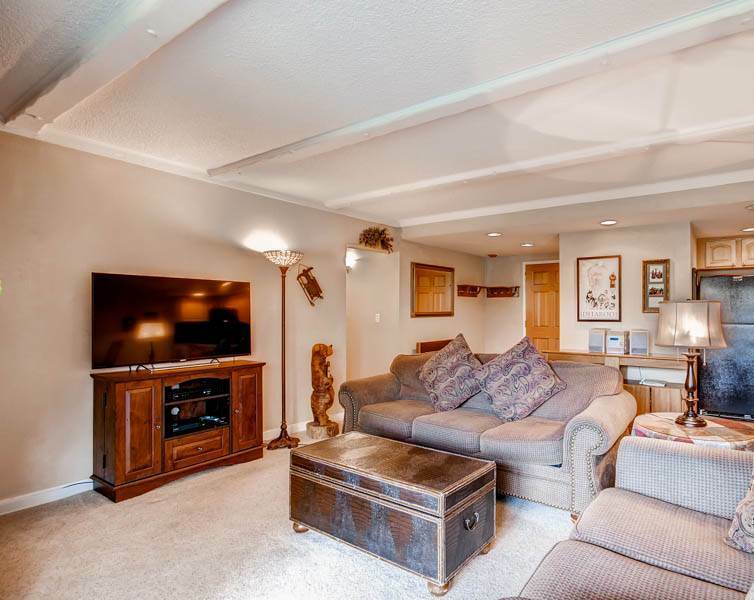 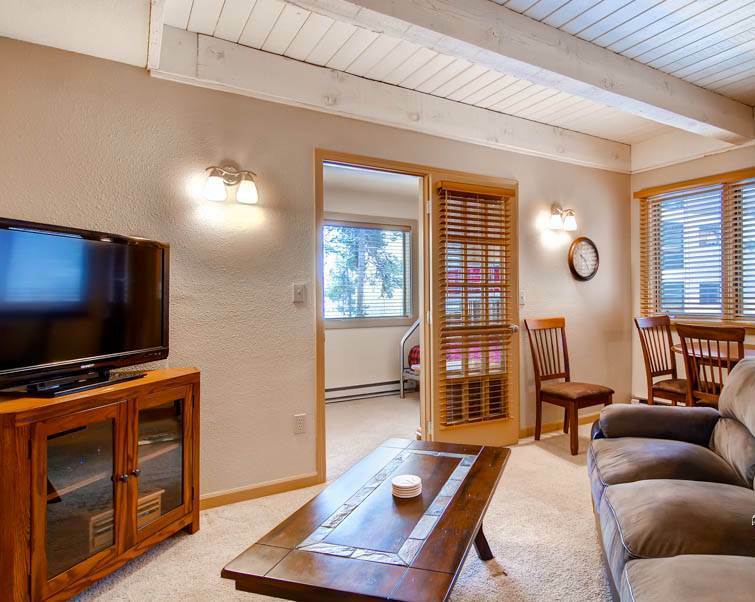 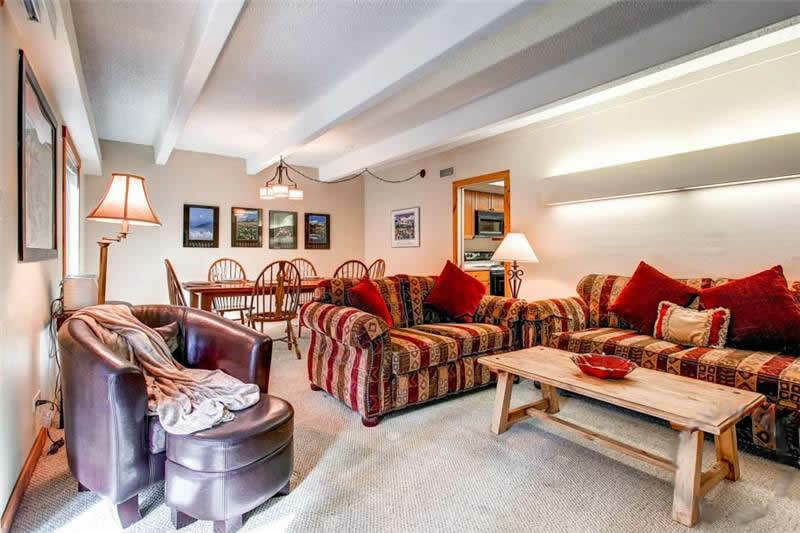 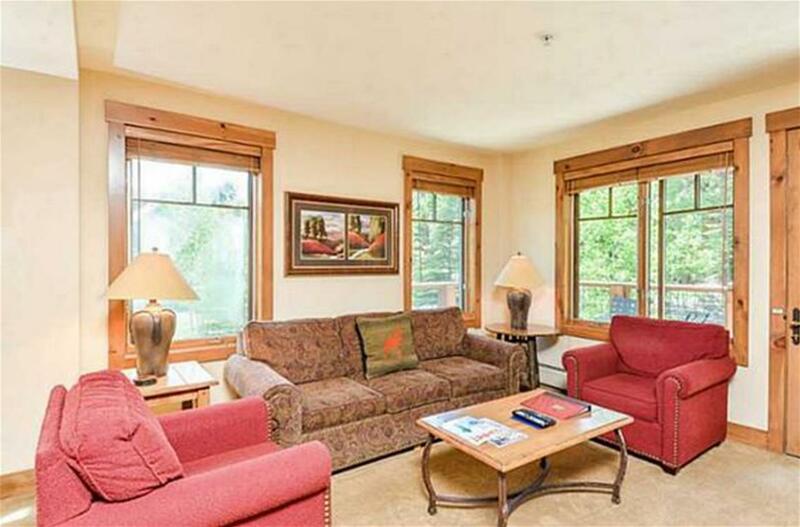 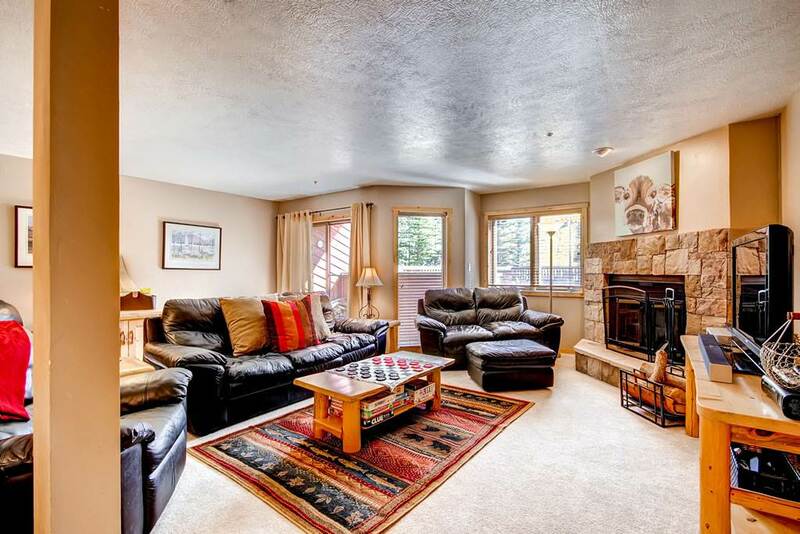 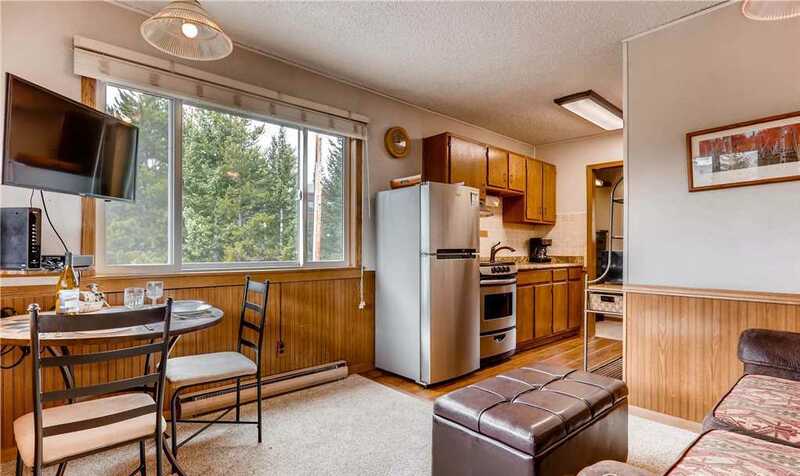 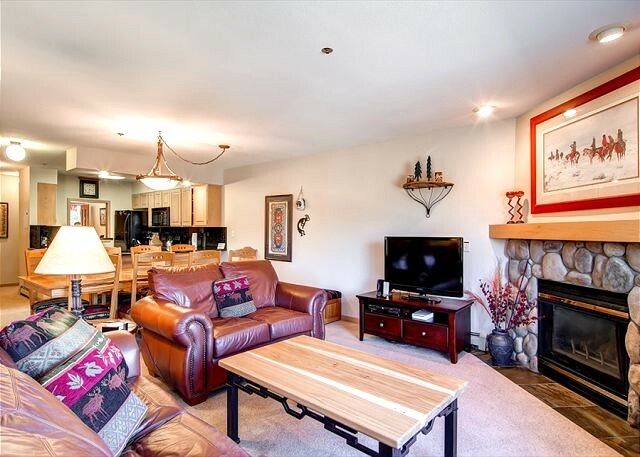 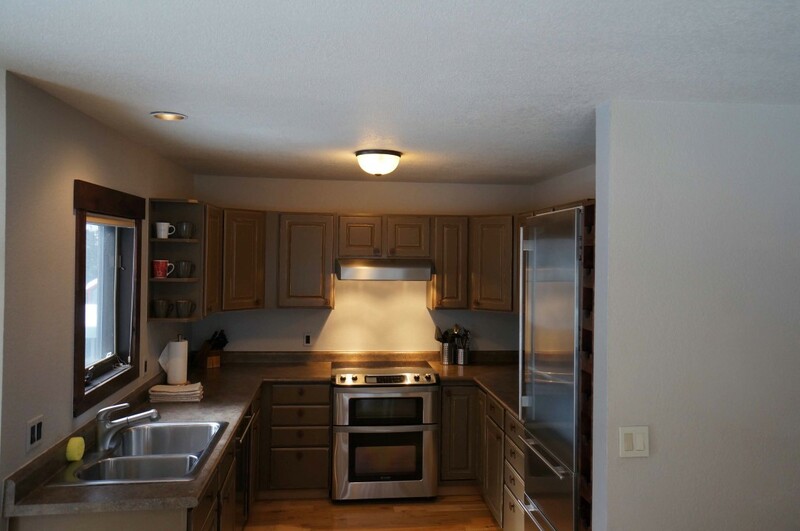 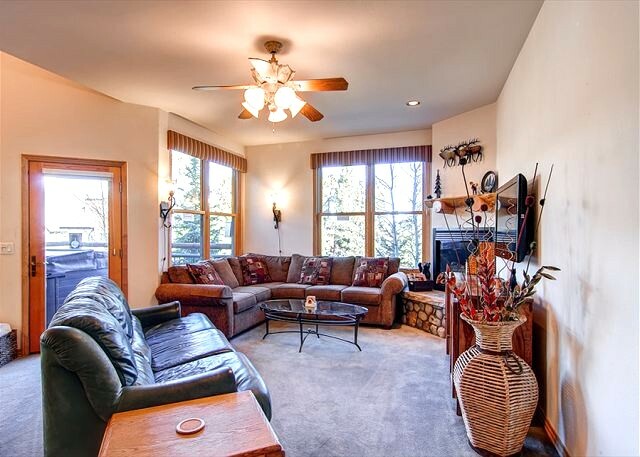 Vaulted ceilings and plenty of light give this unit an open, spacious feel. 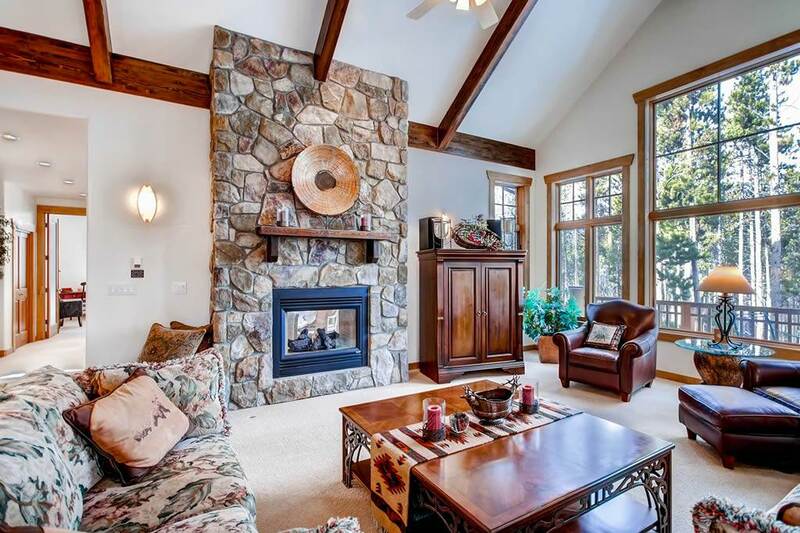 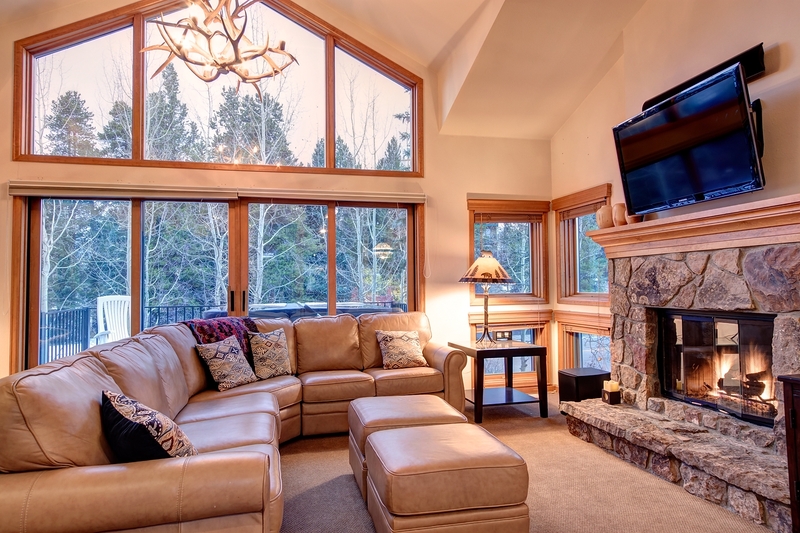 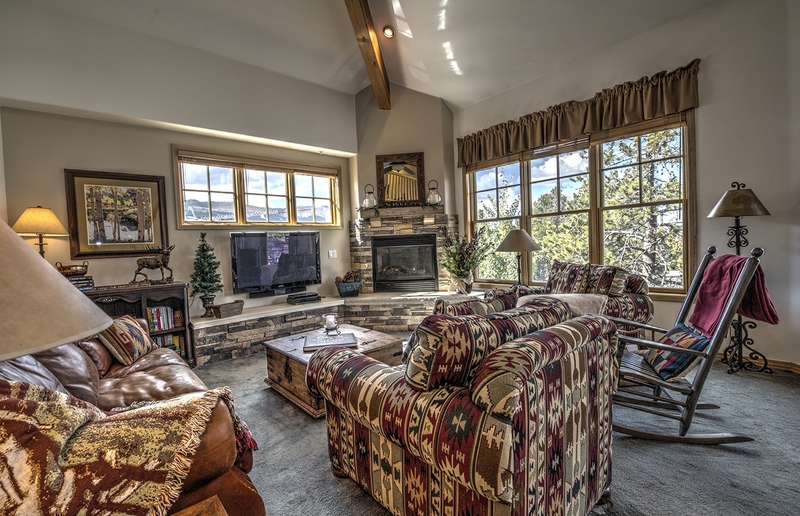 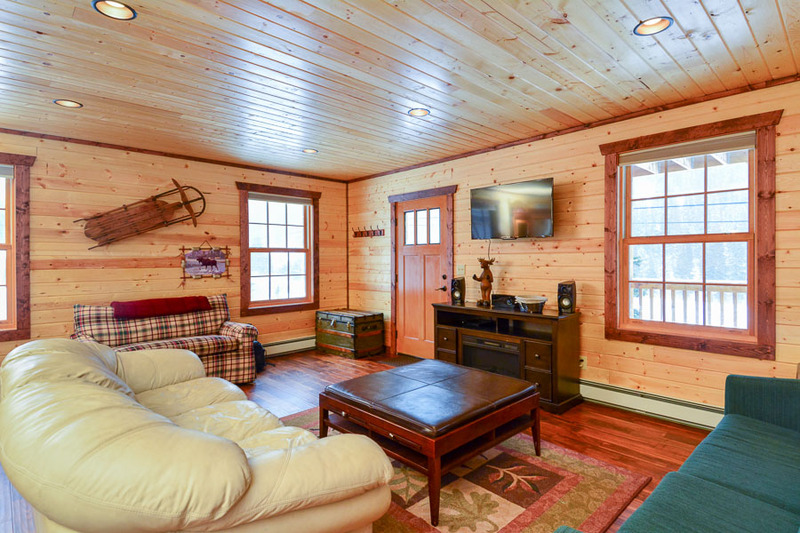 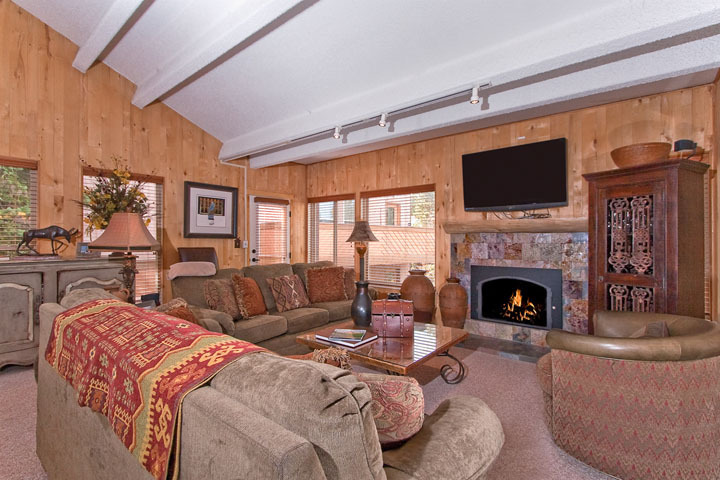 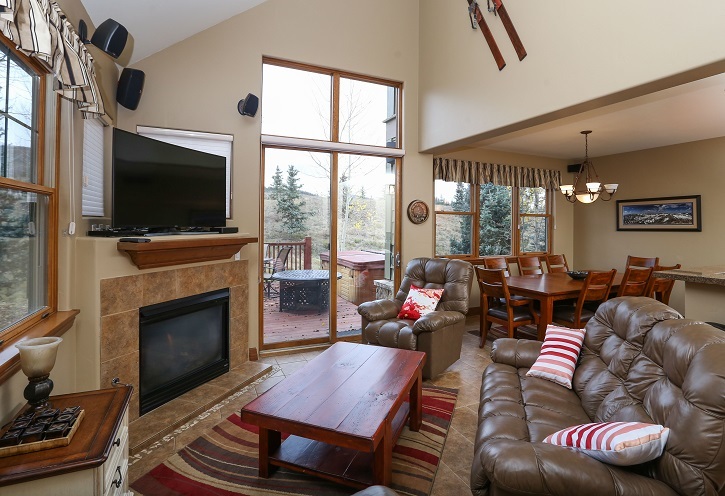 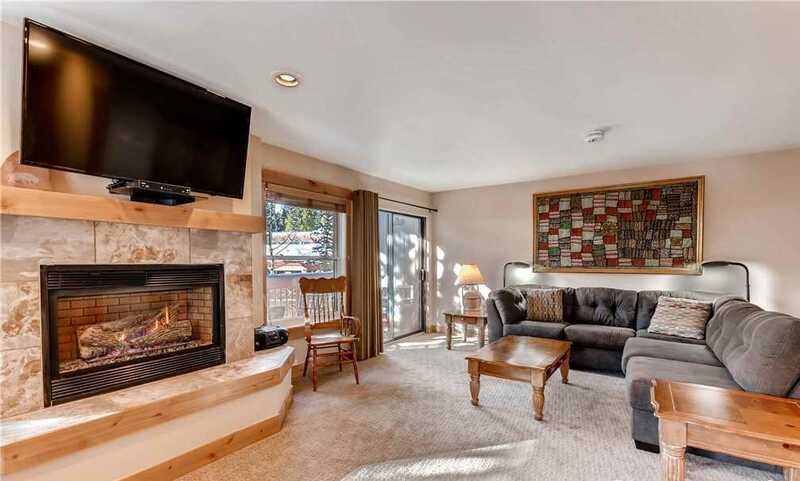 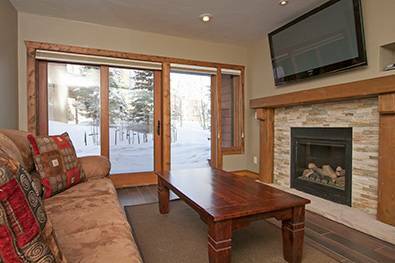 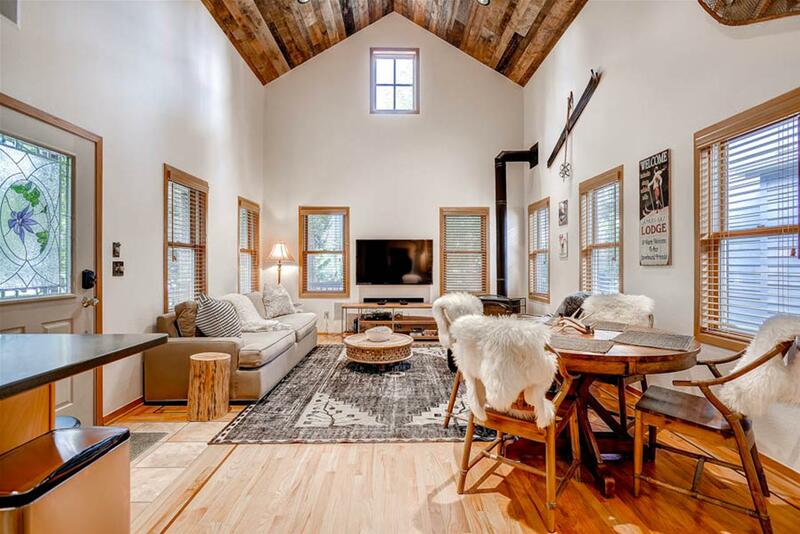 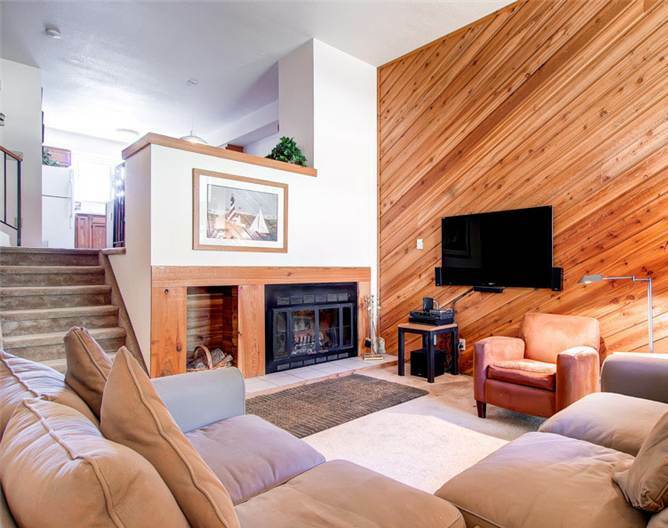 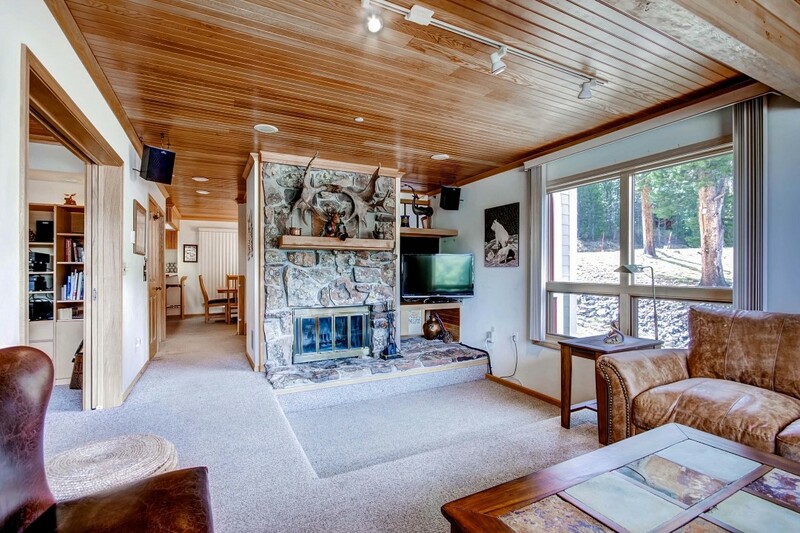 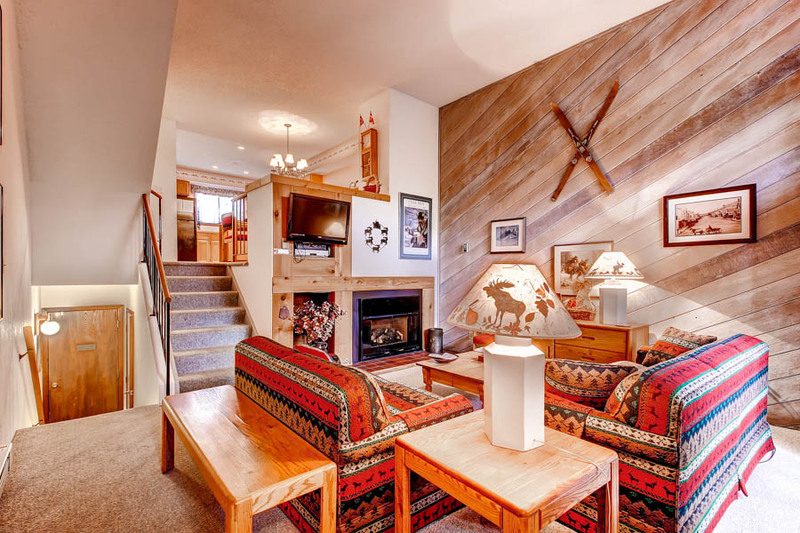 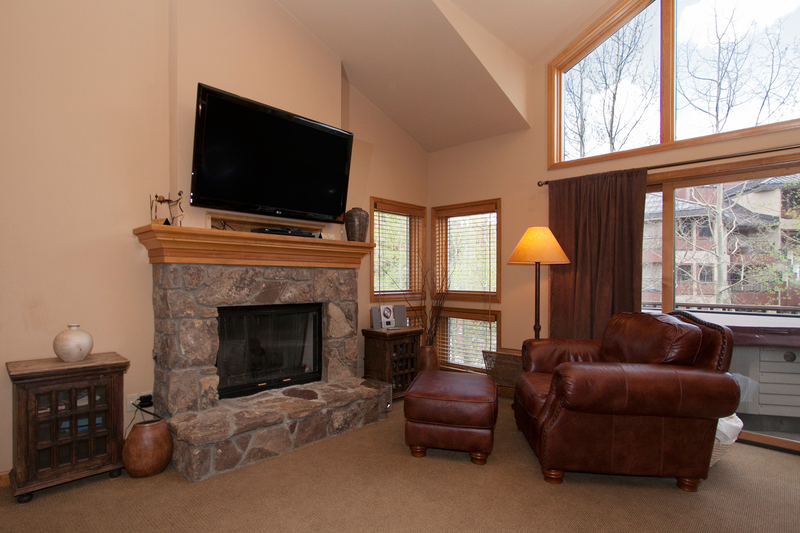 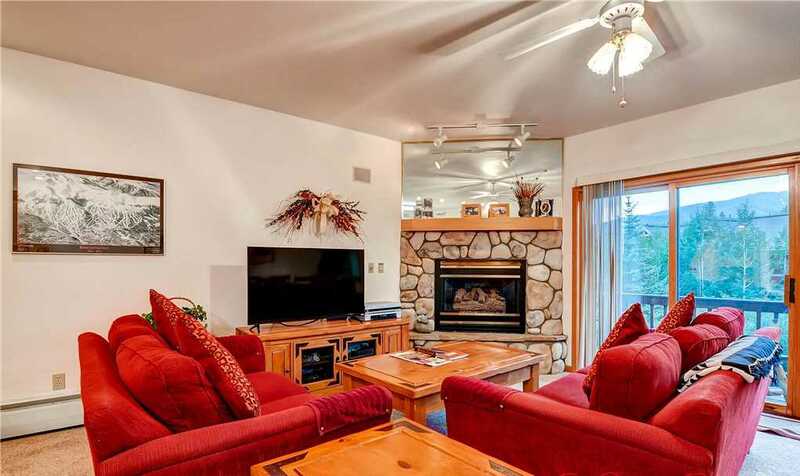 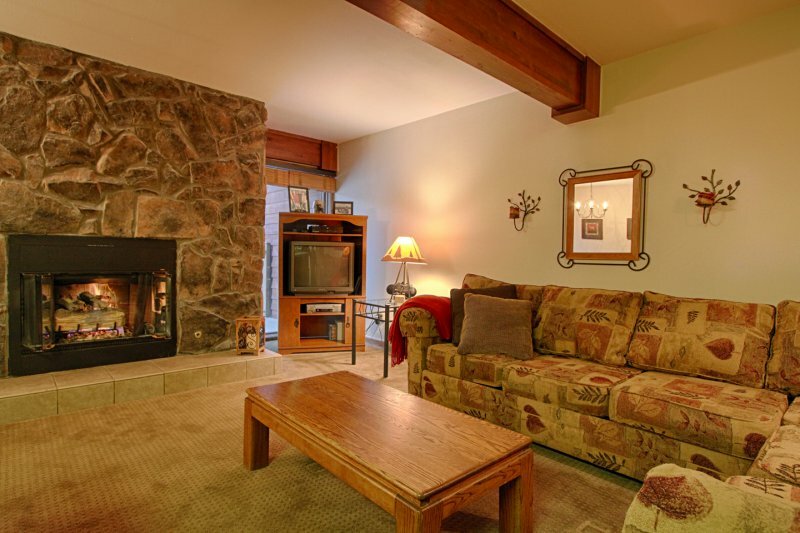 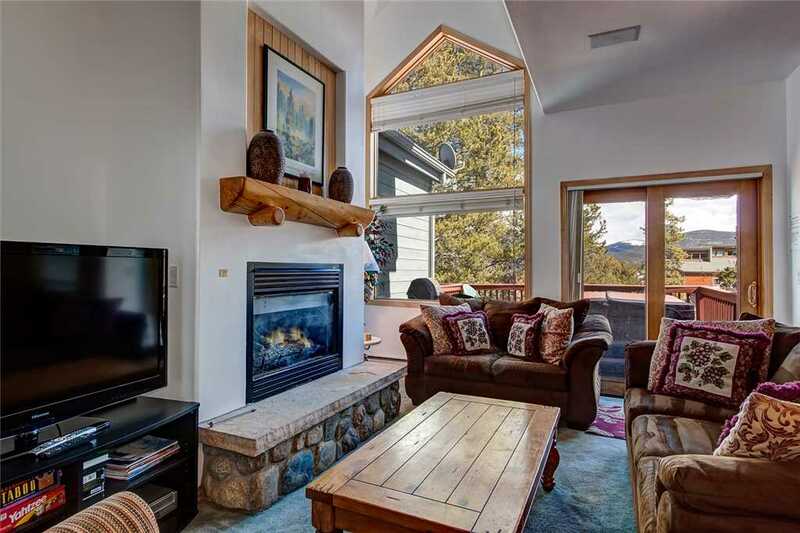 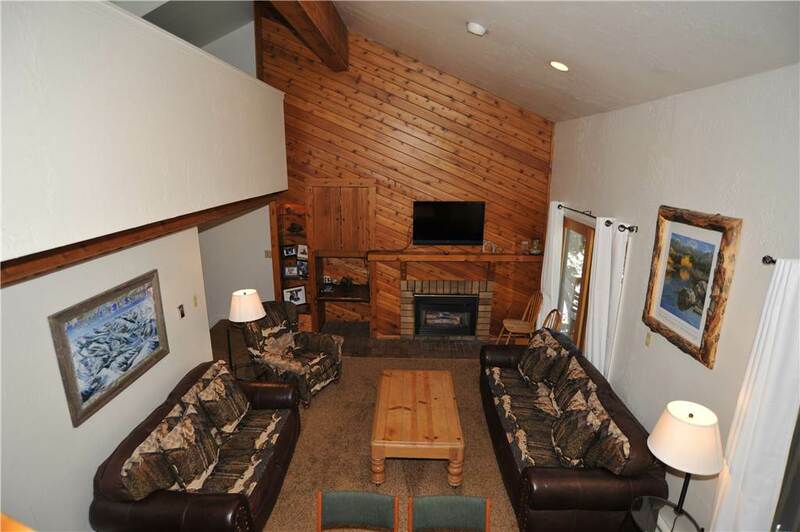 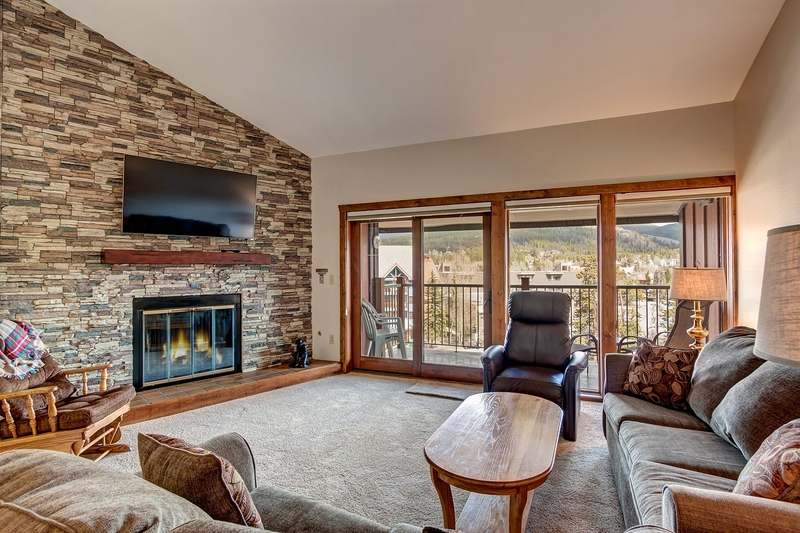 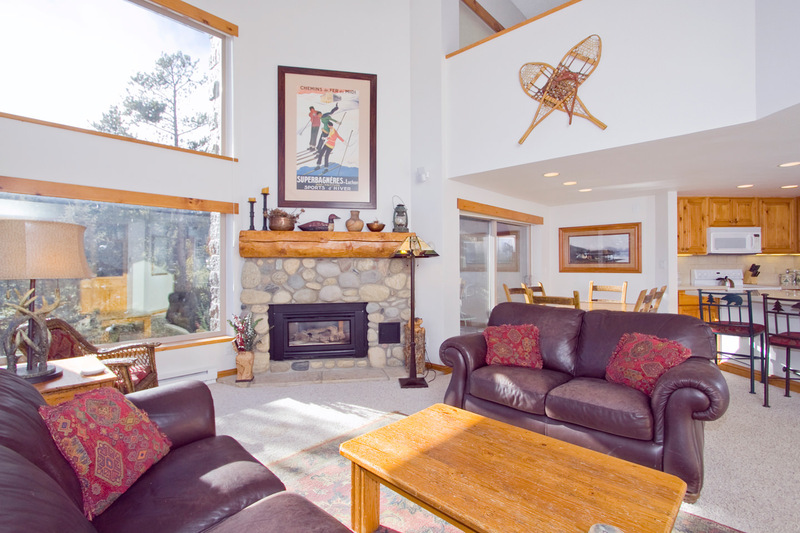 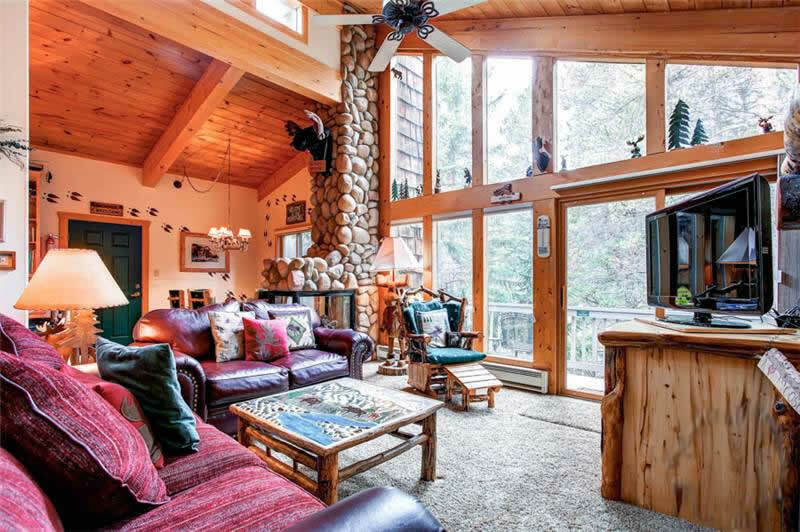 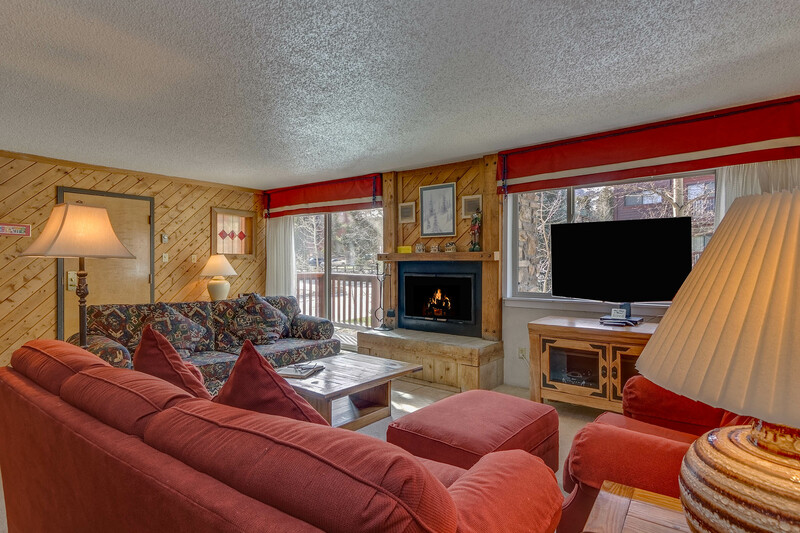 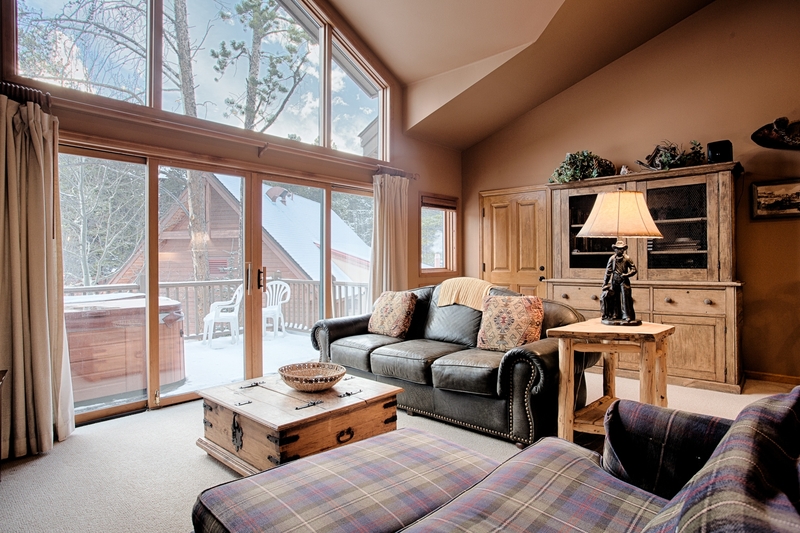 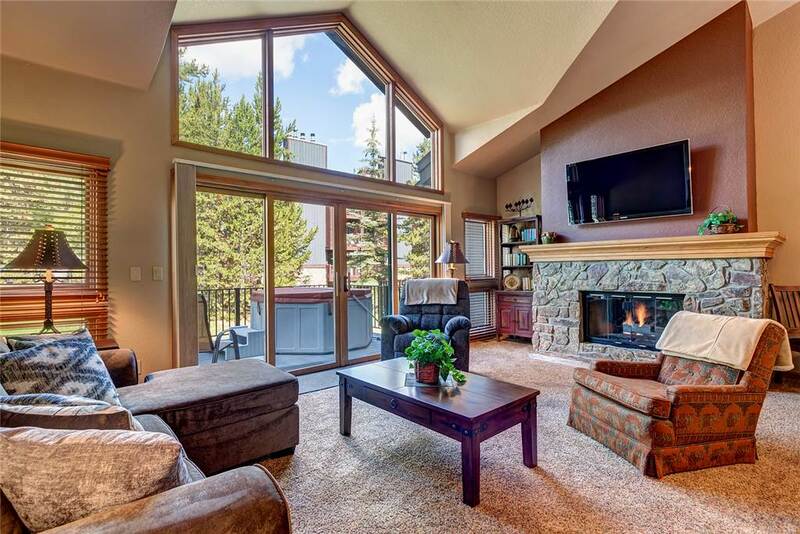 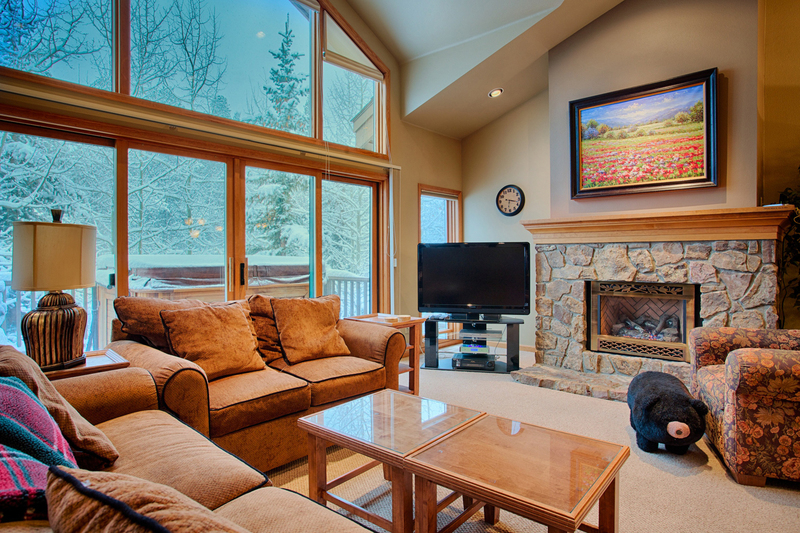 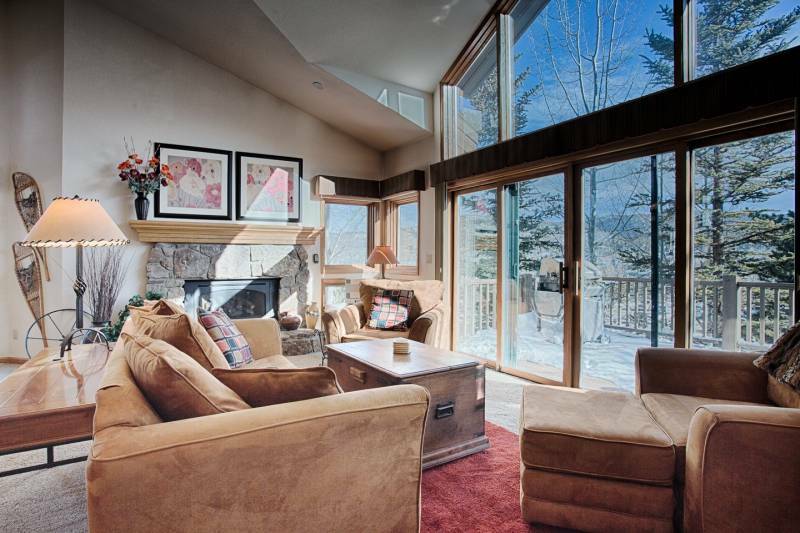 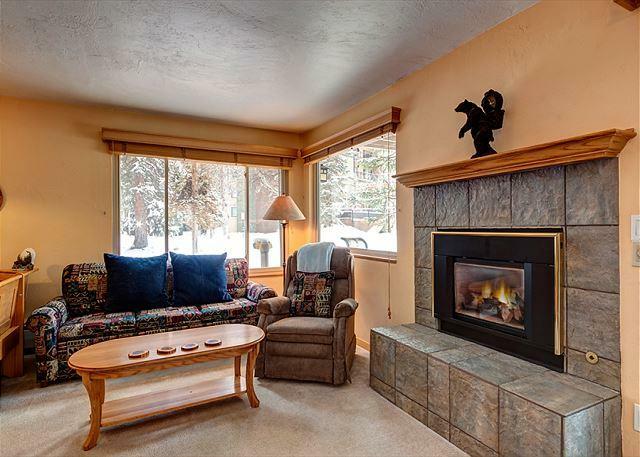 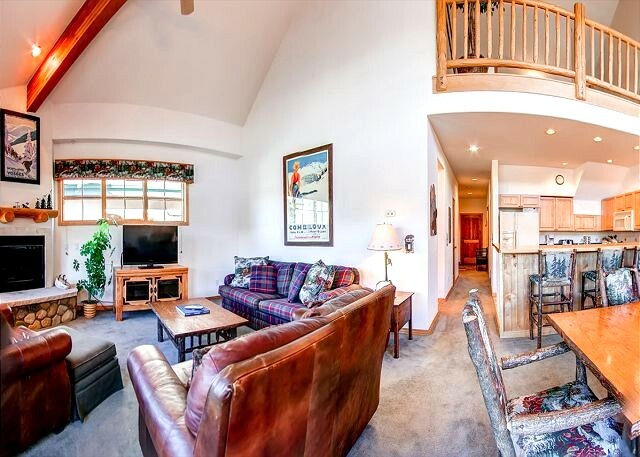 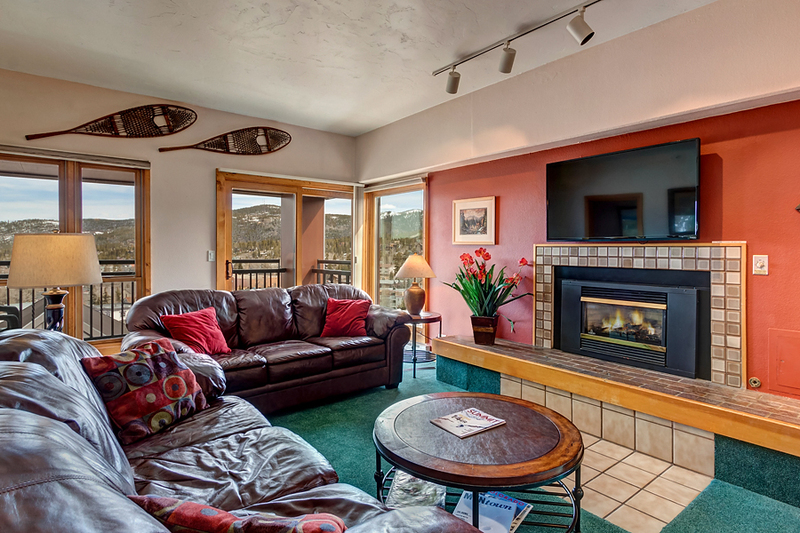 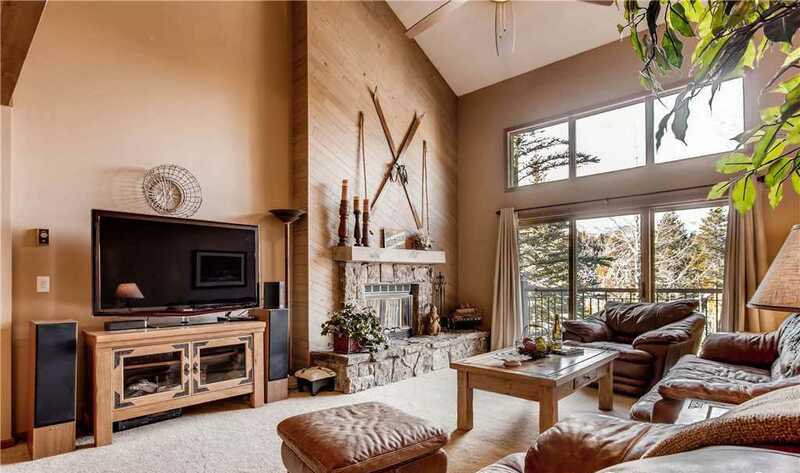 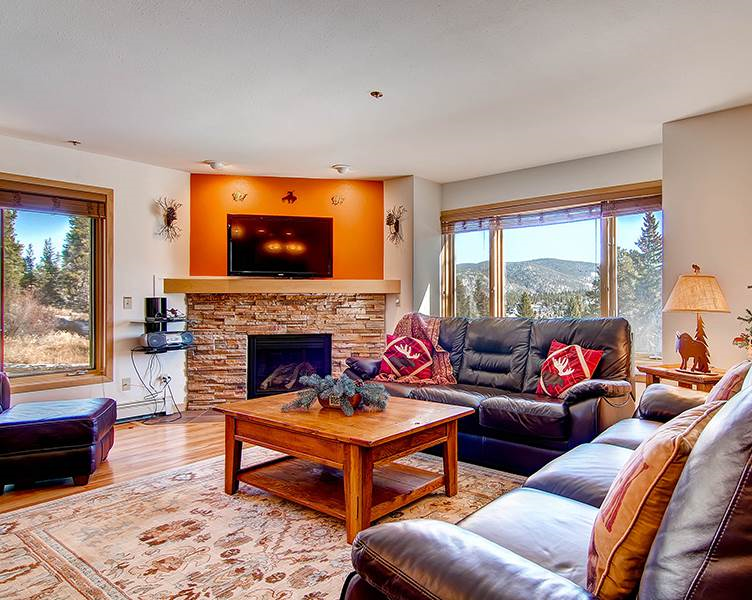 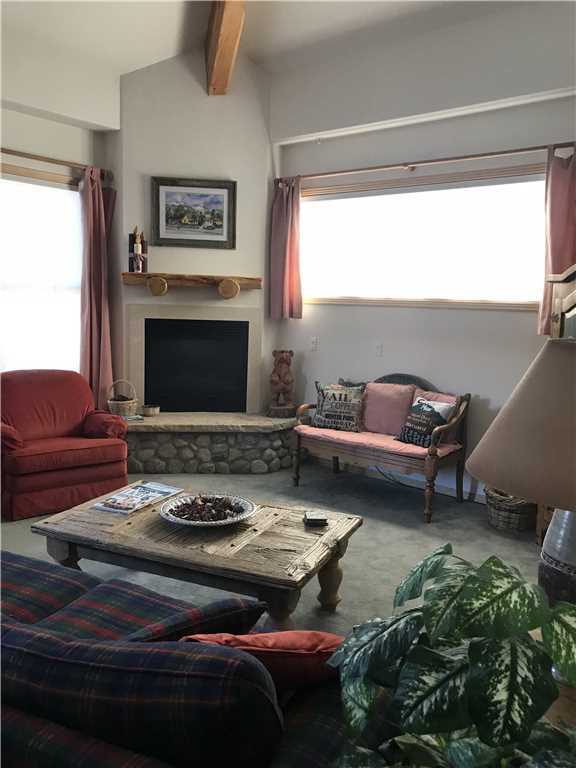 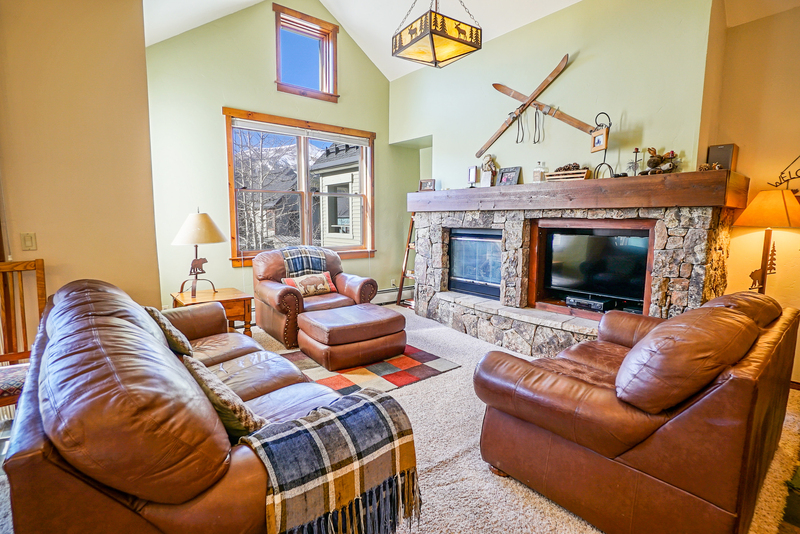 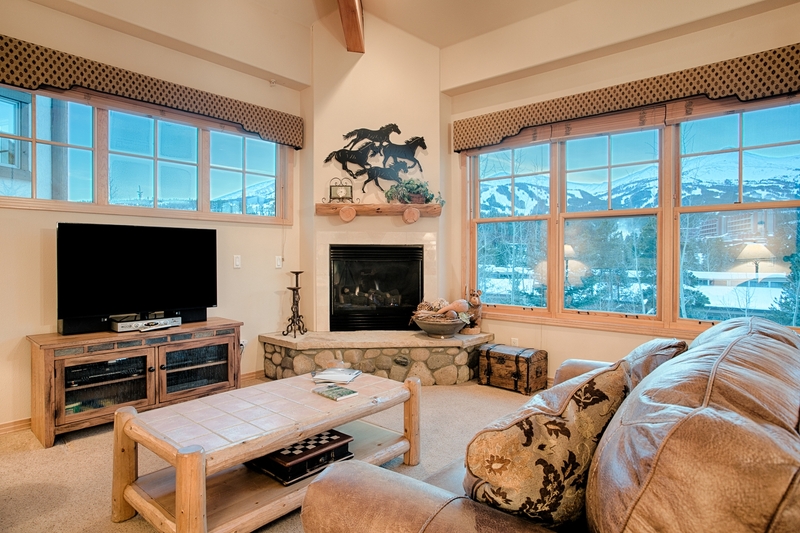 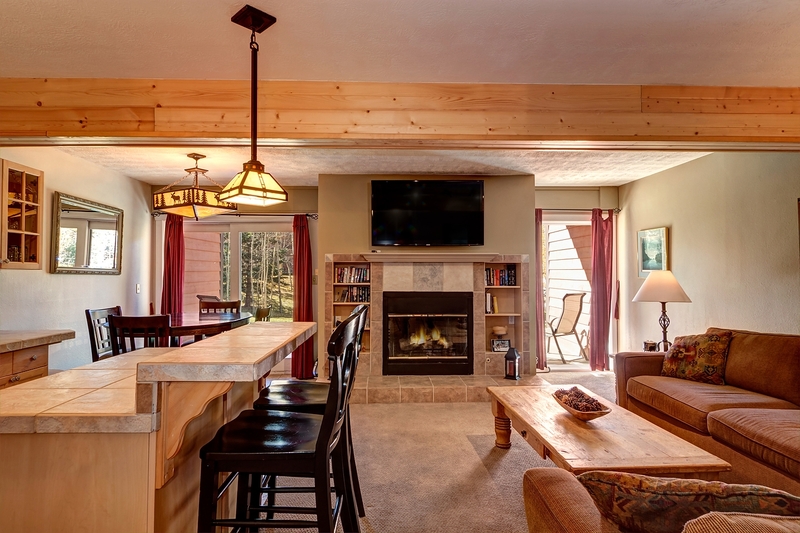 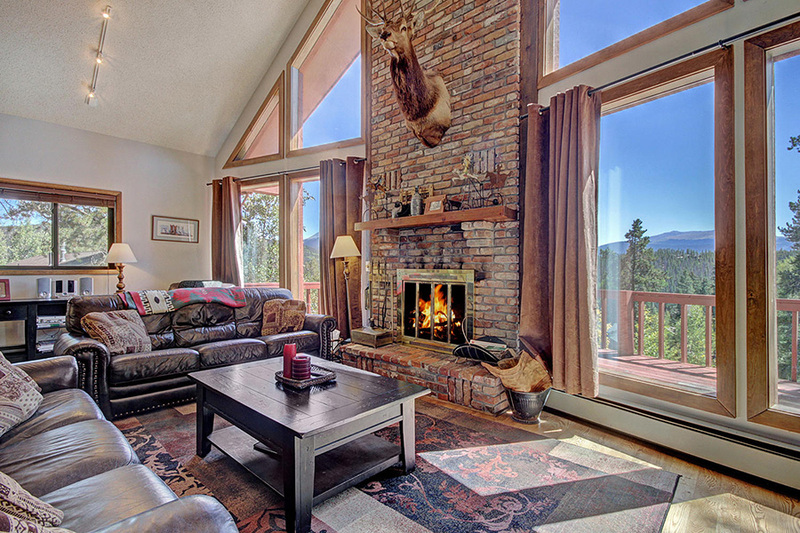 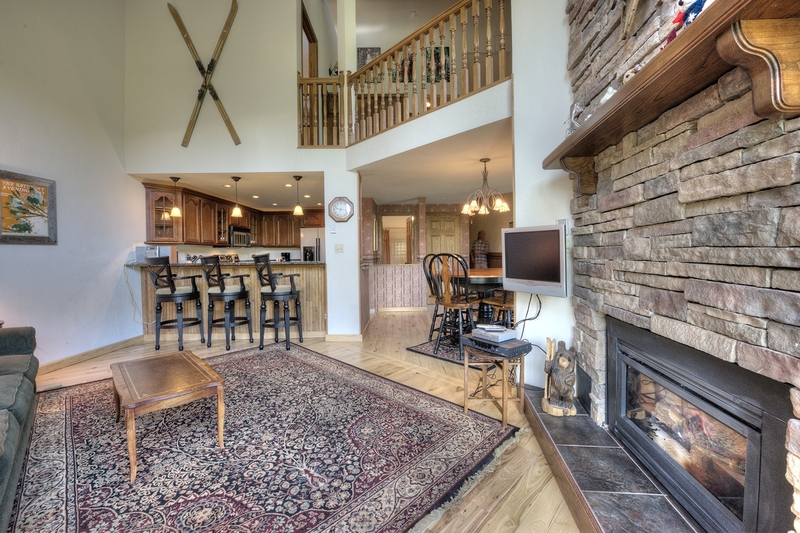 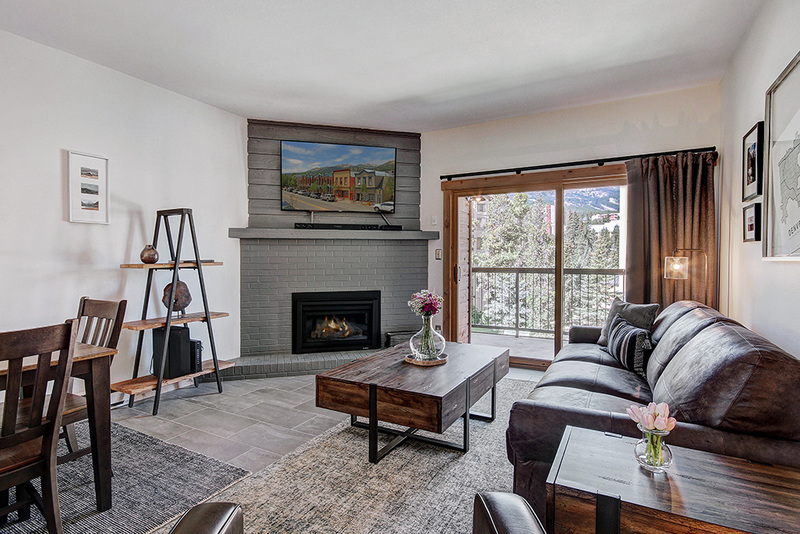 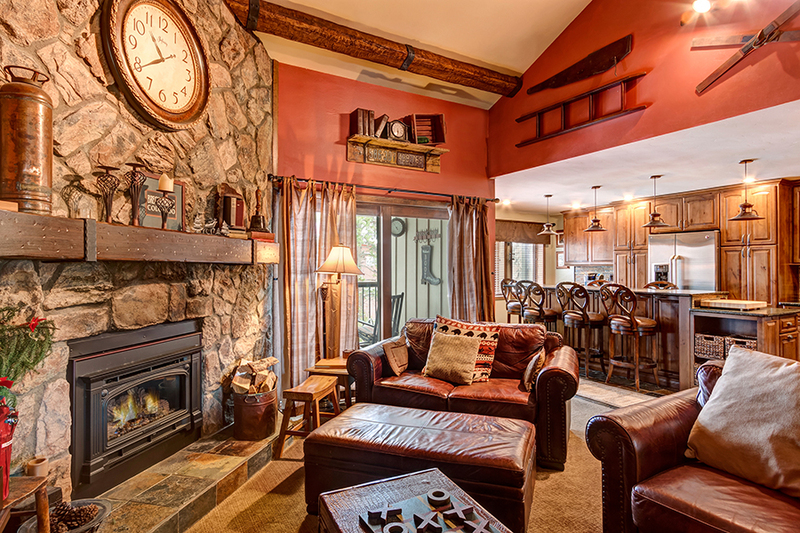 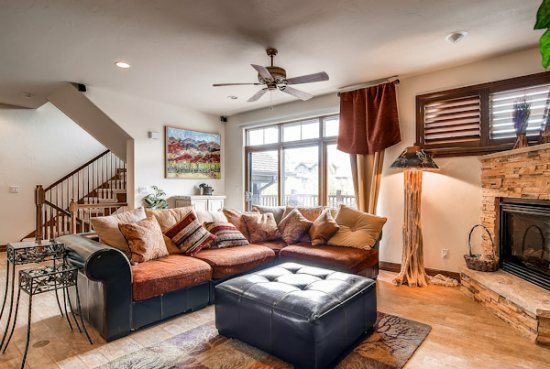 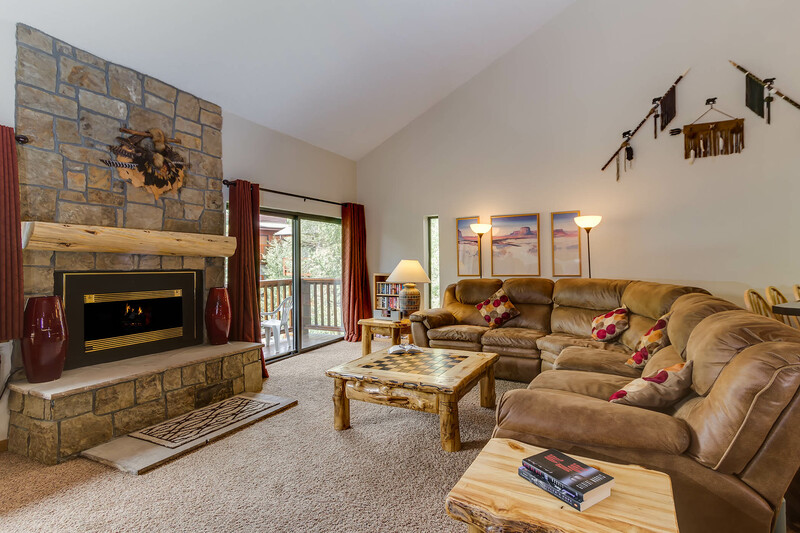 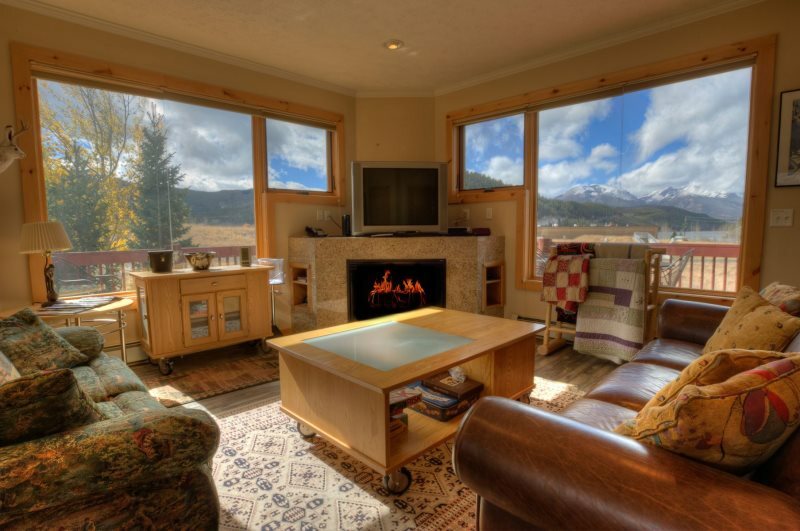 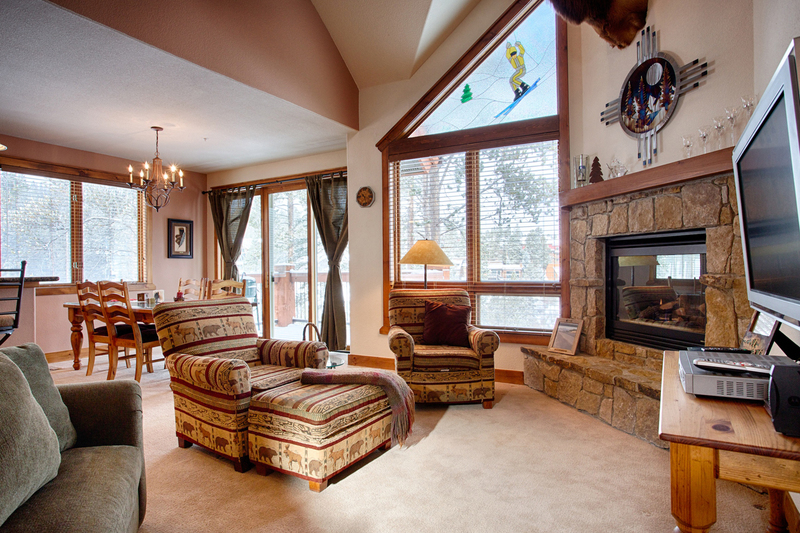 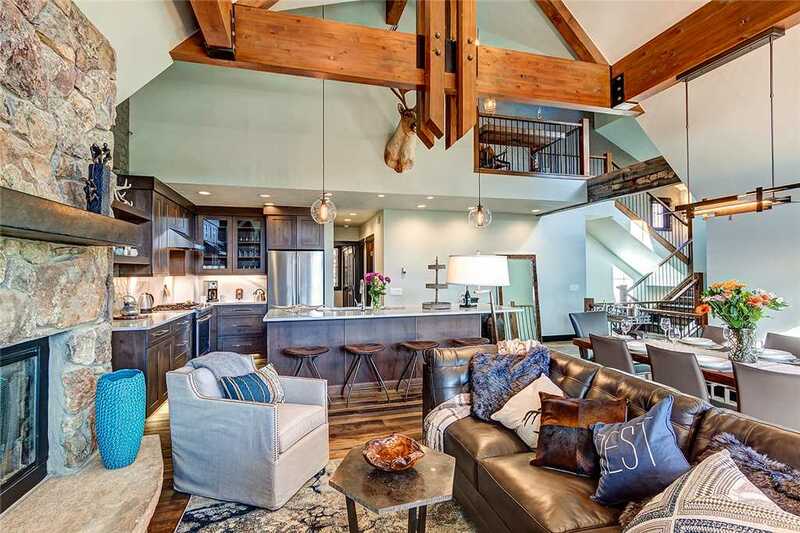 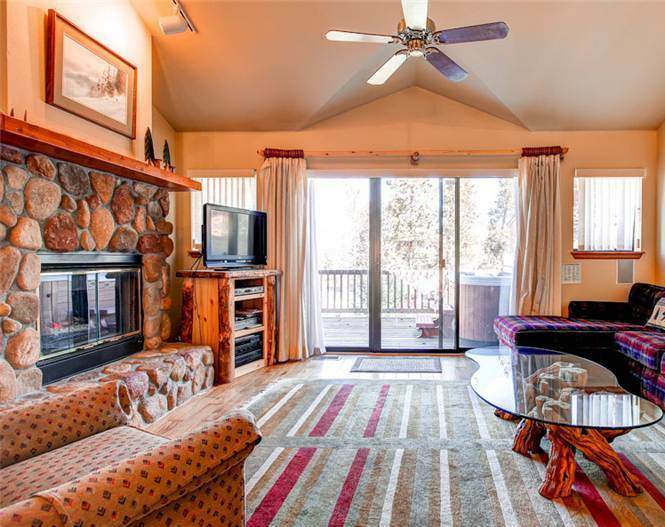 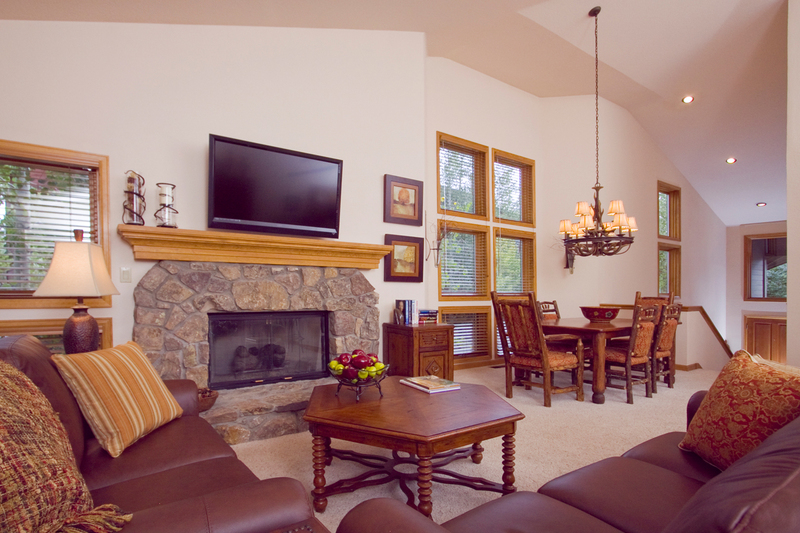 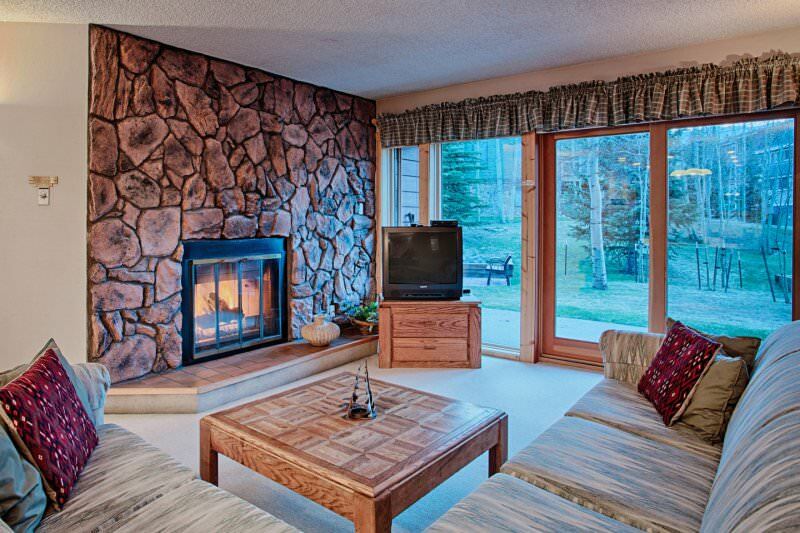 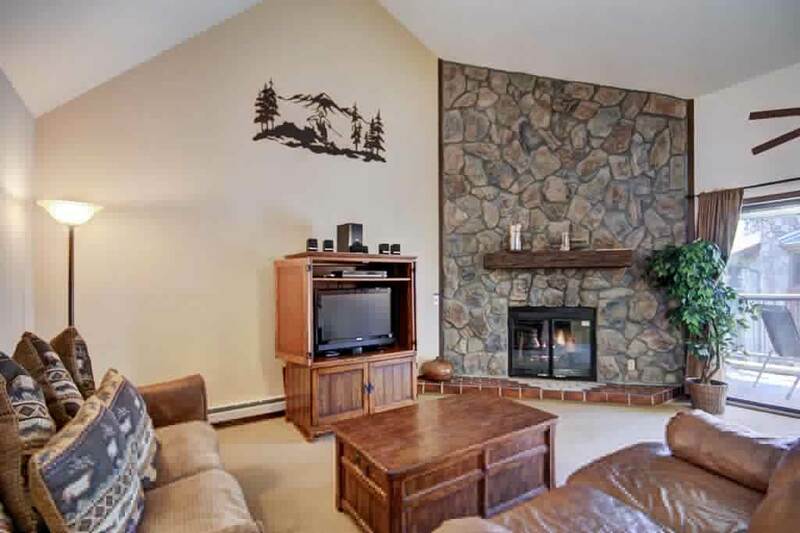 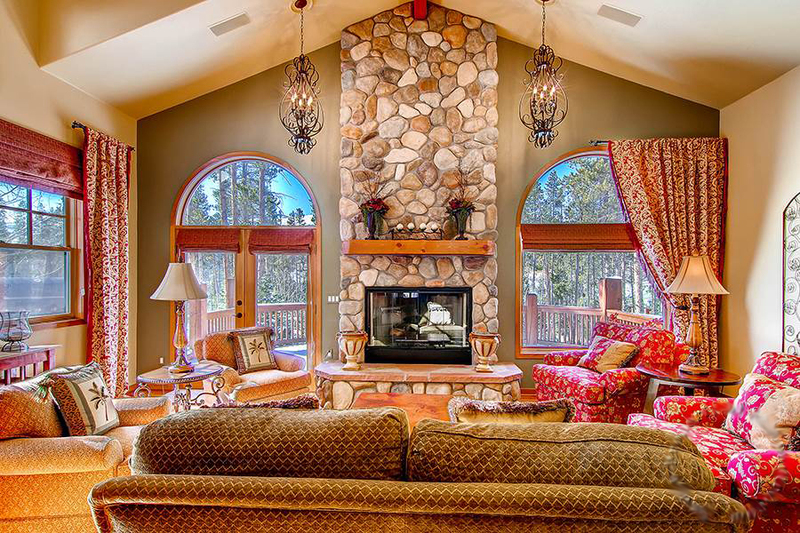 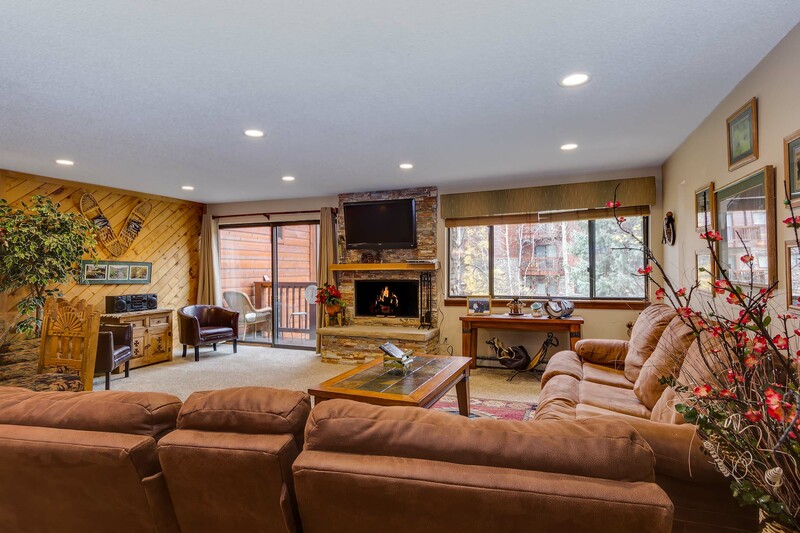 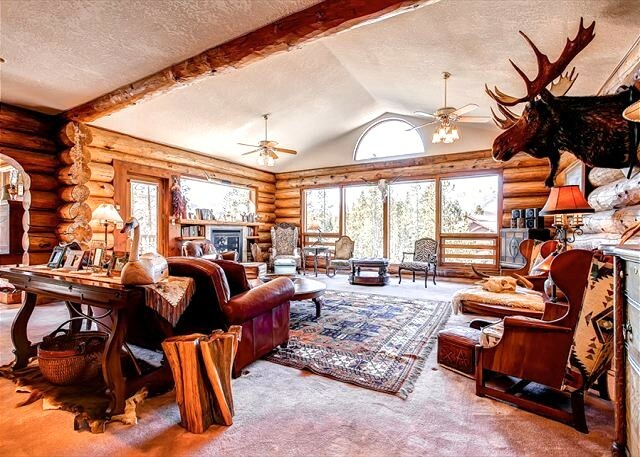 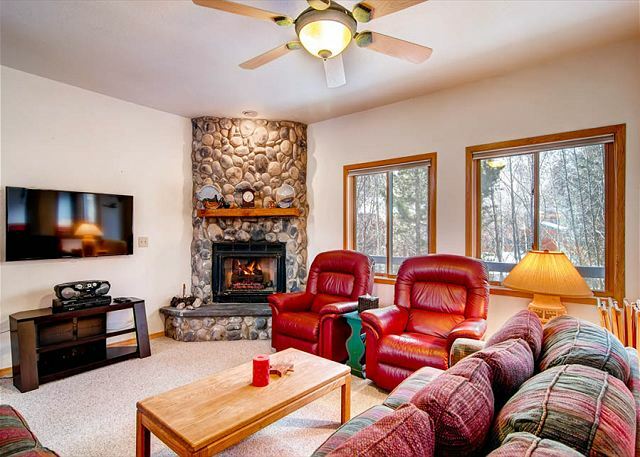 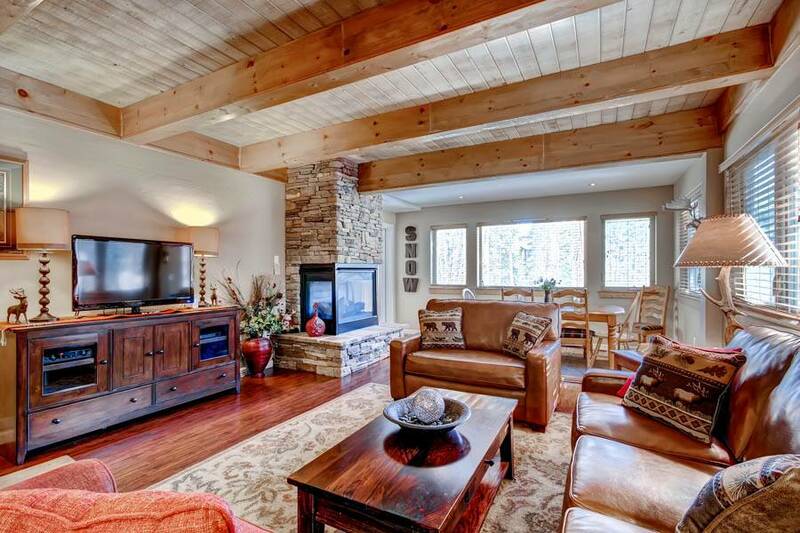 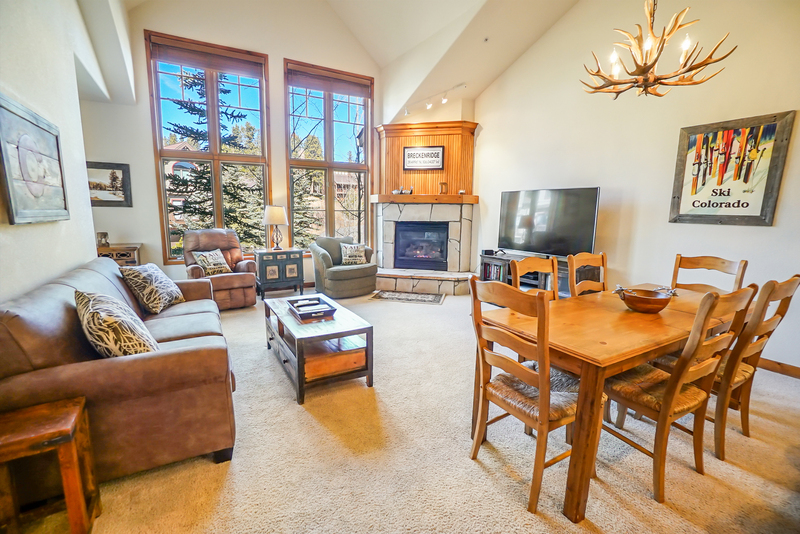 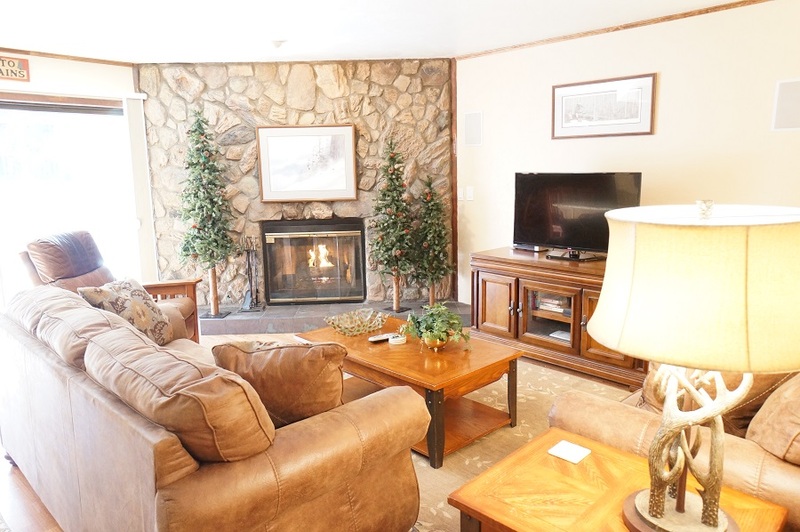 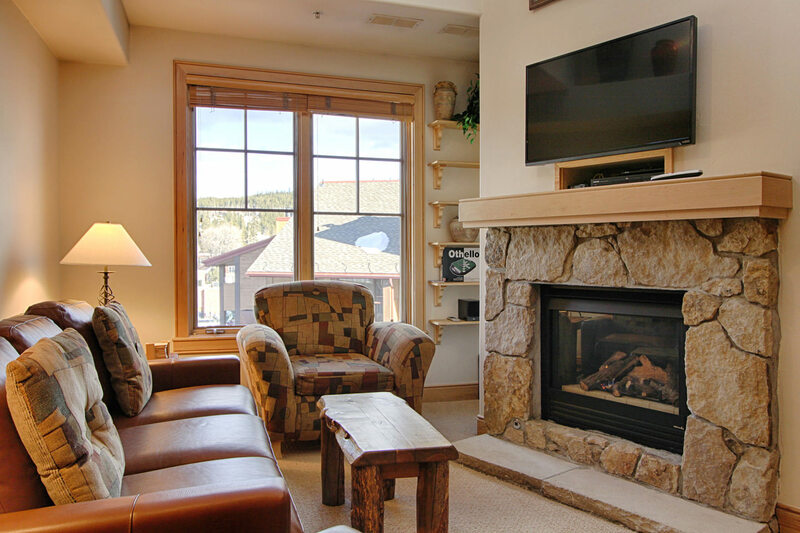 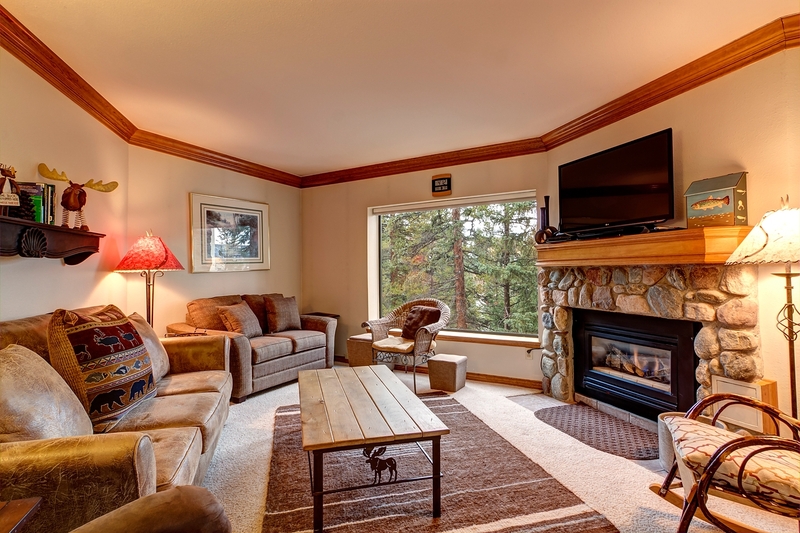 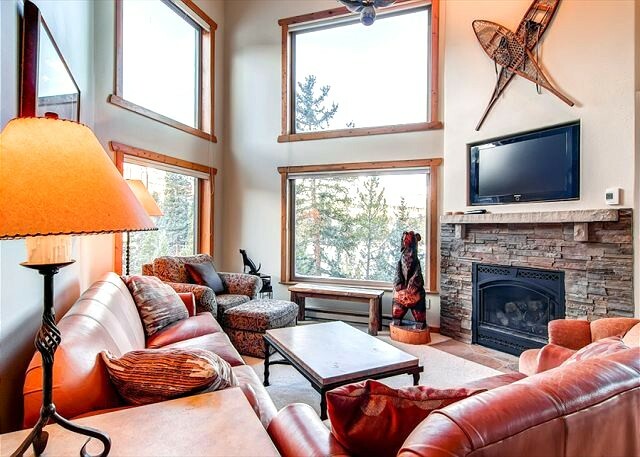 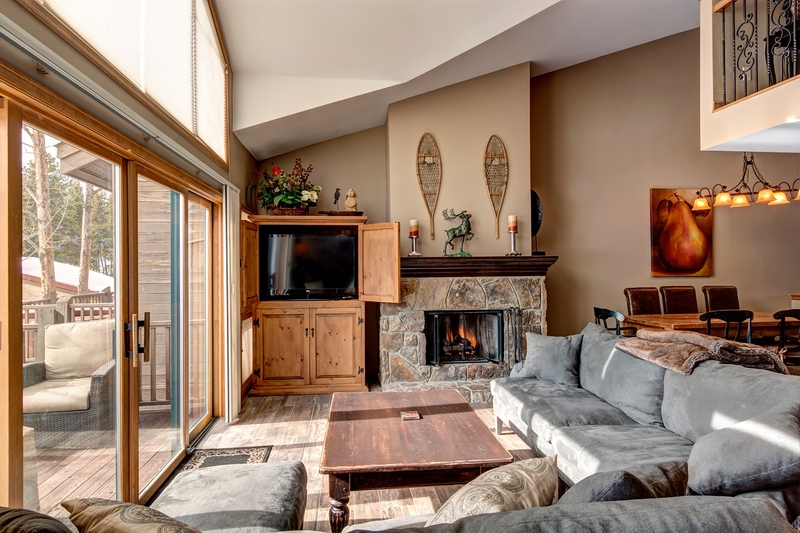 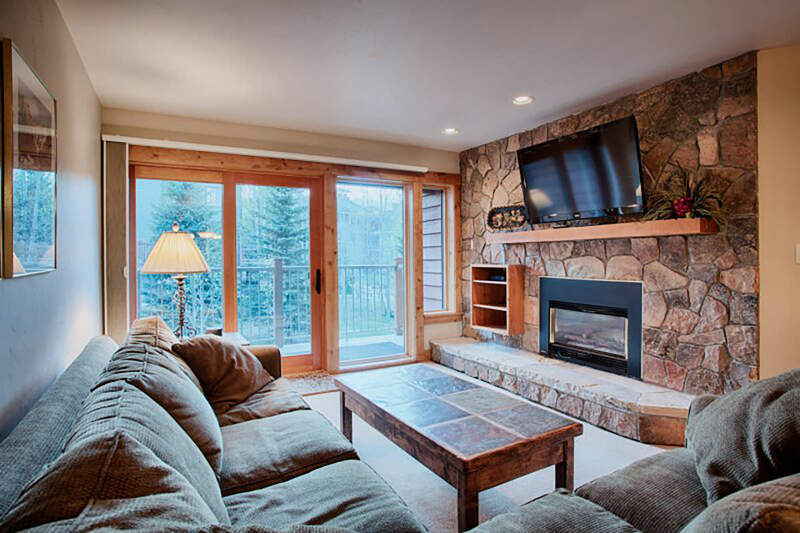 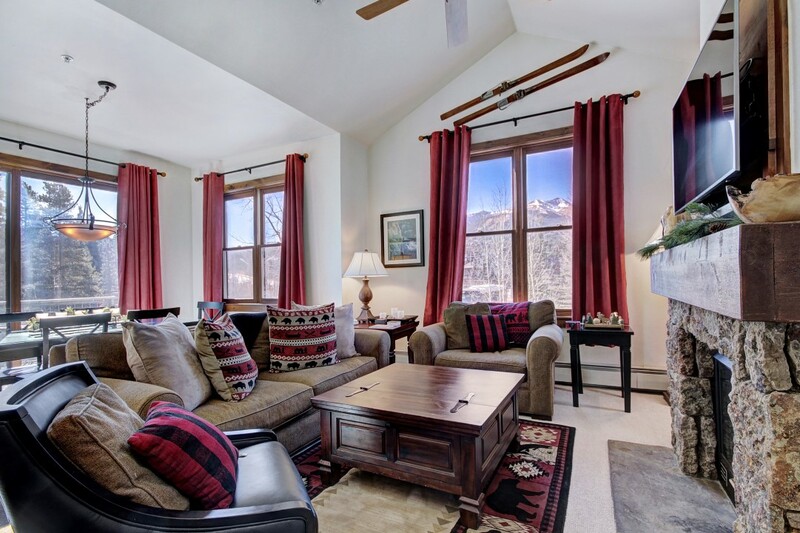 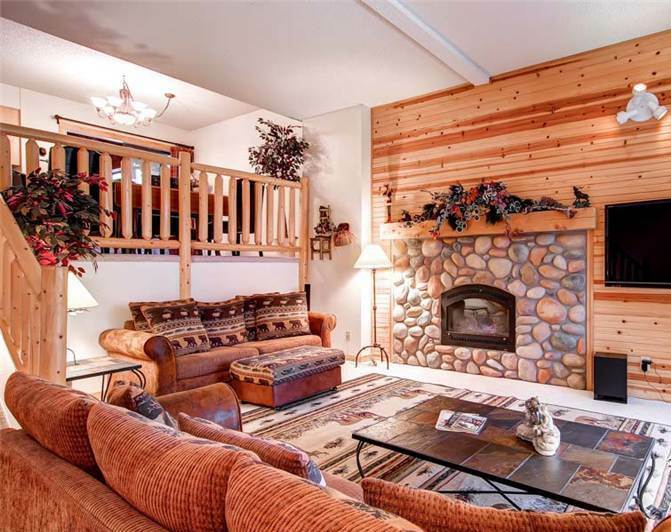 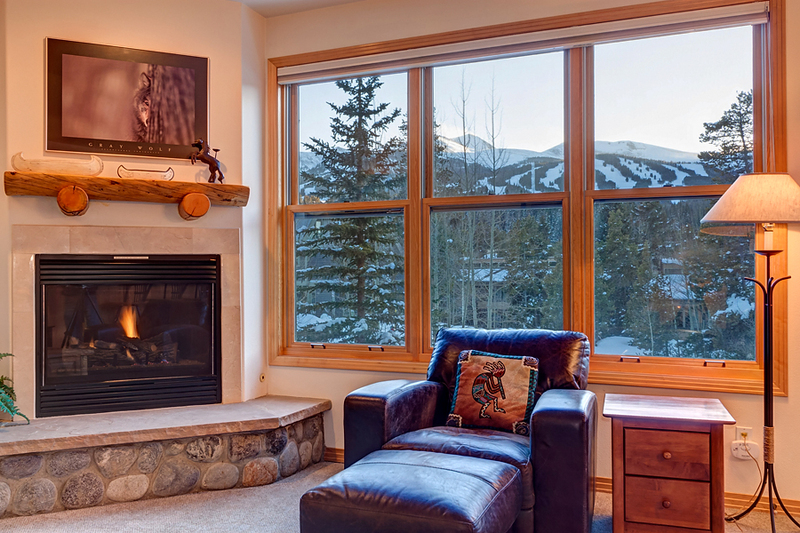 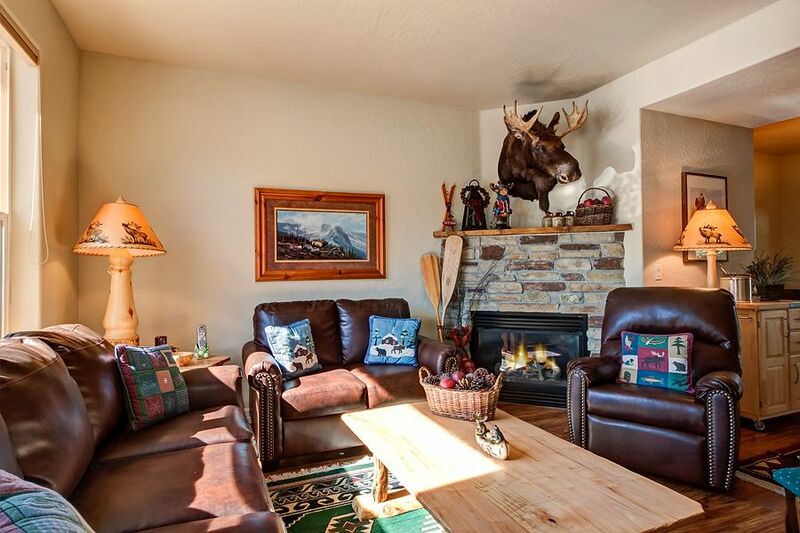 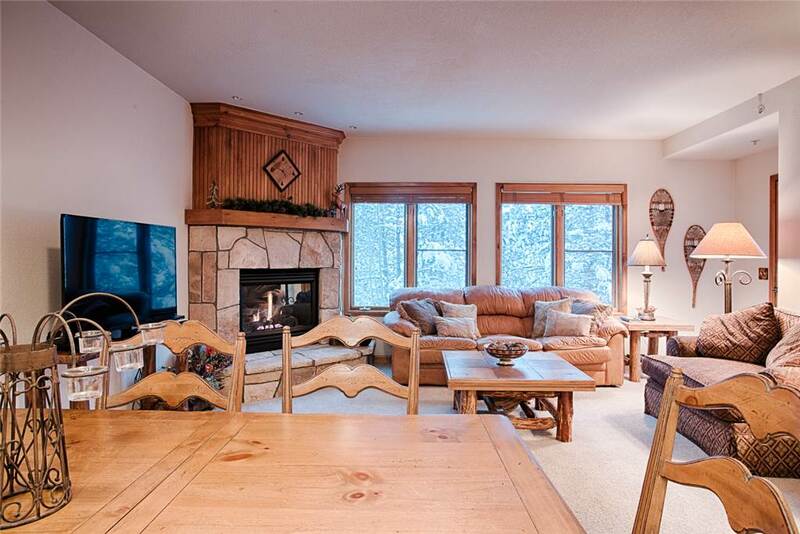 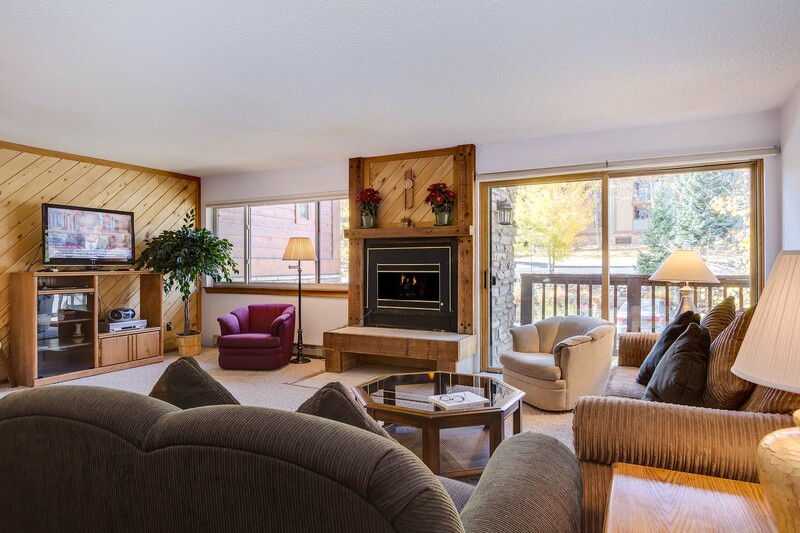 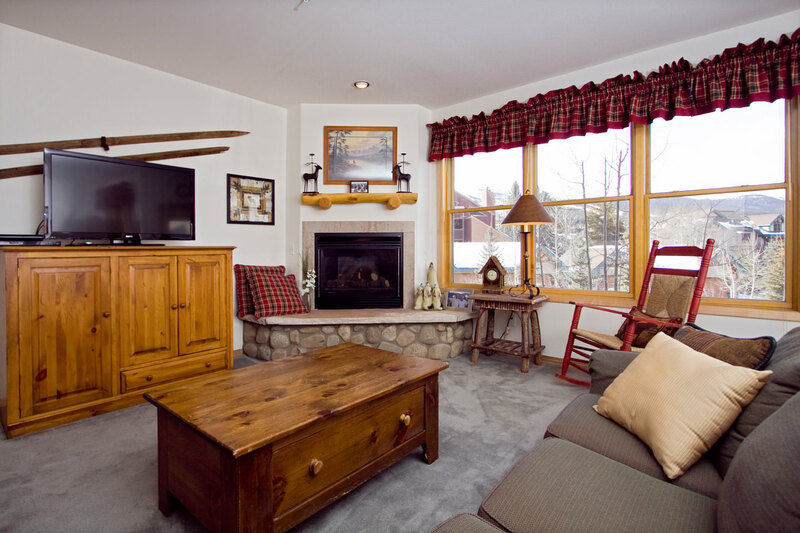 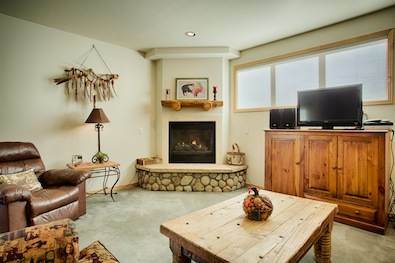 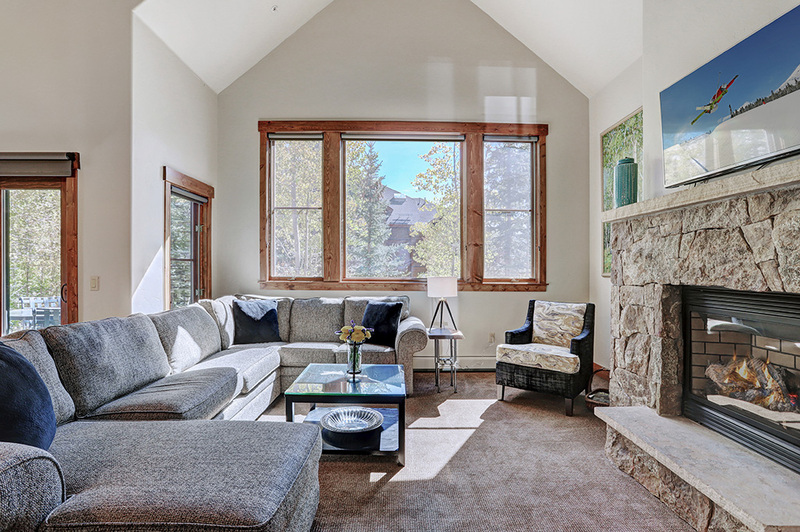 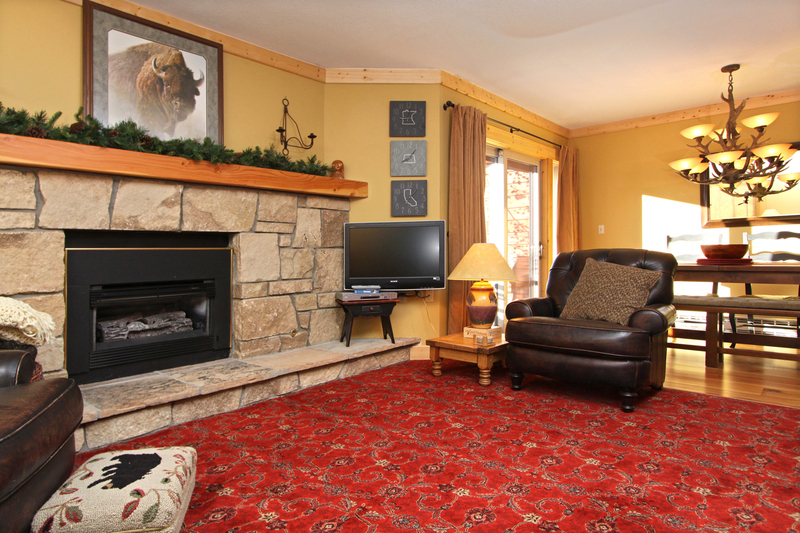 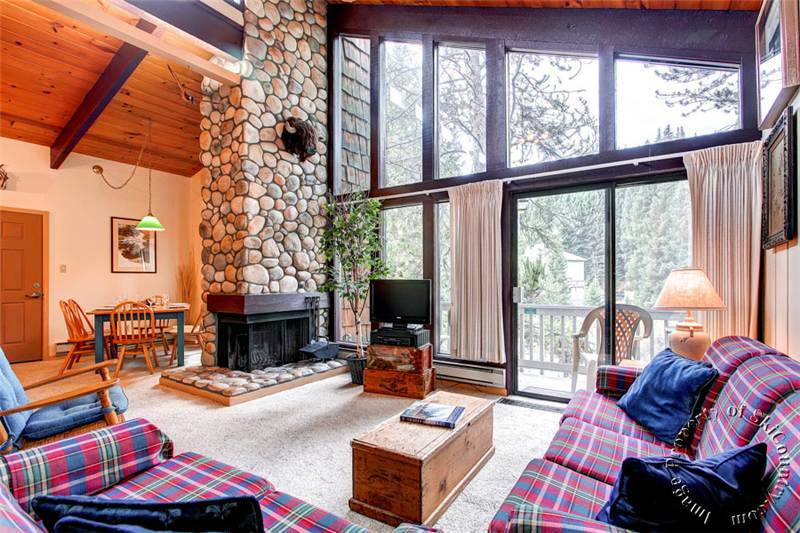 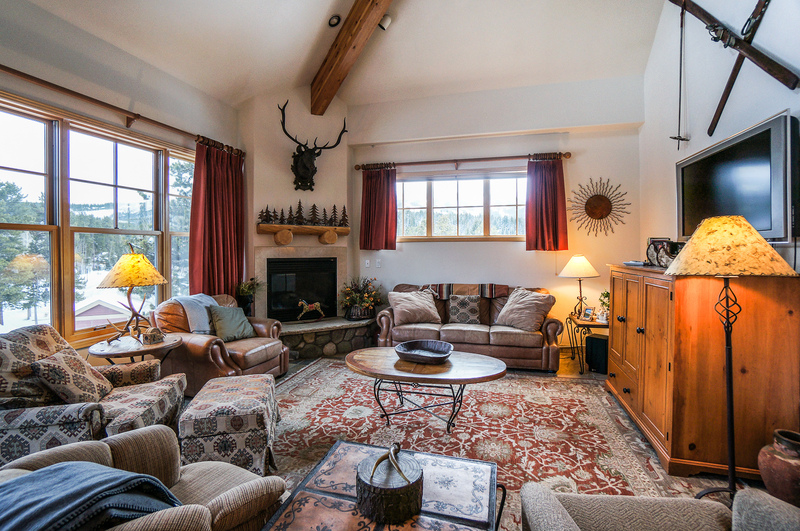 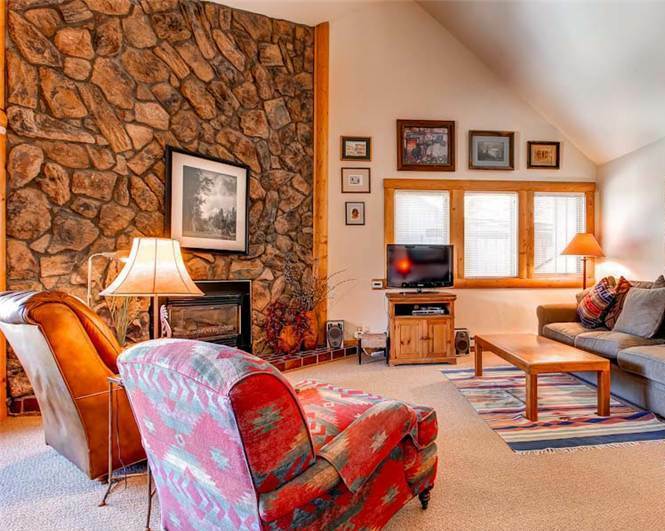 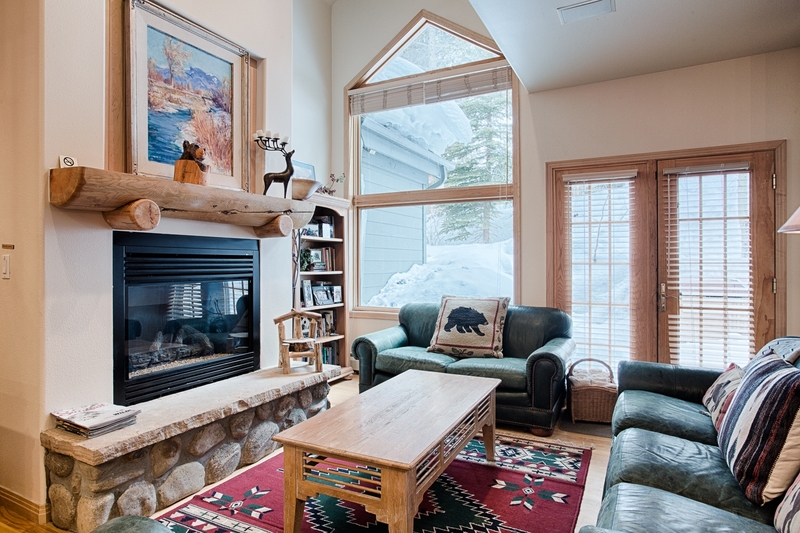 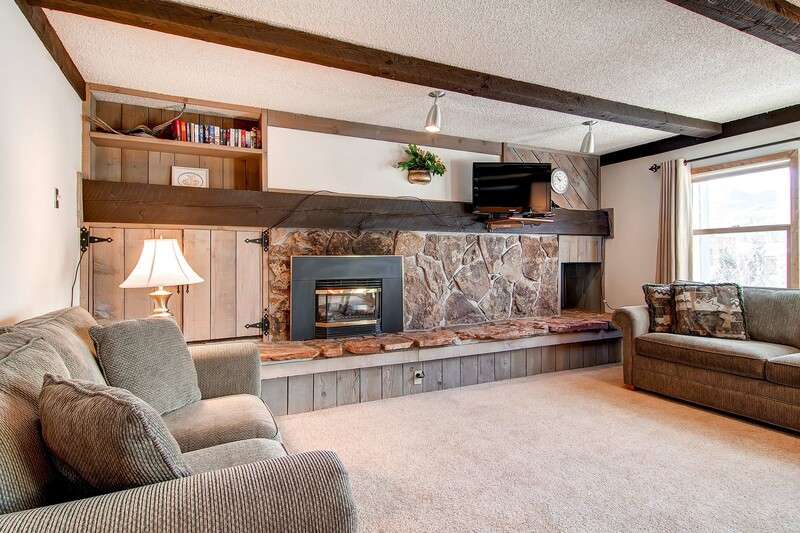 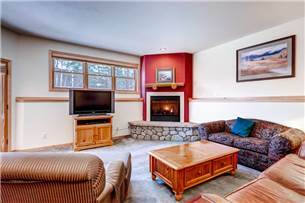 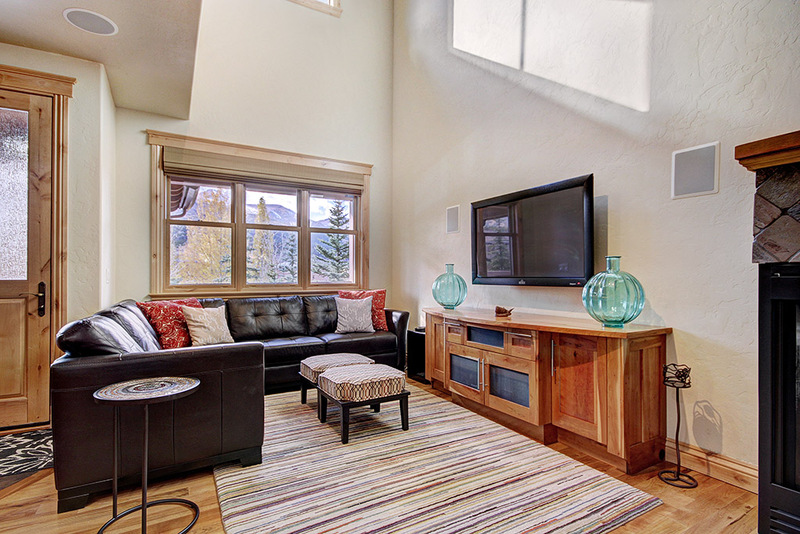 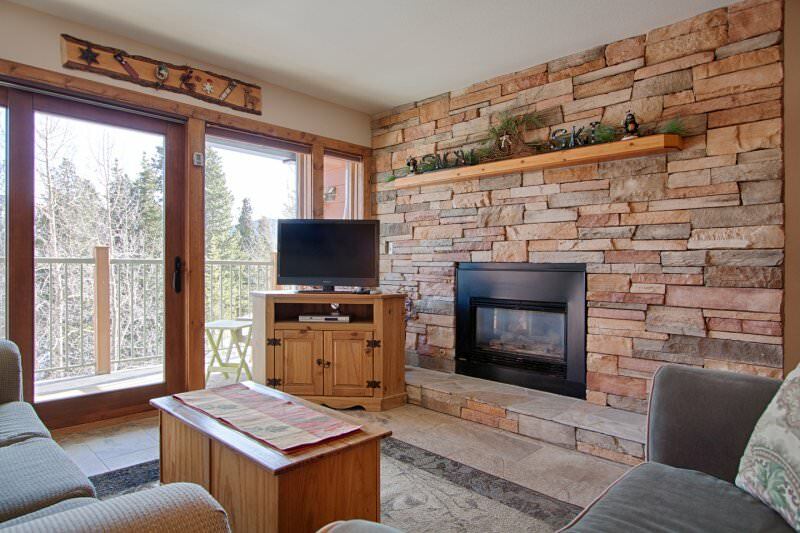 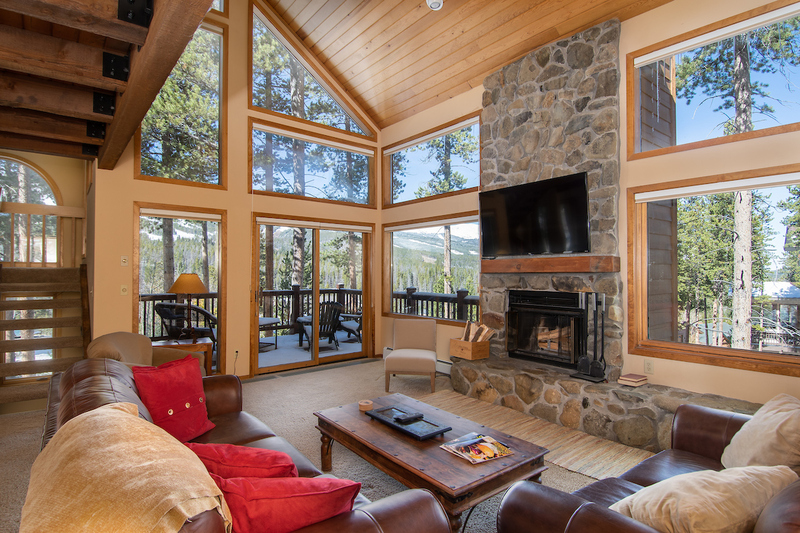 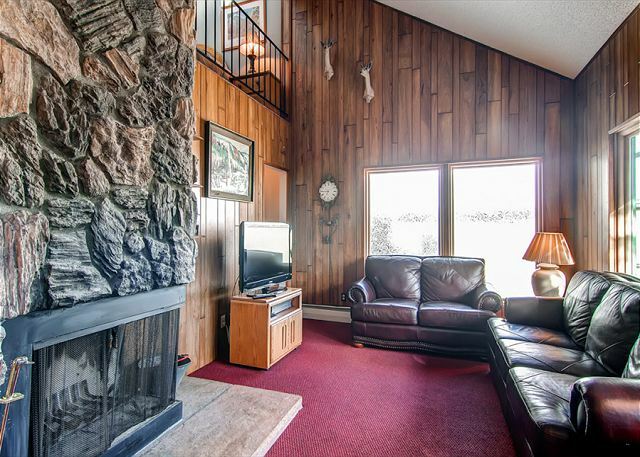 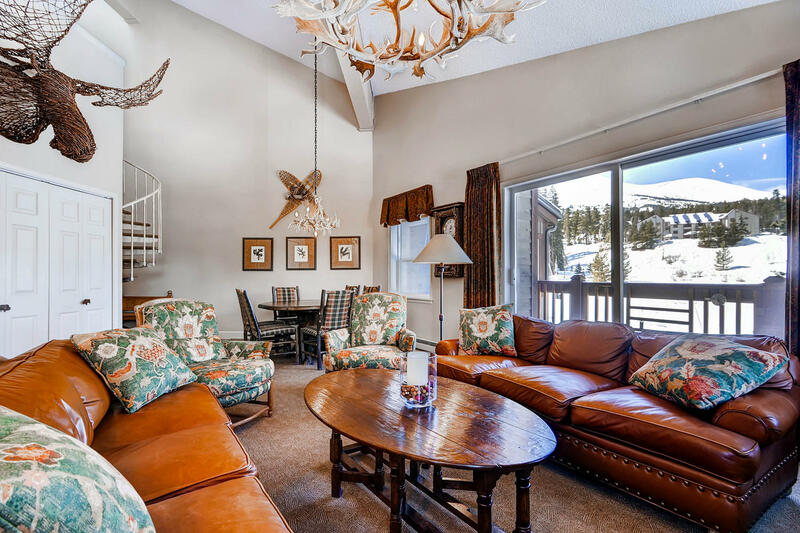 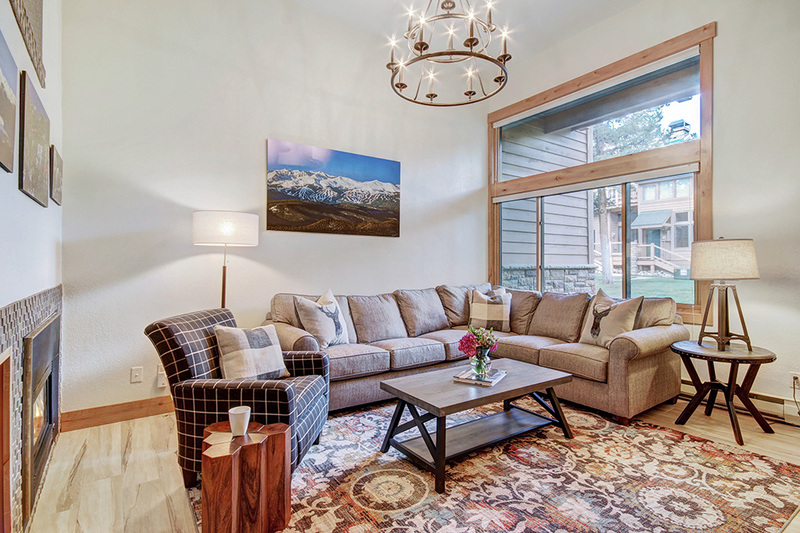 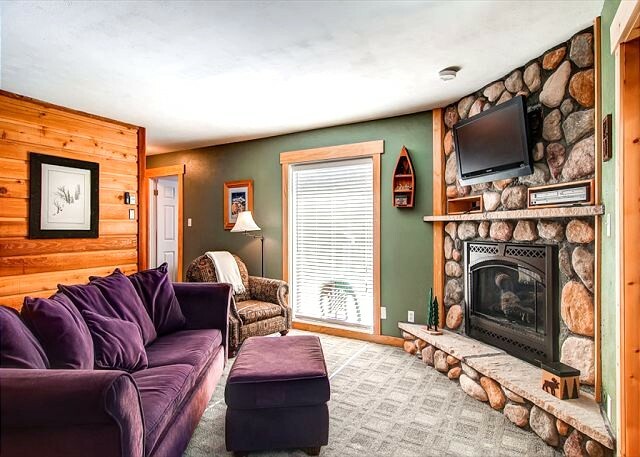 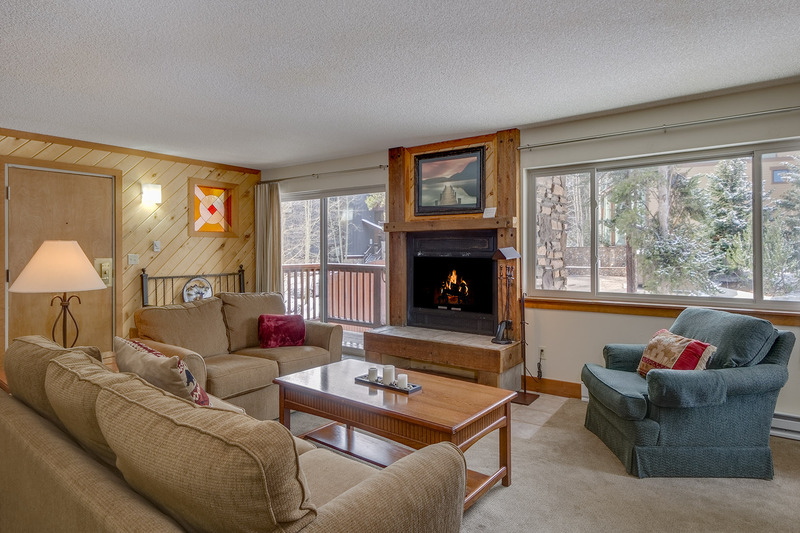 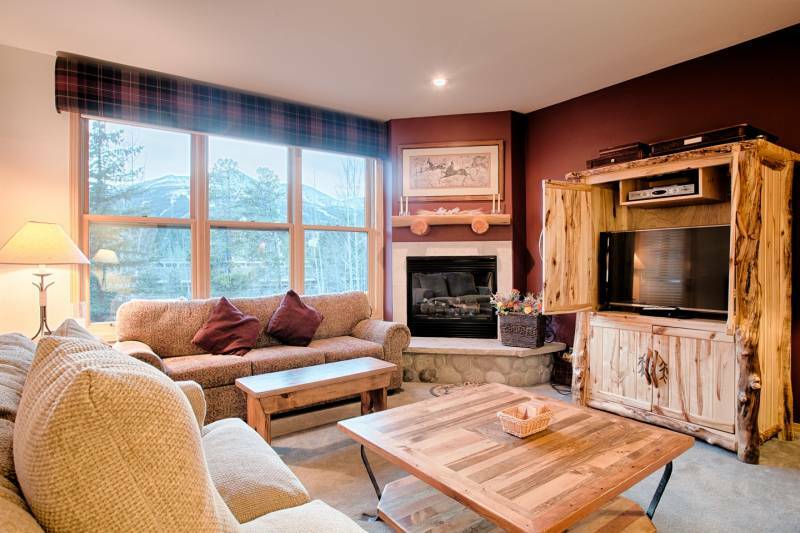 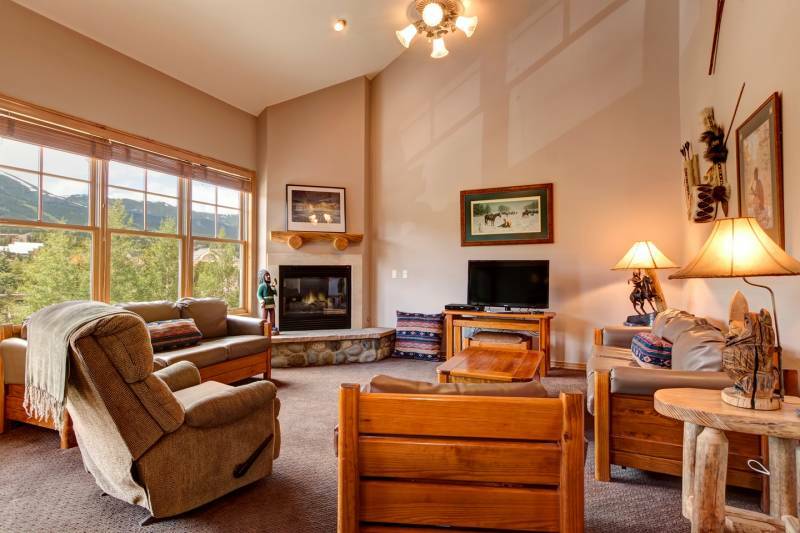 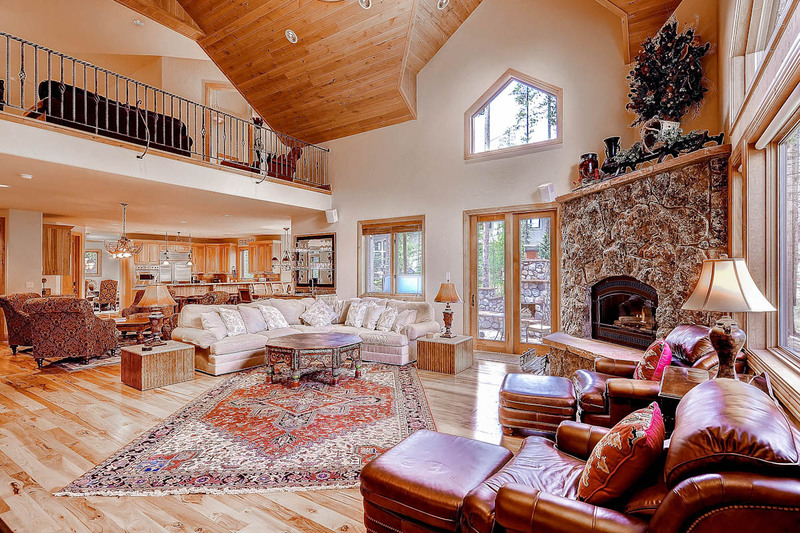 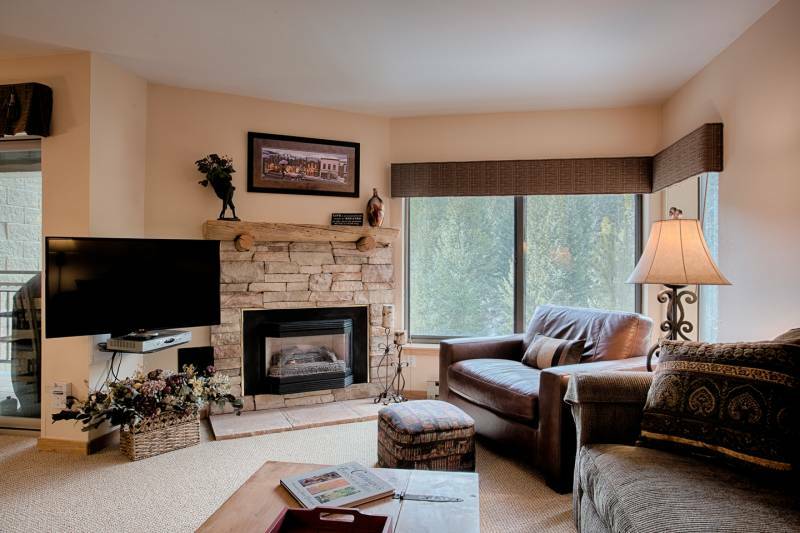 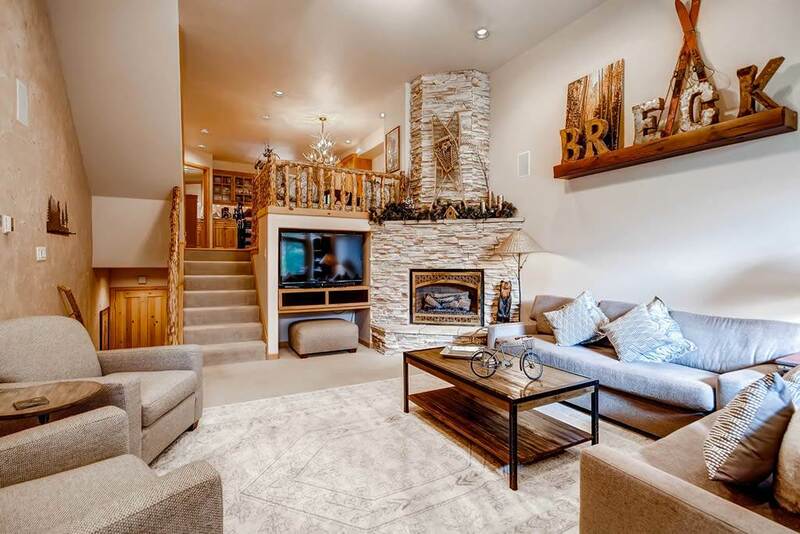 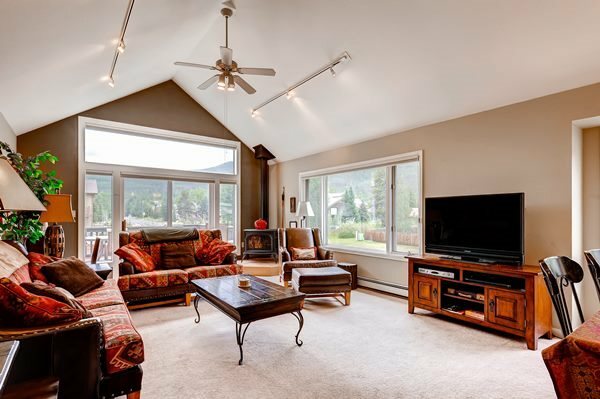 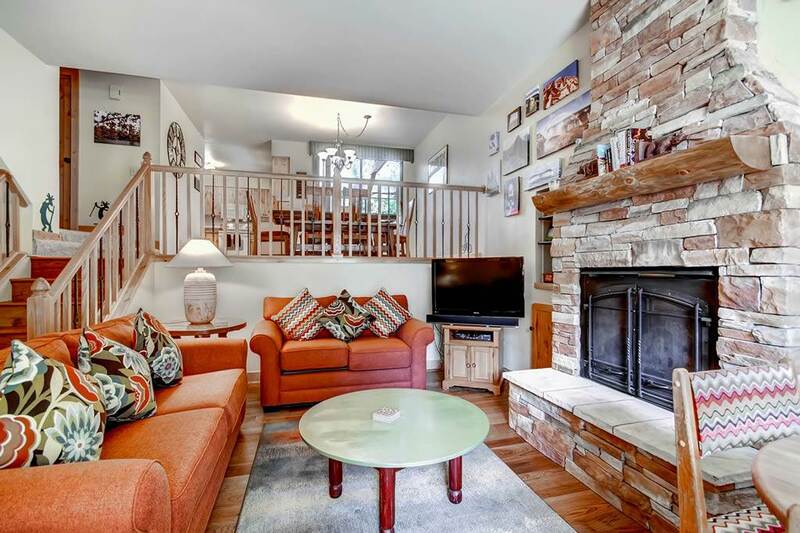 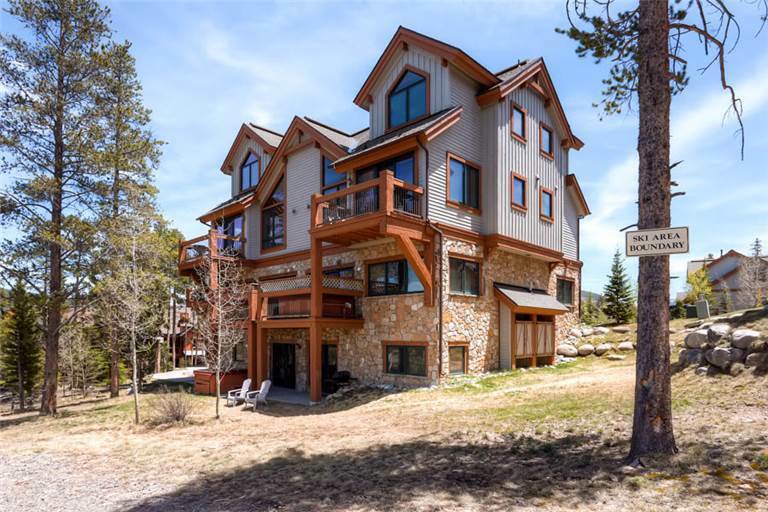 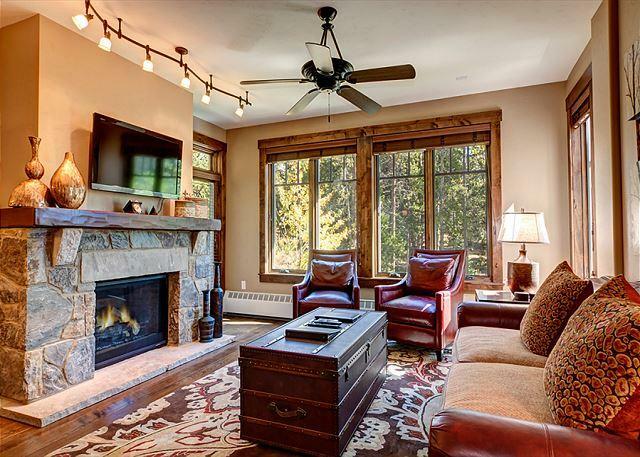 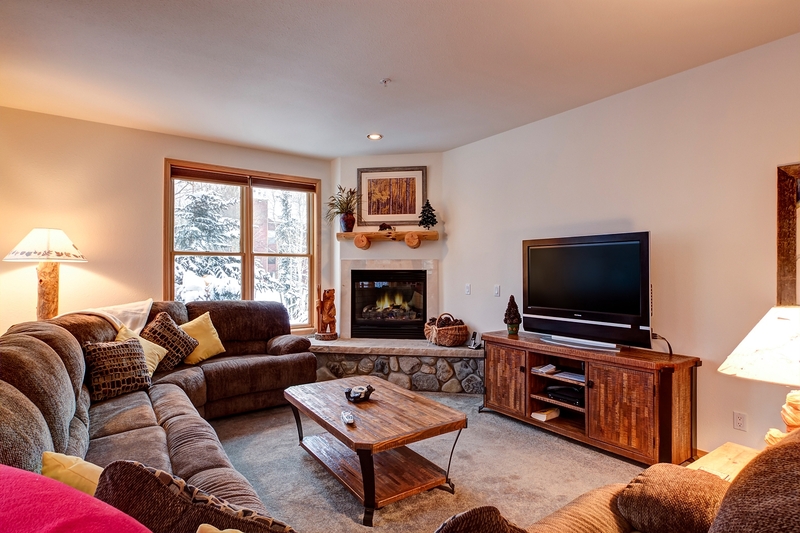 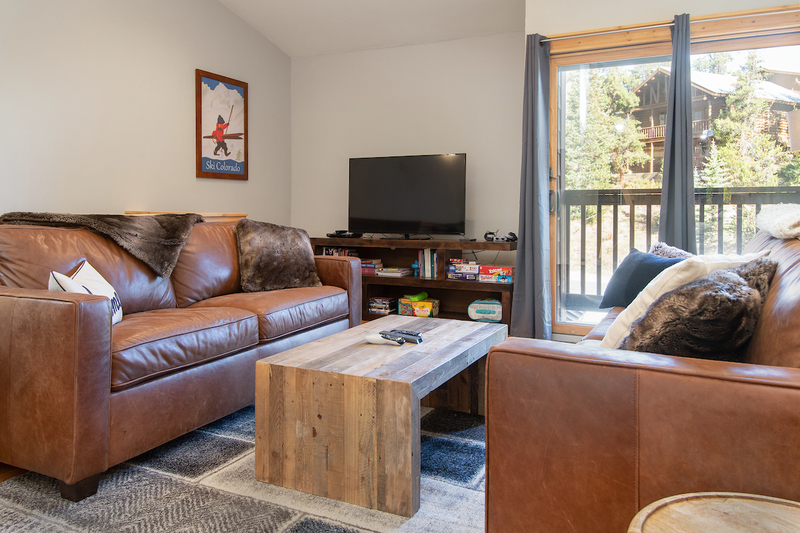 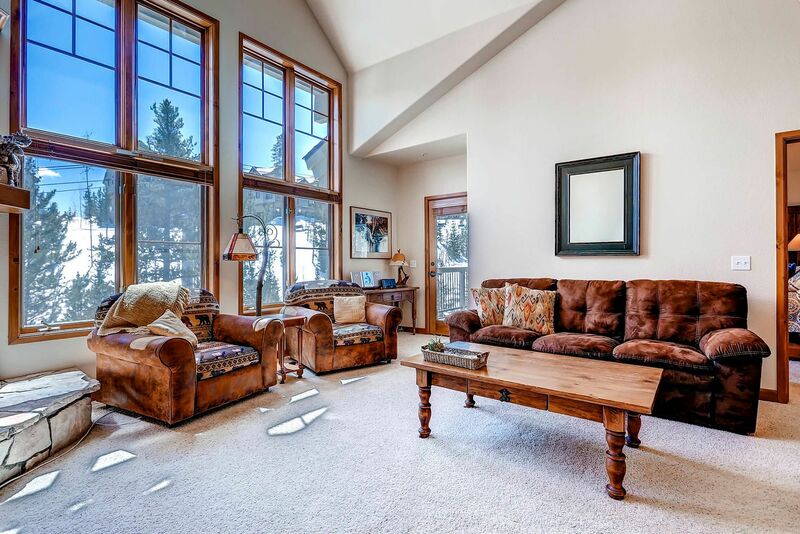 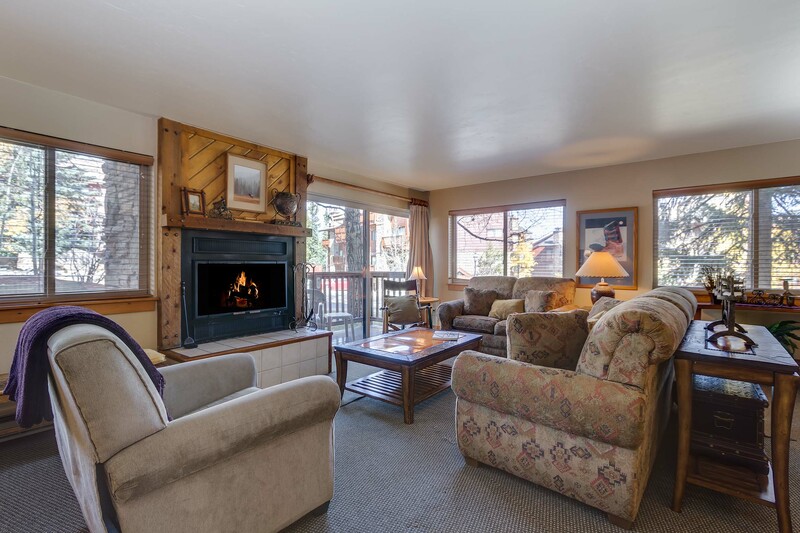 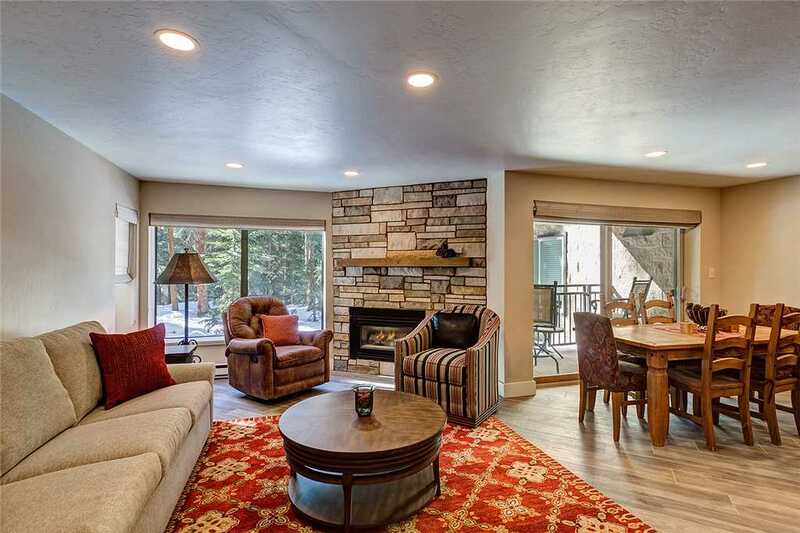 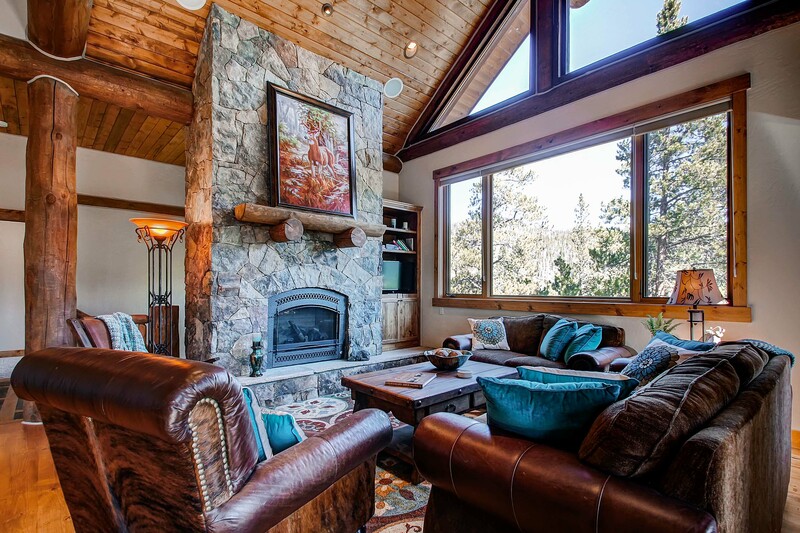 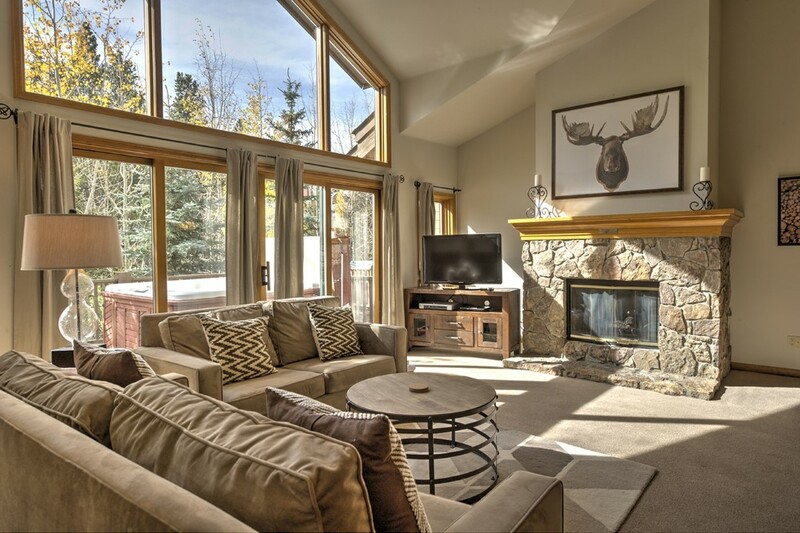 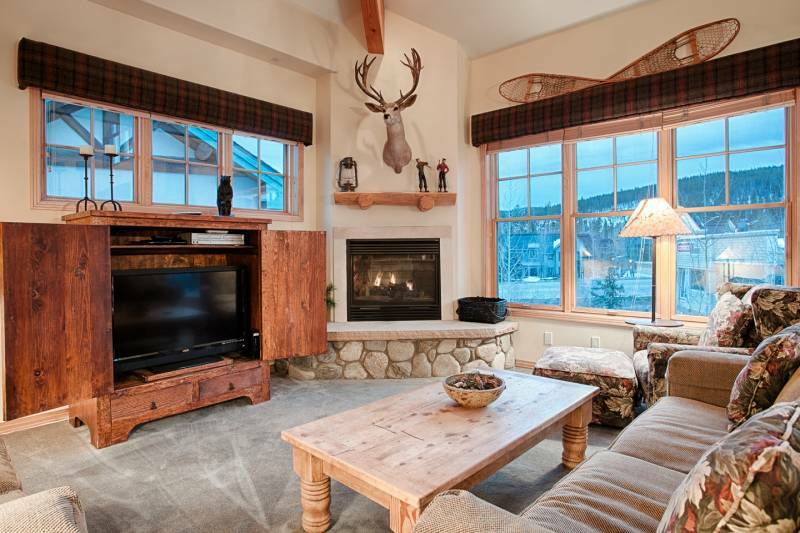 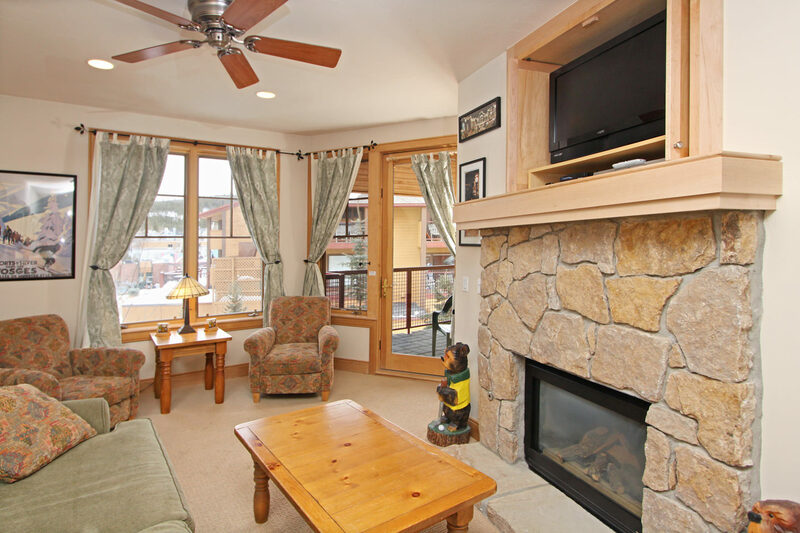 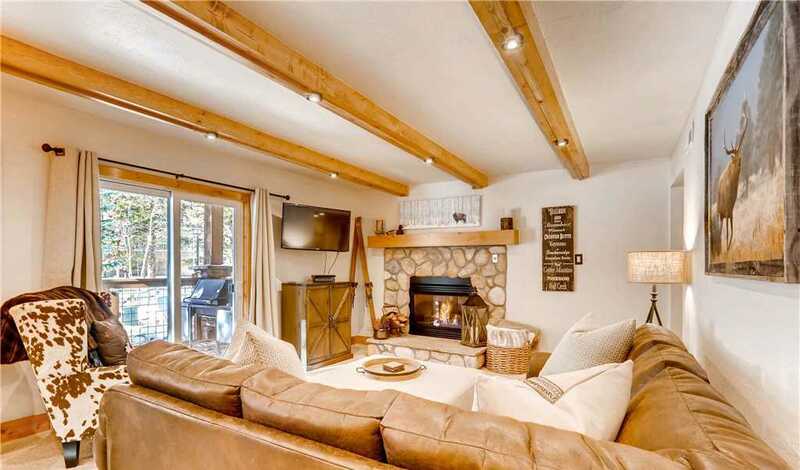 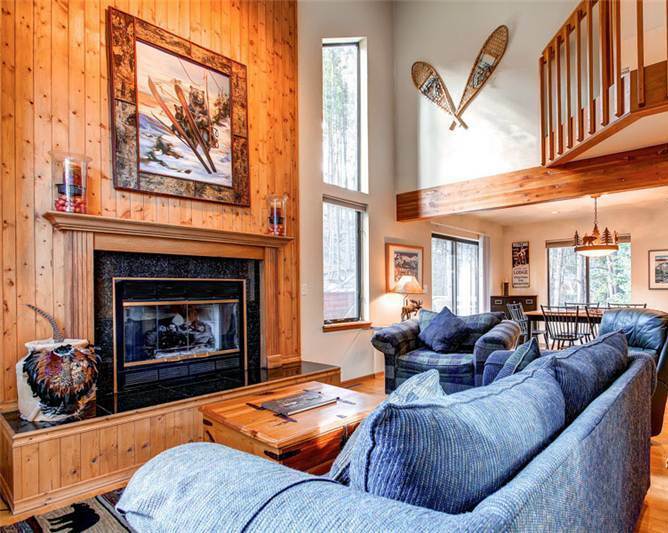 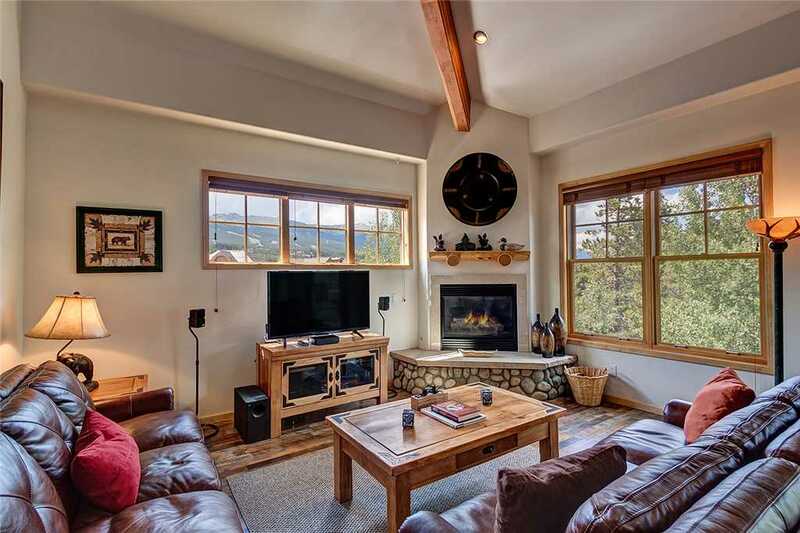 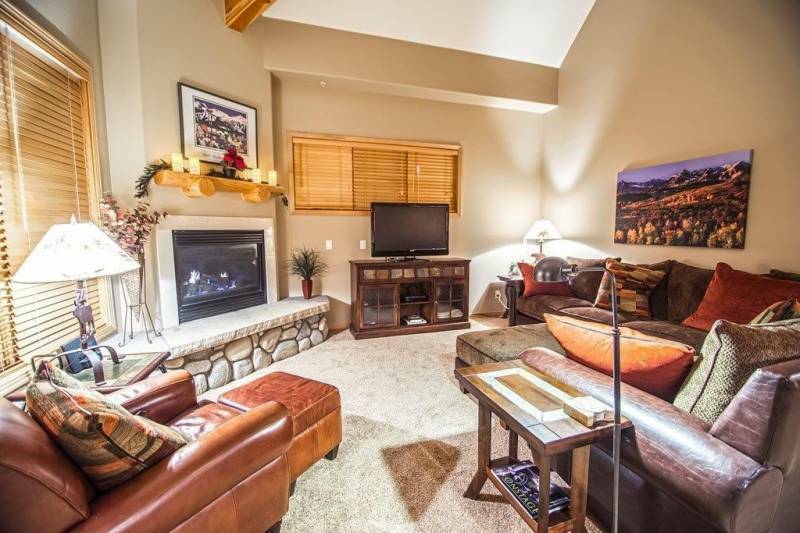 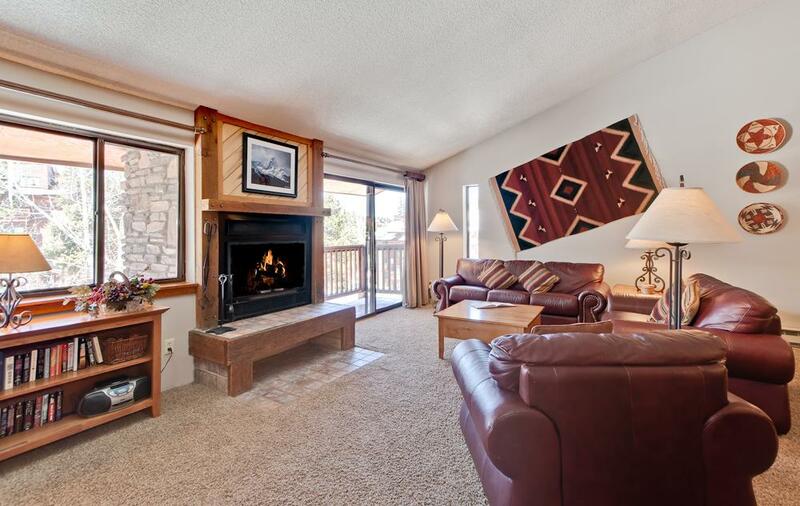 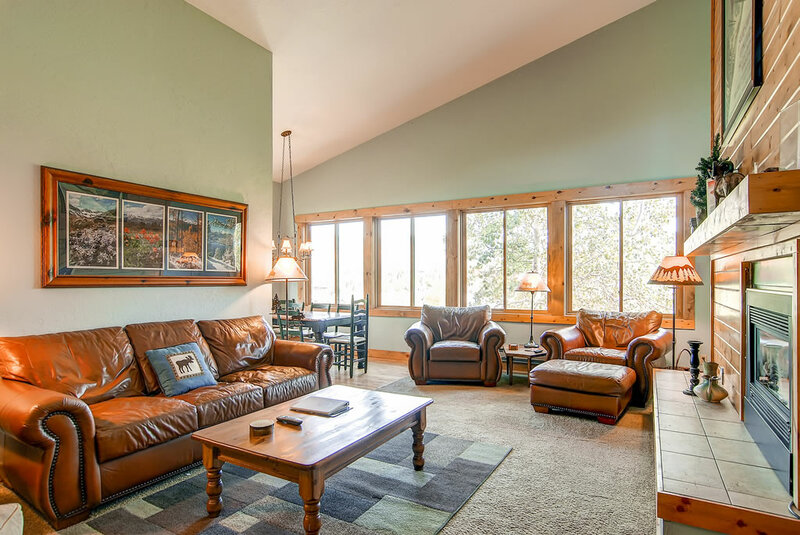 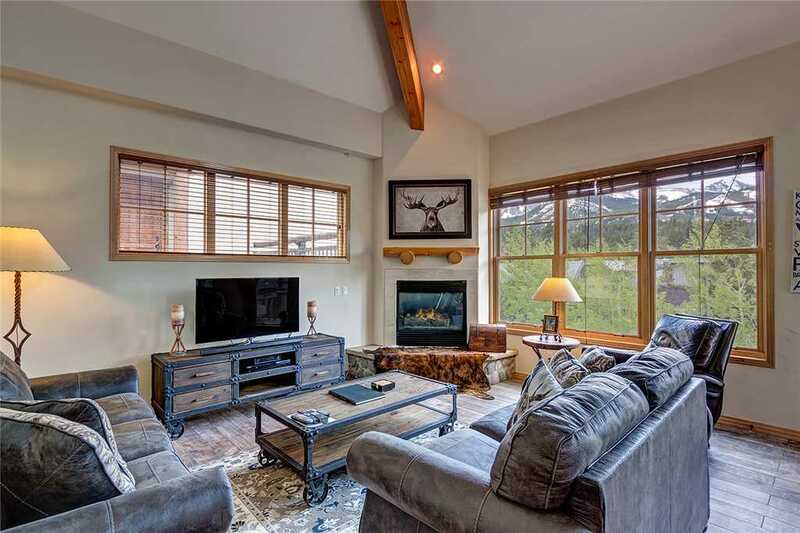 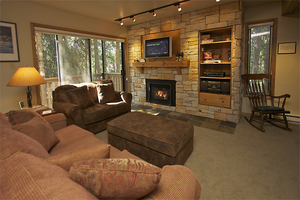 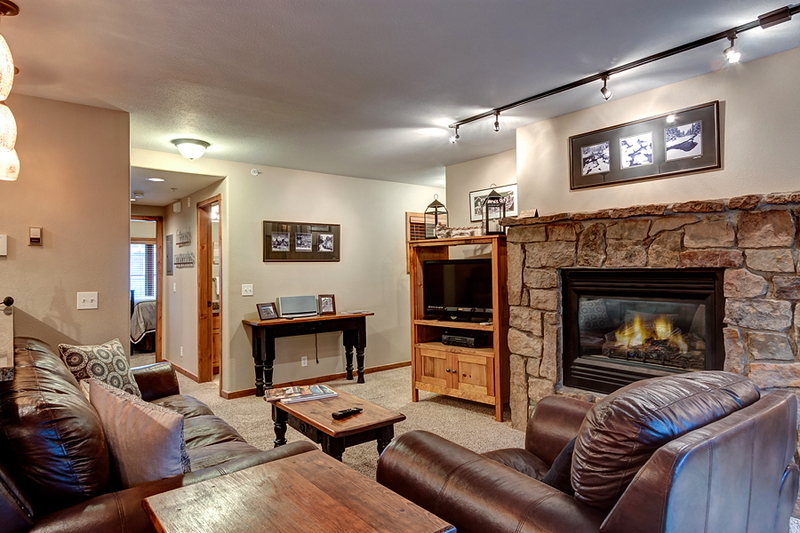 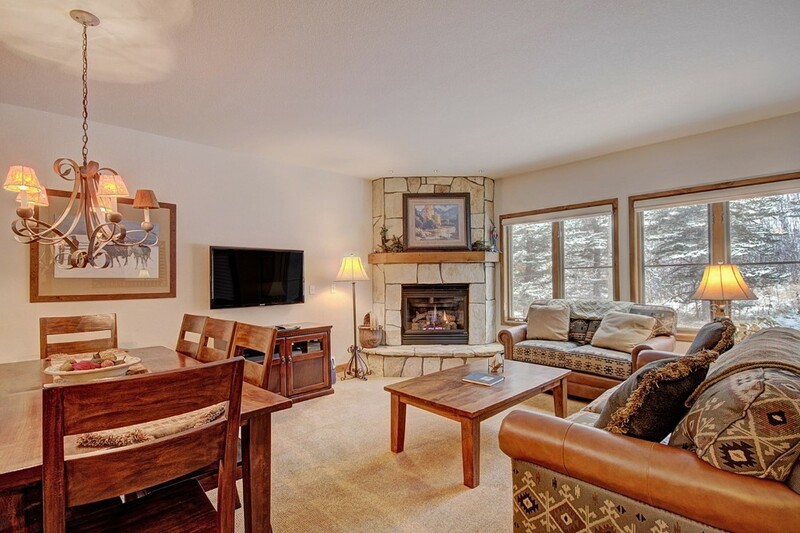 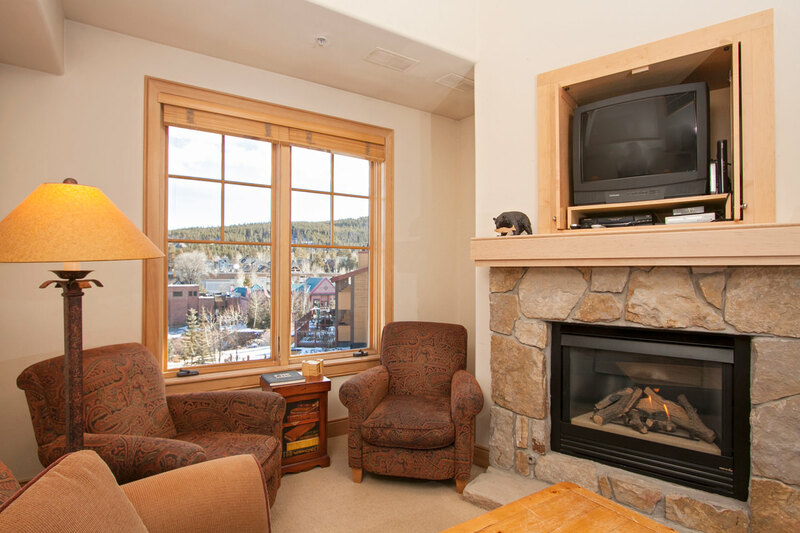 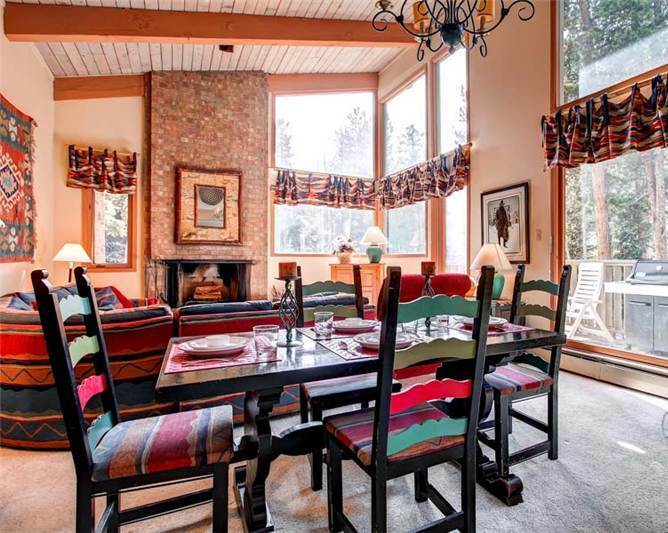 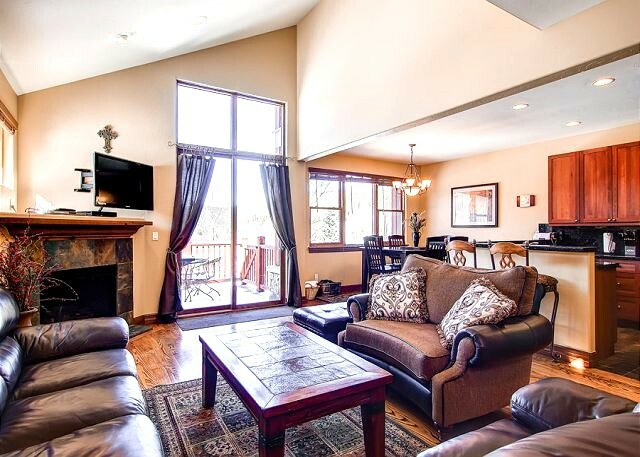 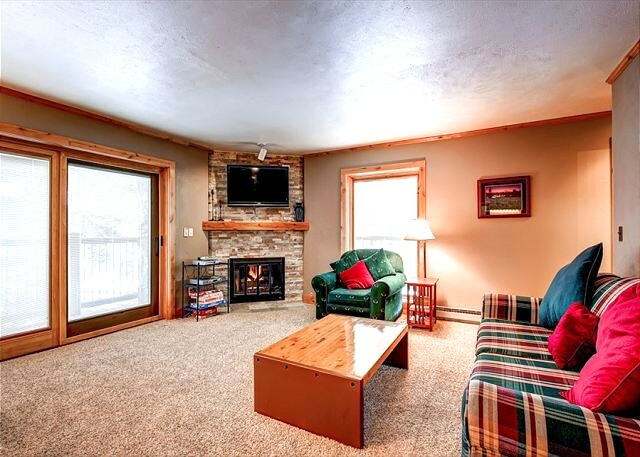 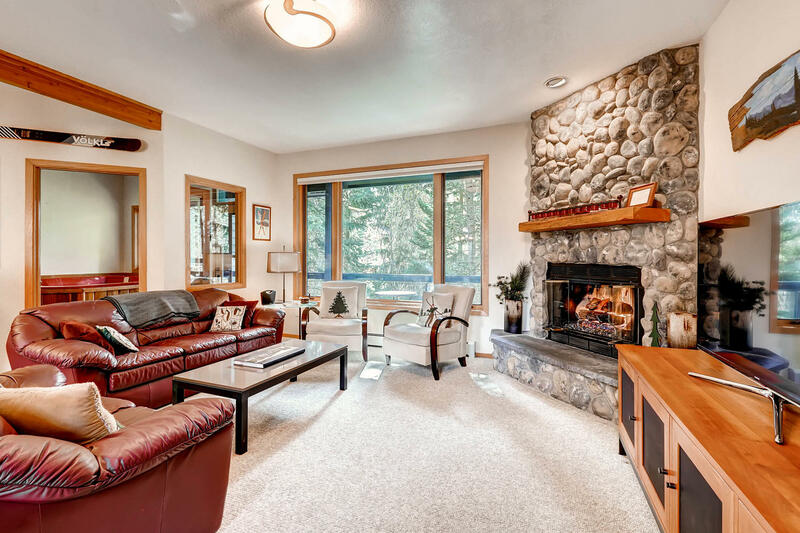 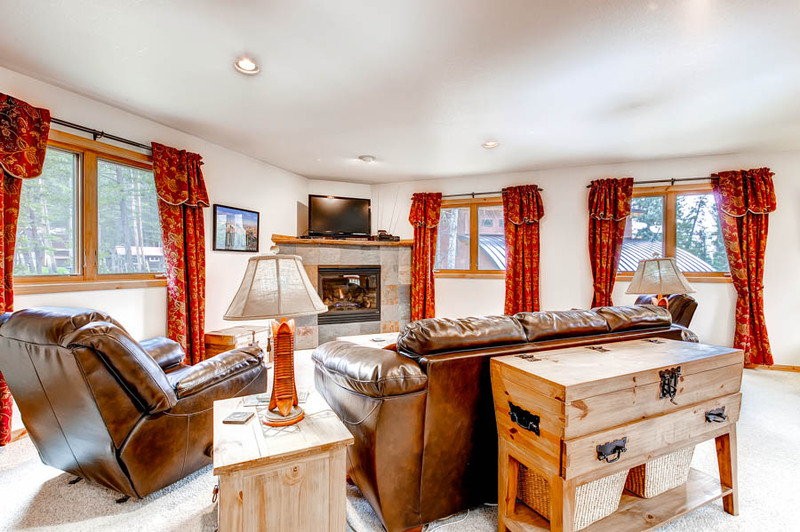 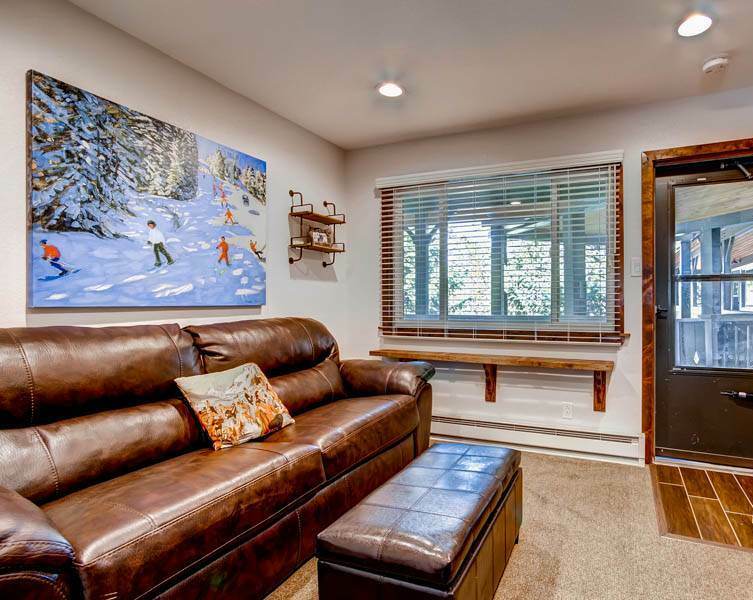 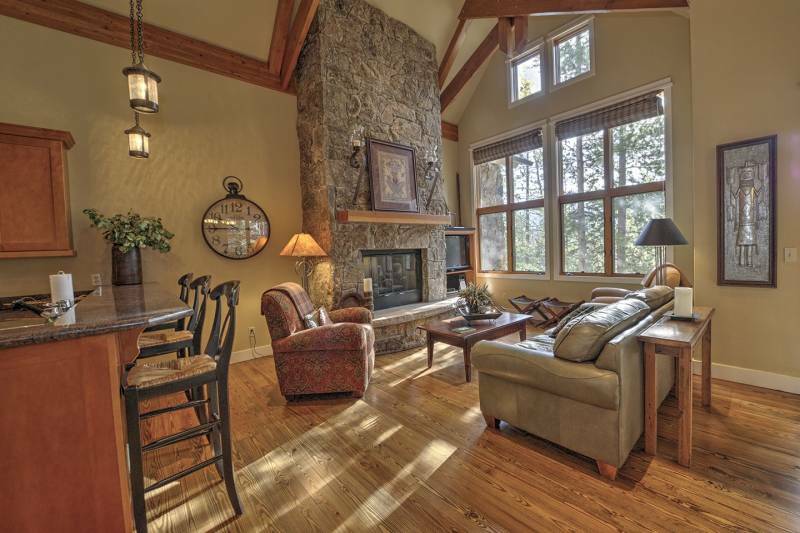 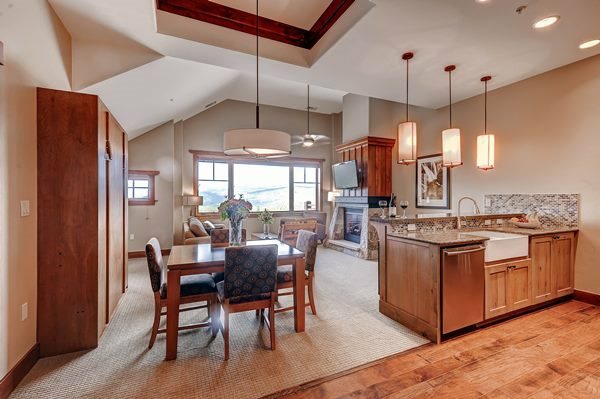 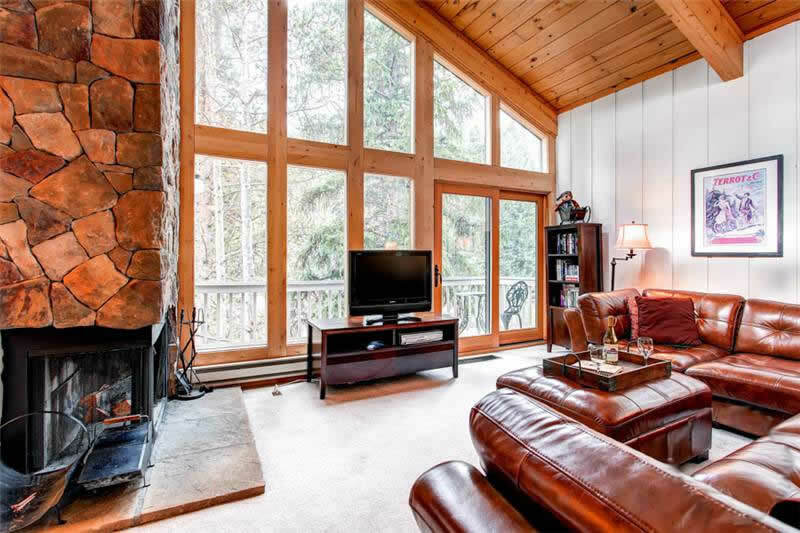 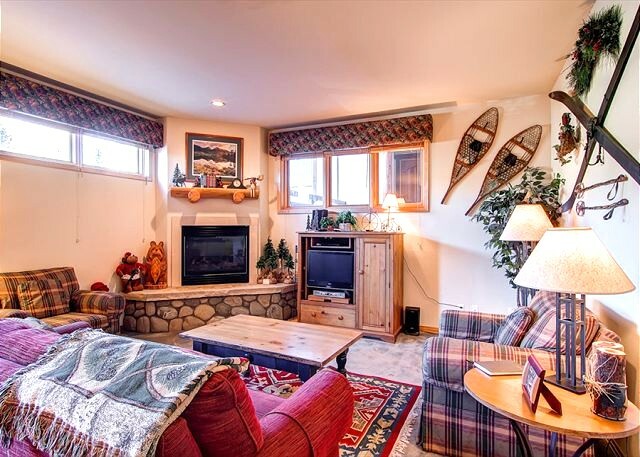 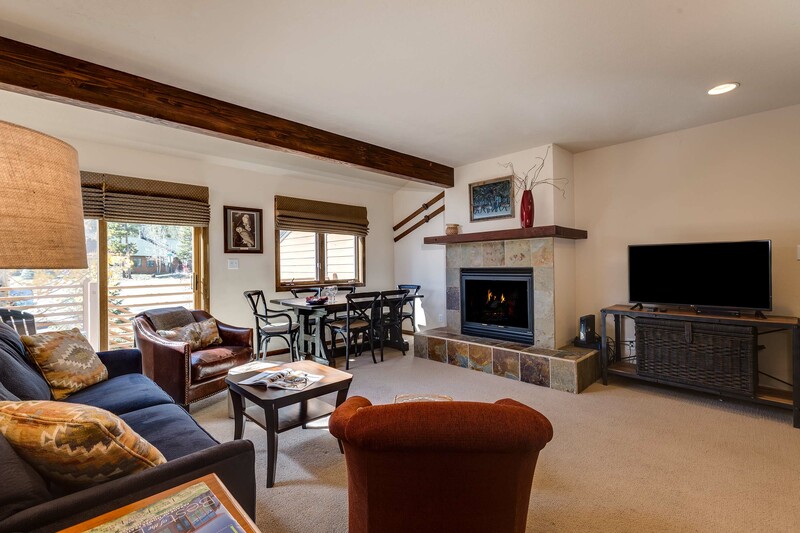 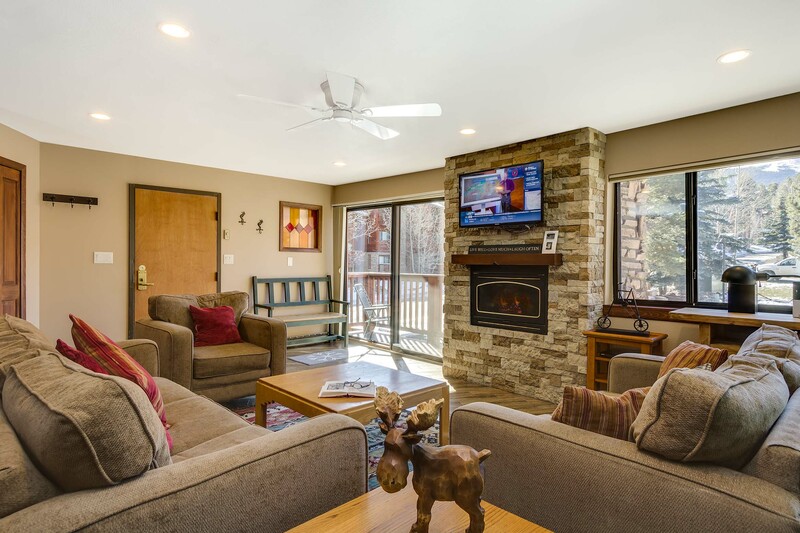 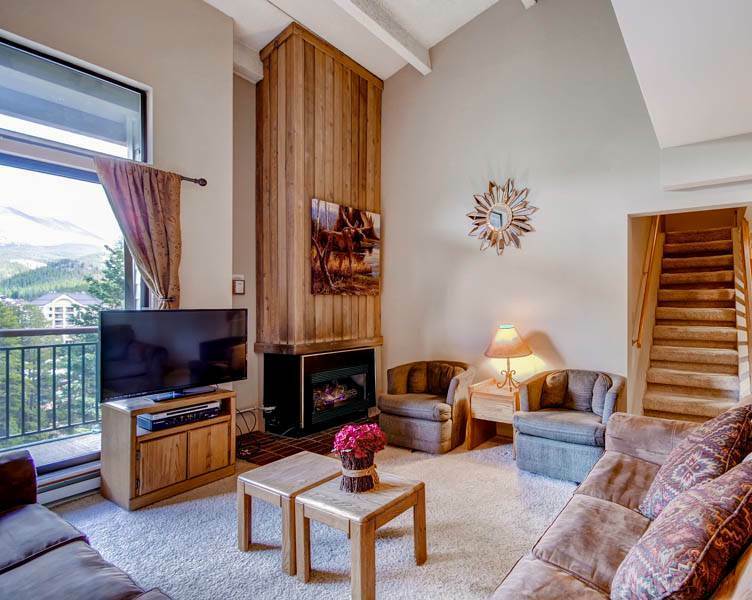 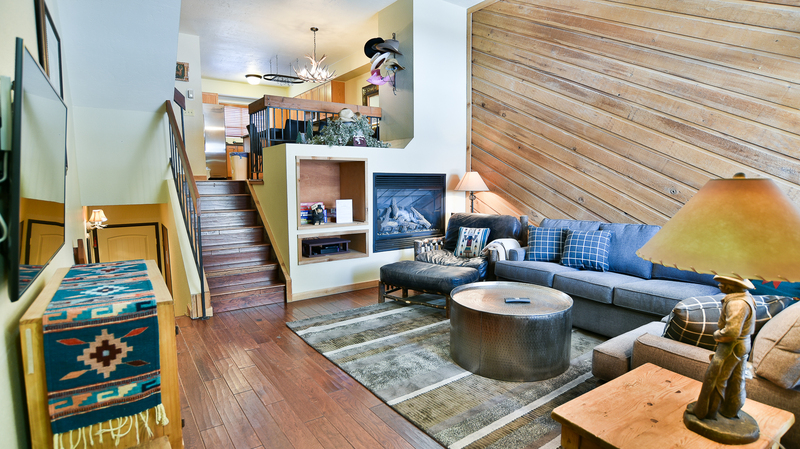 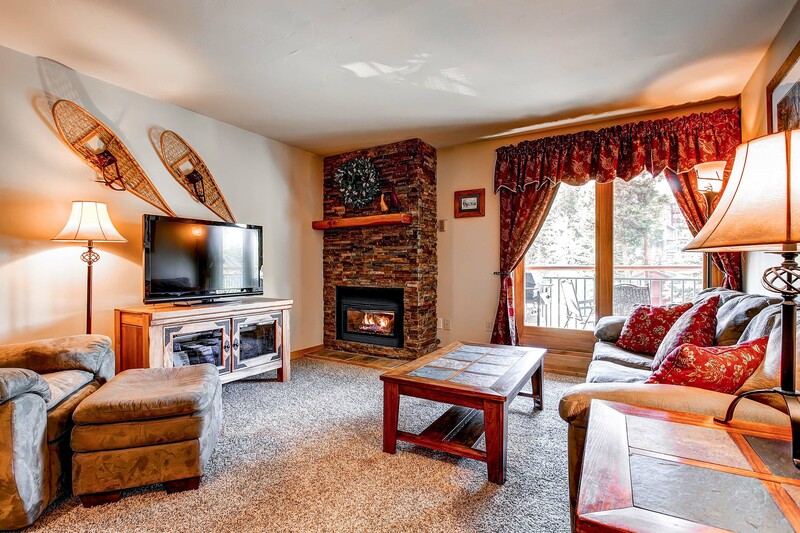 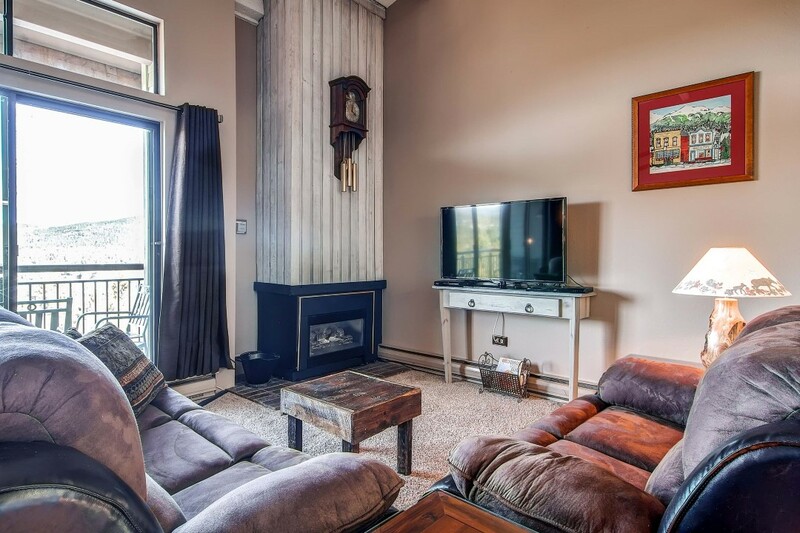 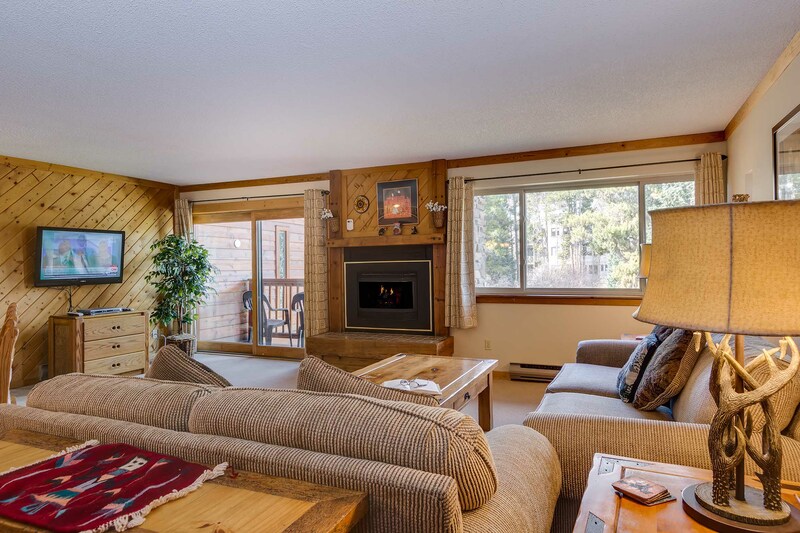 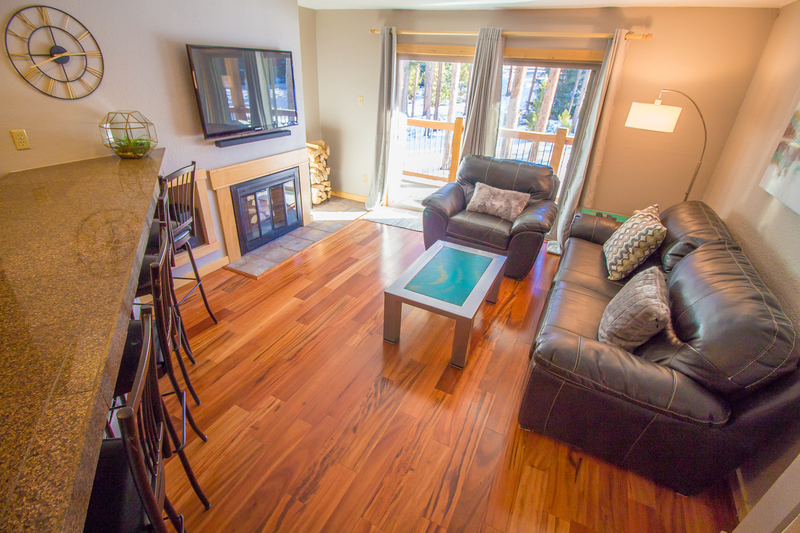 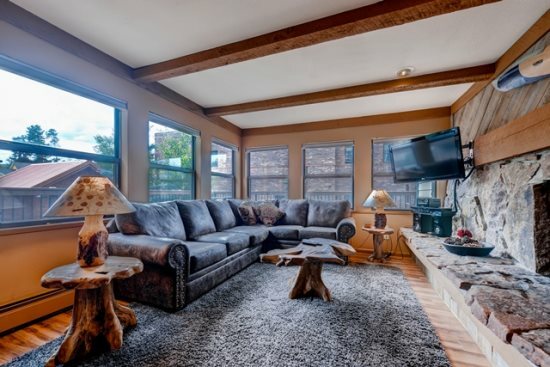 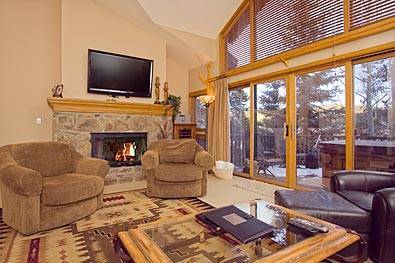 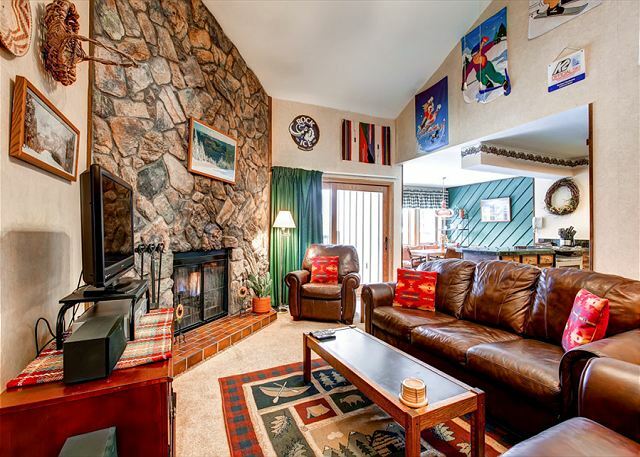 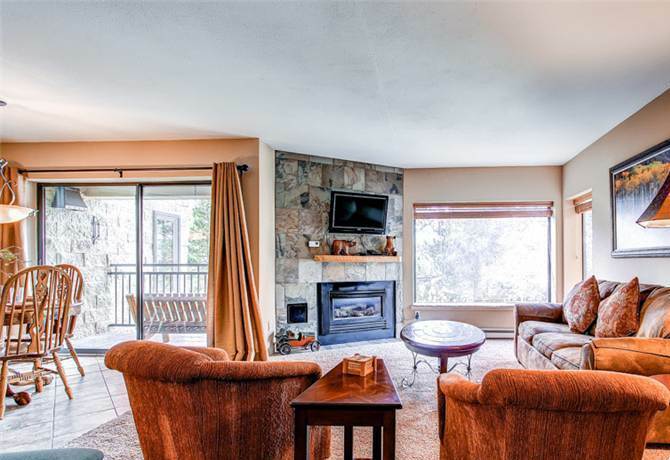 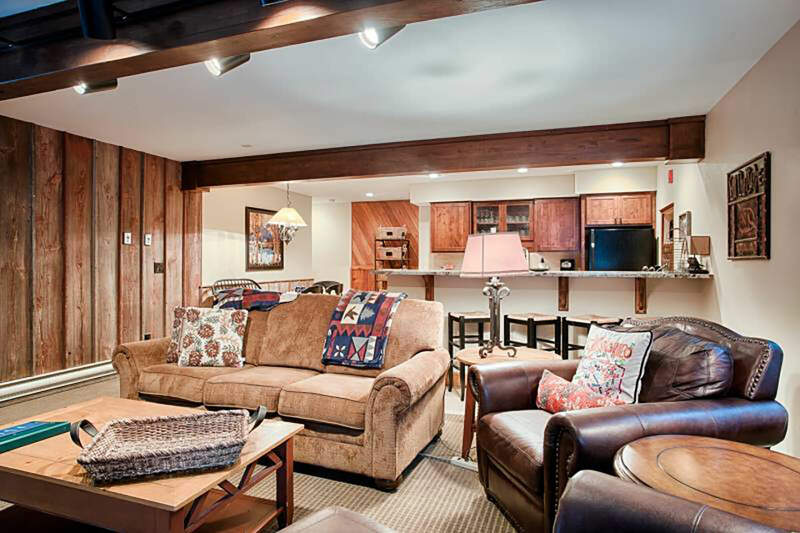 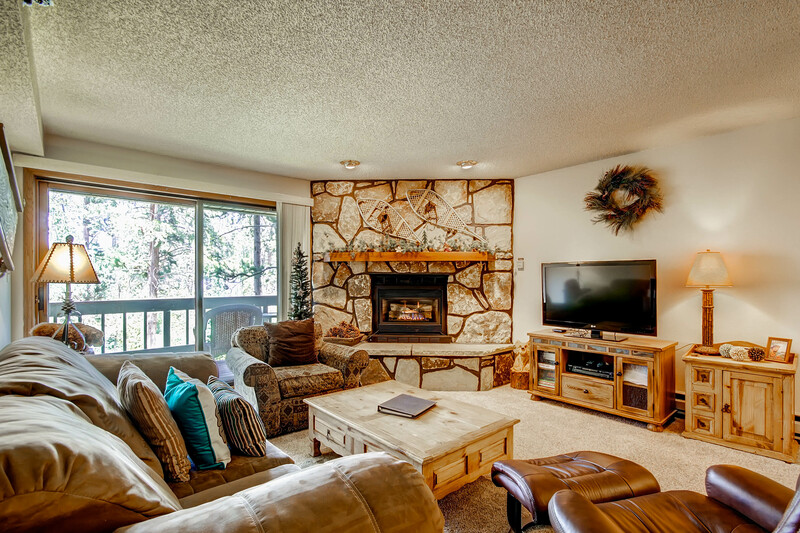 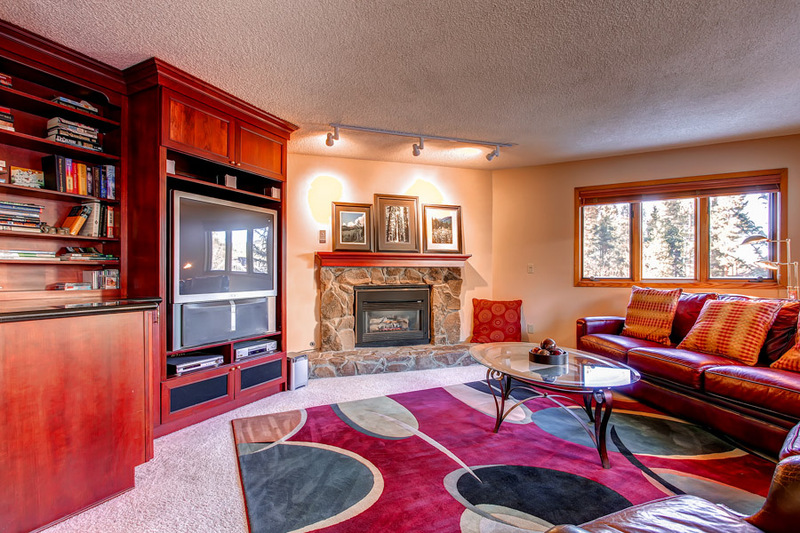 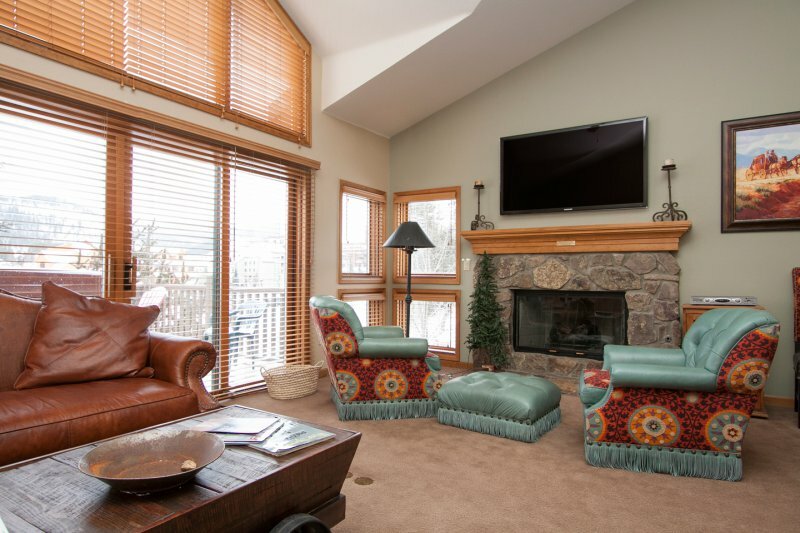 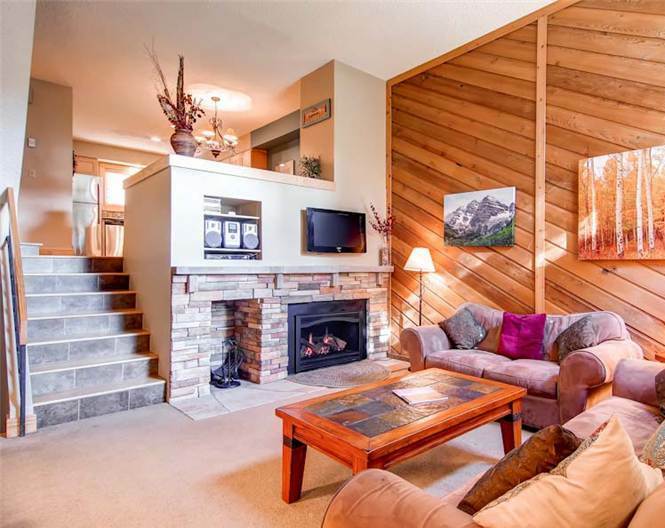 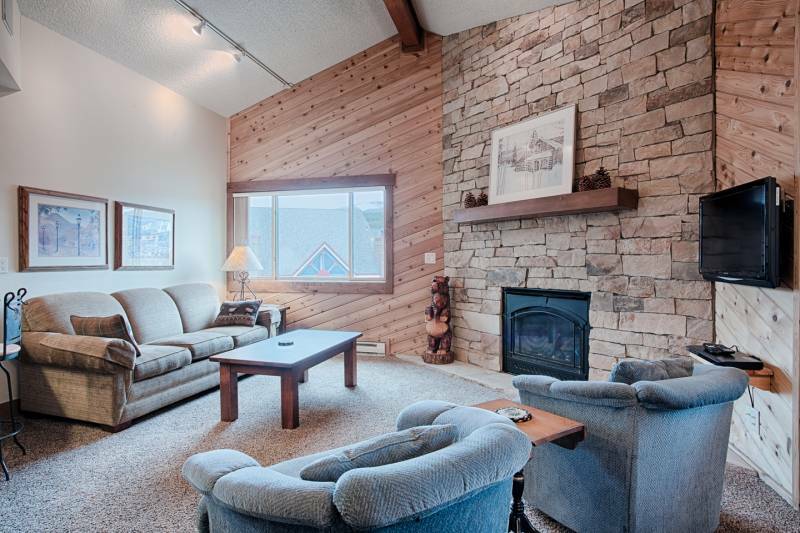 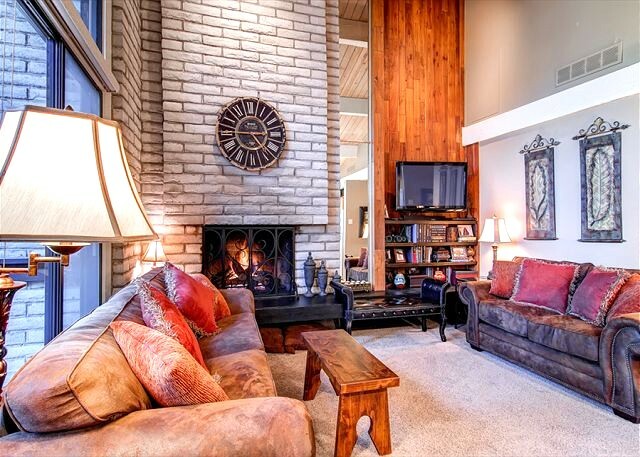 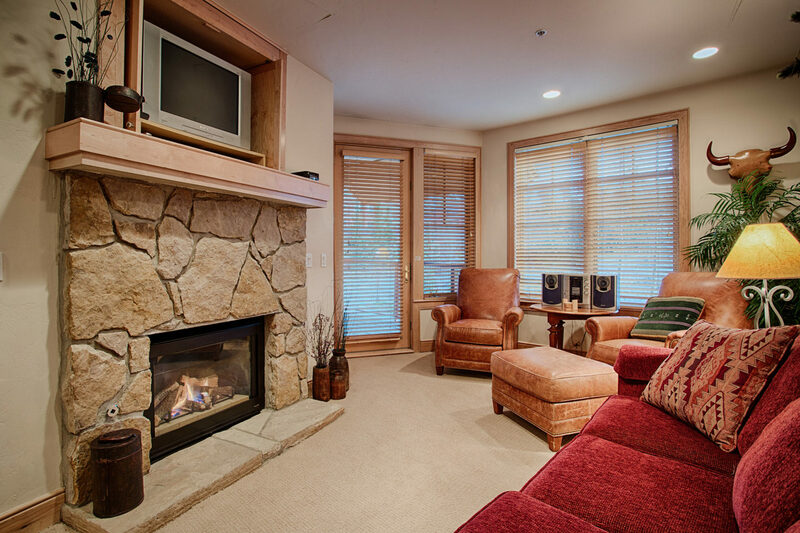 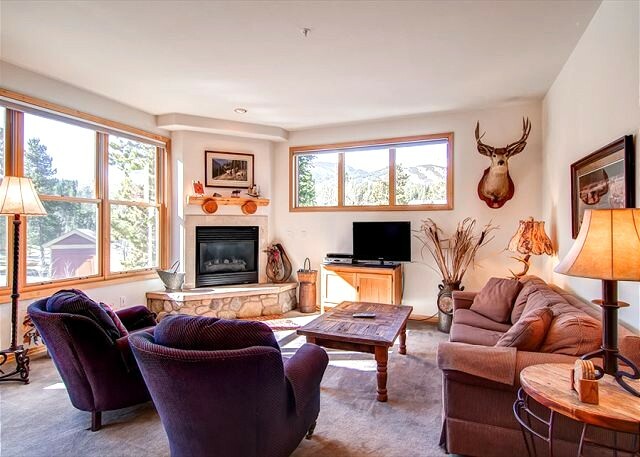 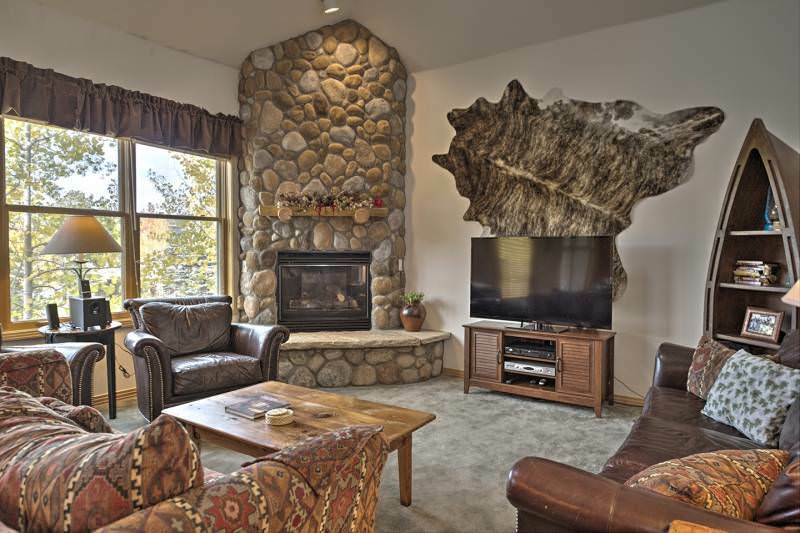 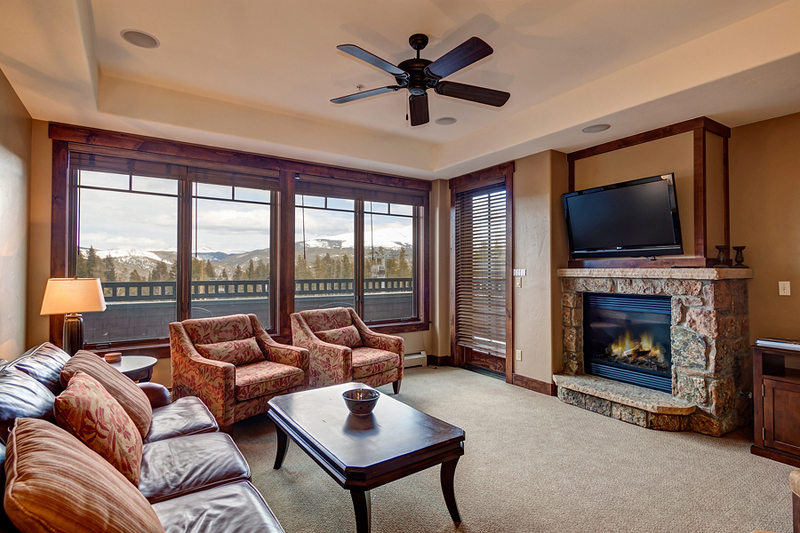 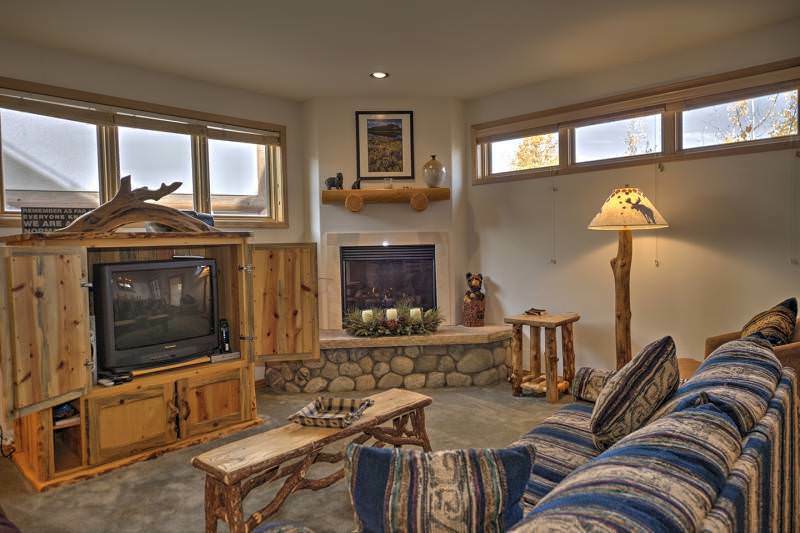 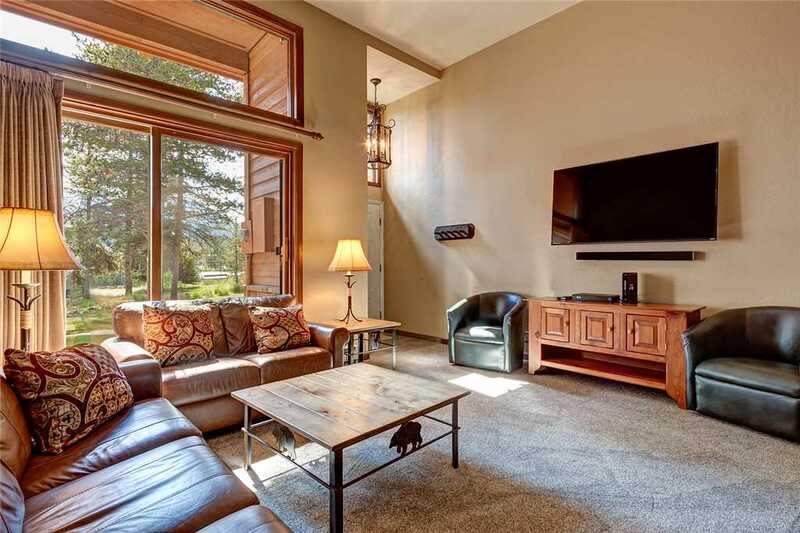 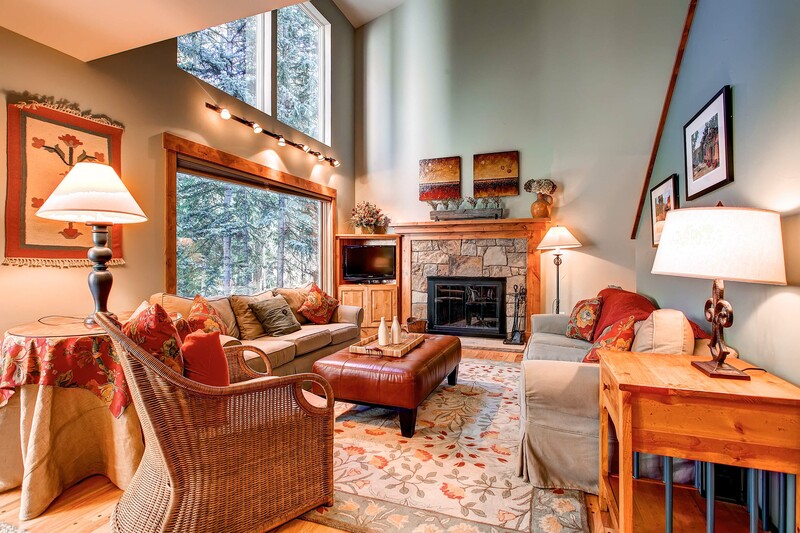 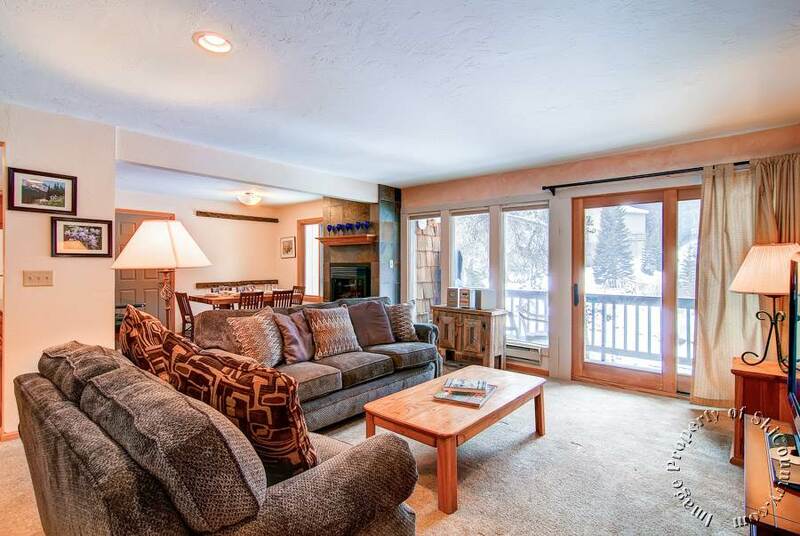 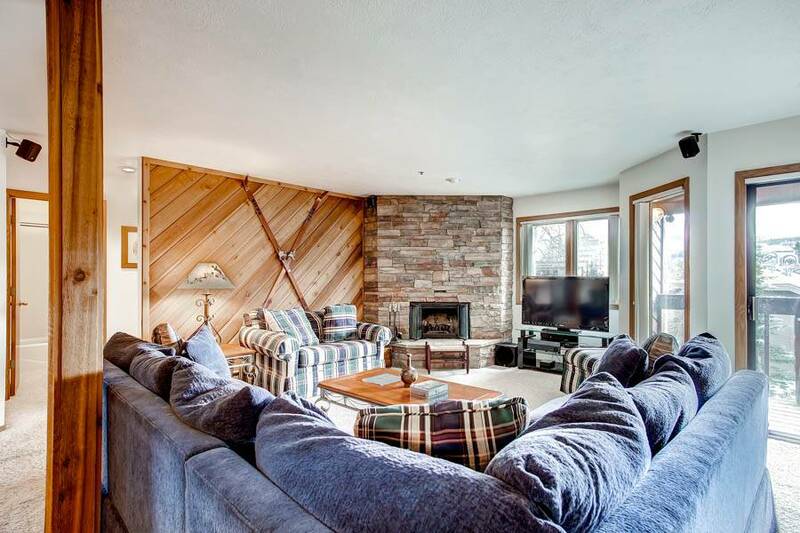 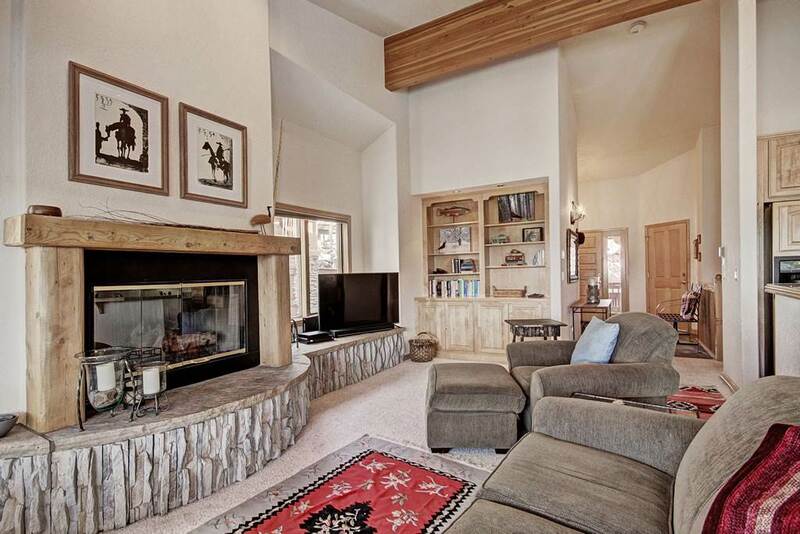 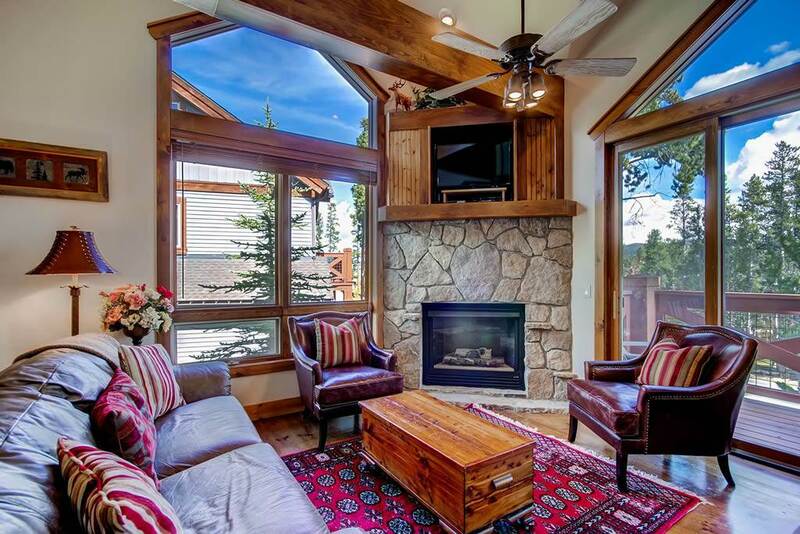 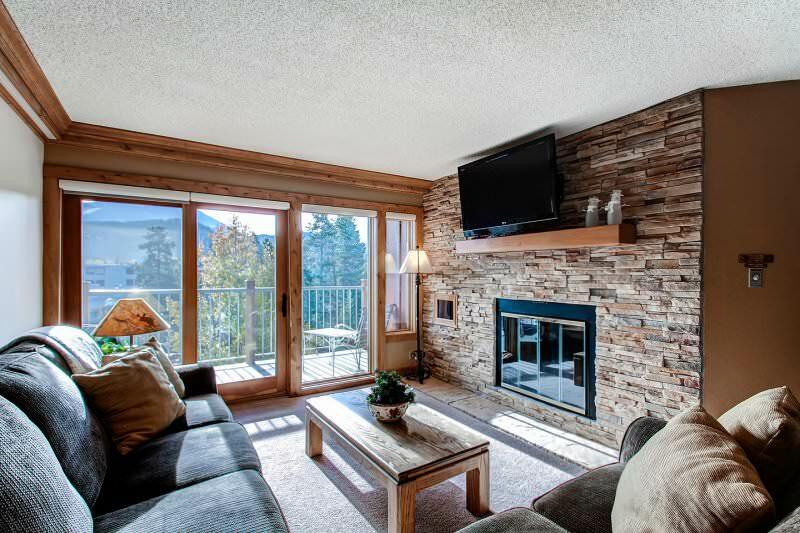 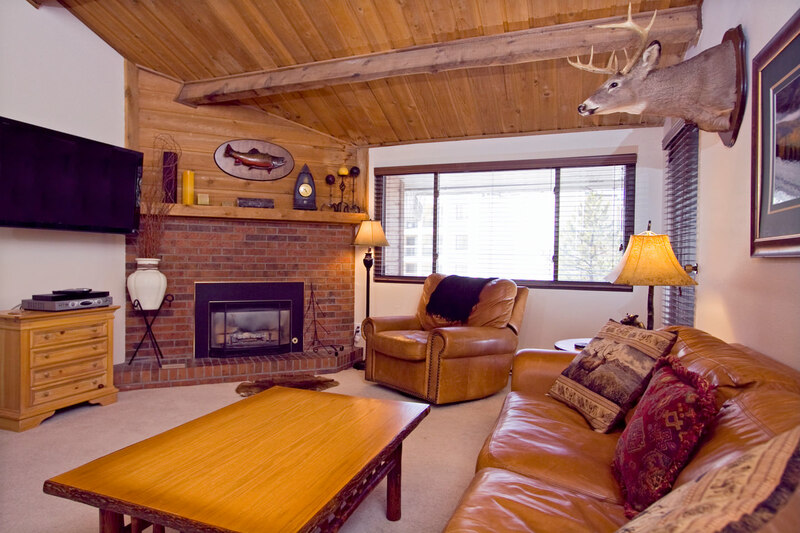 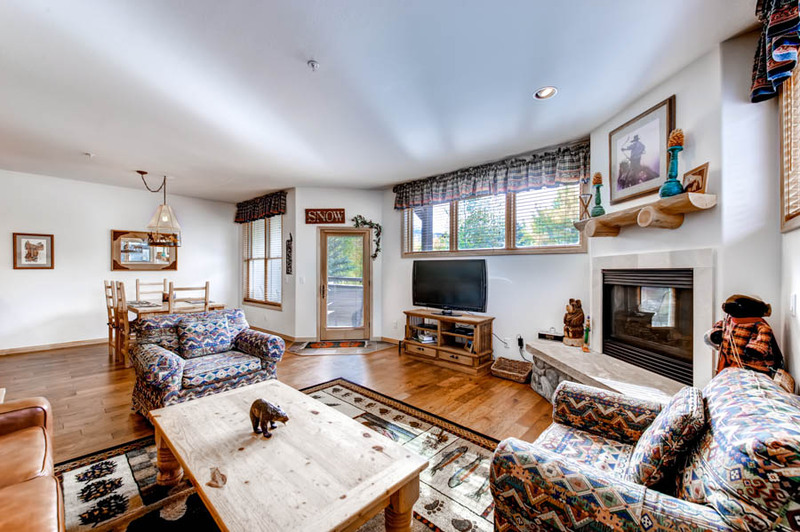 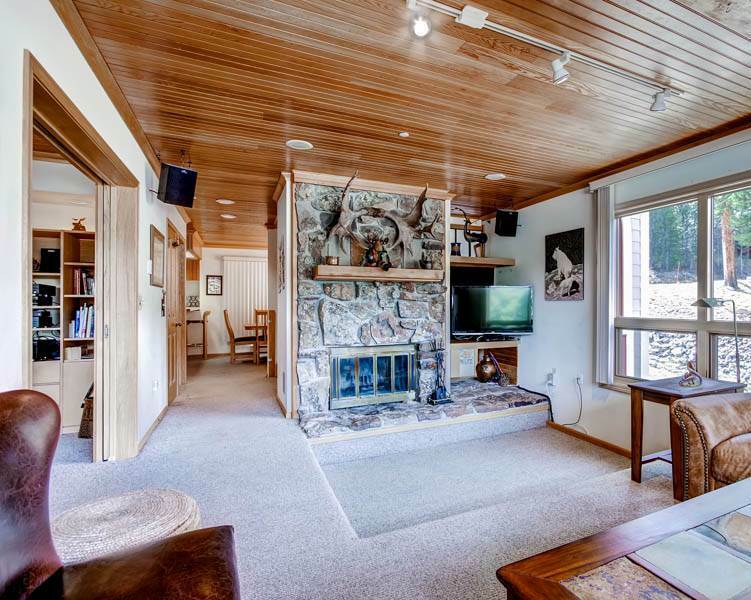 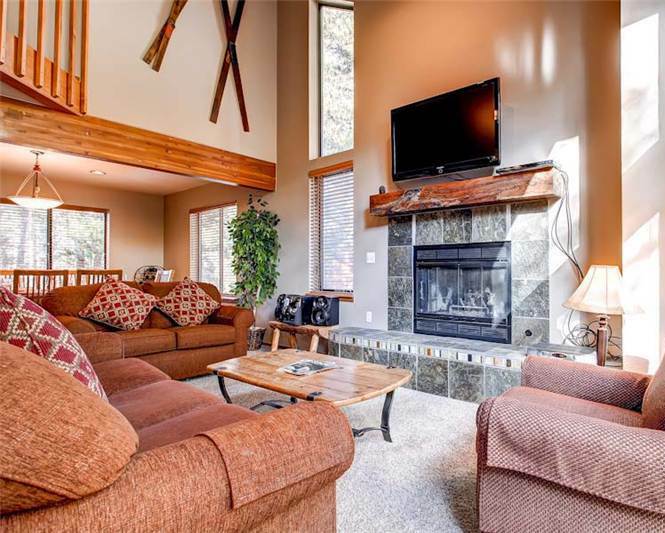 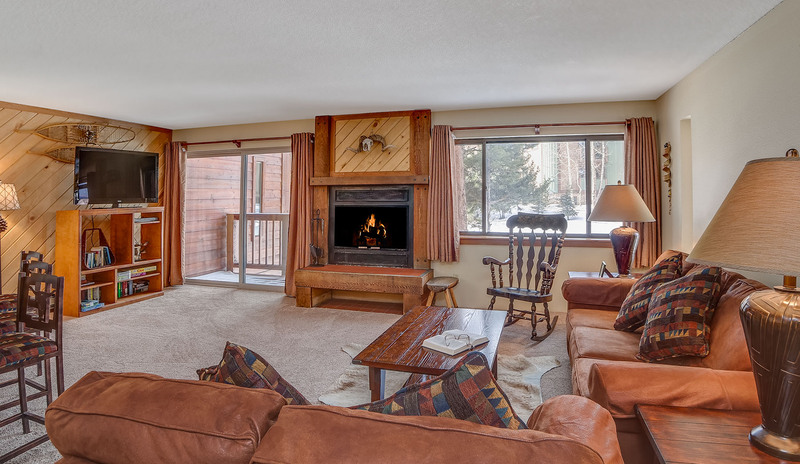 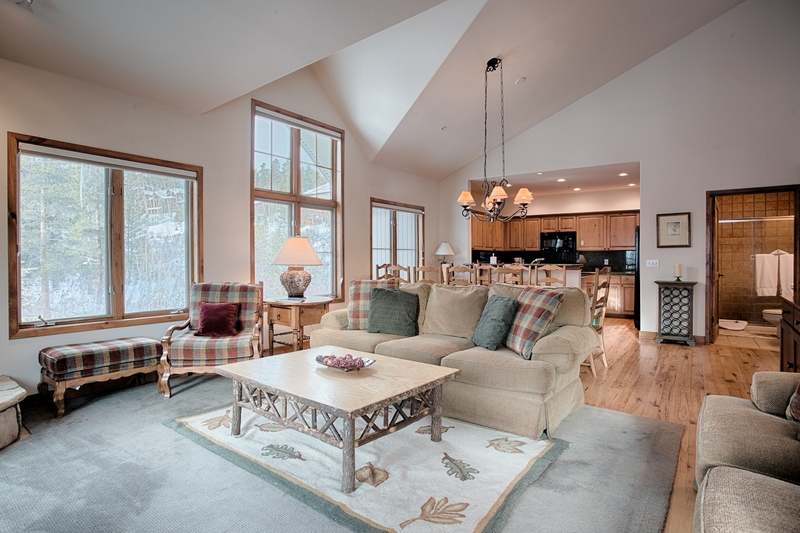 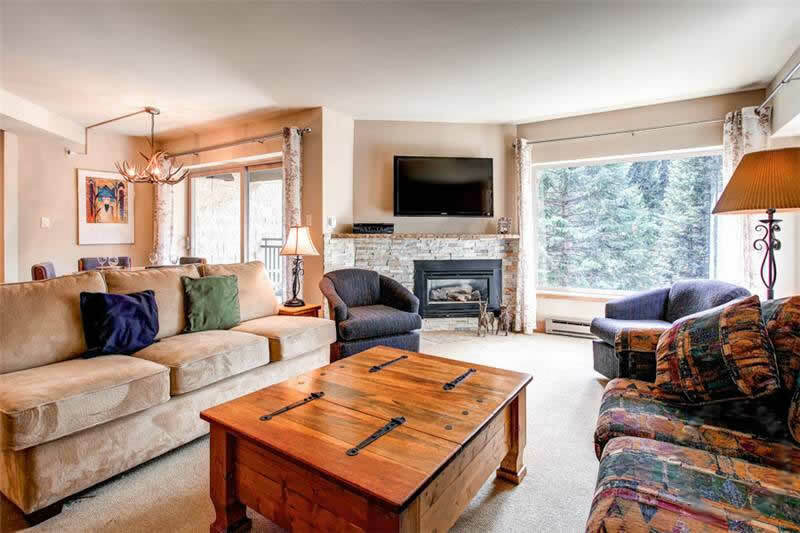 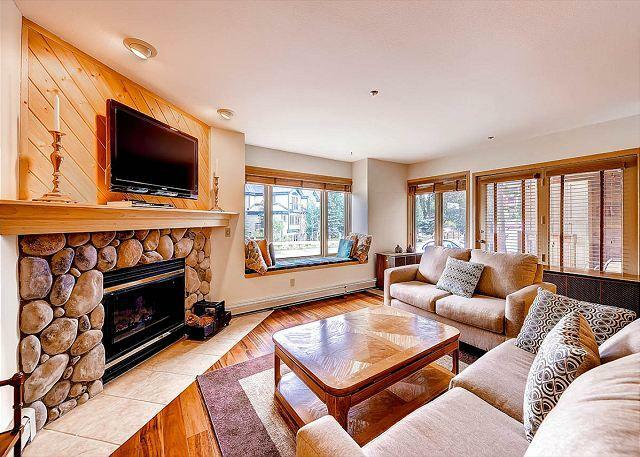 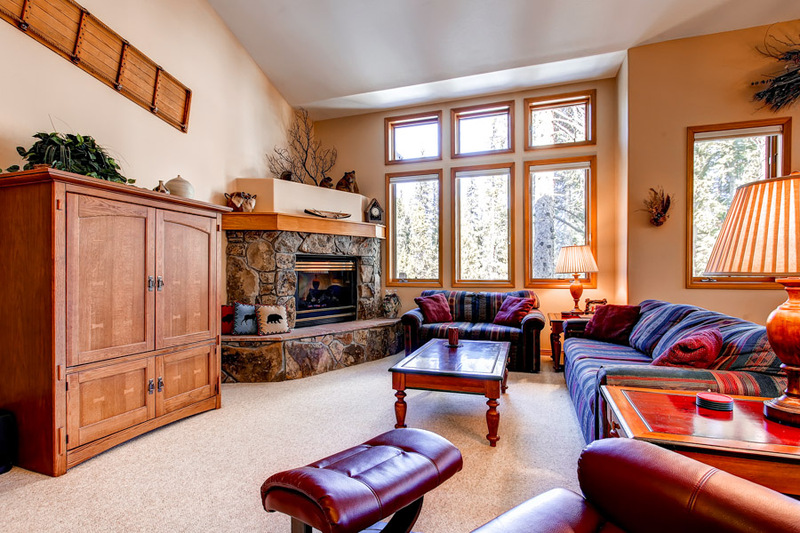 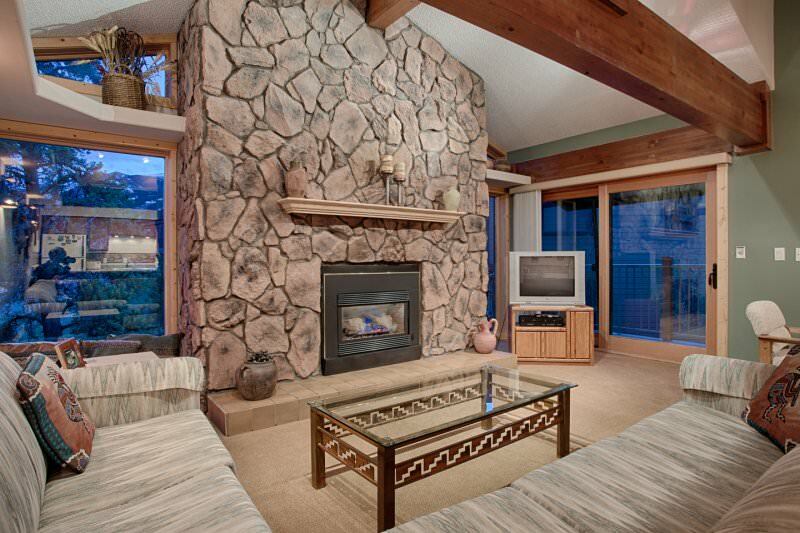 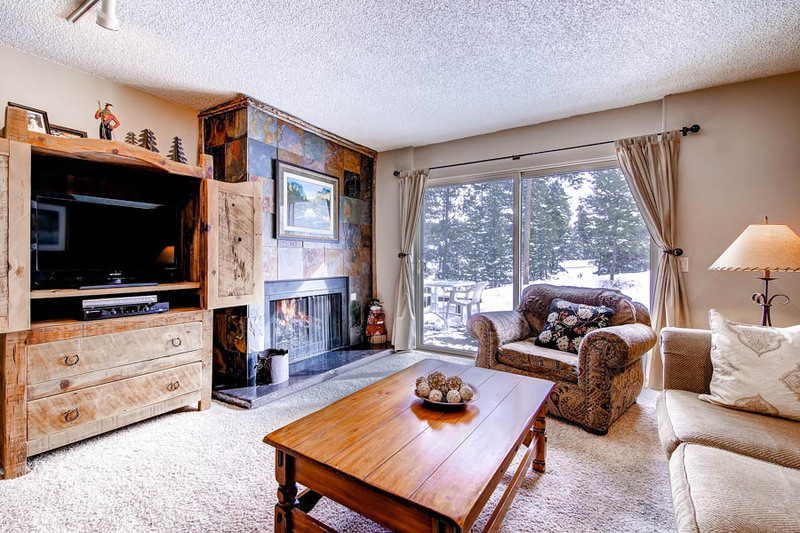 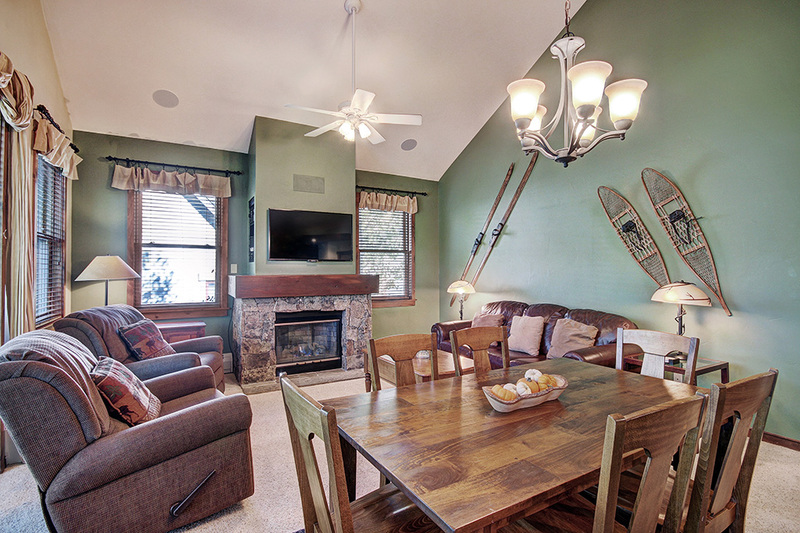 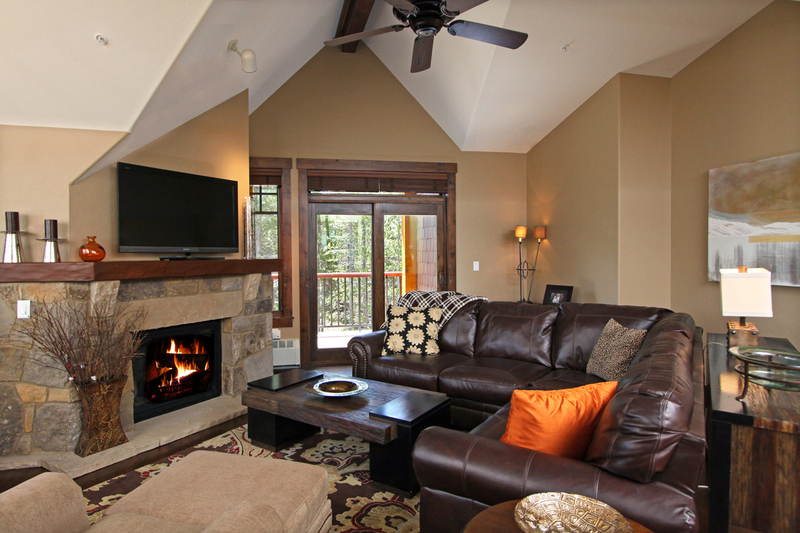 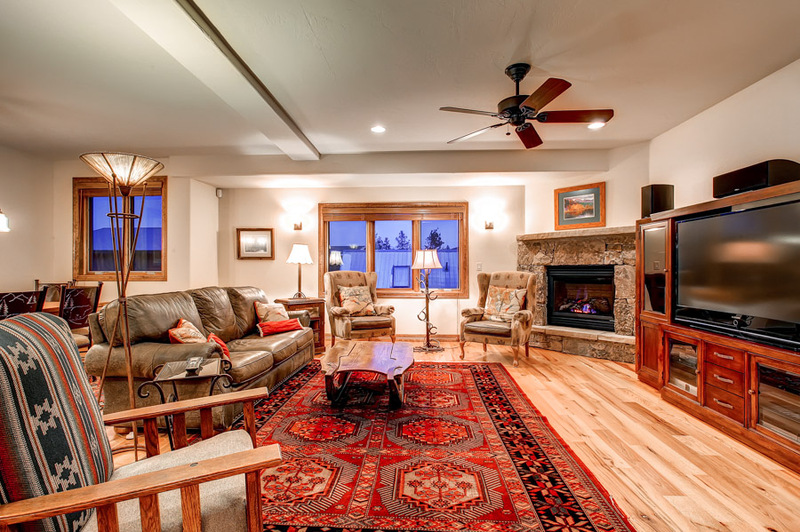 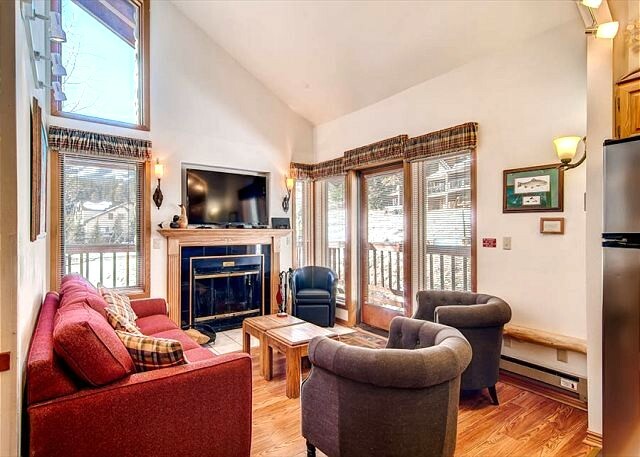 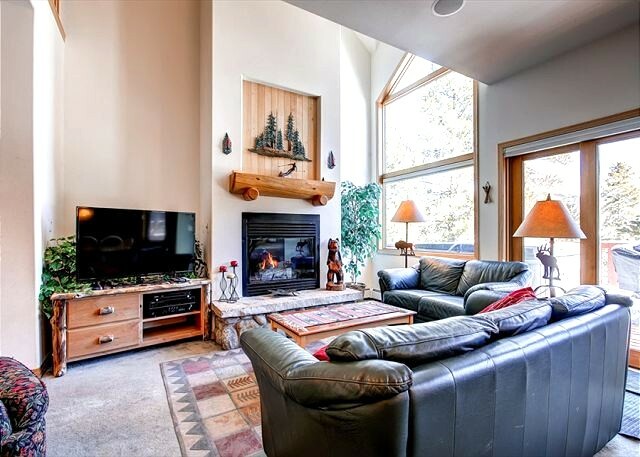 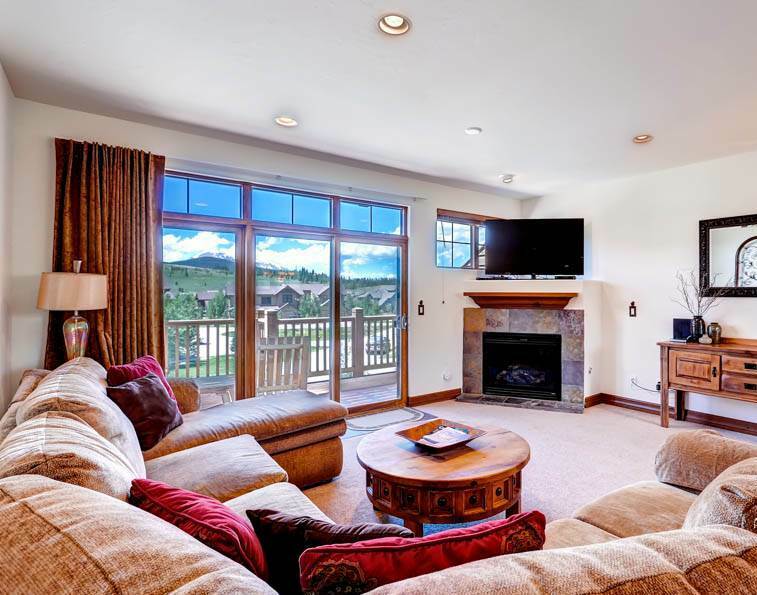 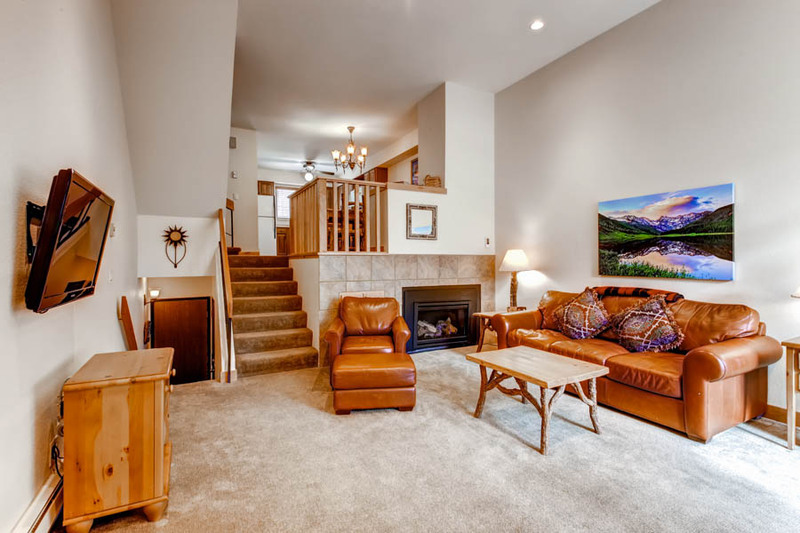 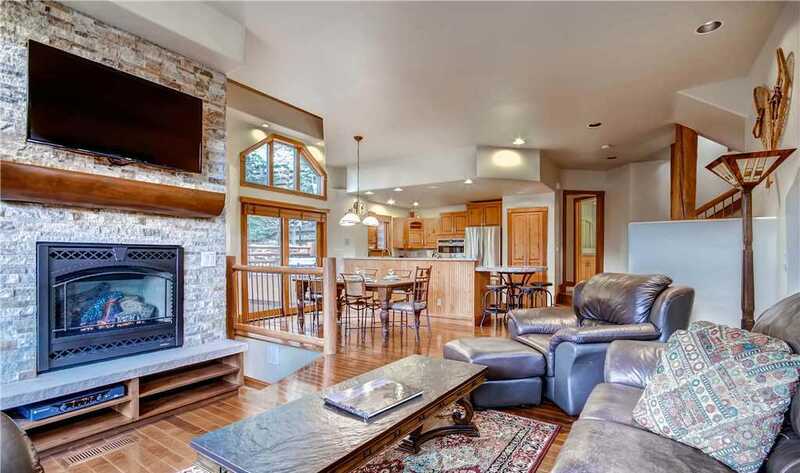 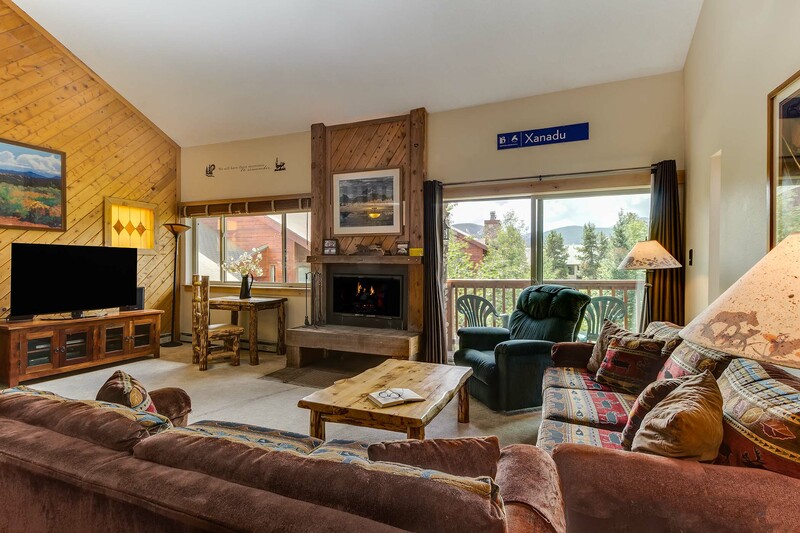 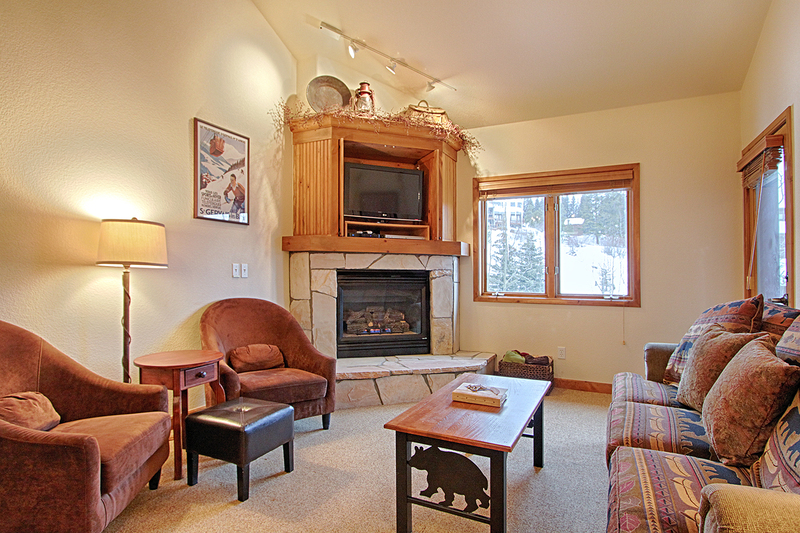 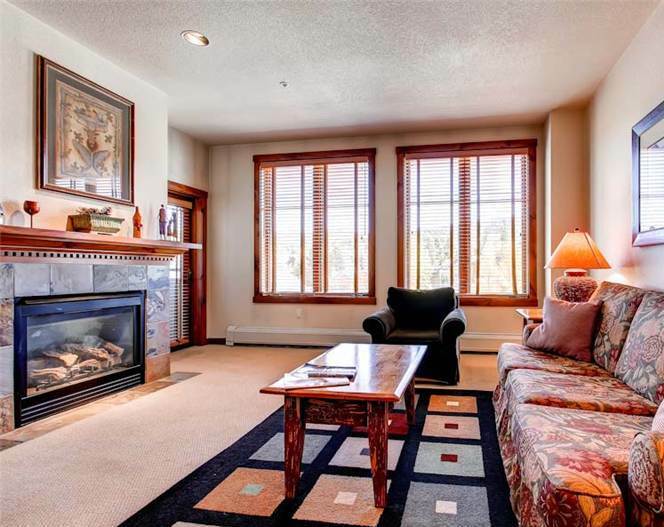 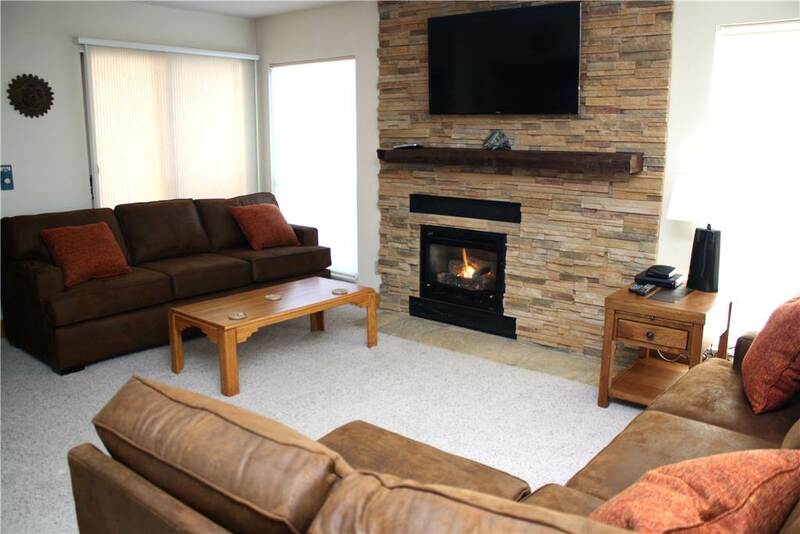 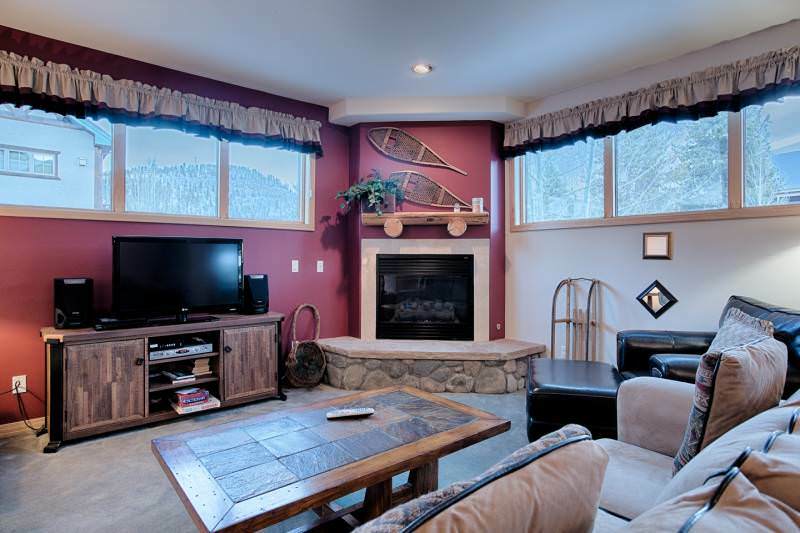 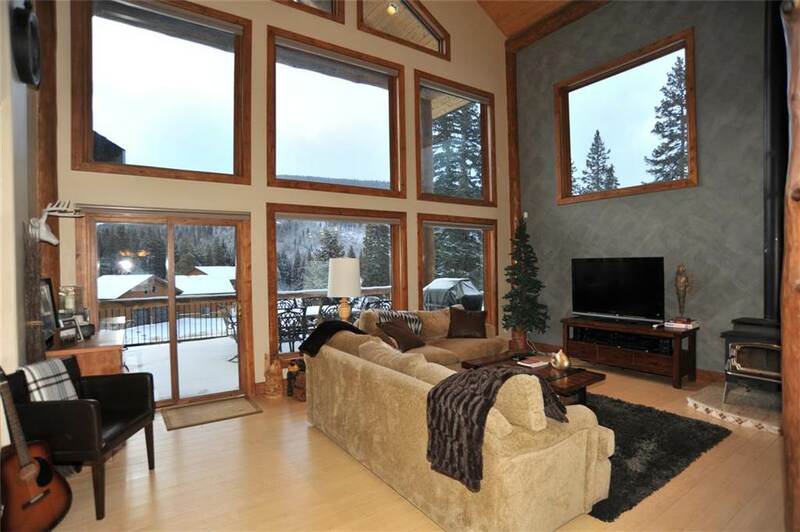 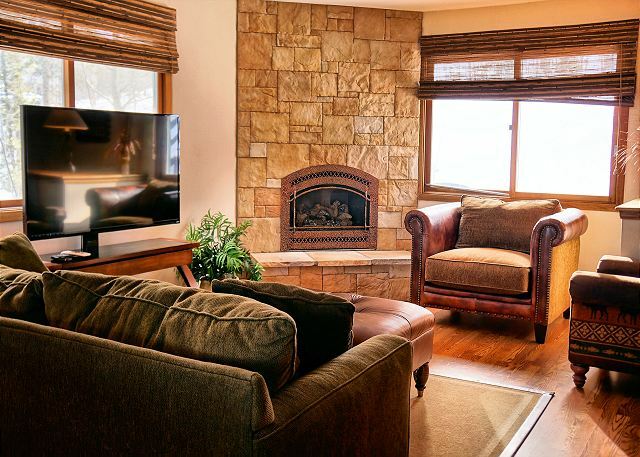 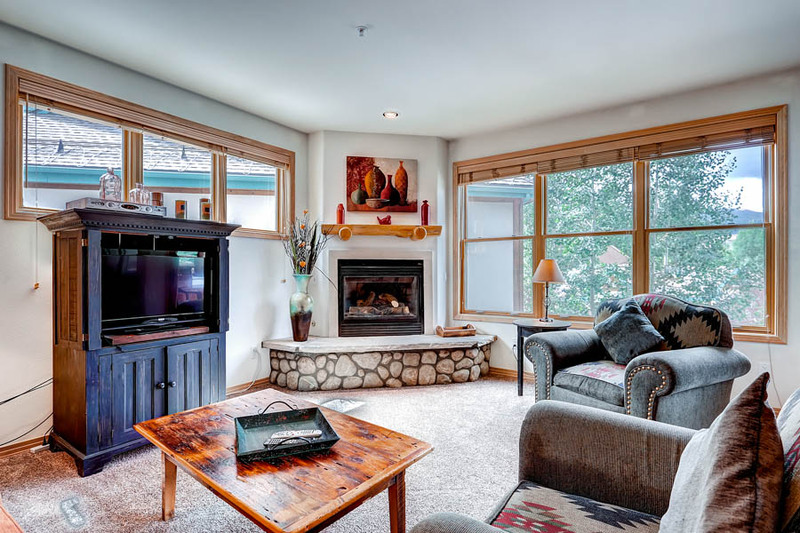 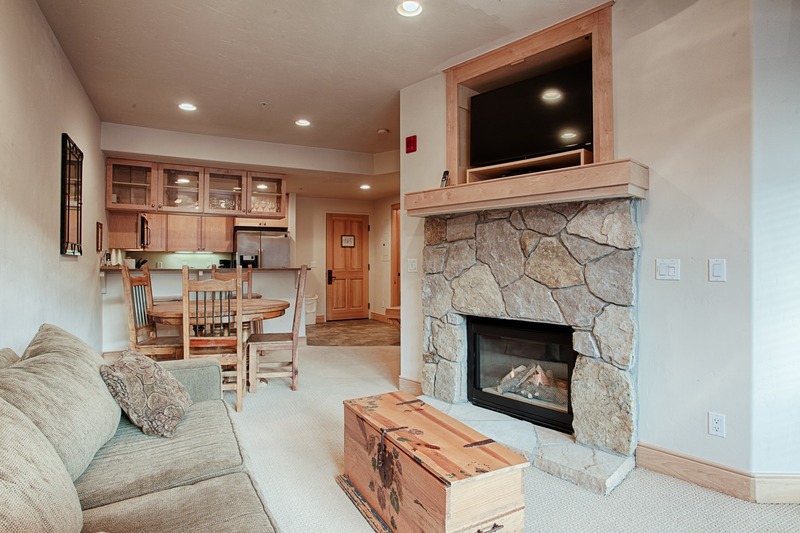 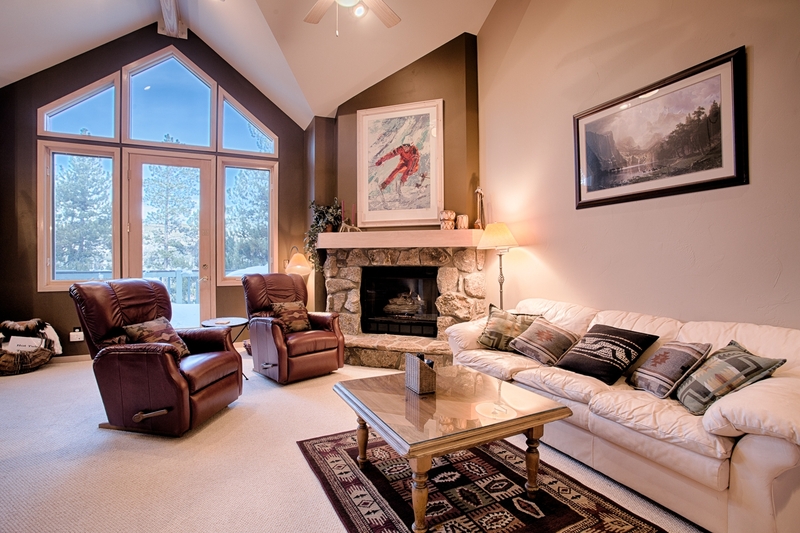 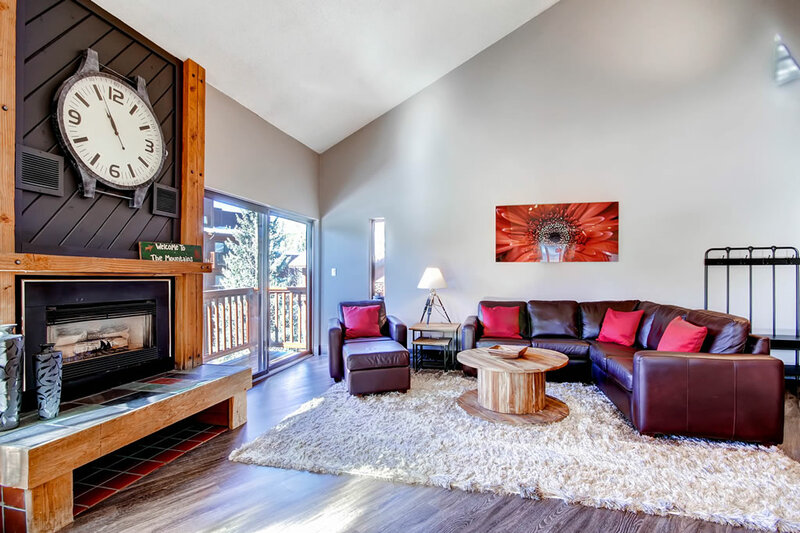 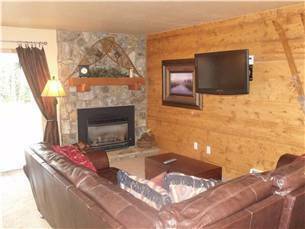 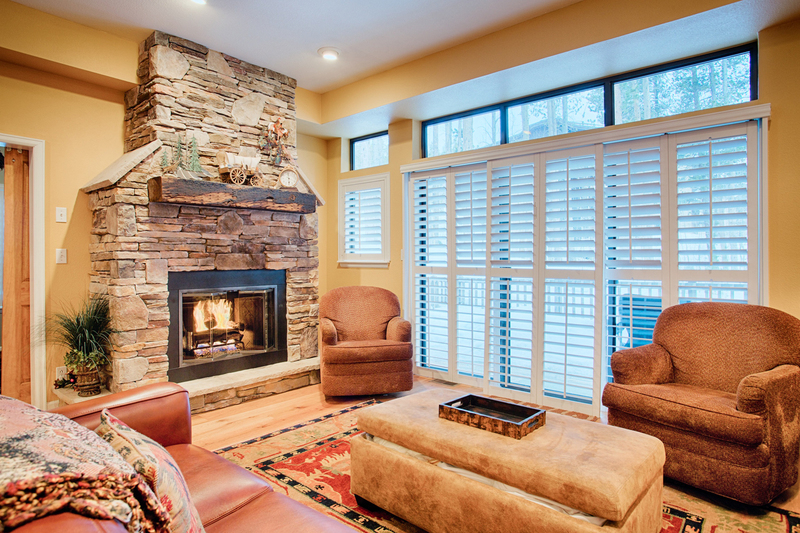 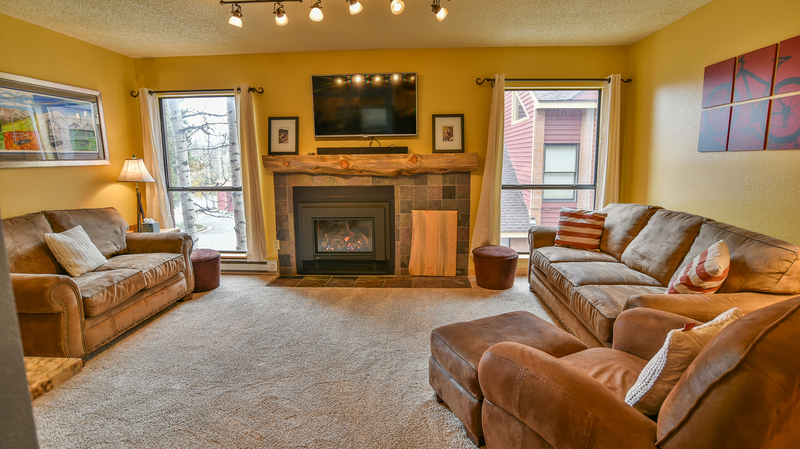 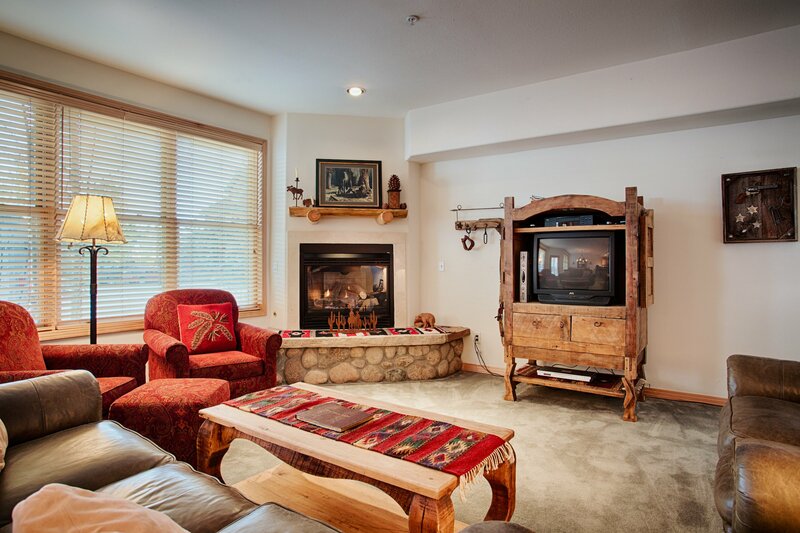 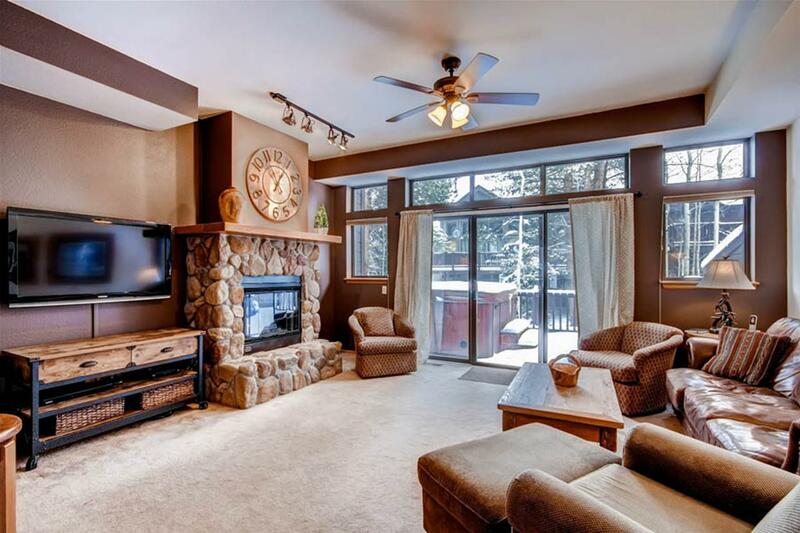 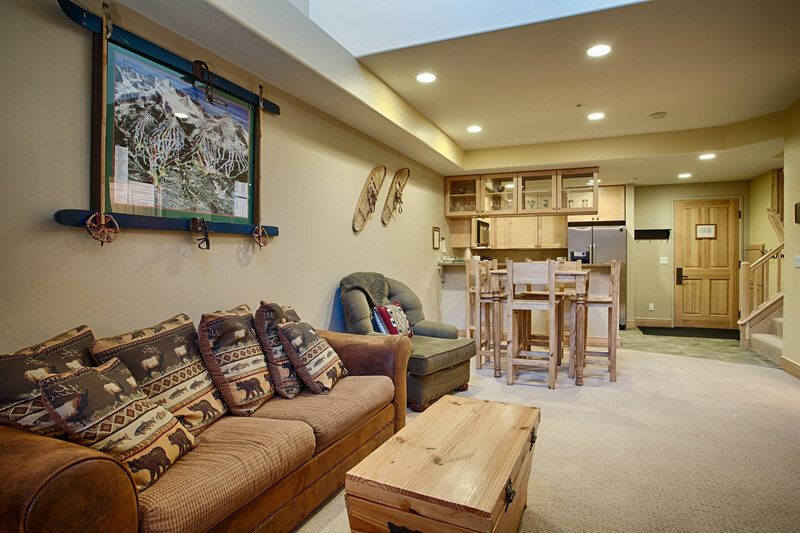 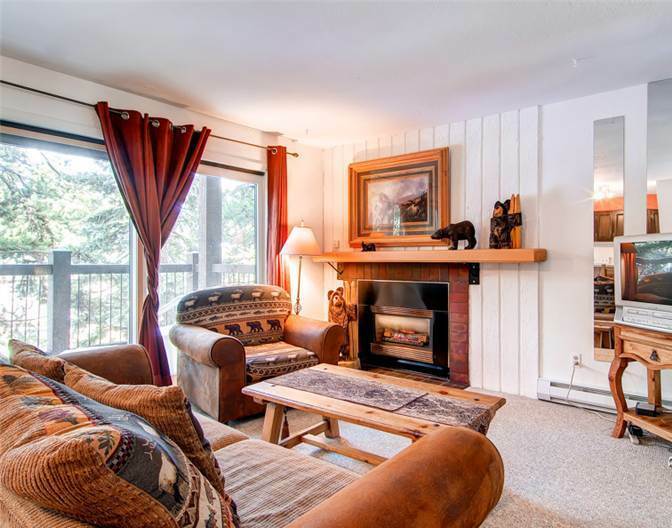 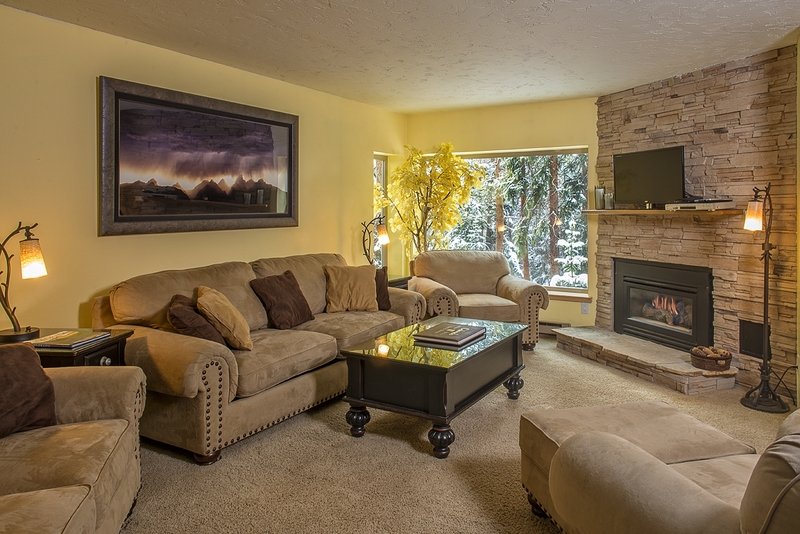 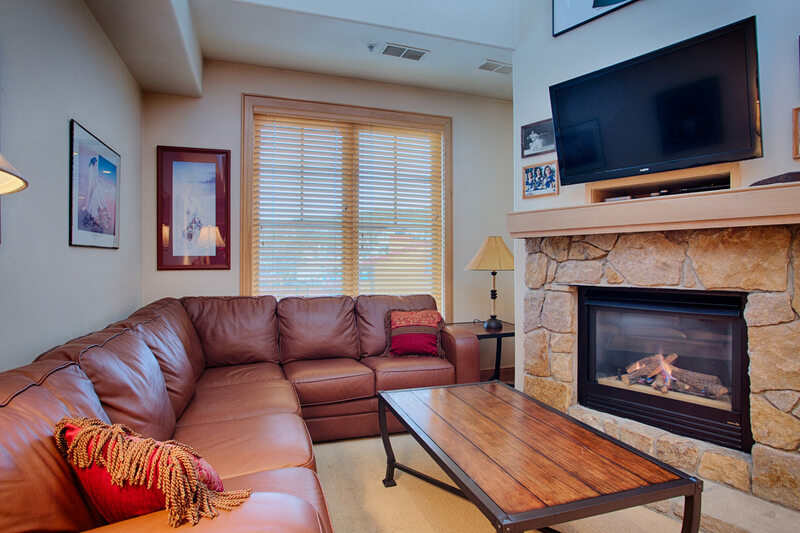 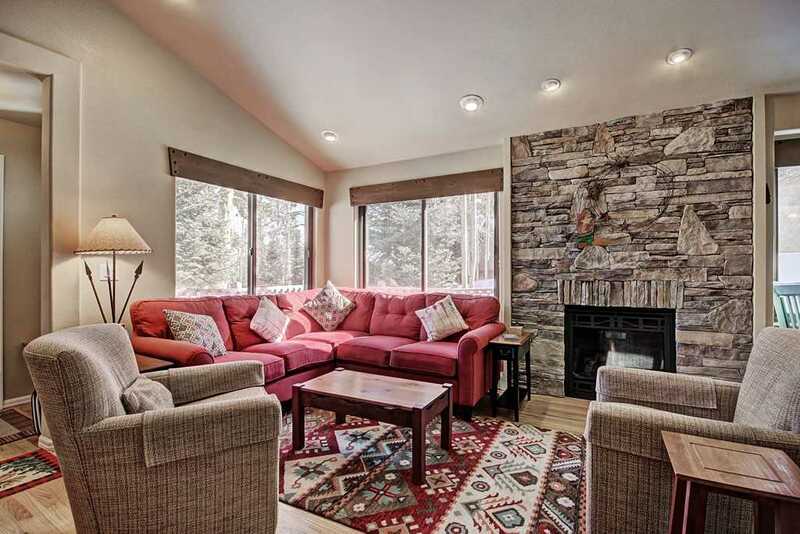 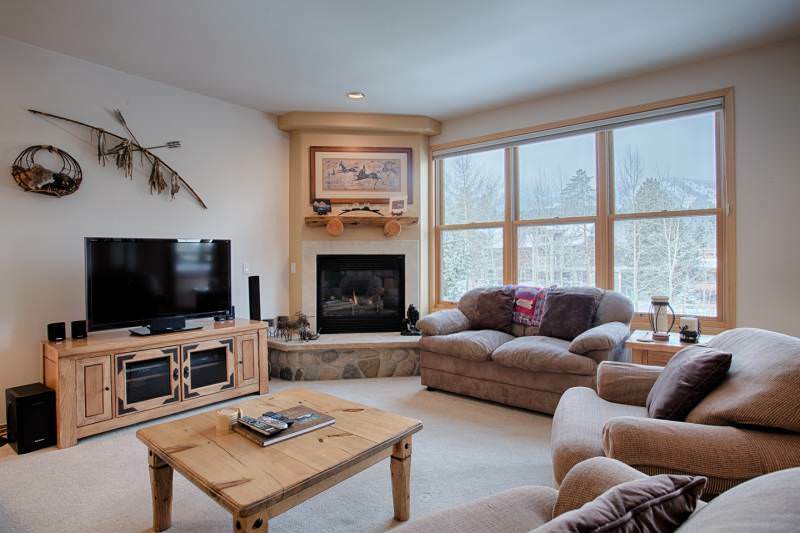 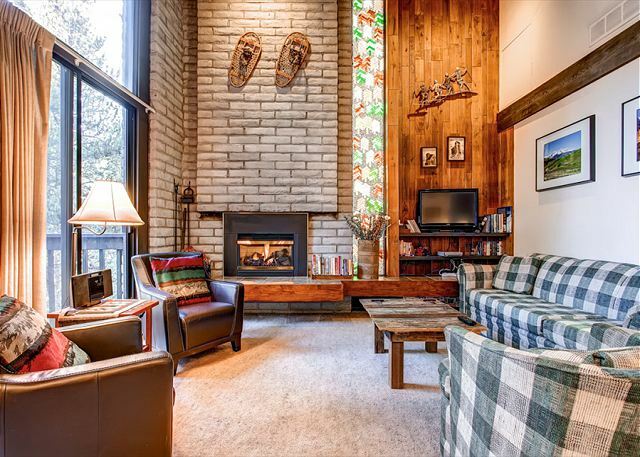 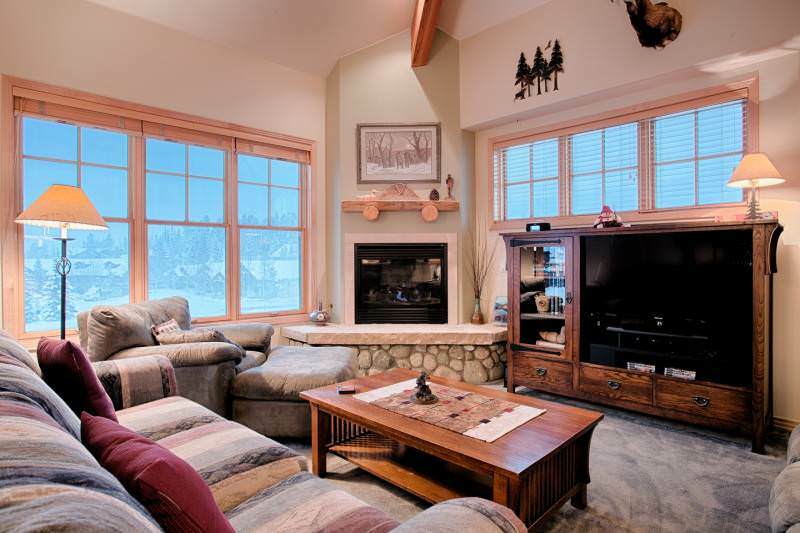 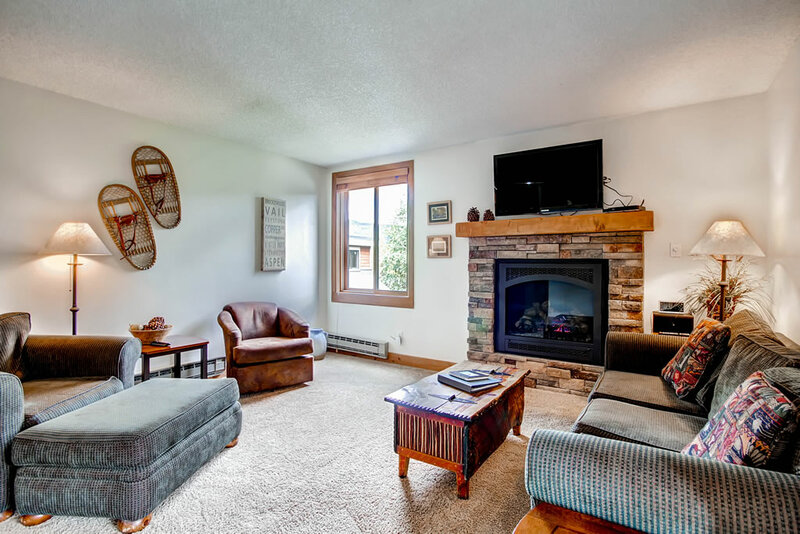 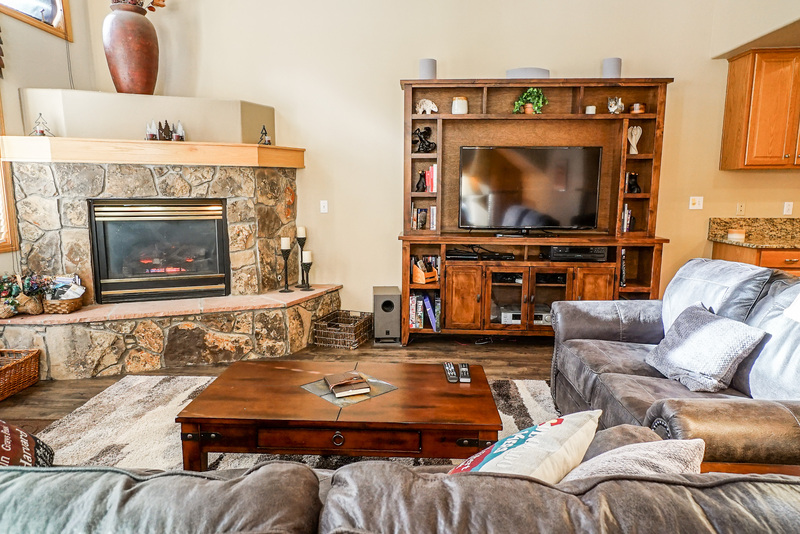 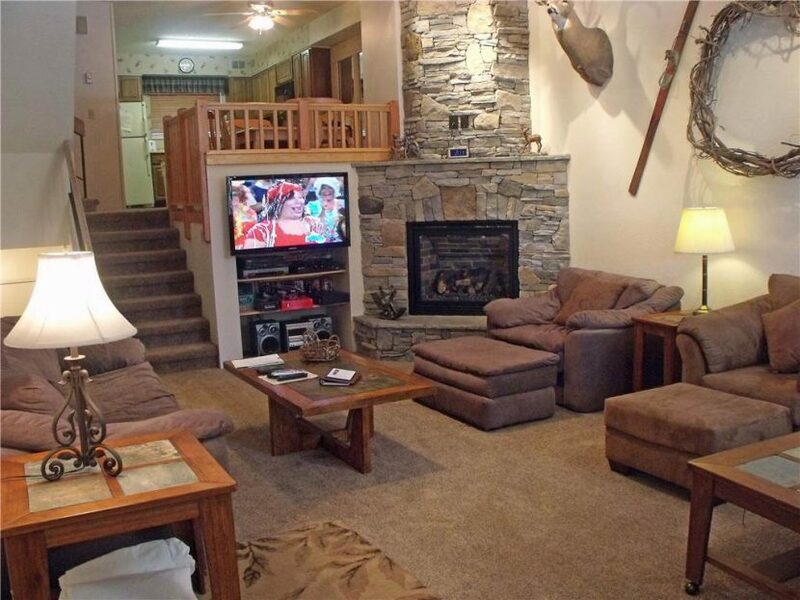 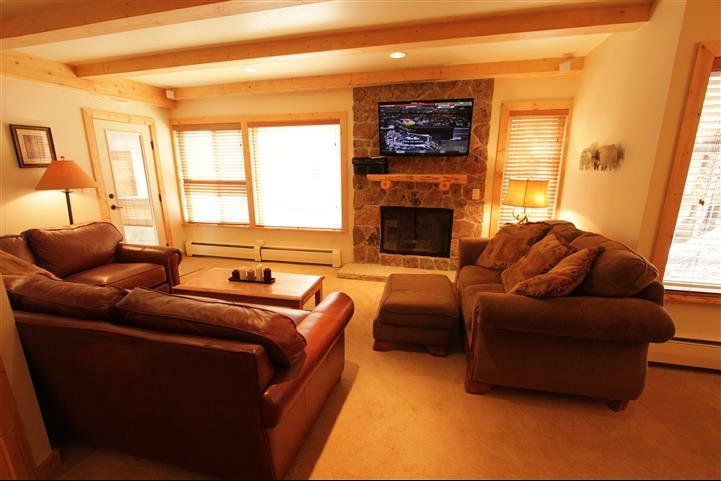 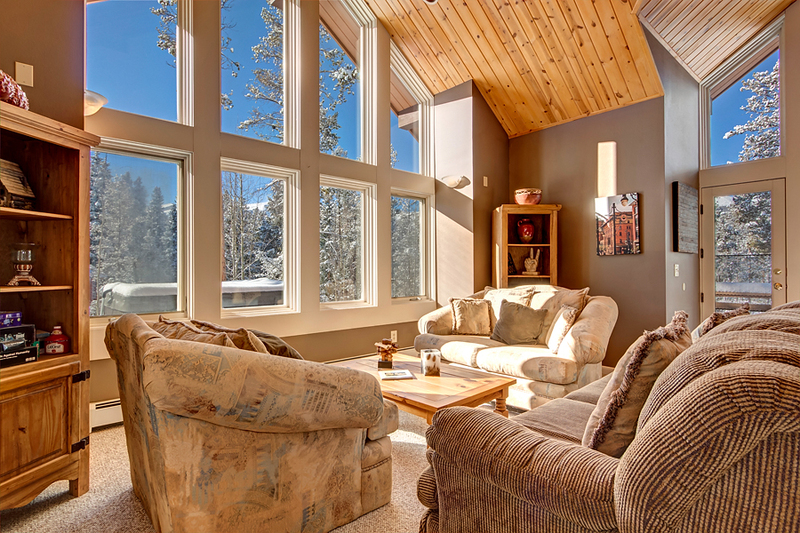 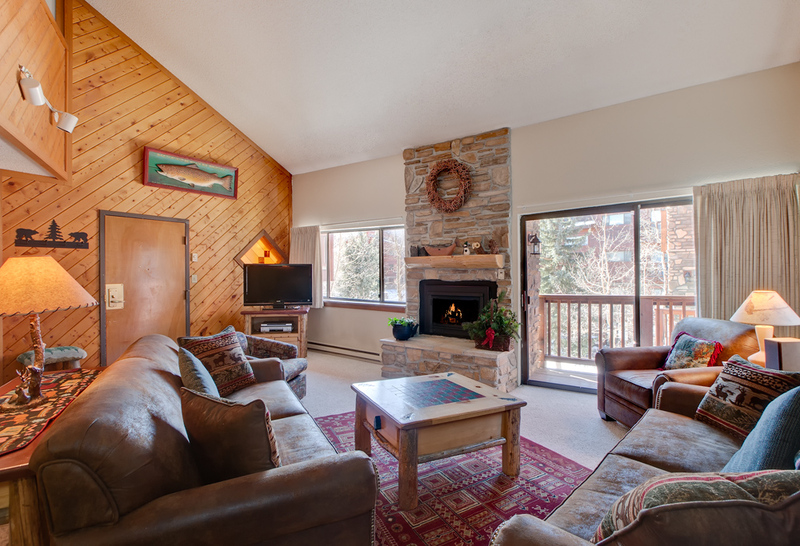 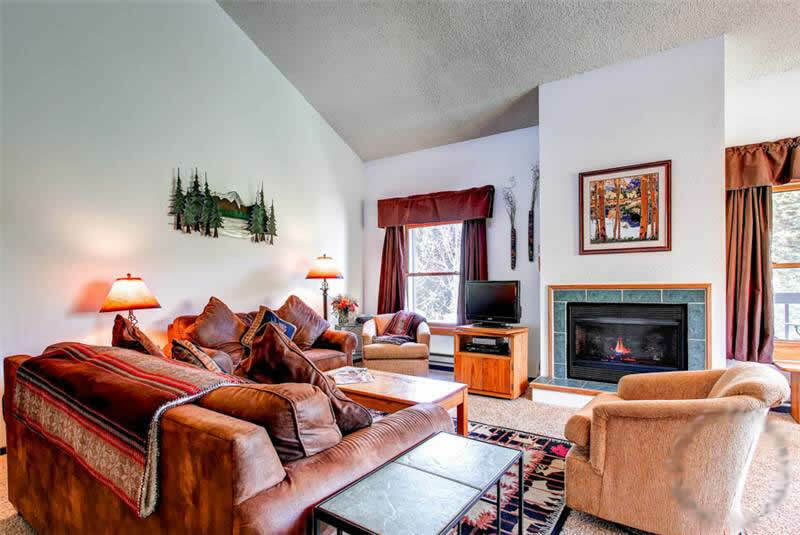 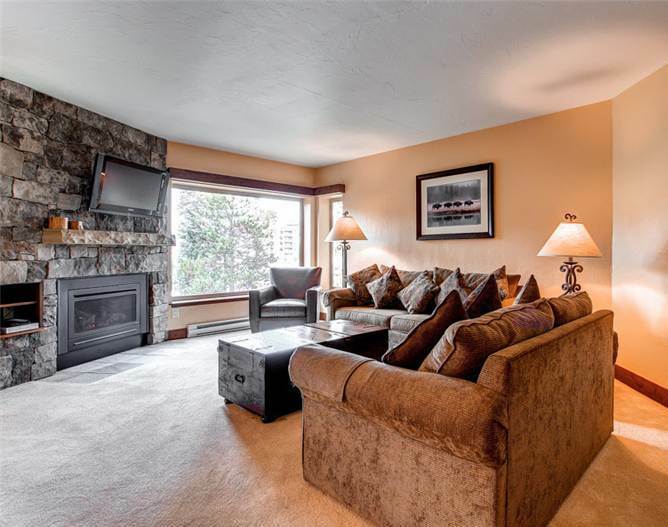 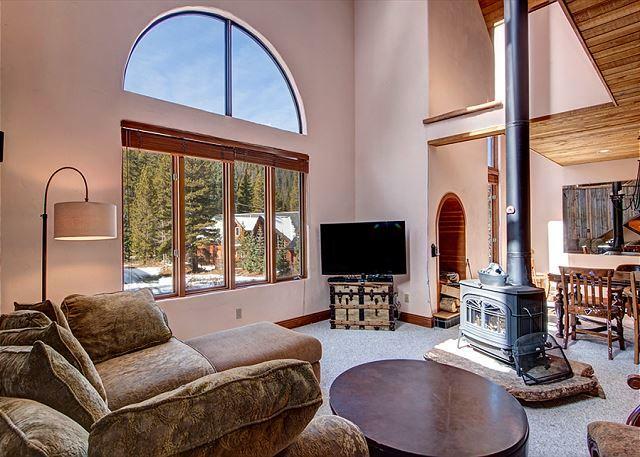 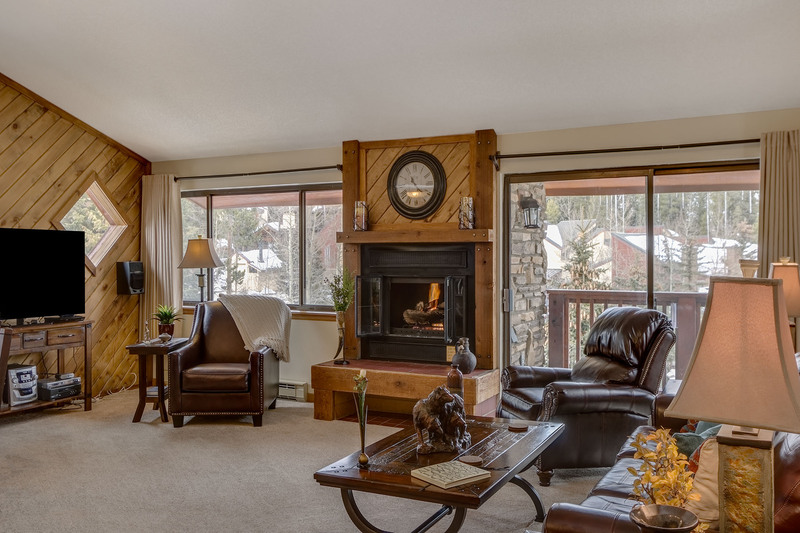 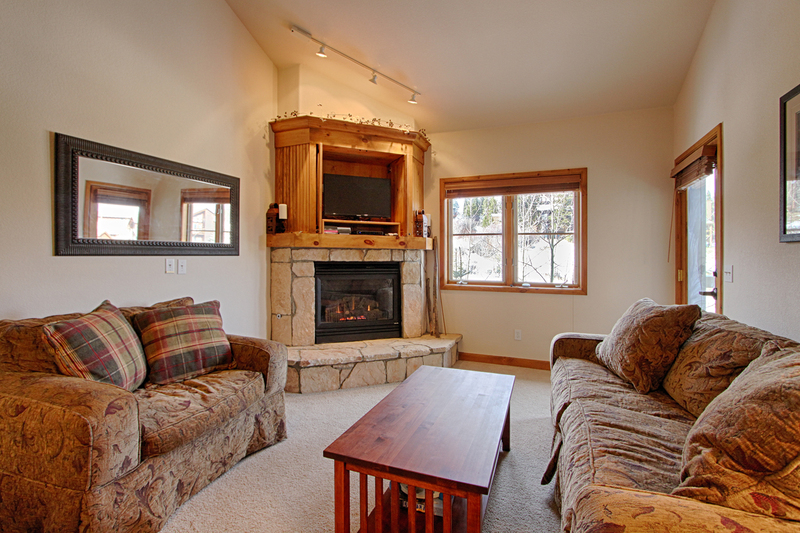 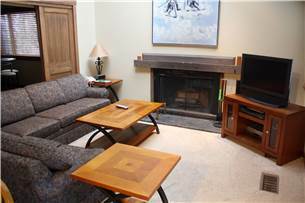 On the main level, the living area features a floor-to-ceiling cobblestone gas fireplace and large LCD TV — it’s just the place to relax after a long day on the slopes for drinks, conversation and a favorite movie. 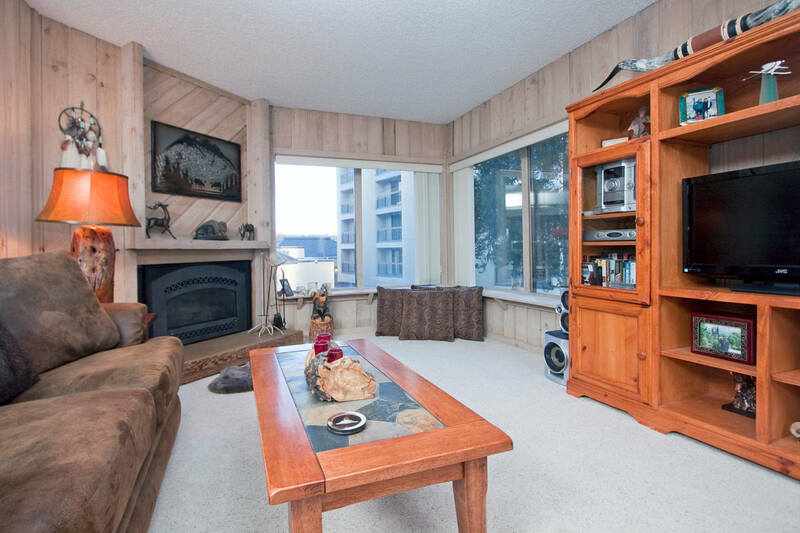 There’s even a balcony and gas grill right outside the patio door. 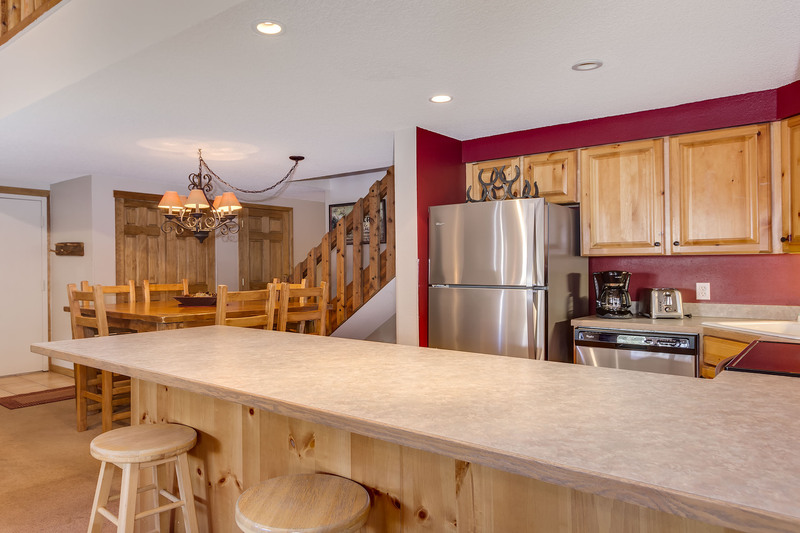 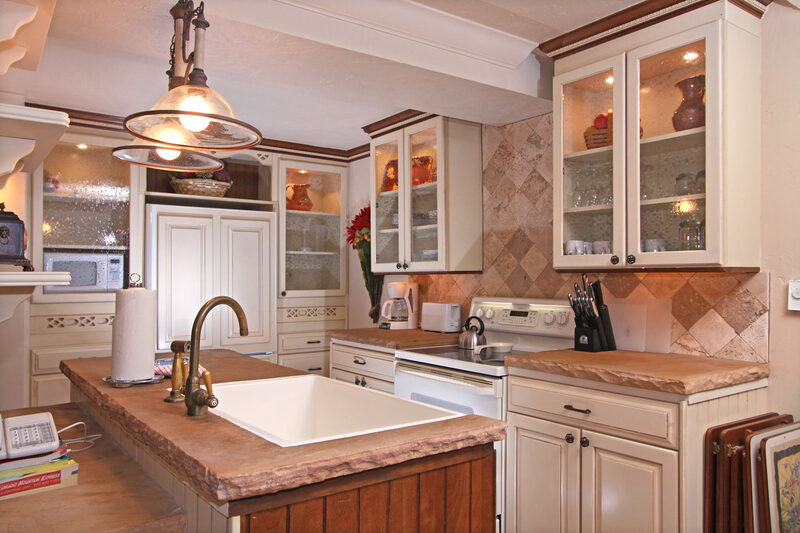 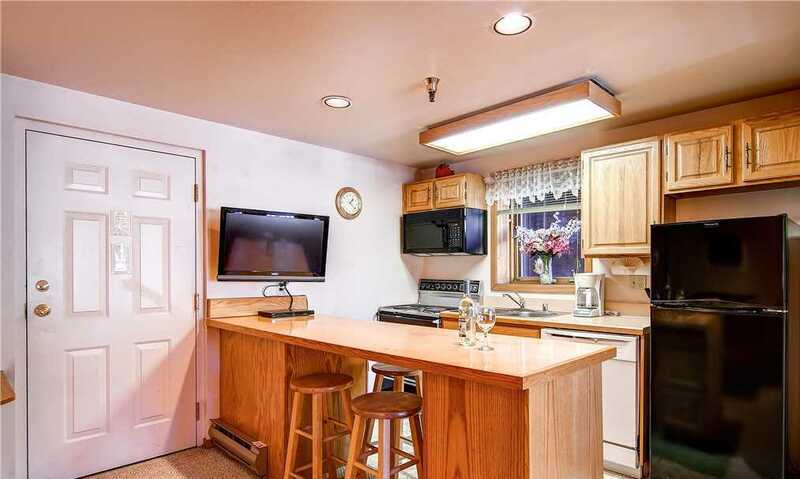 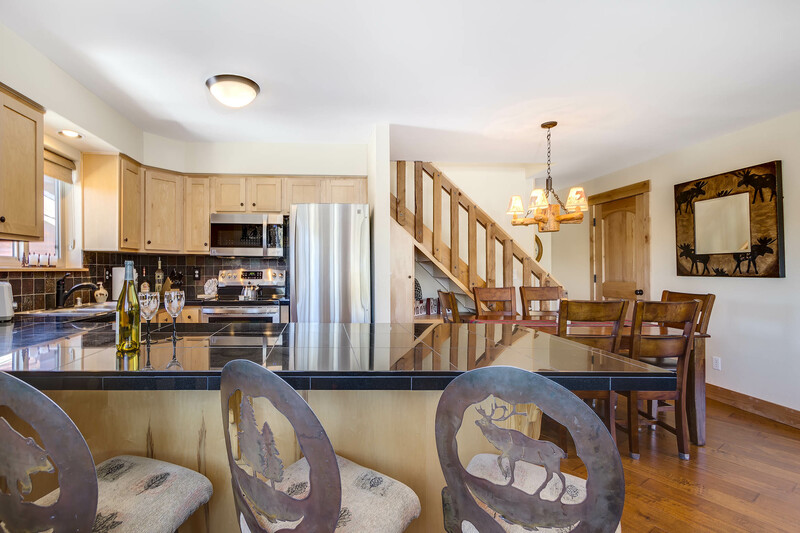 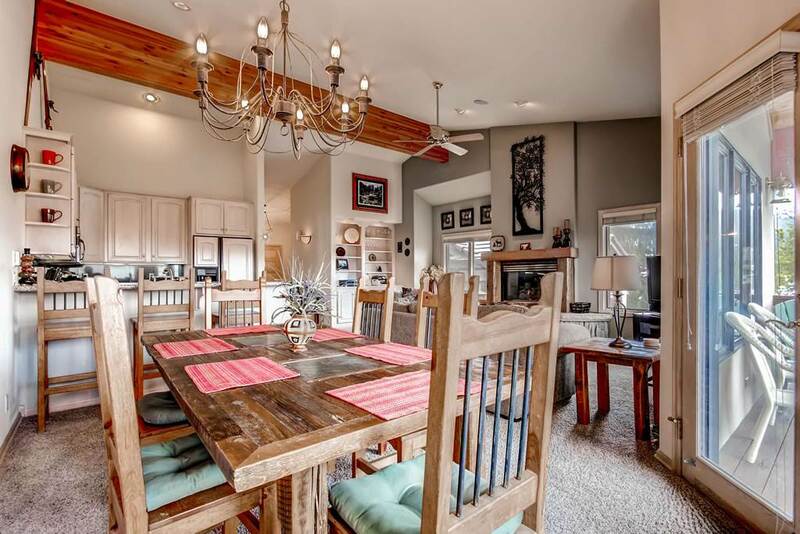 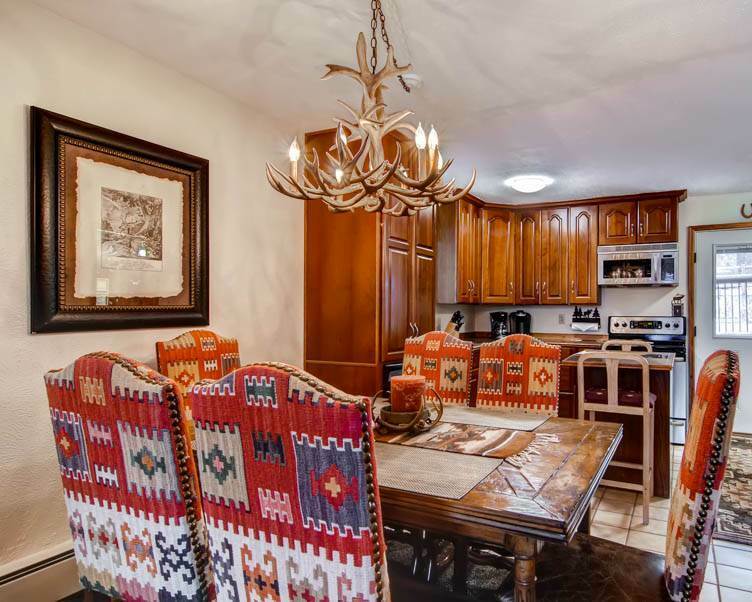 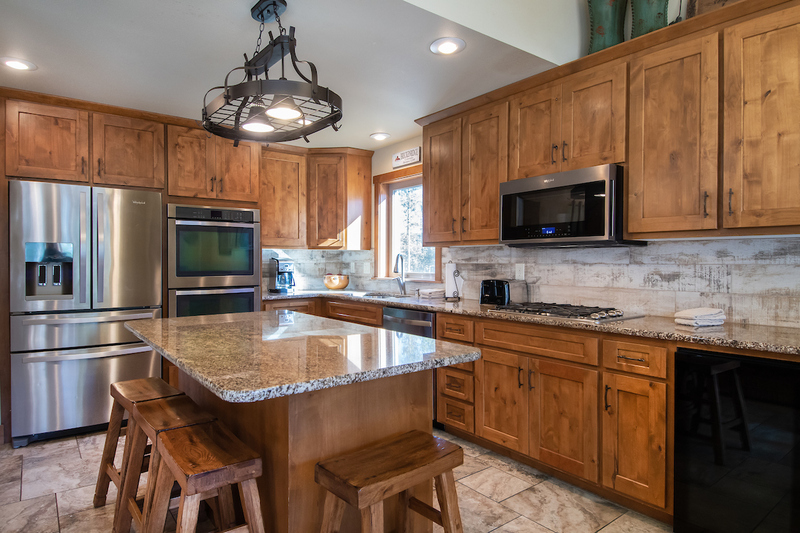 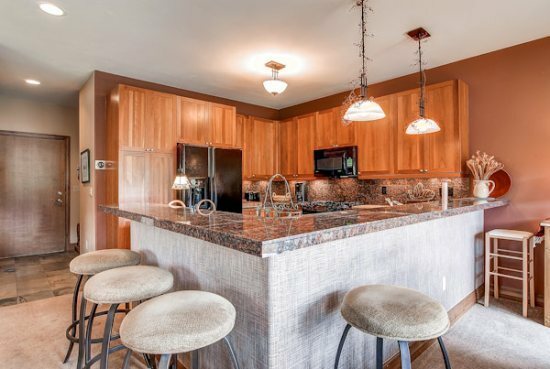 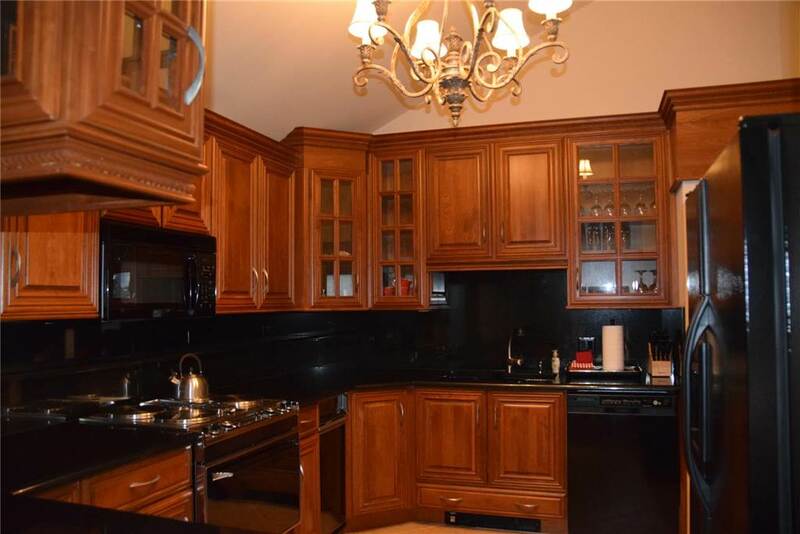 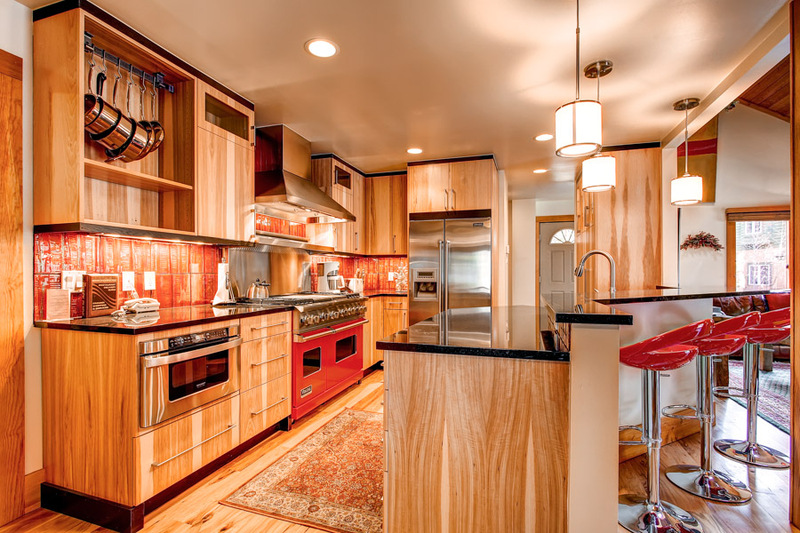 The fully equipped kitchen is ready for whipping up dinner and snacks, with seating for six at the table and 4 more at the bar. 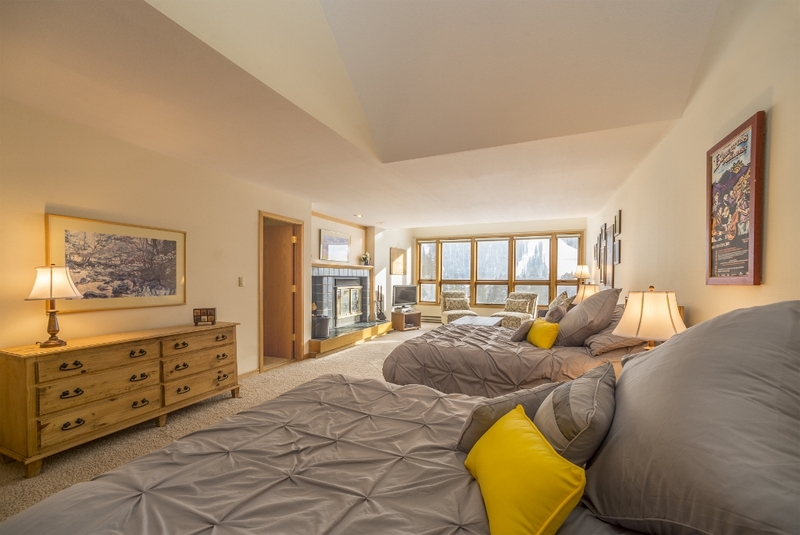 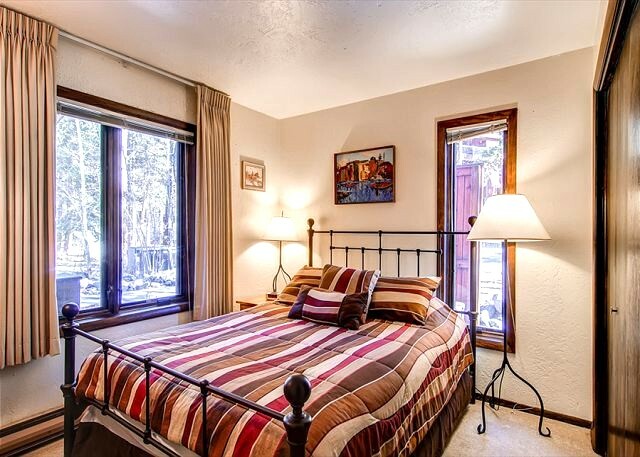 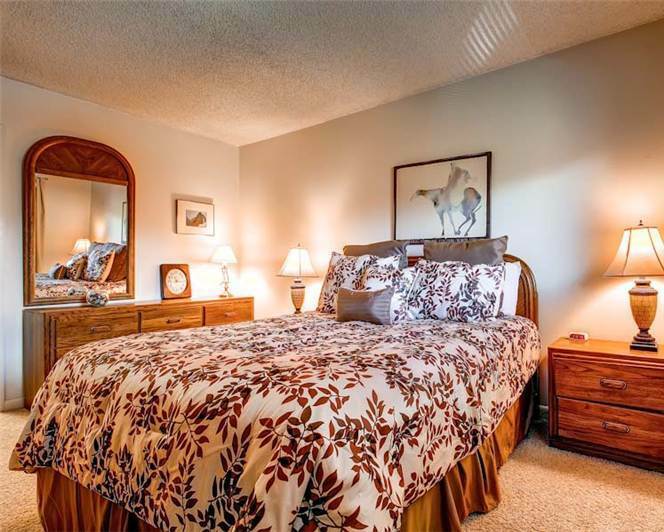 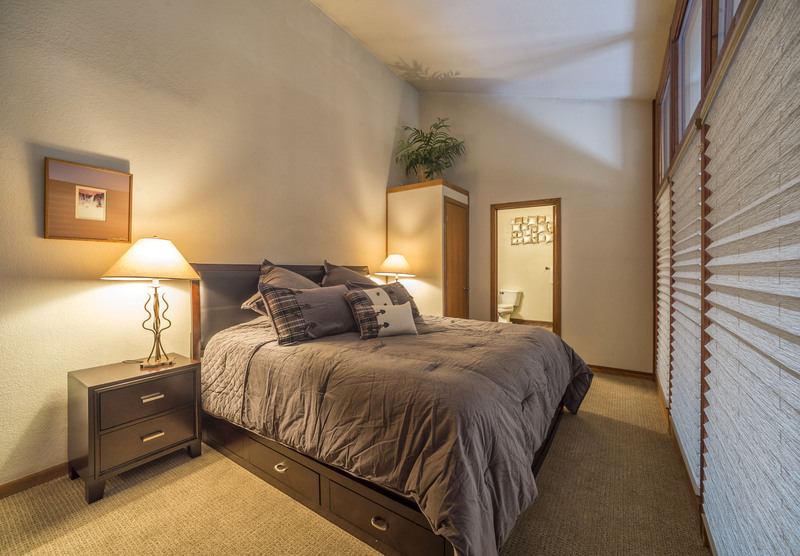 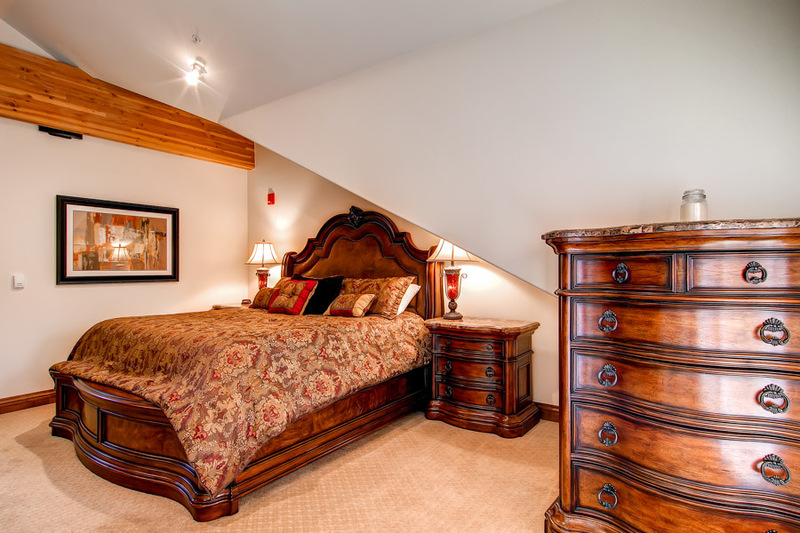 The queen master suite is also on this level, as well as another bedroom with two twin beds. 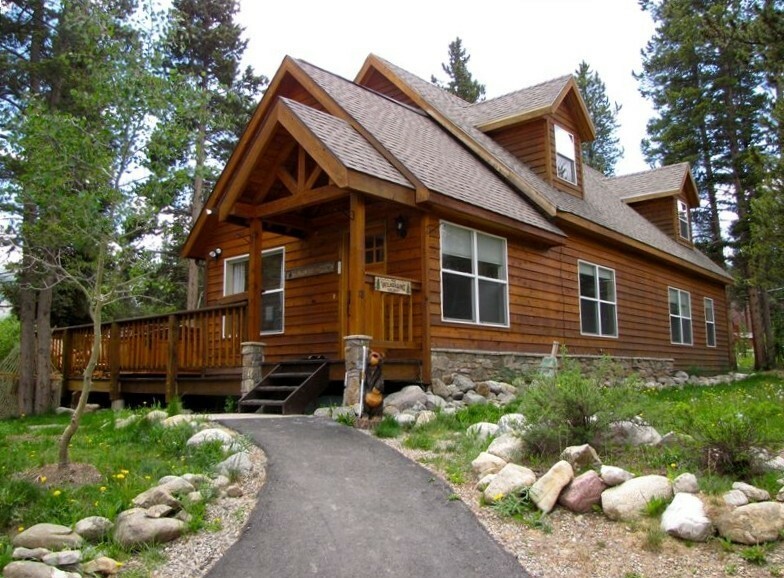 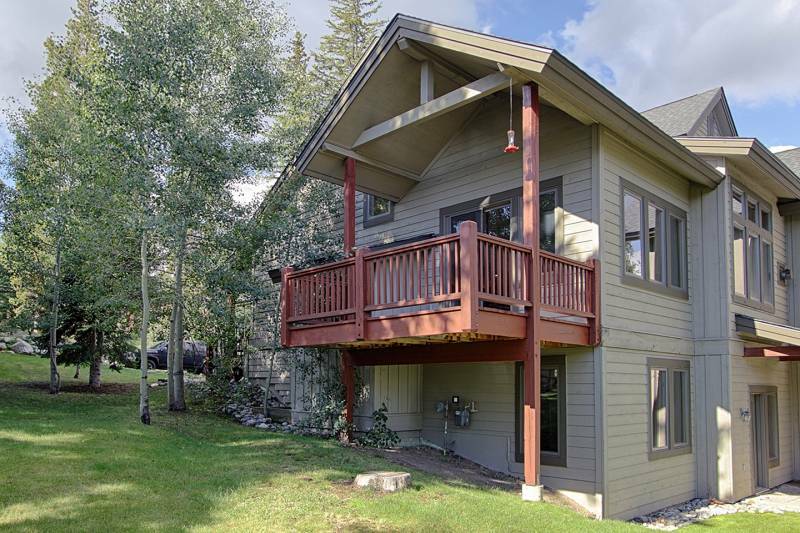 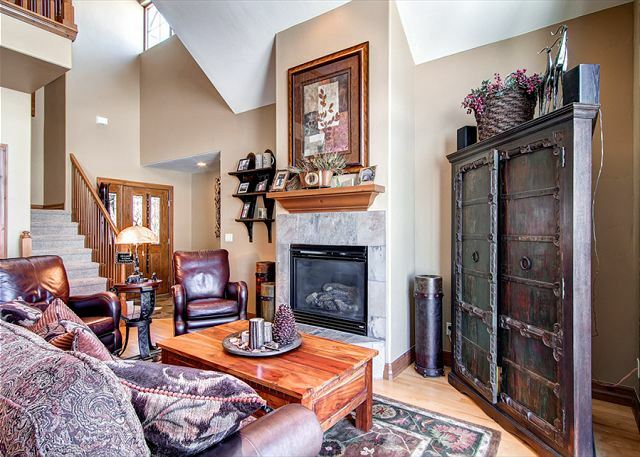 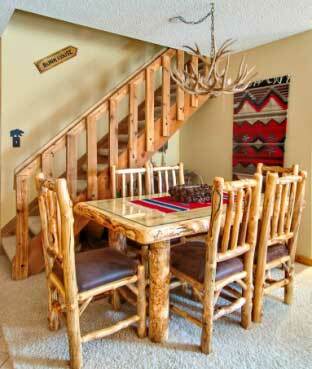 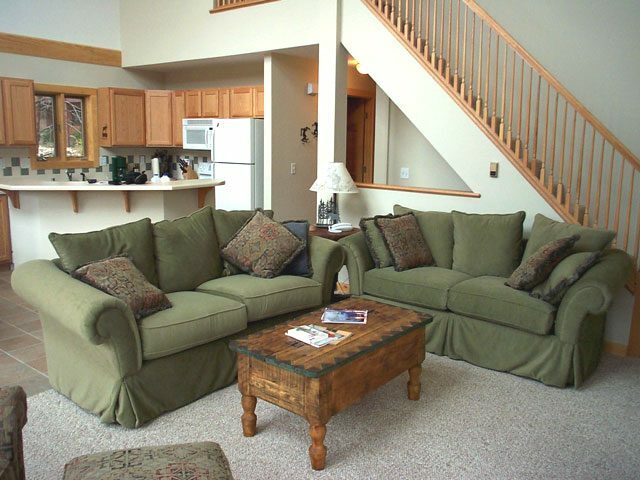 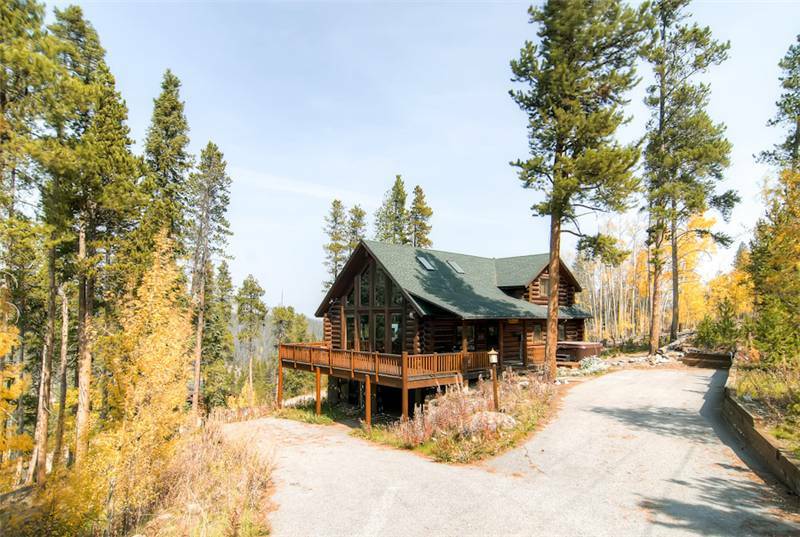 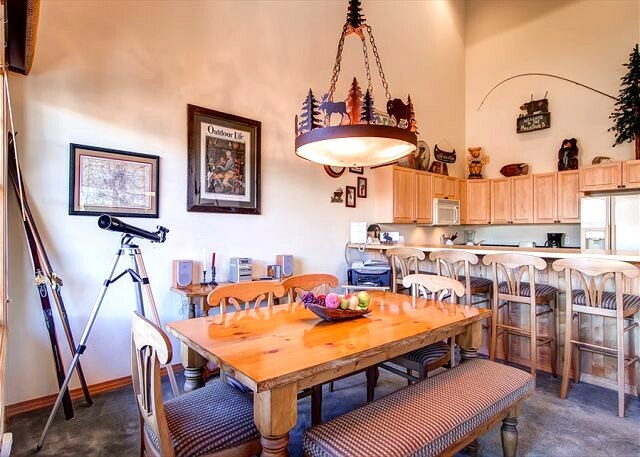 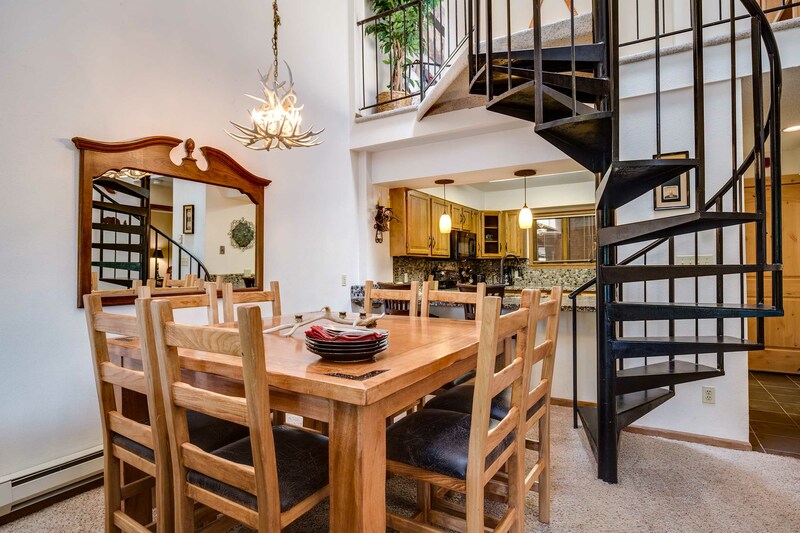 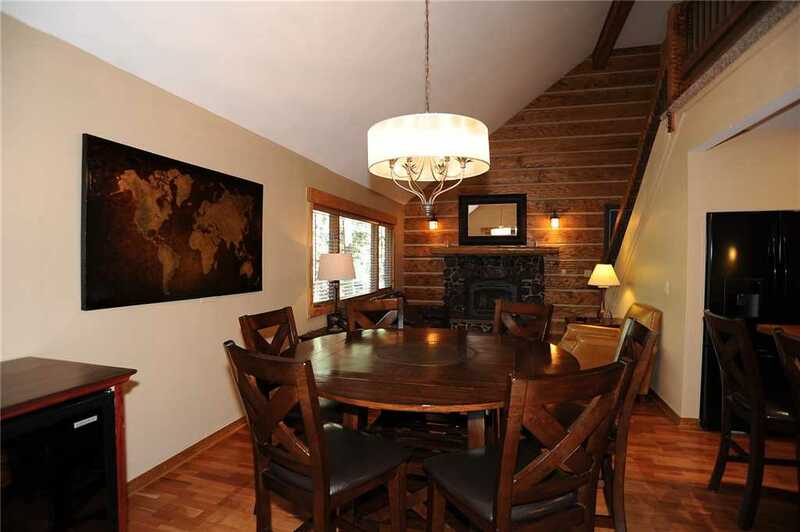 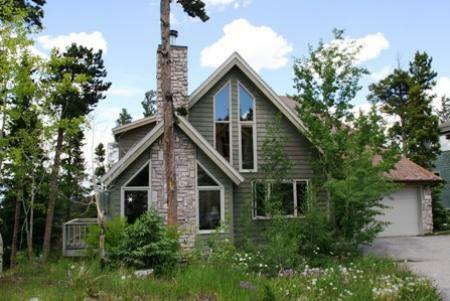 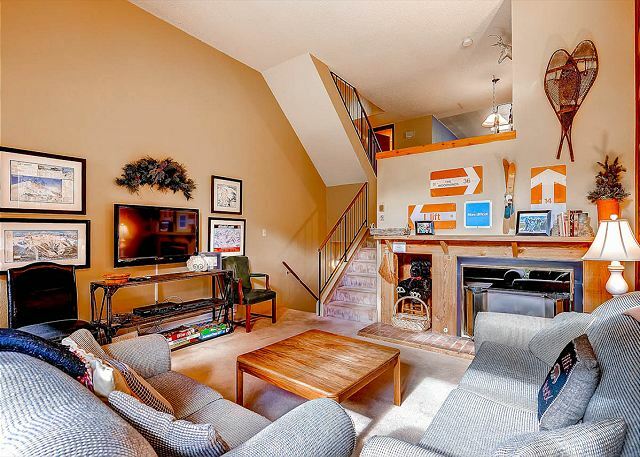 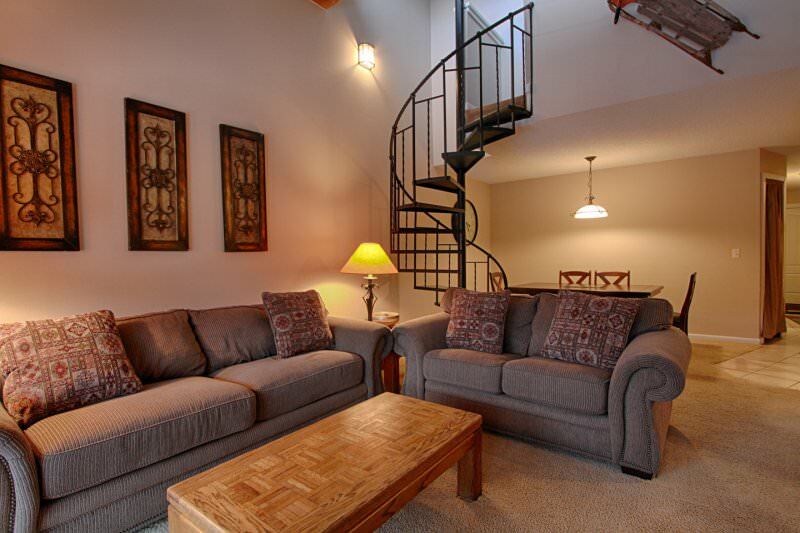 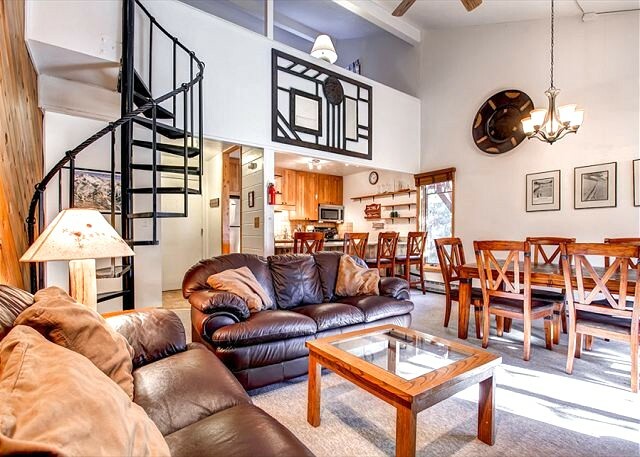 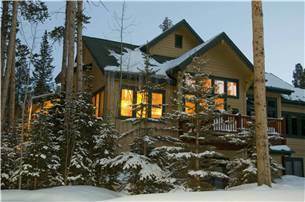 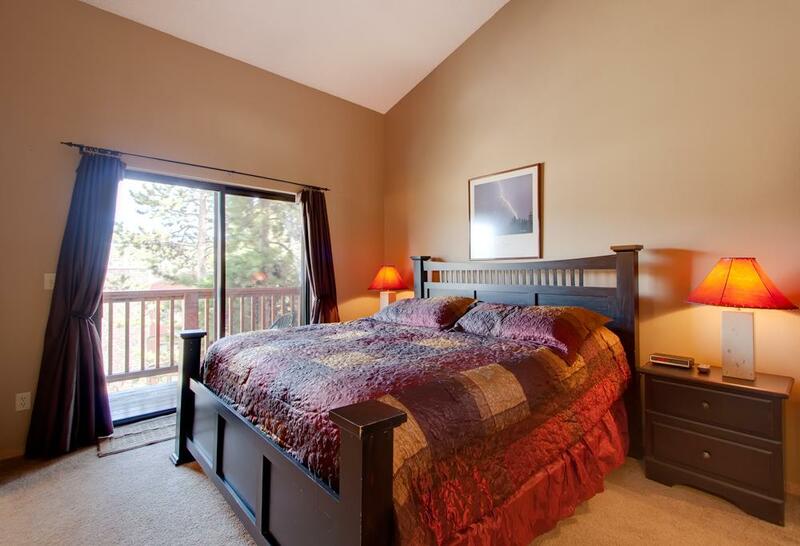 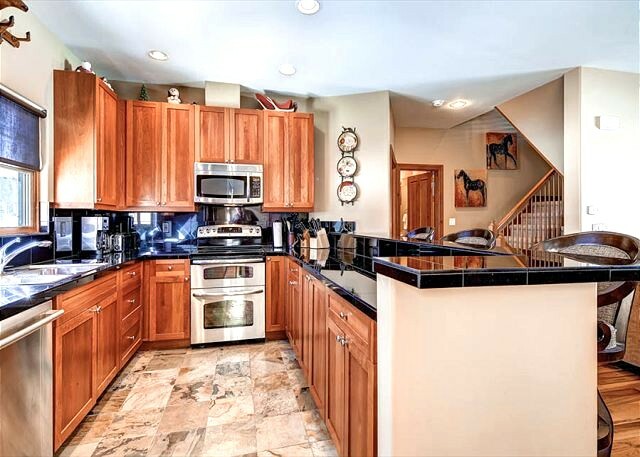 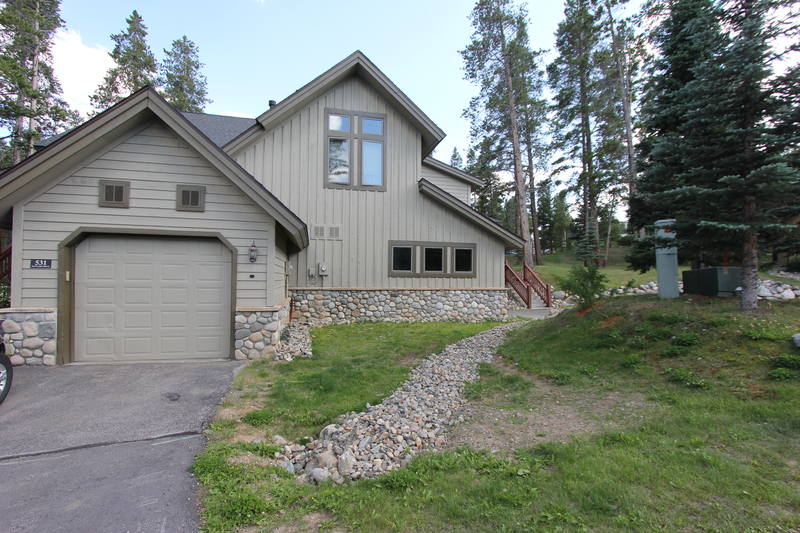 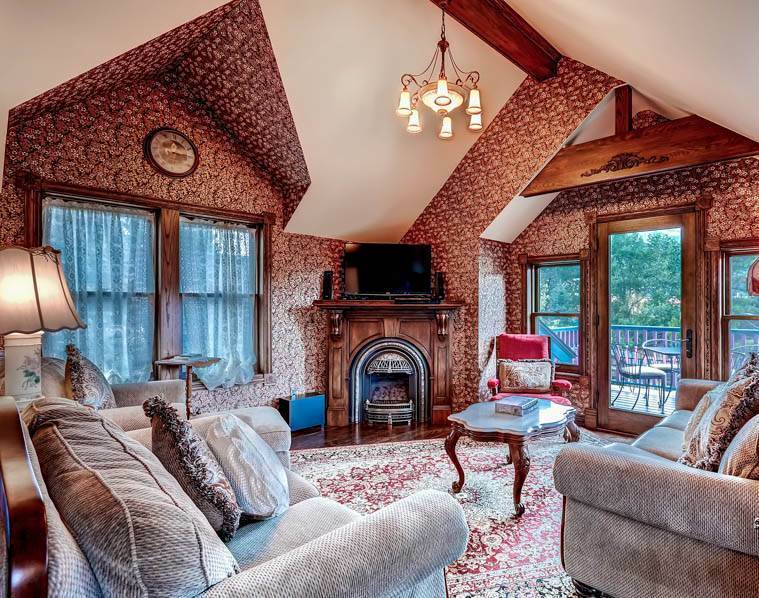 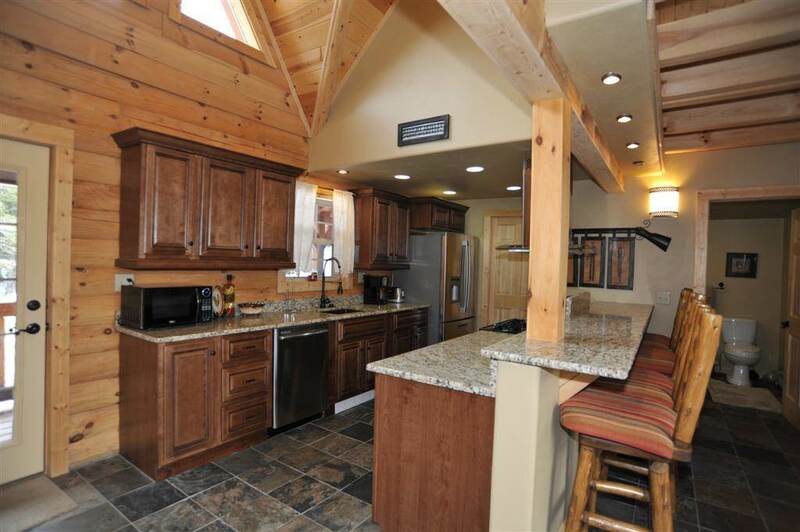 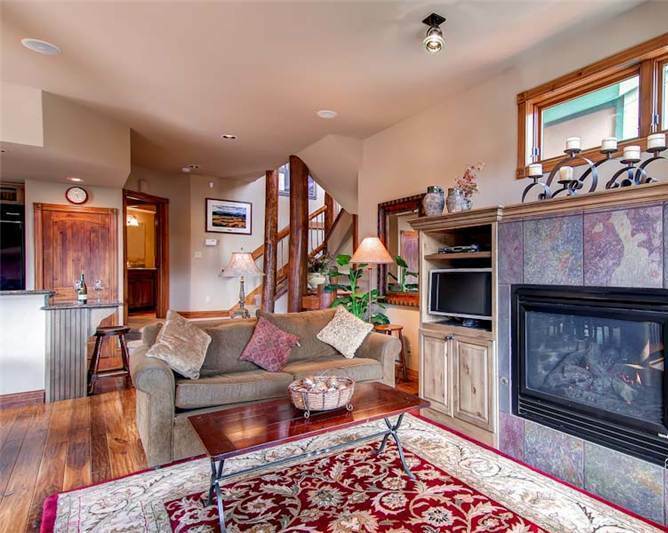 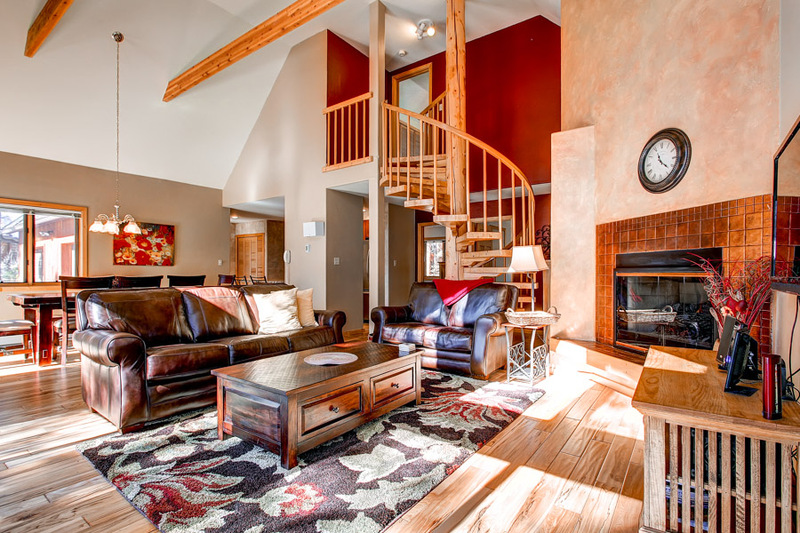 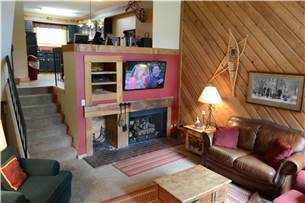 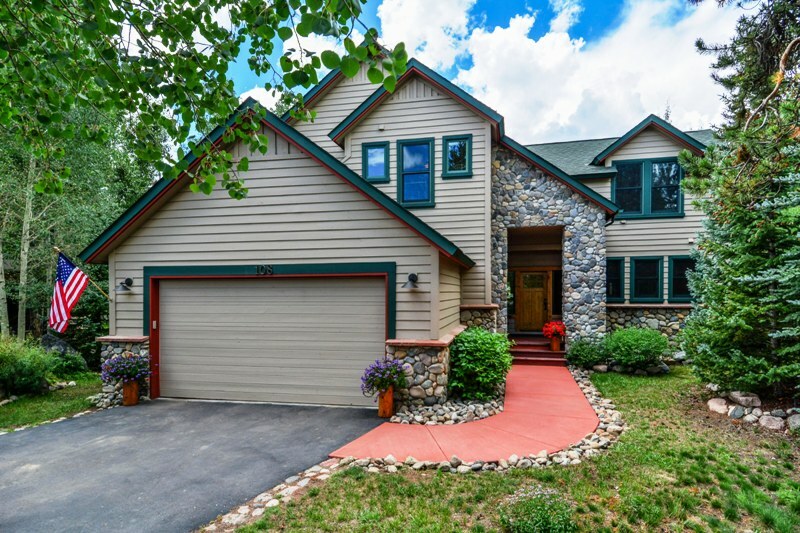 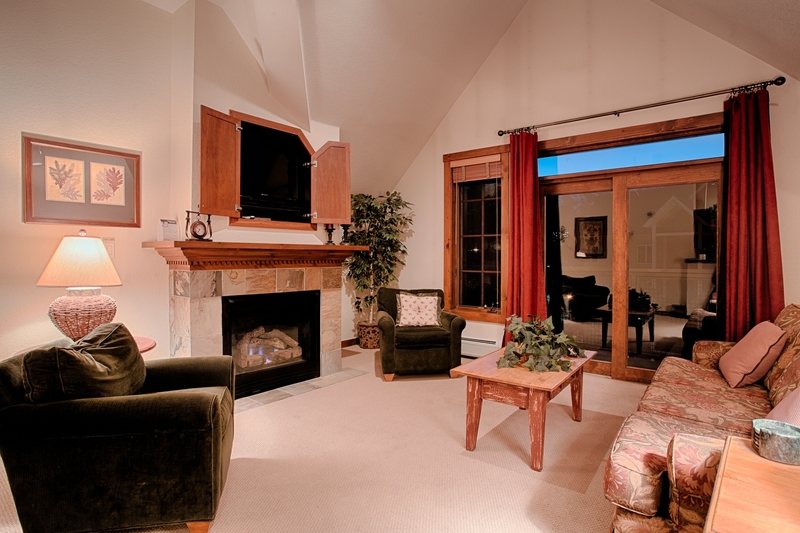 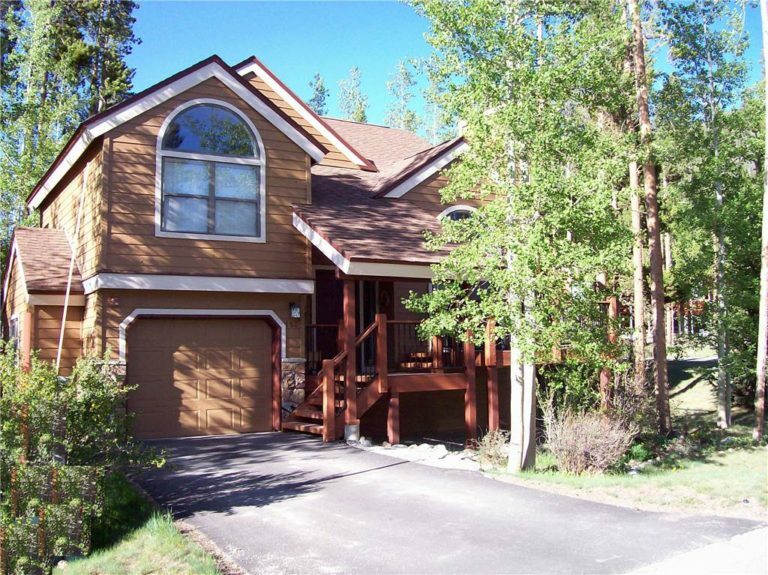 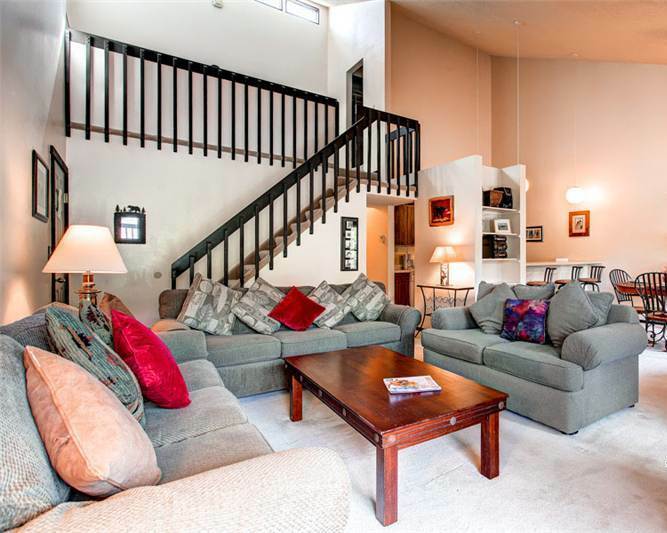 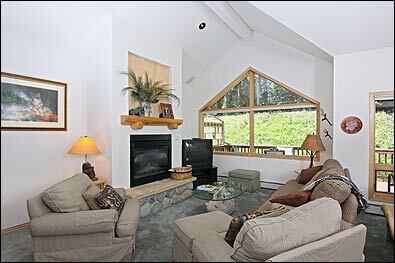 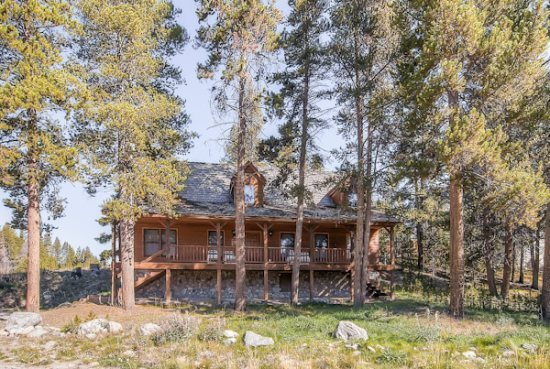 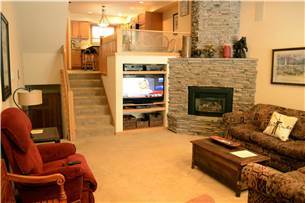 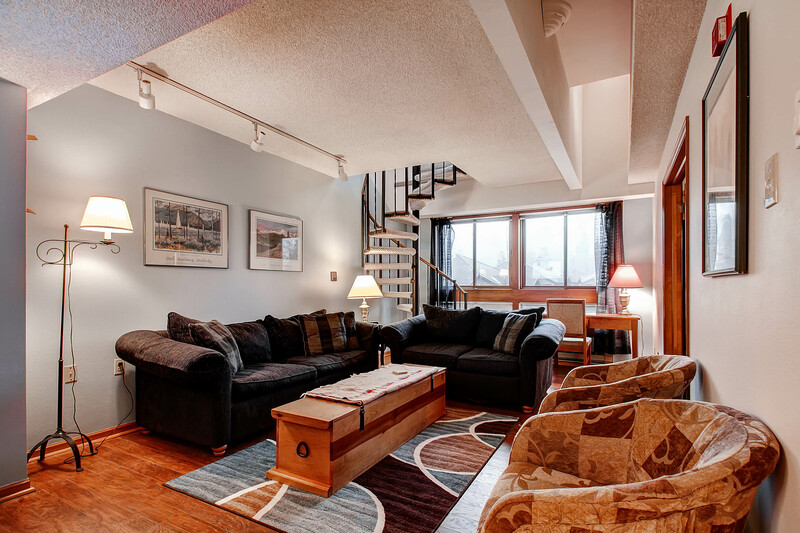 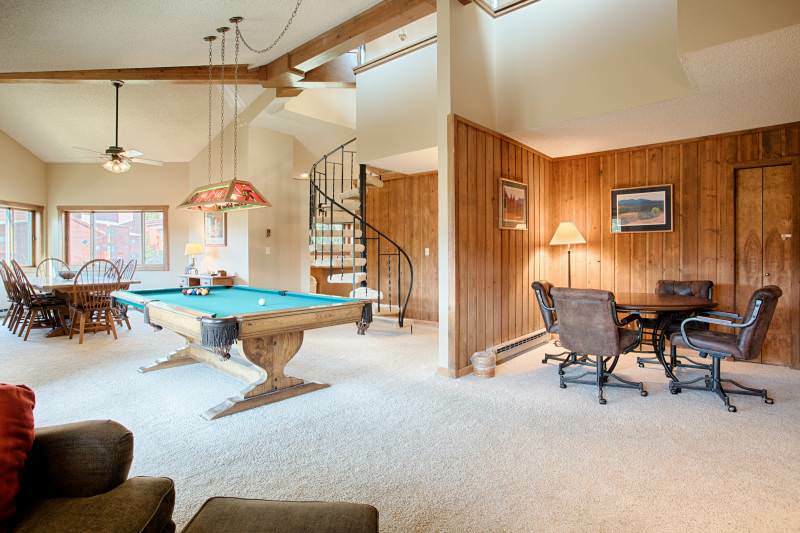 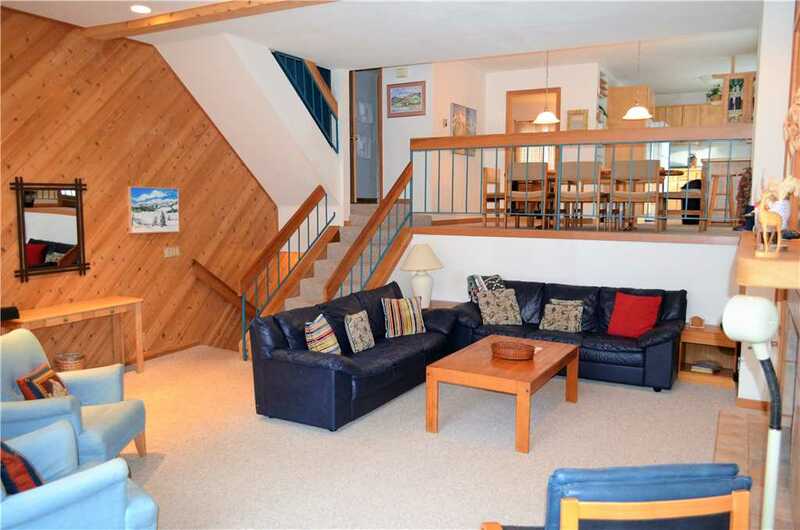 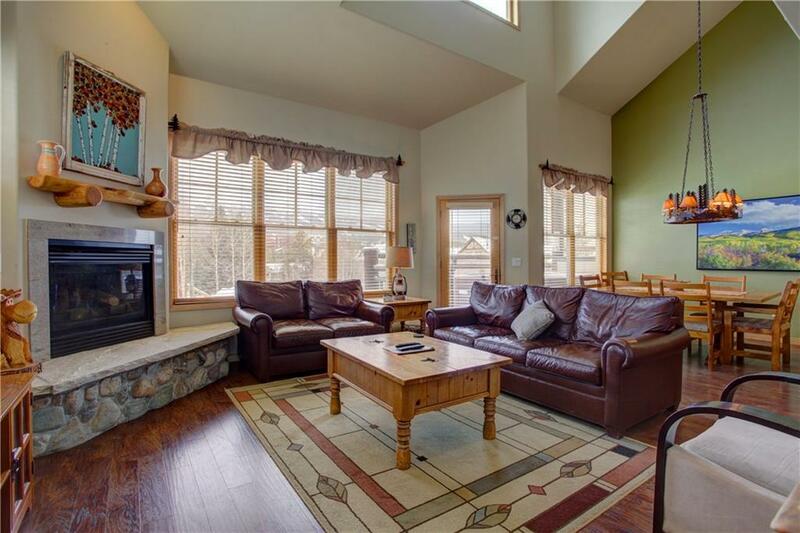 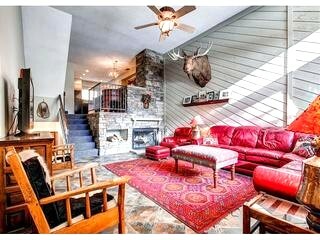 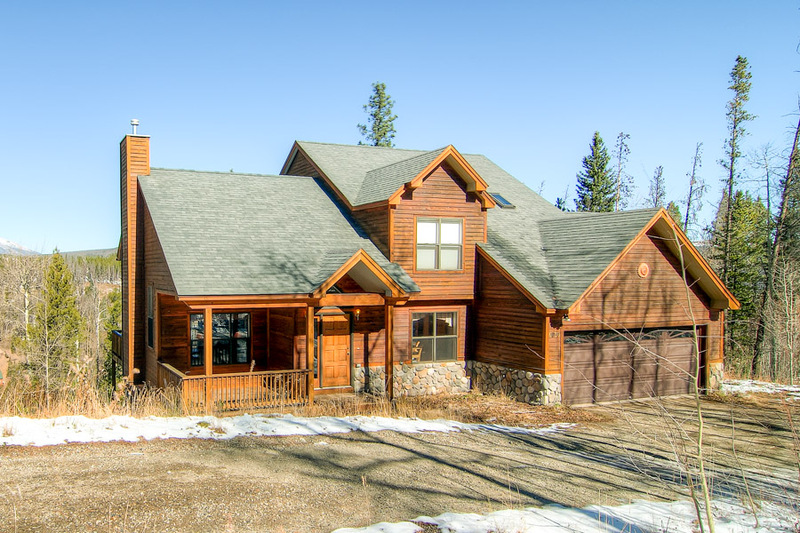 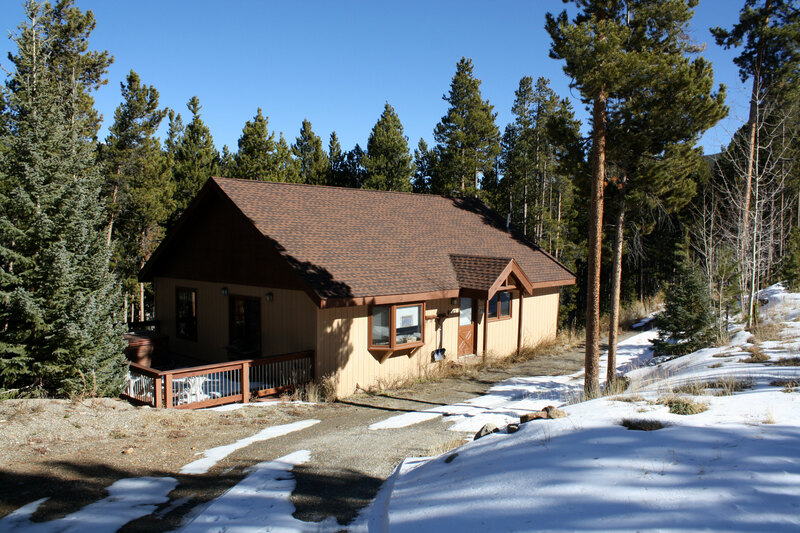 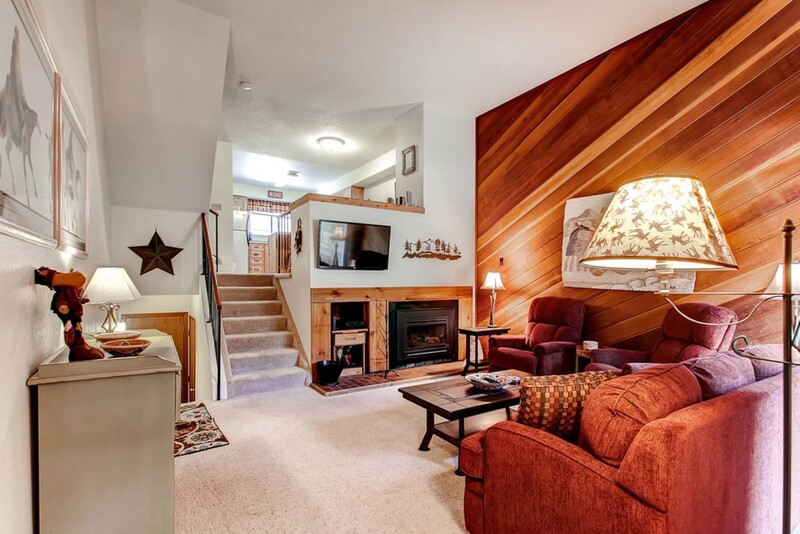 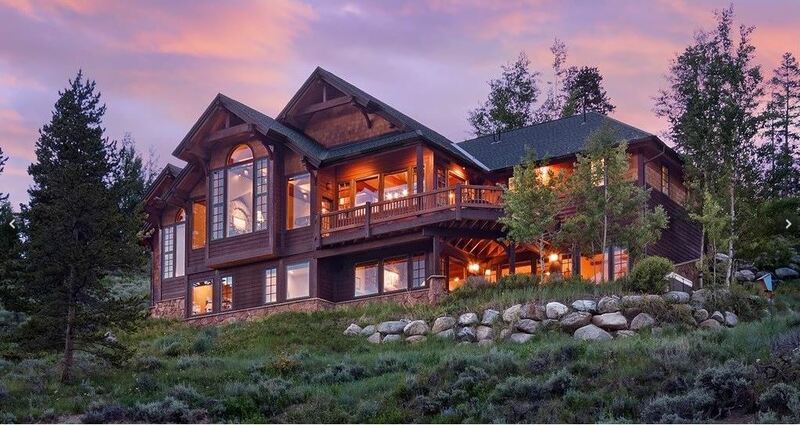 Just up the spiral staircase is the loft and large king master suite with a full private bath. 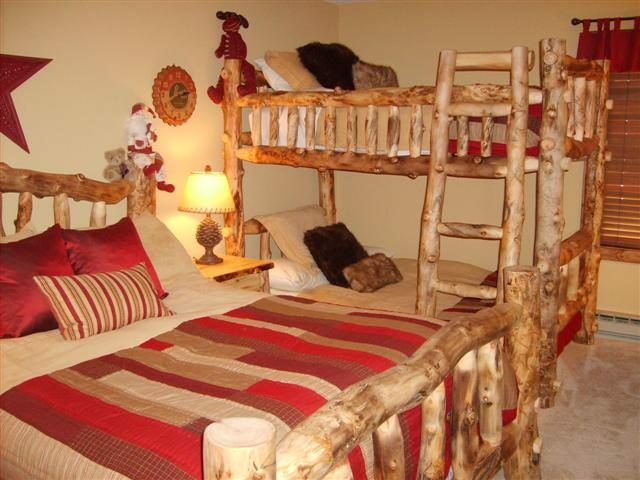 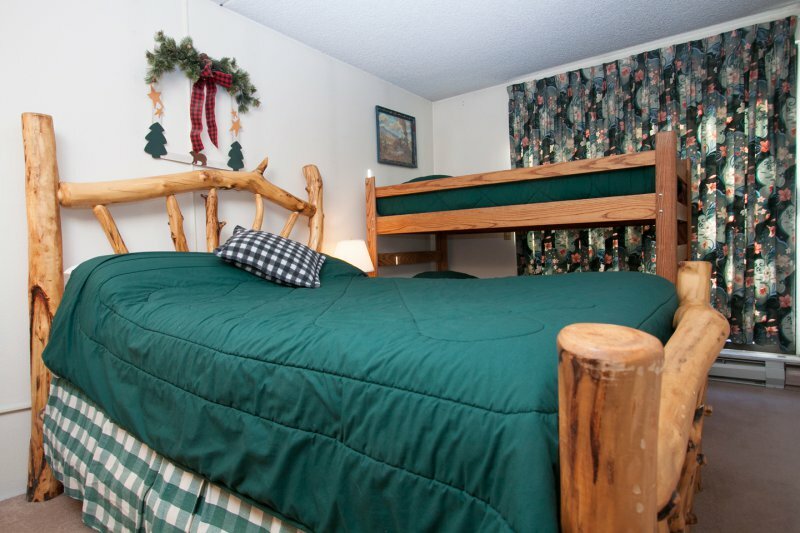 The loft area has two twin beds for extra sleeping flexibility. 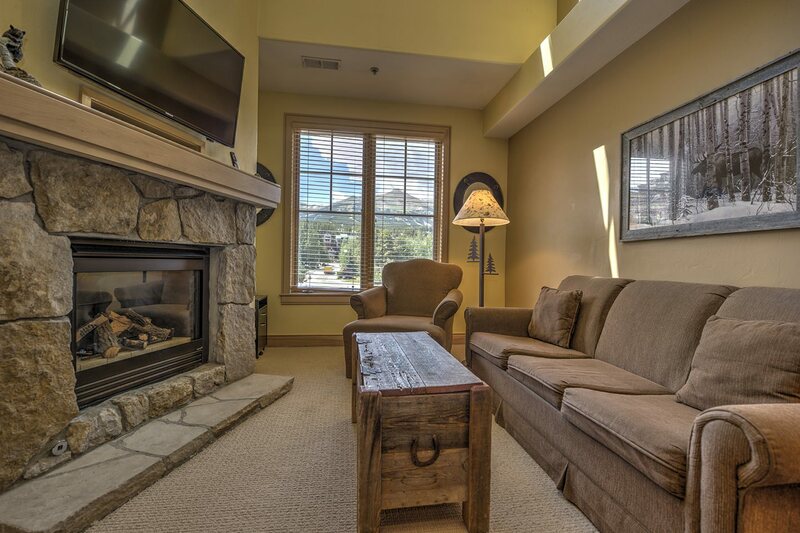 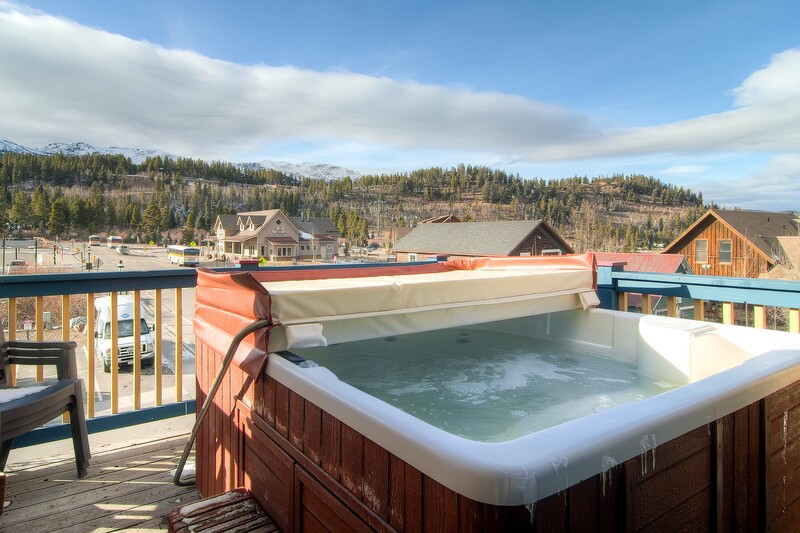 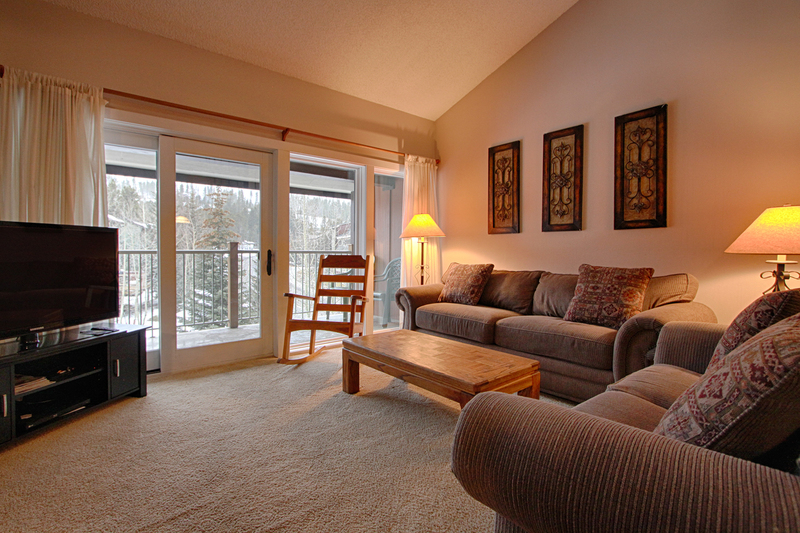 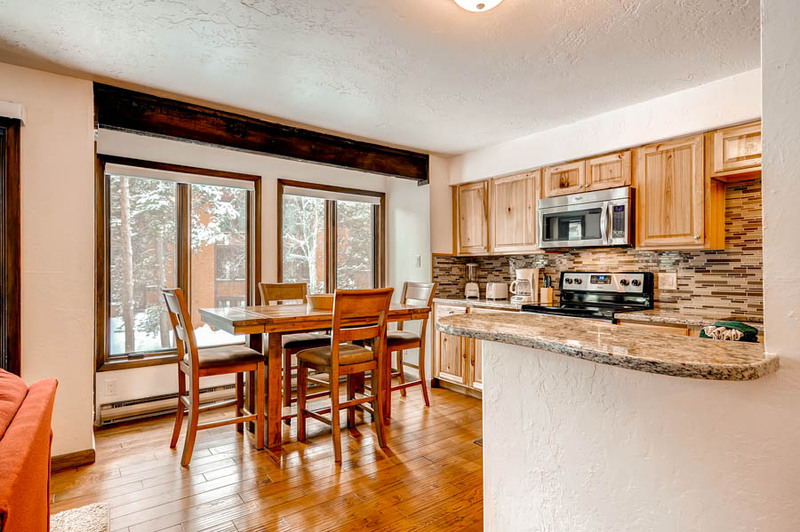 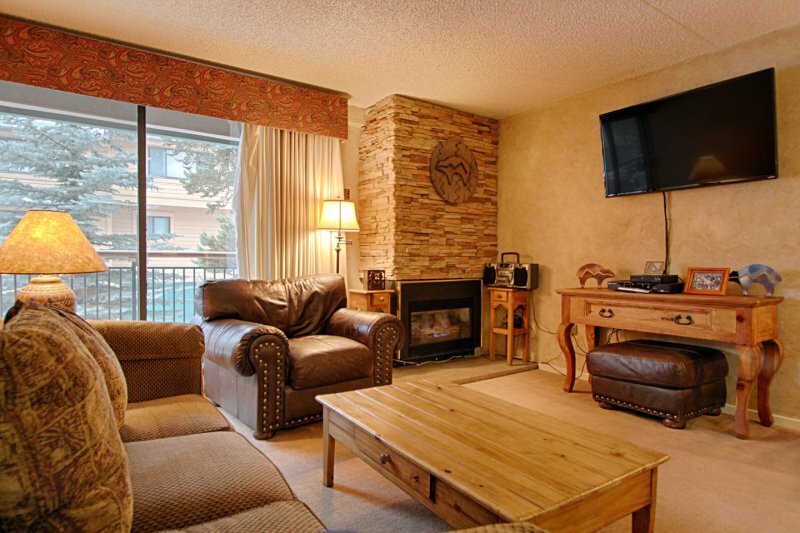 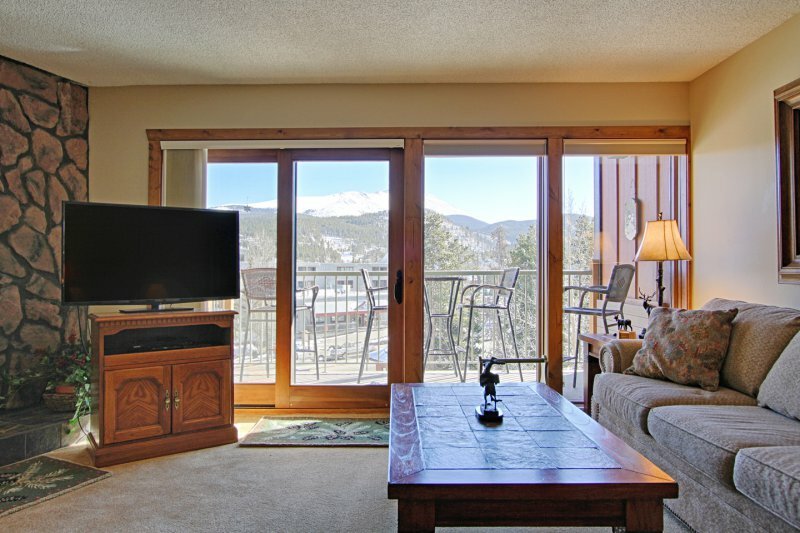 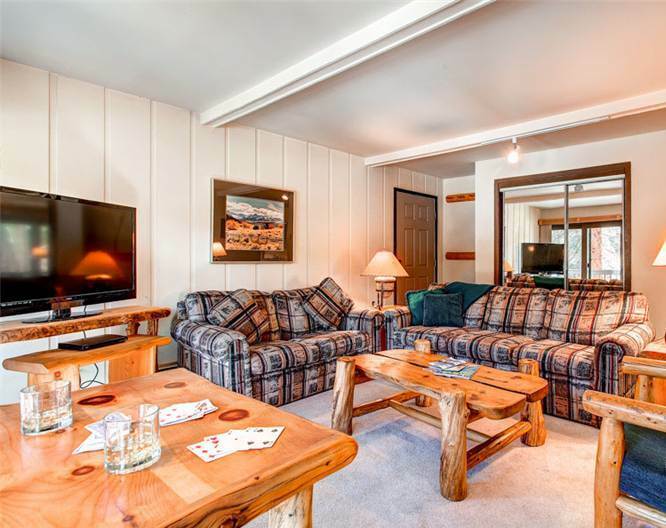 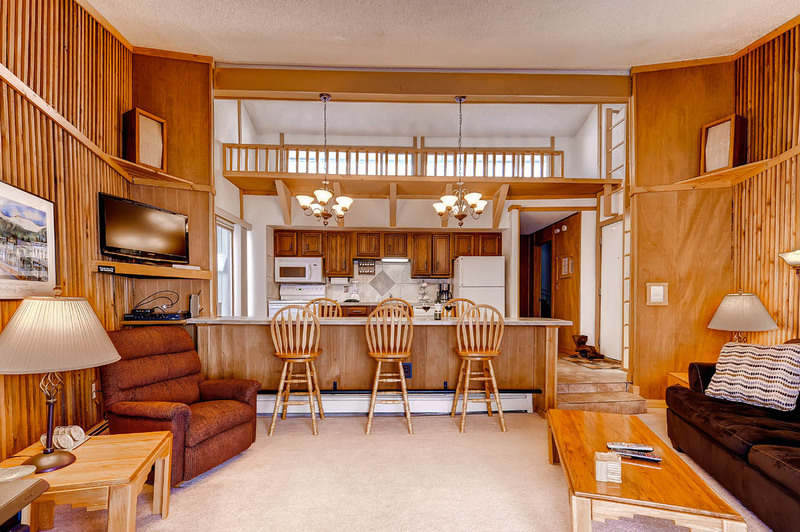 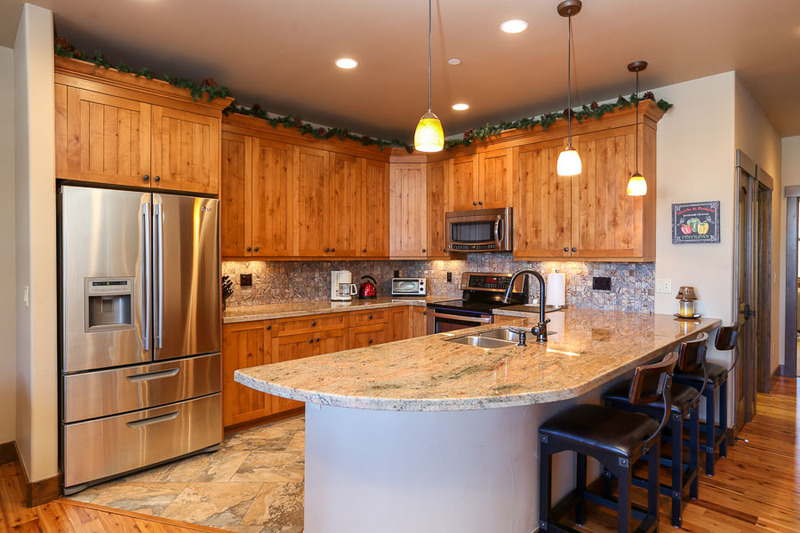 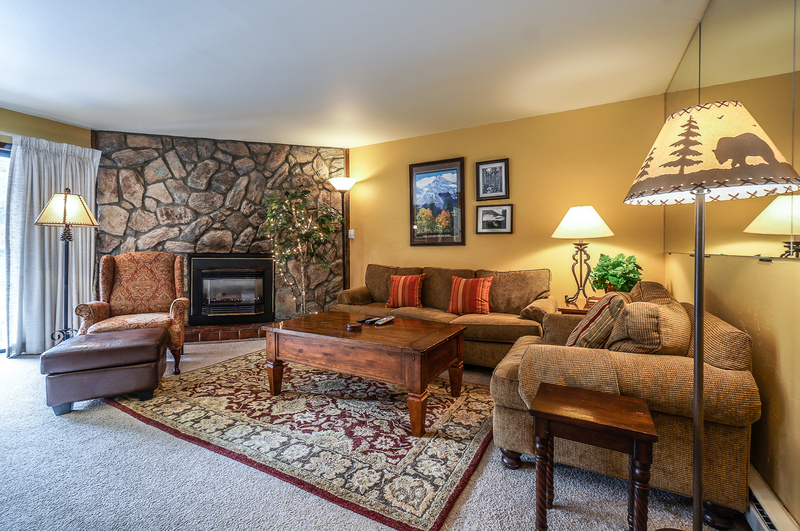 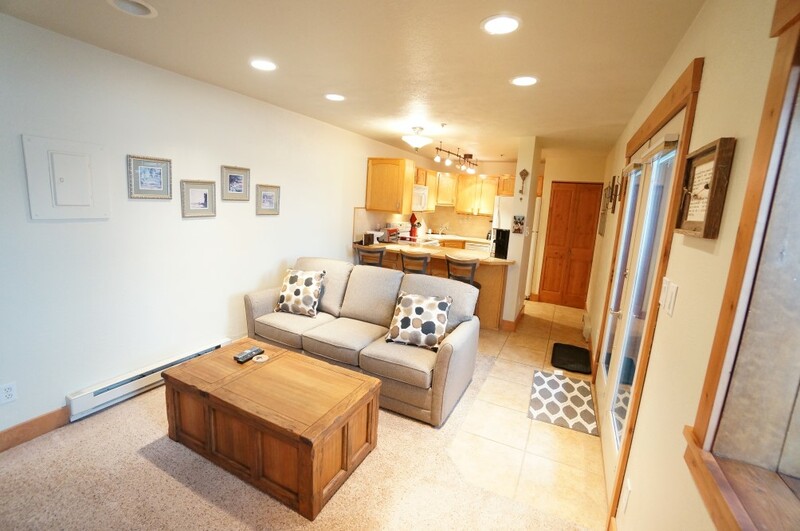 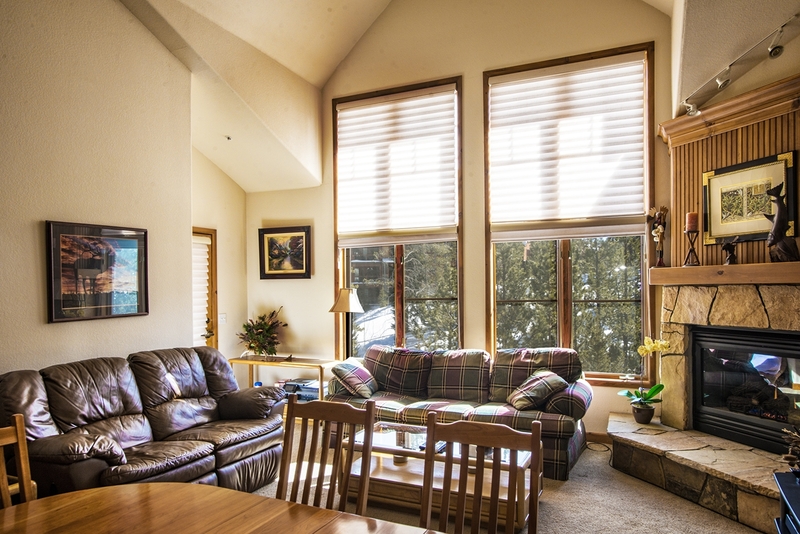 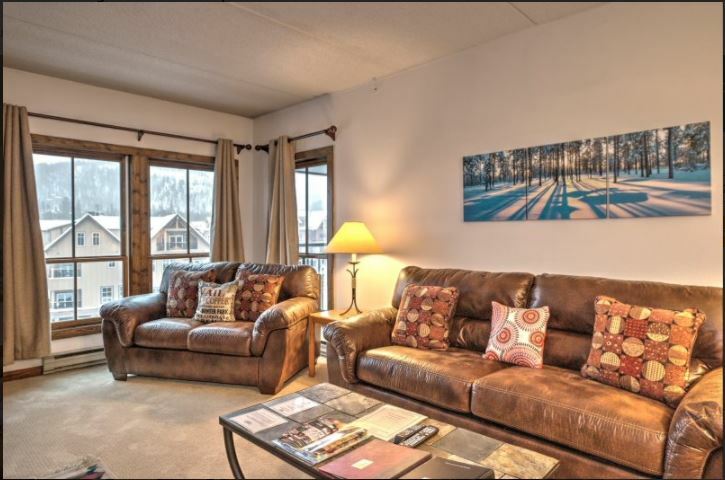 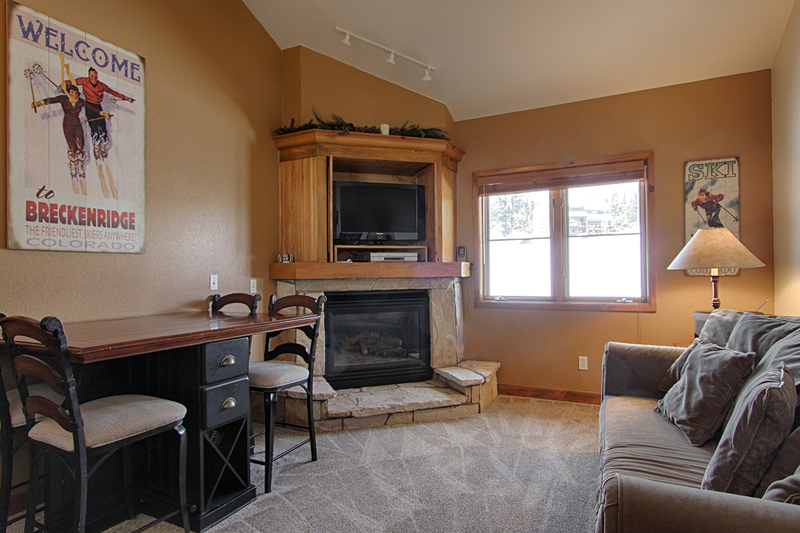 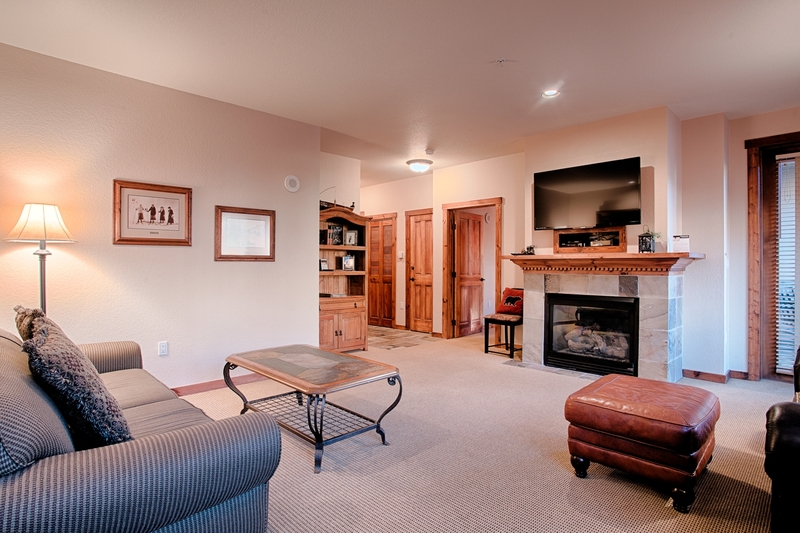 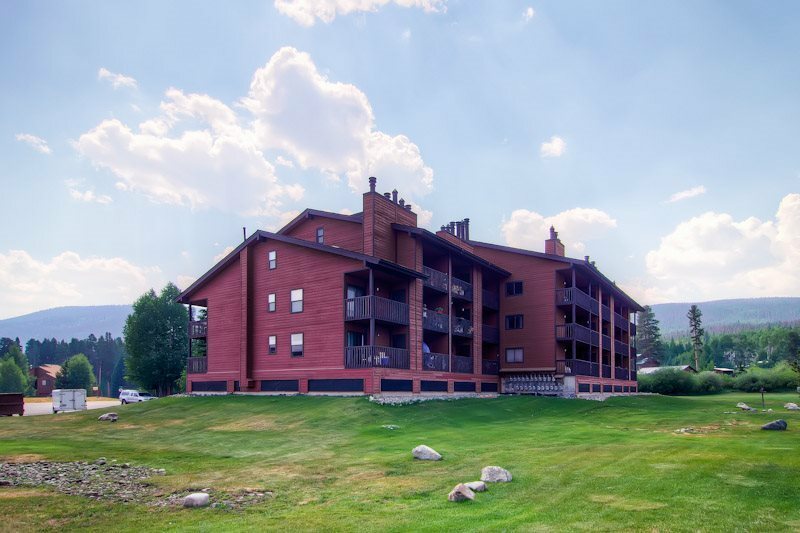 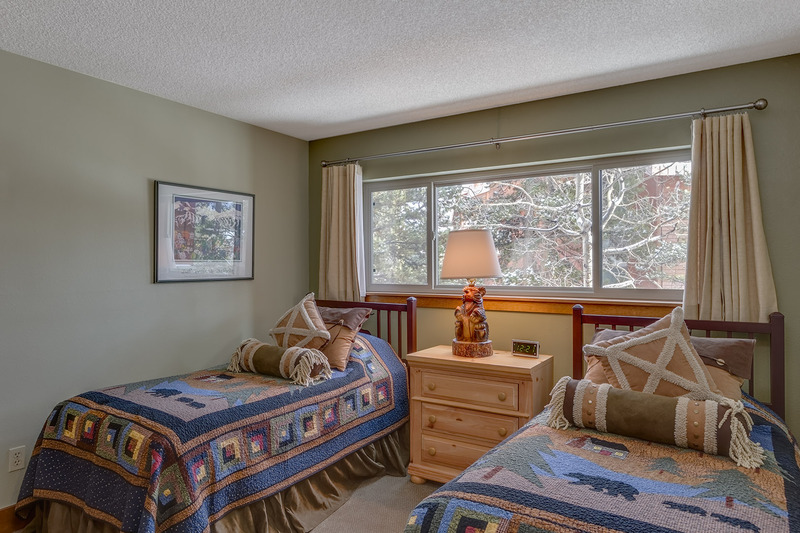 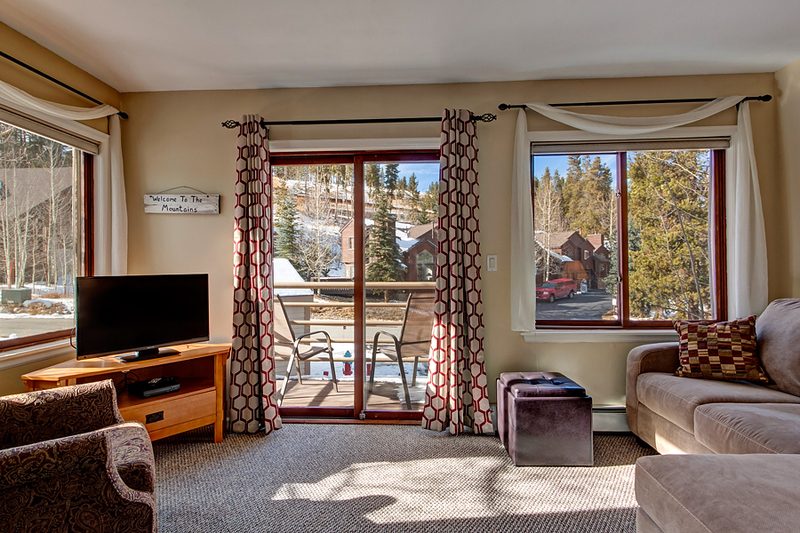 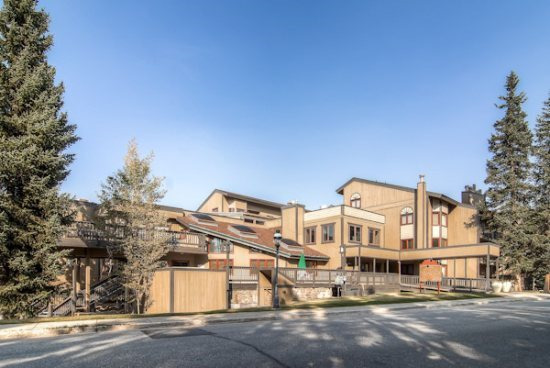 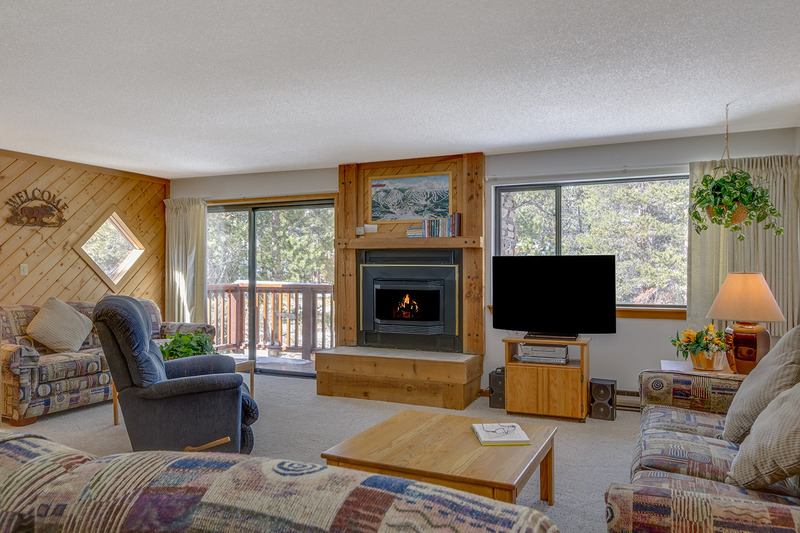 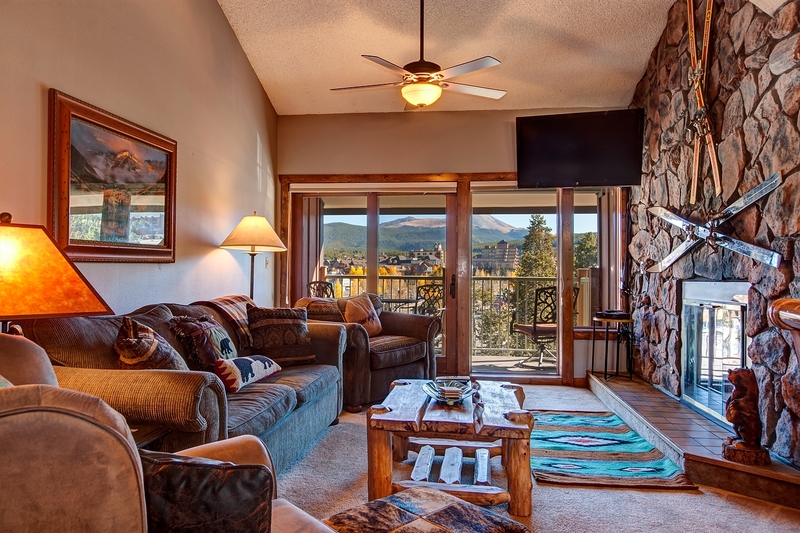 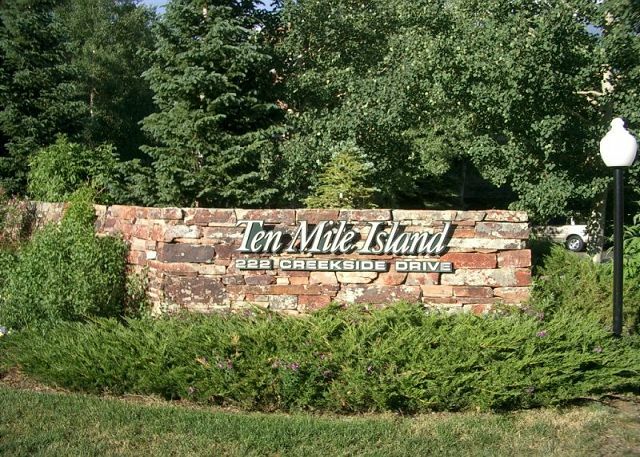 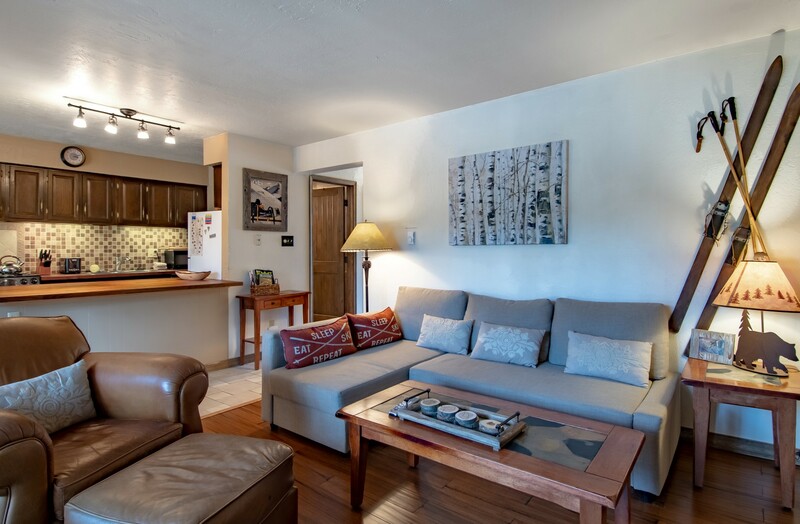 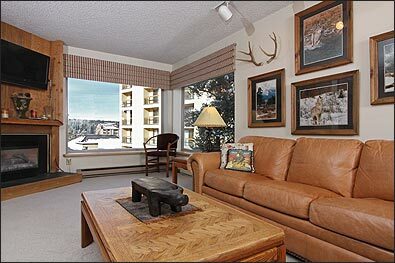 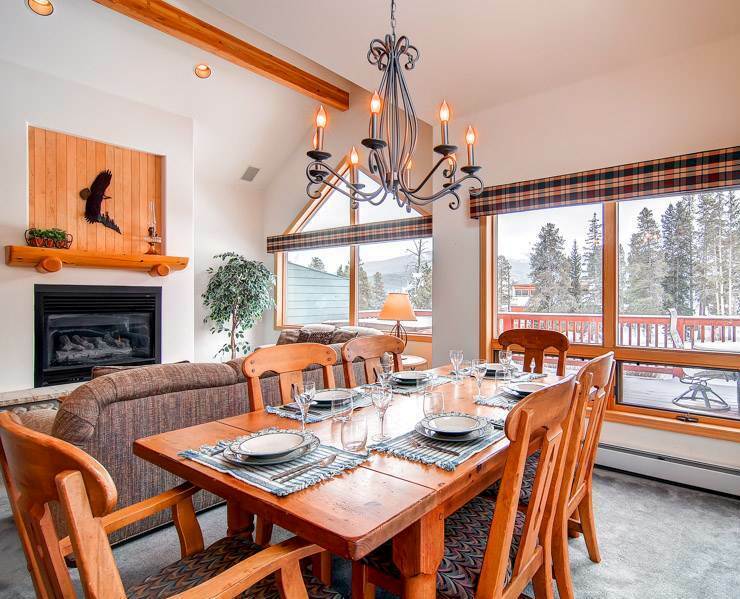 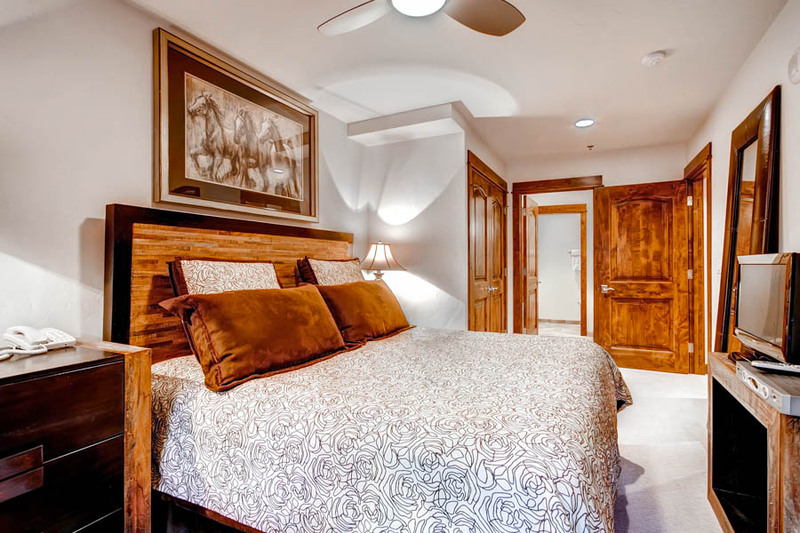 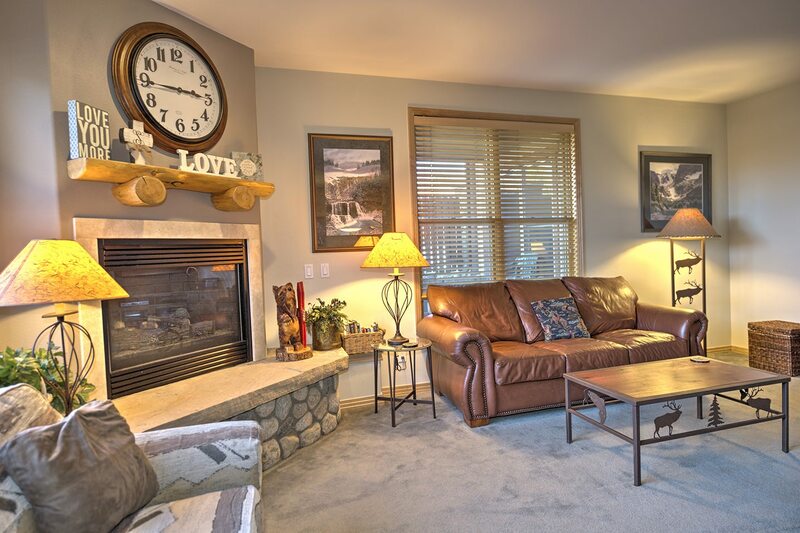 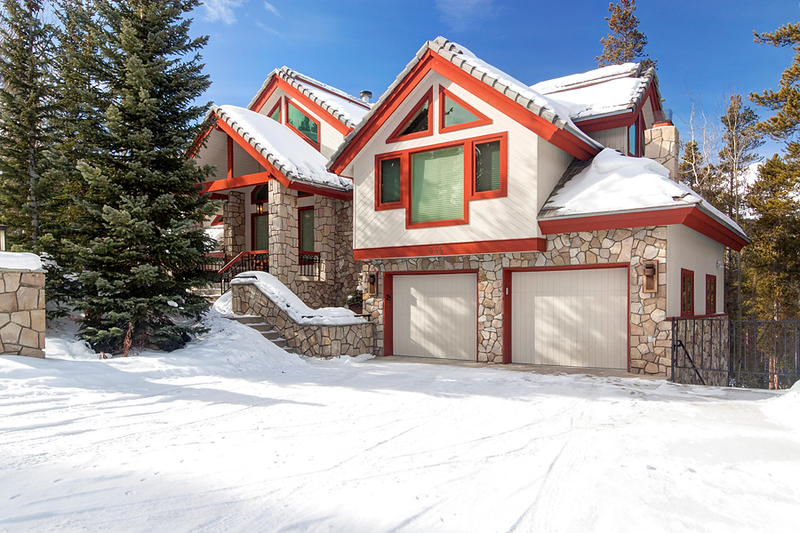 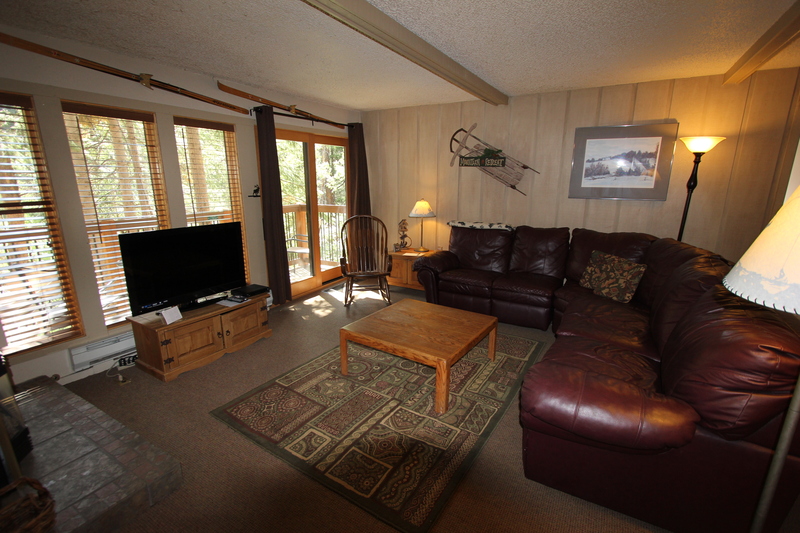 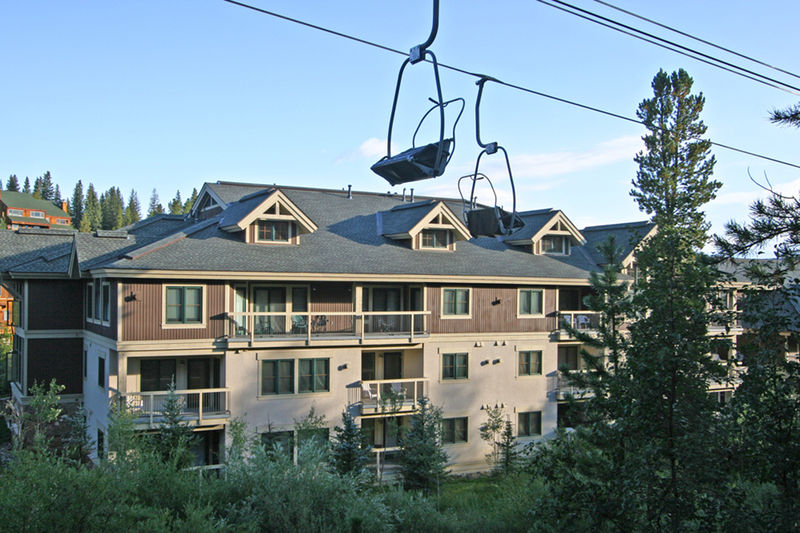 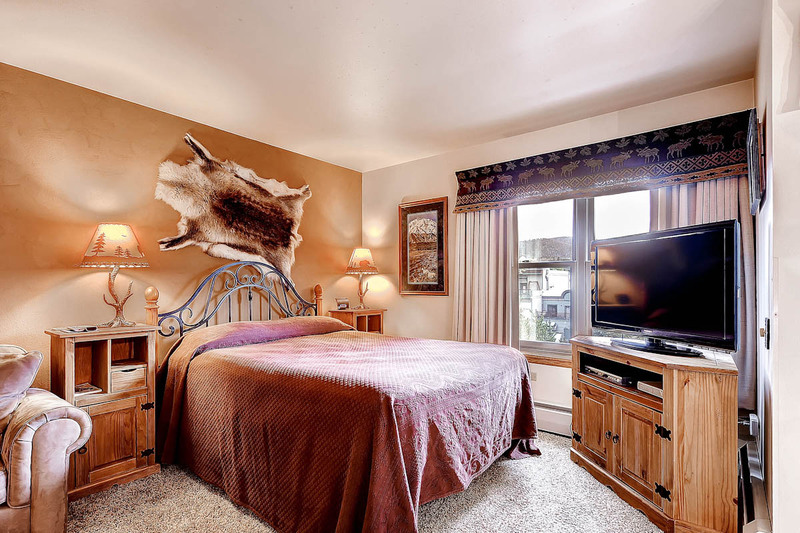 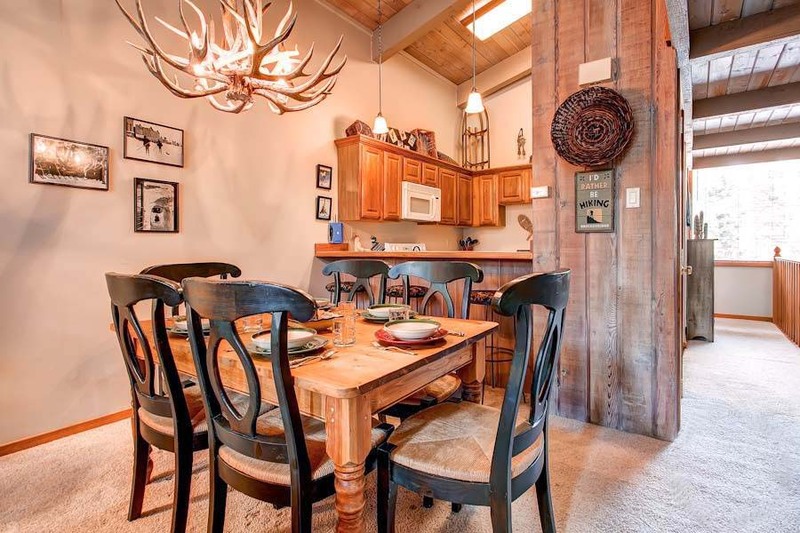 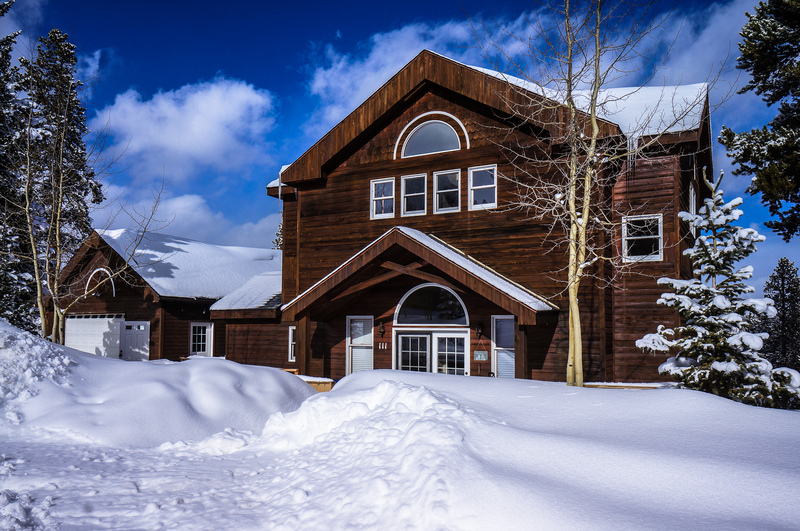 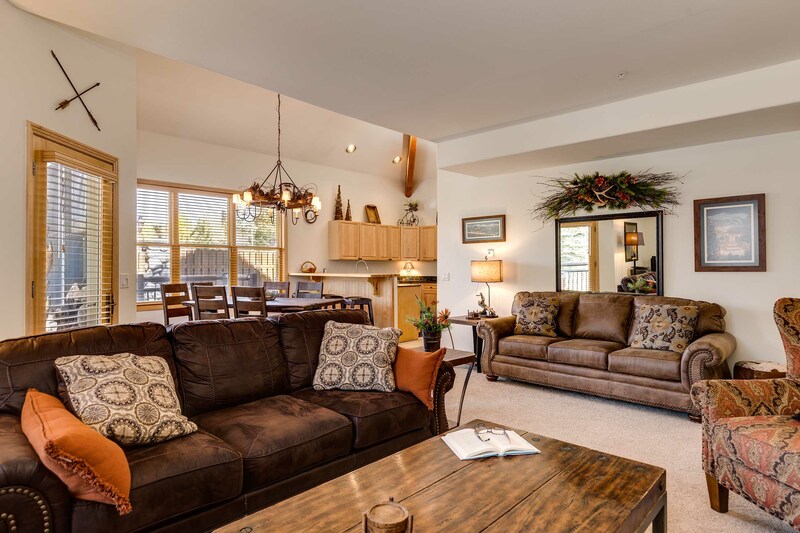 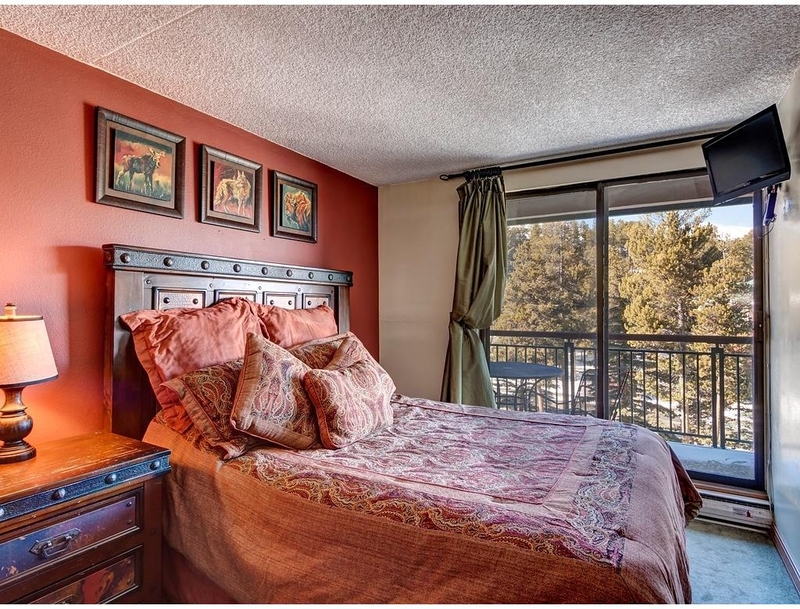 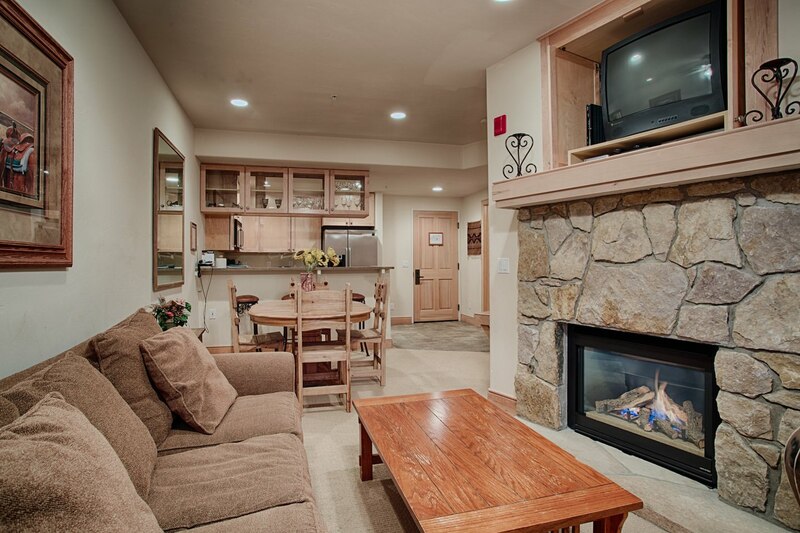 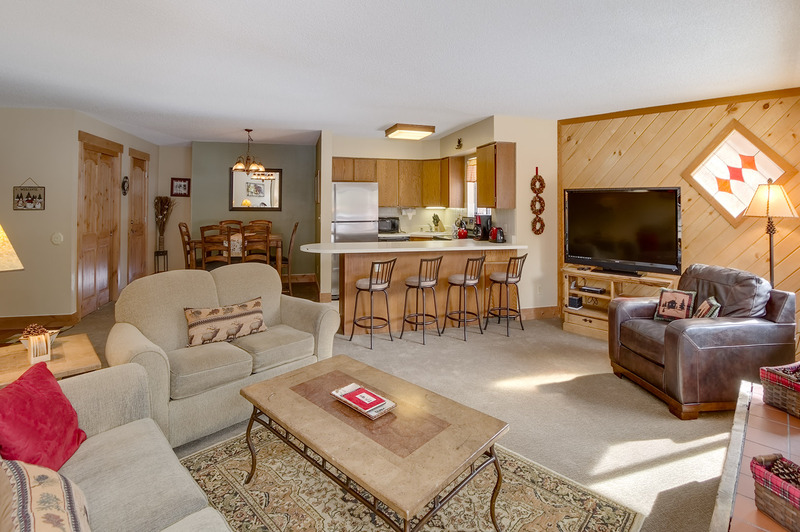 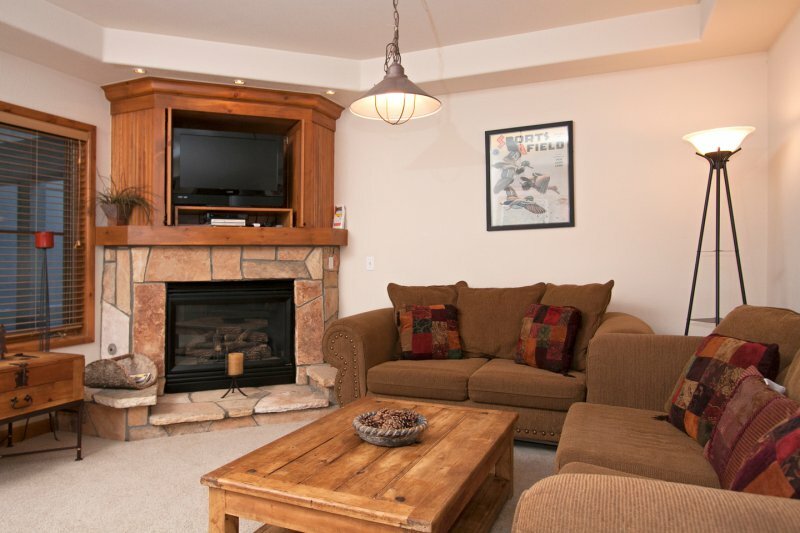 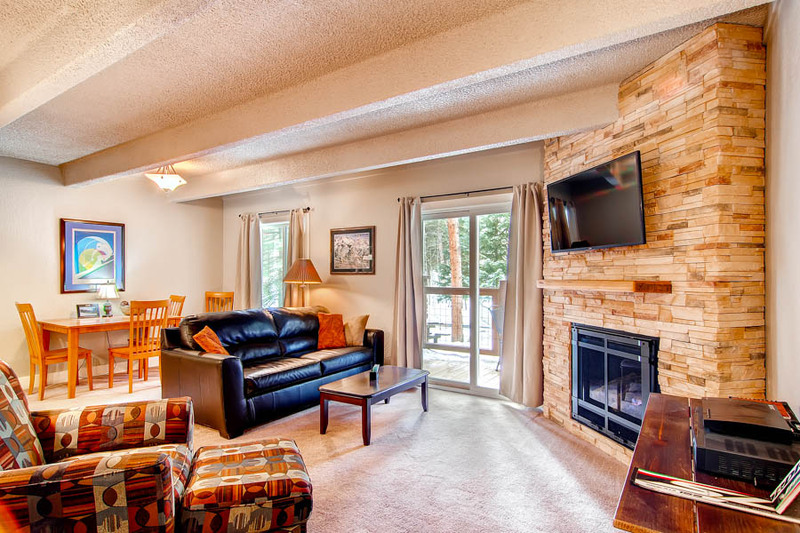 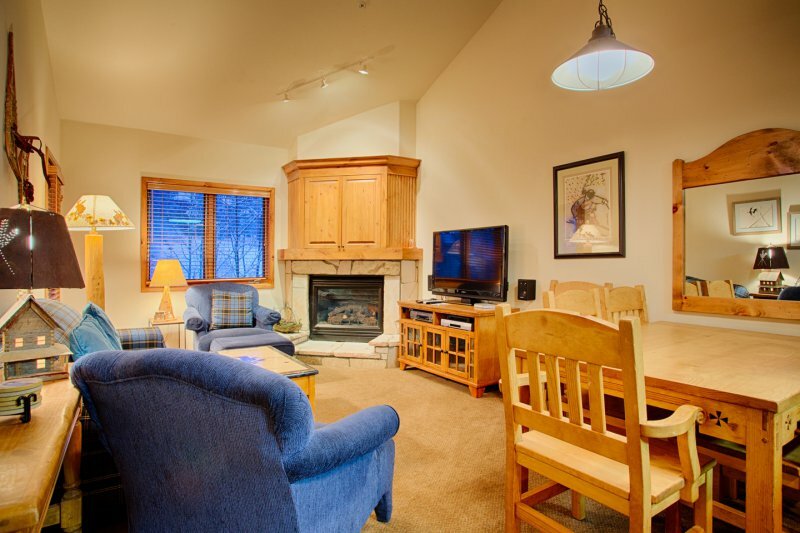 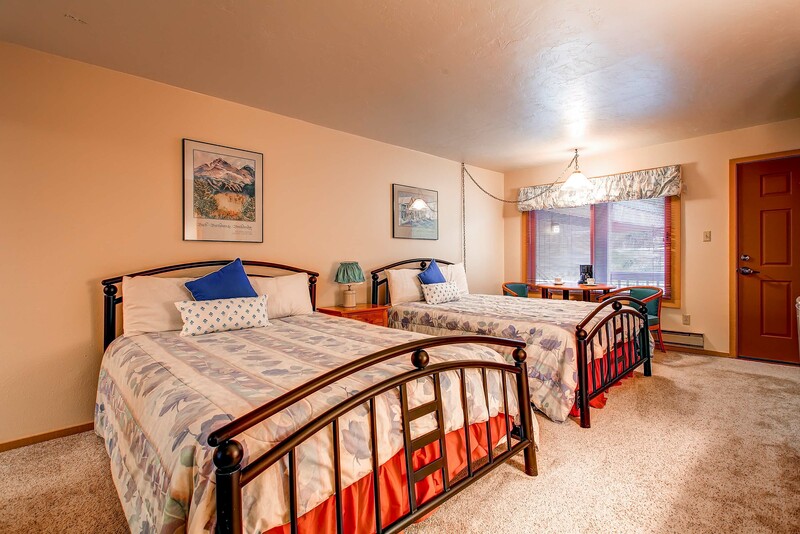 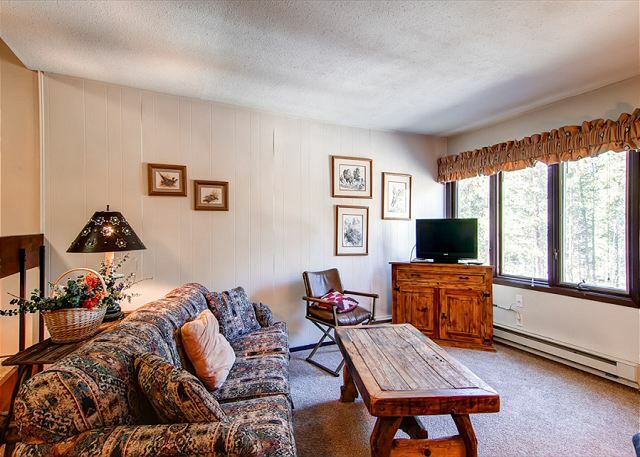 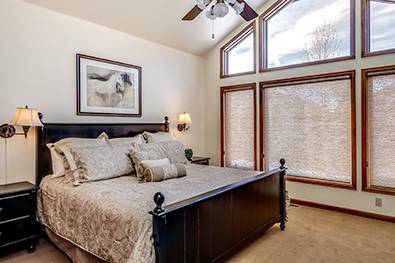 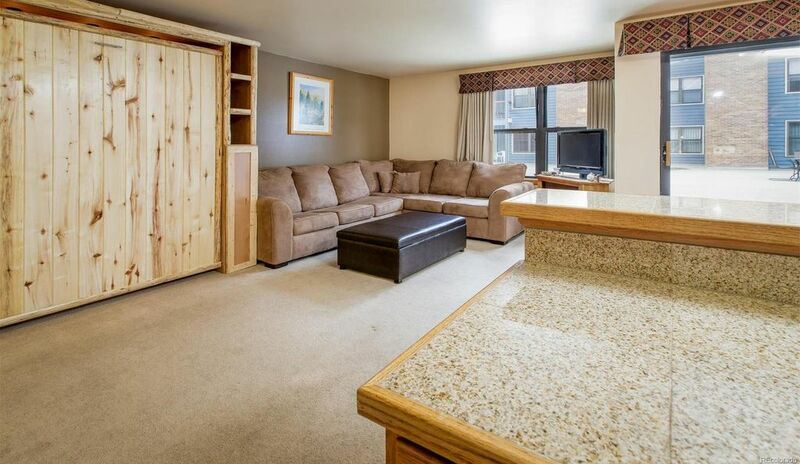 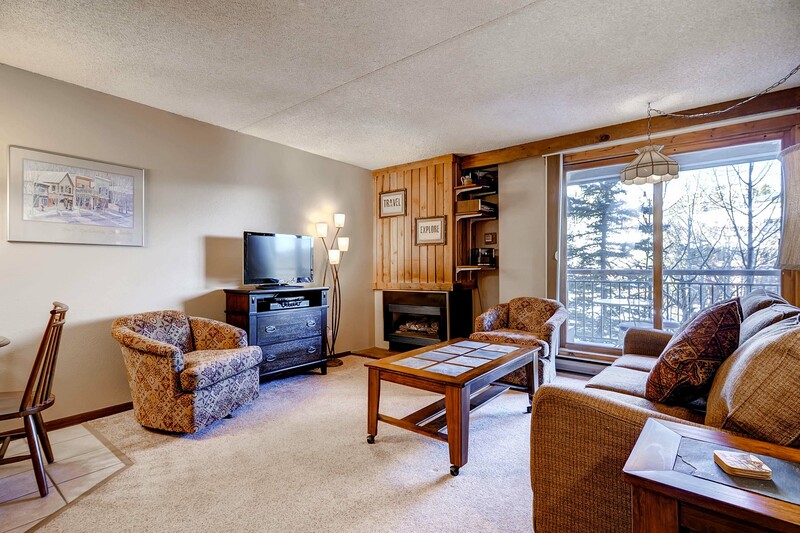 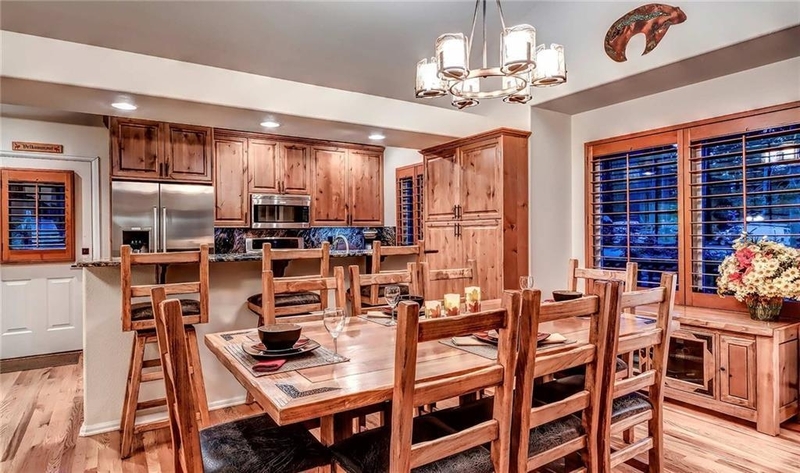 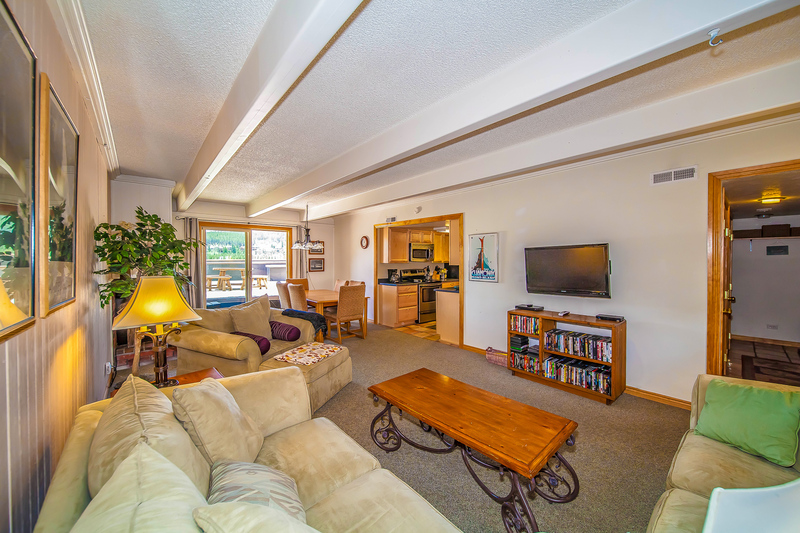 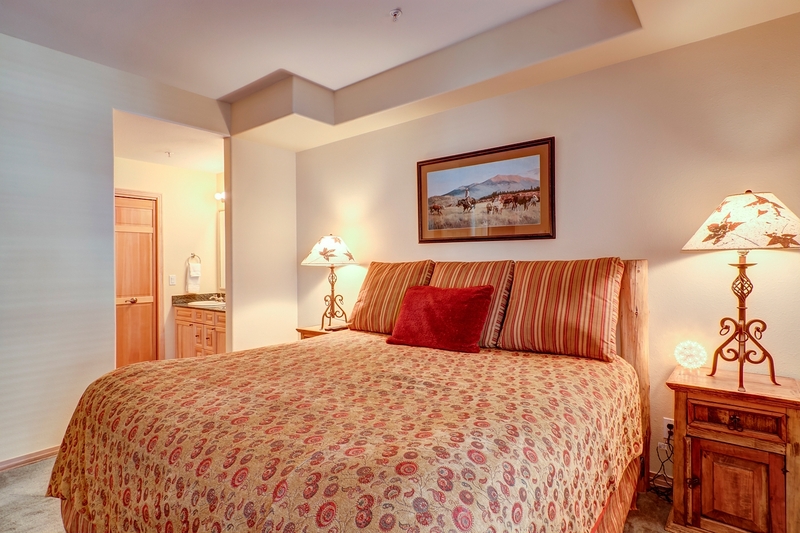 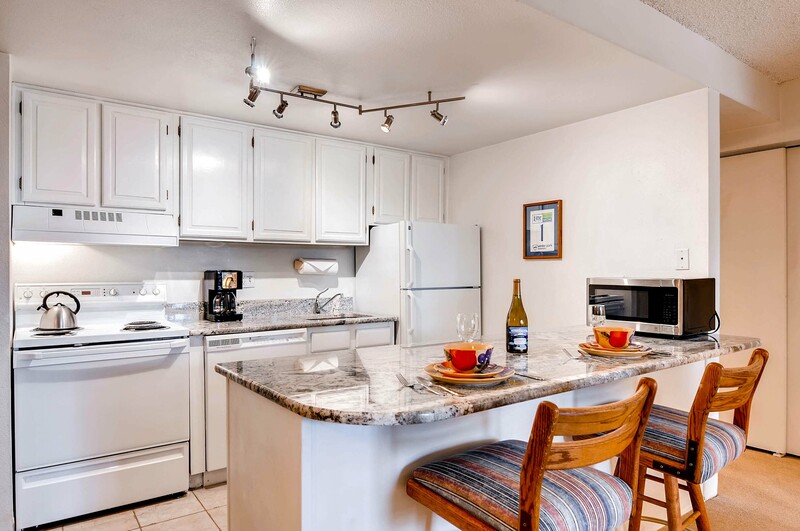 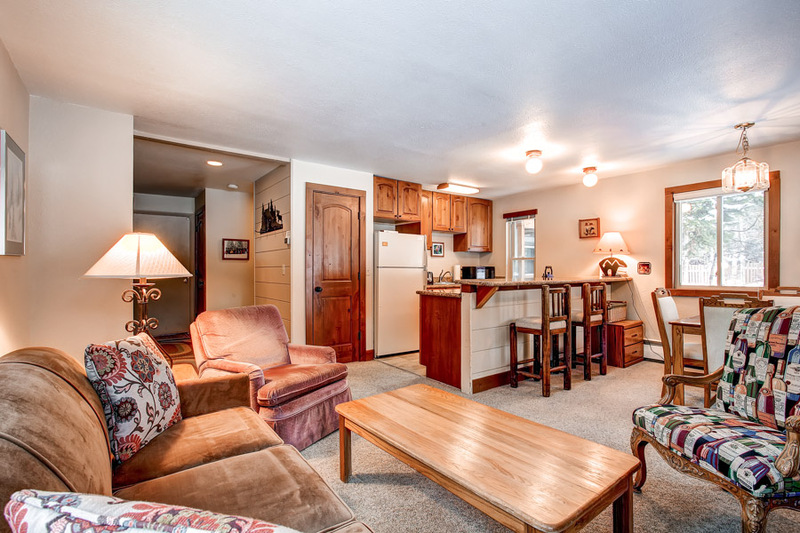 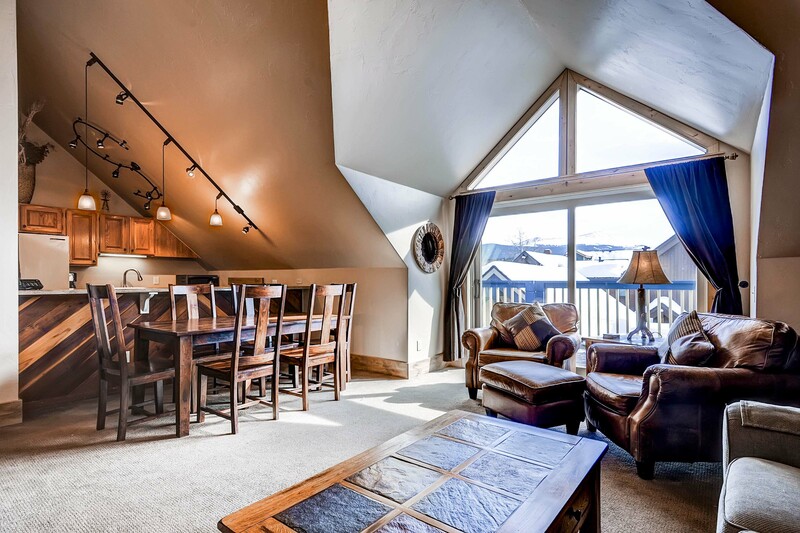 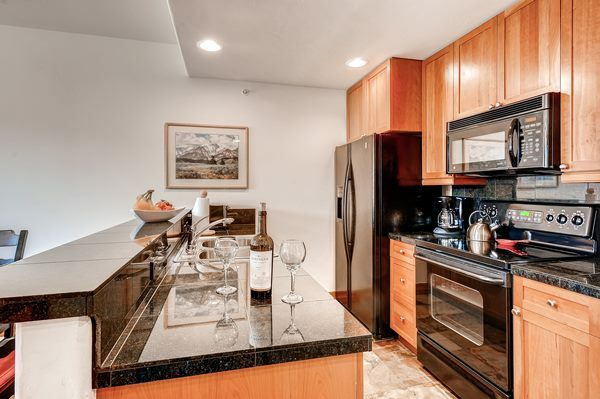 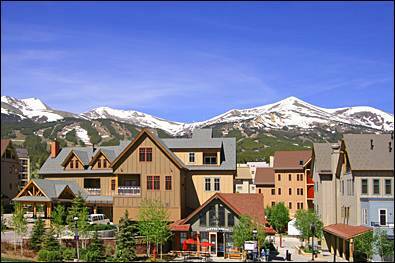 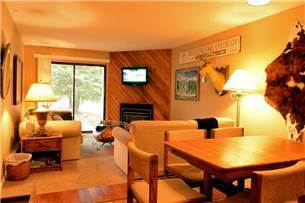 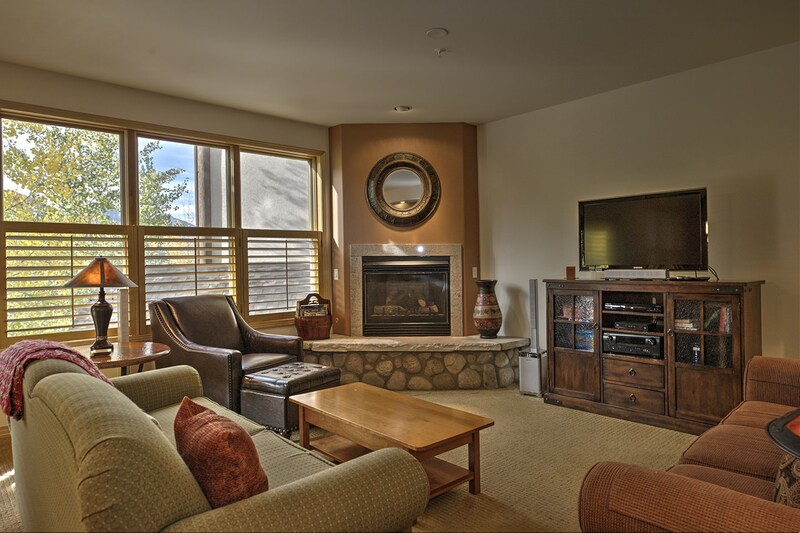 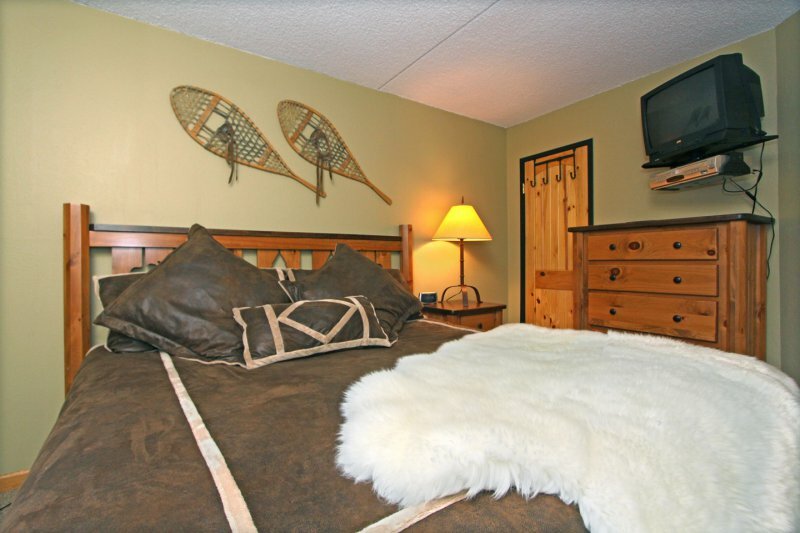 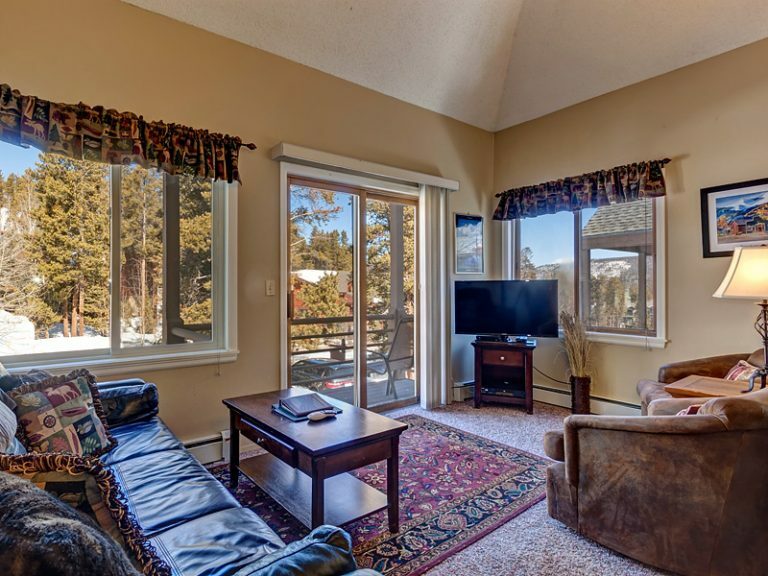 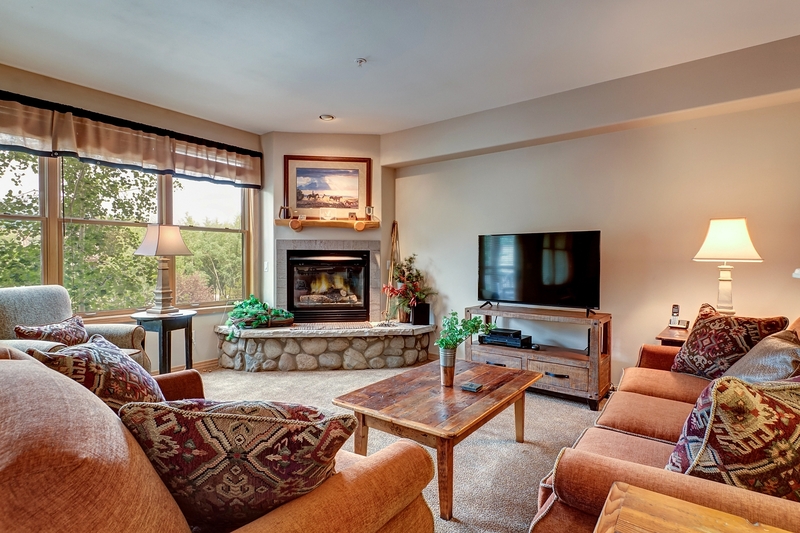 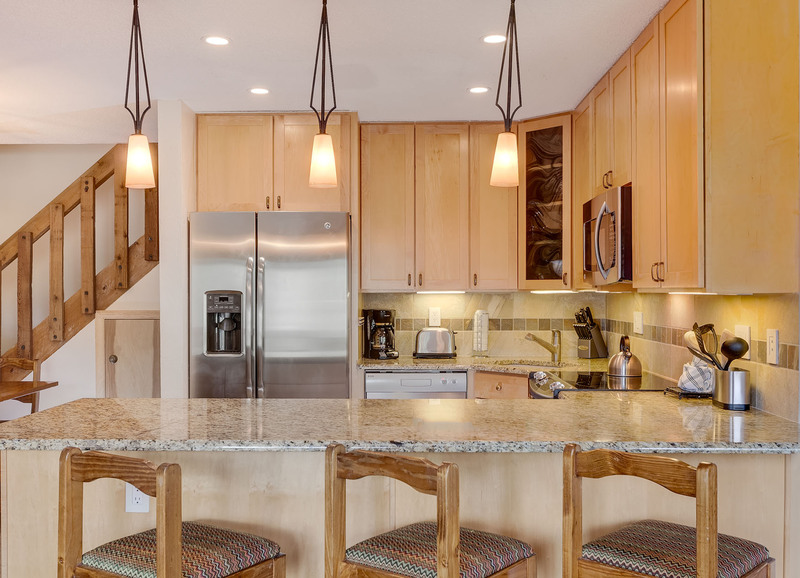 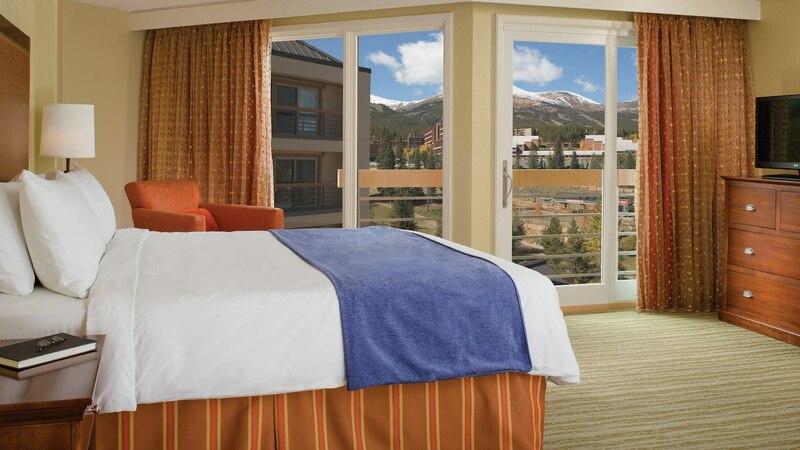 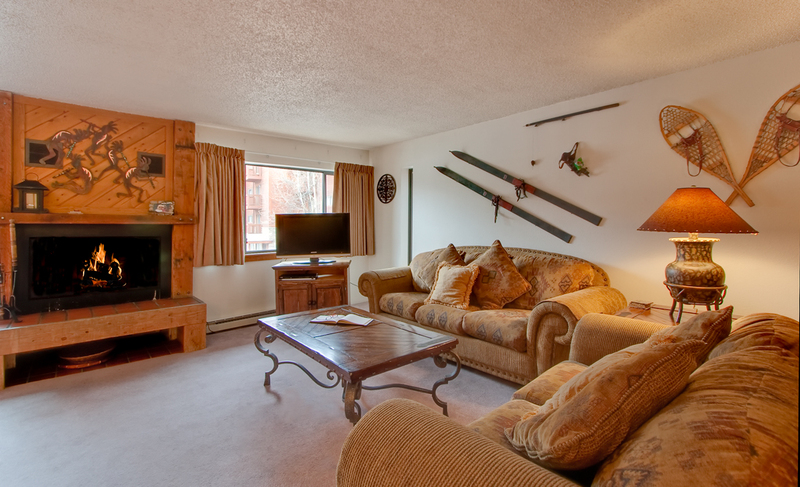 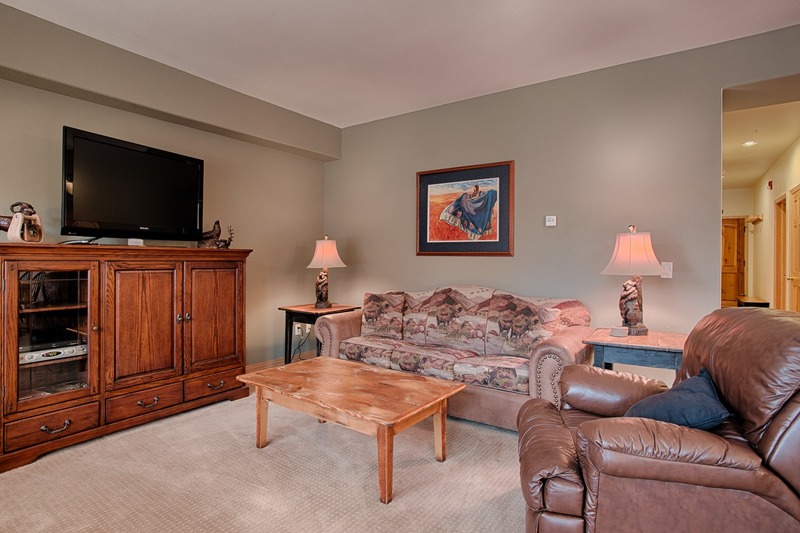 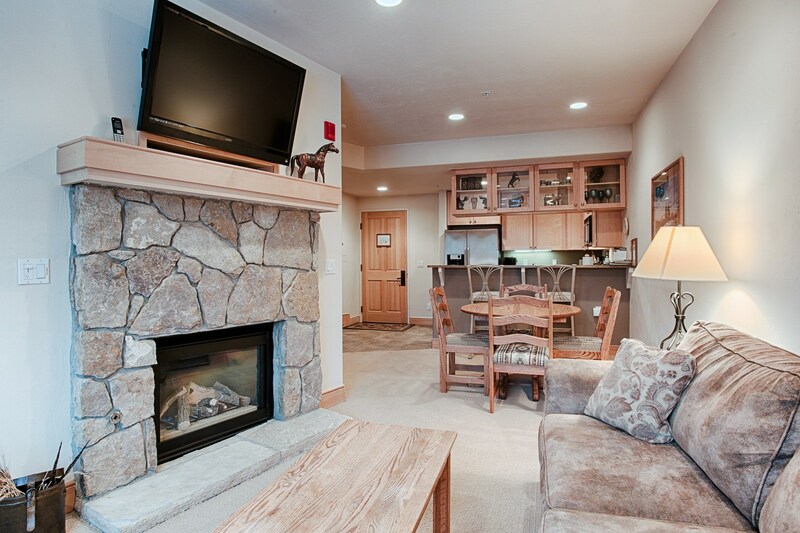 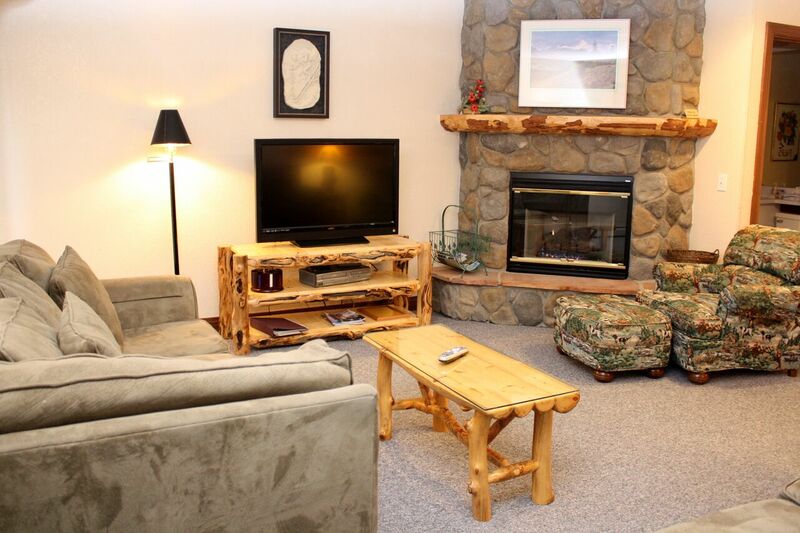 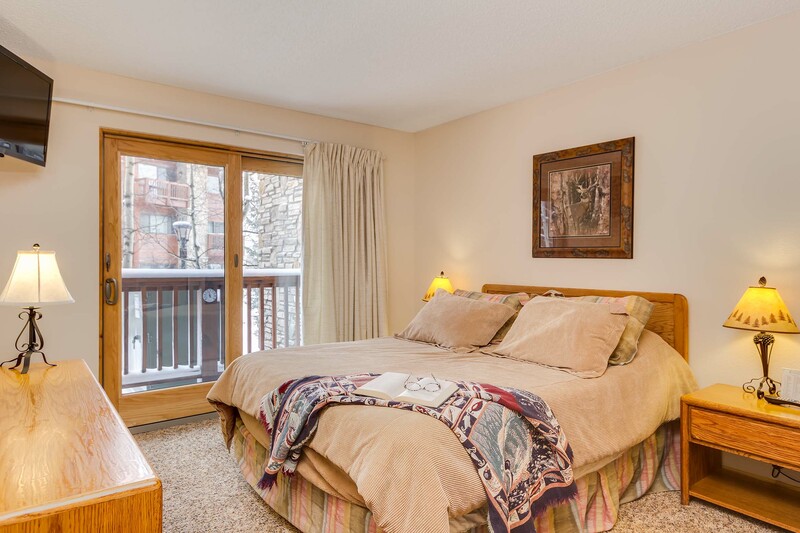 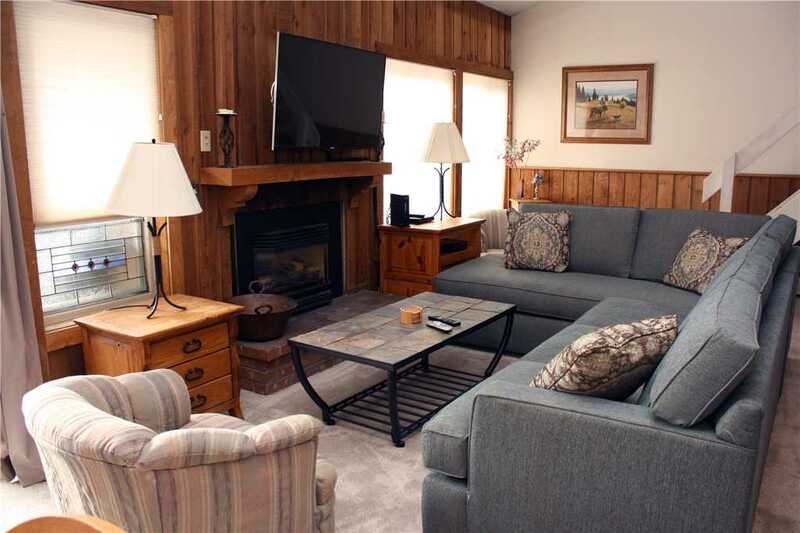 There’s complimentary Wi-Fi throughout the complex, as well as an underground heated garage, complimentary Wi-Fi, ski storage and laundry facilities. 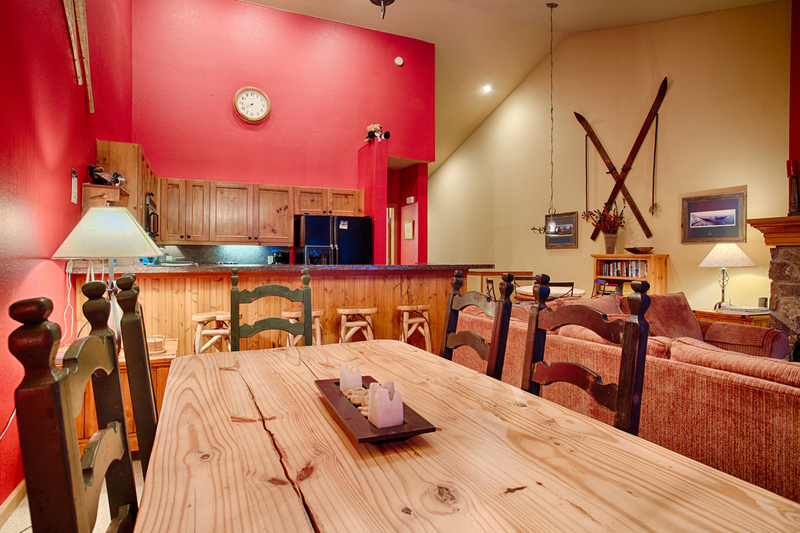 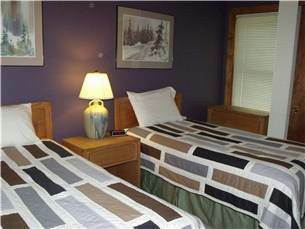 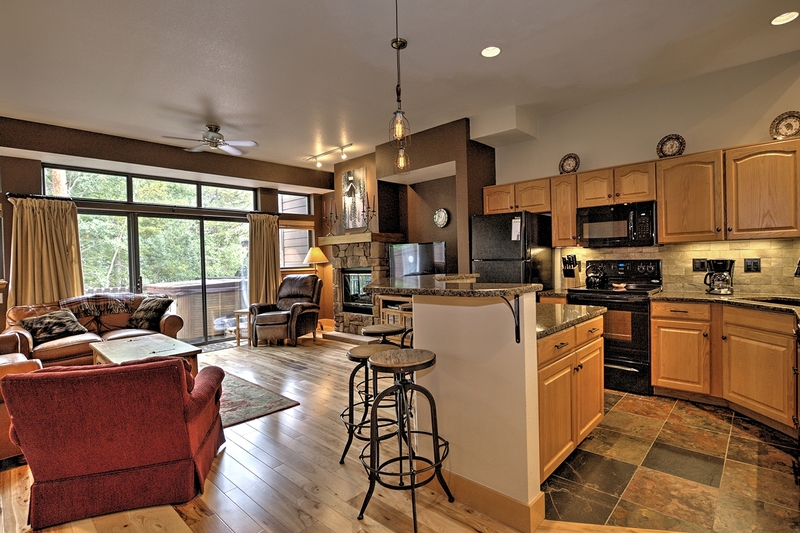 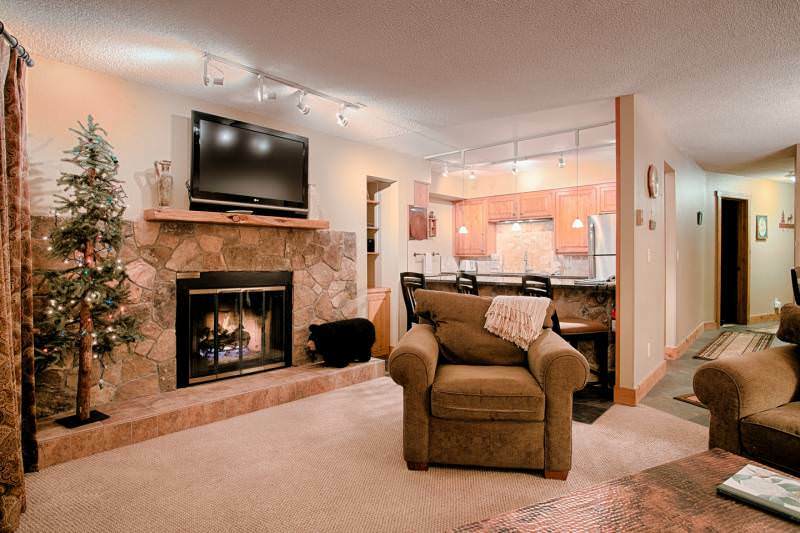 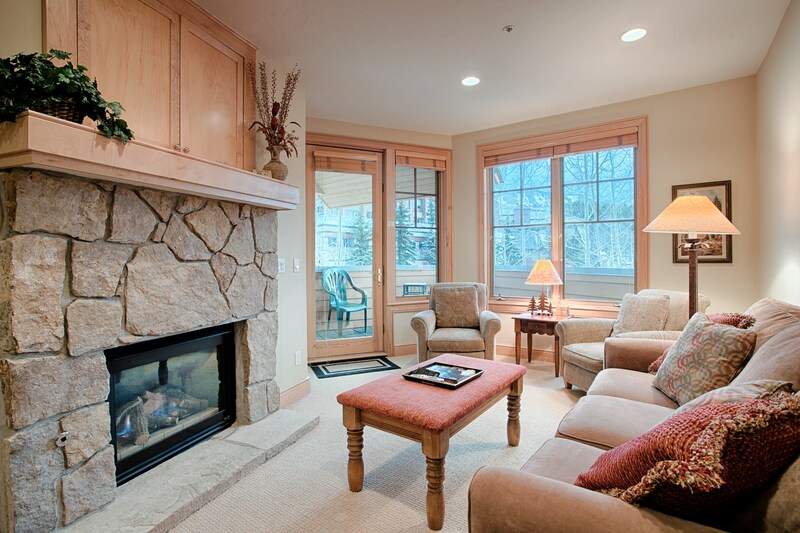 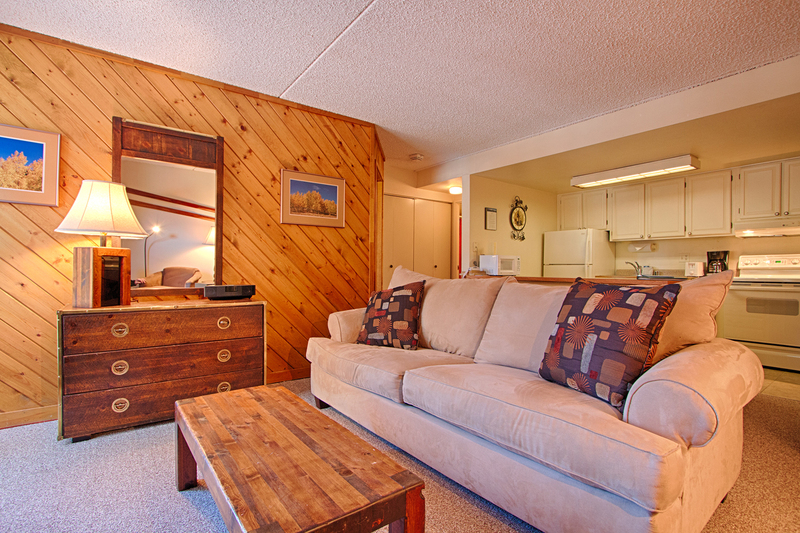 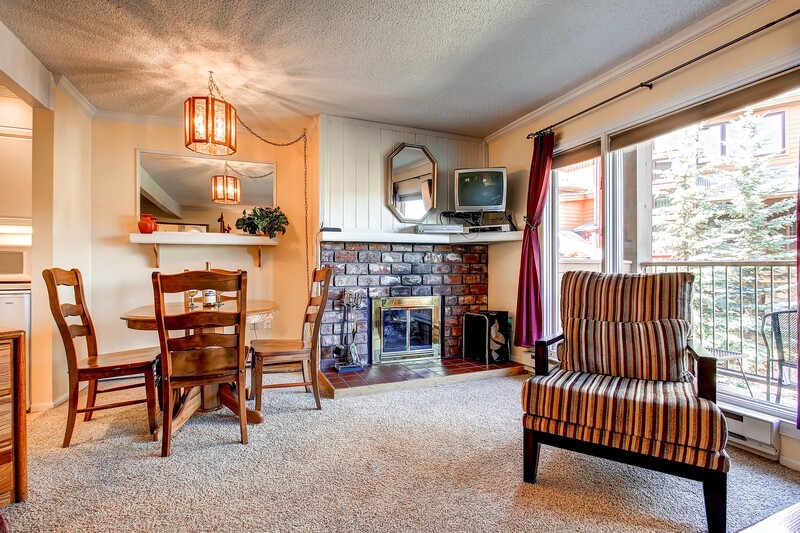 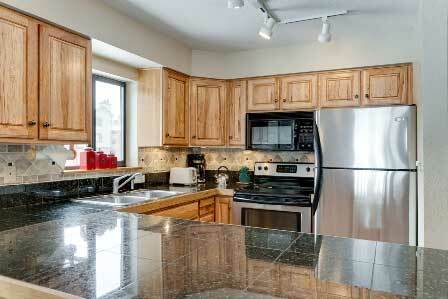 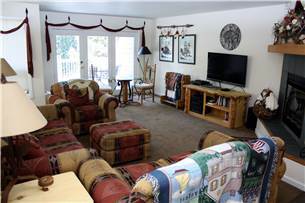 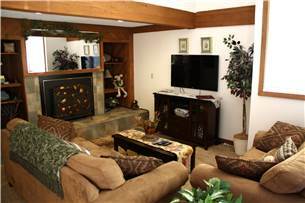 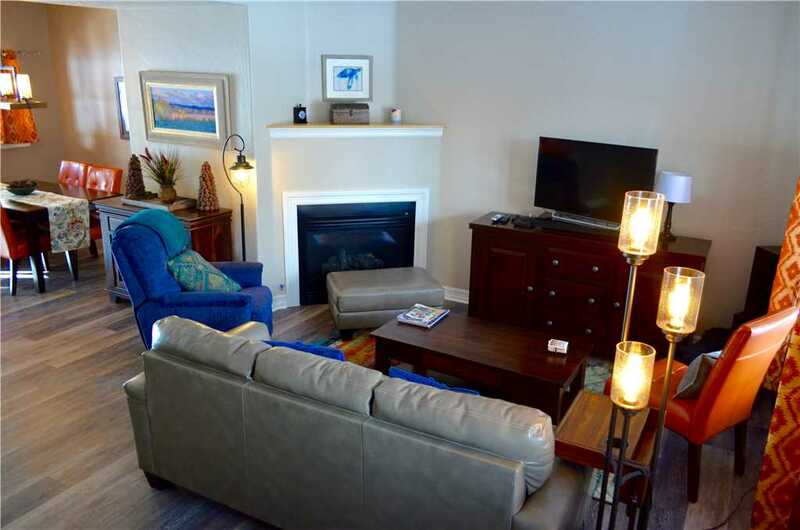 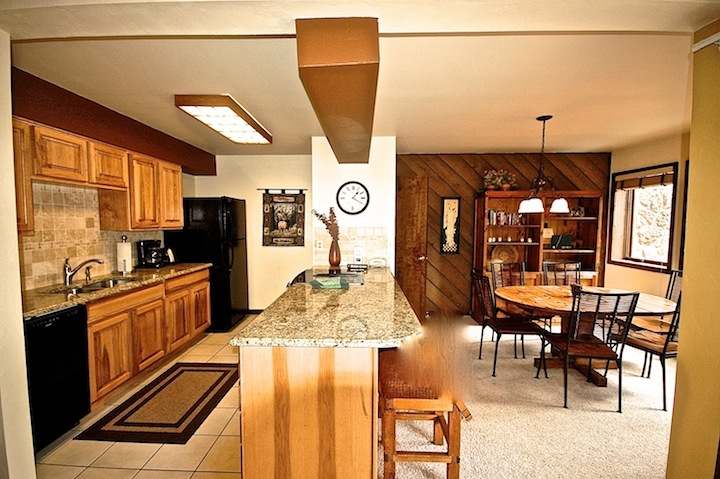 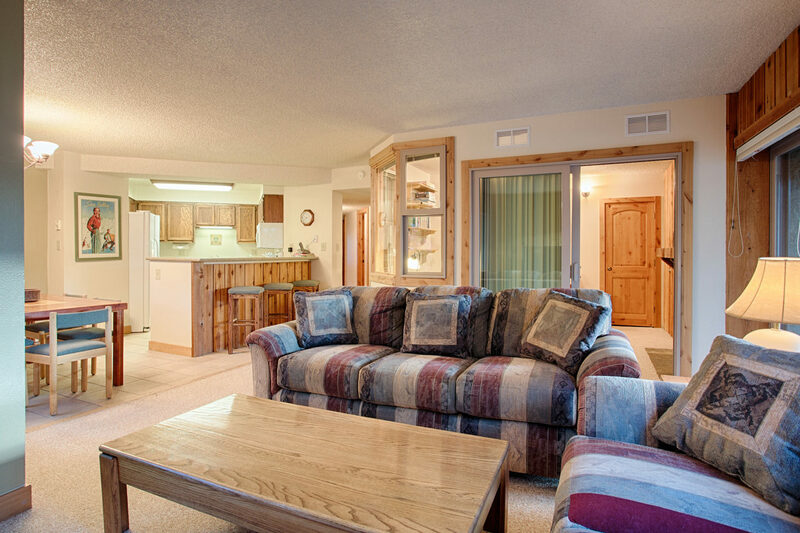 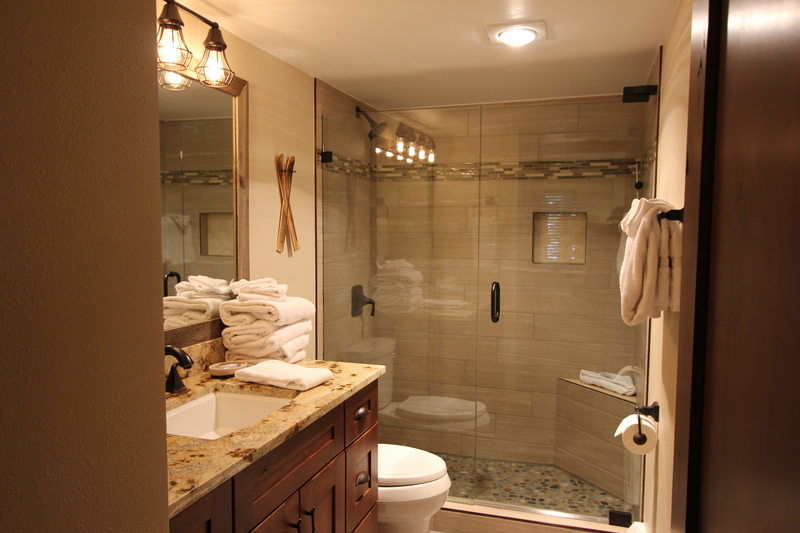 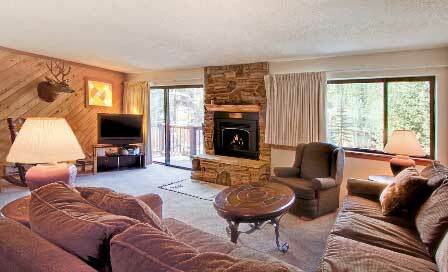 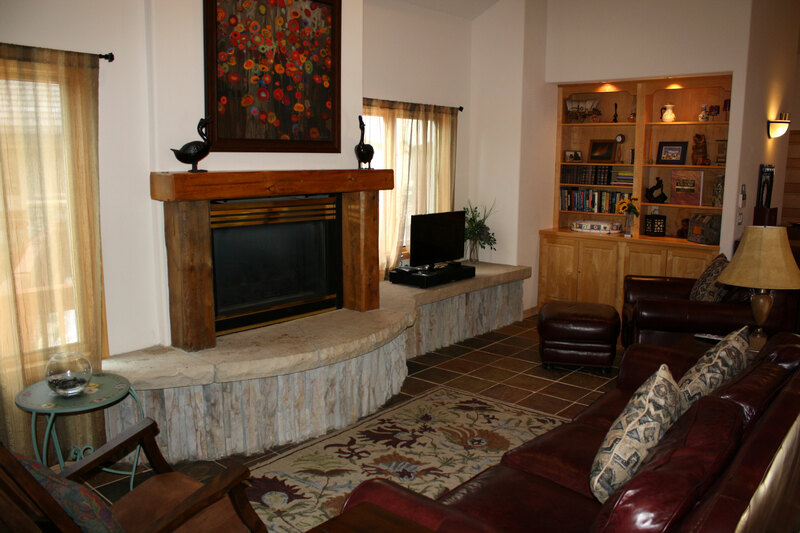 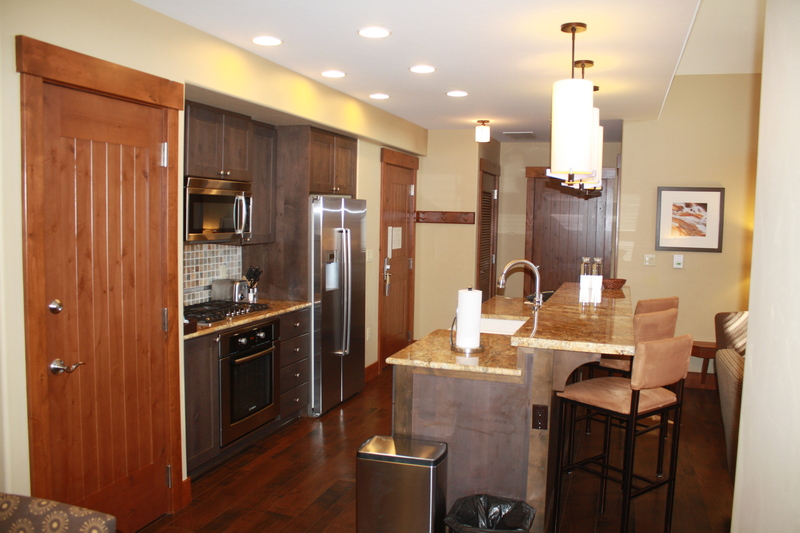 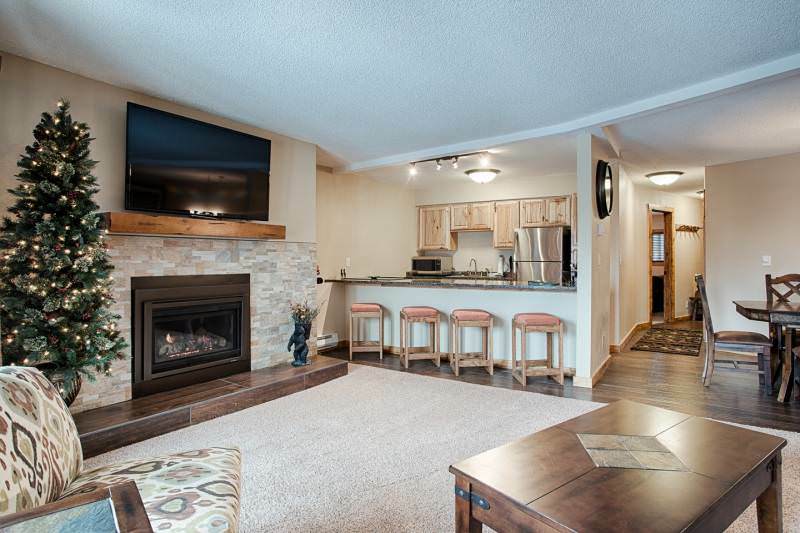 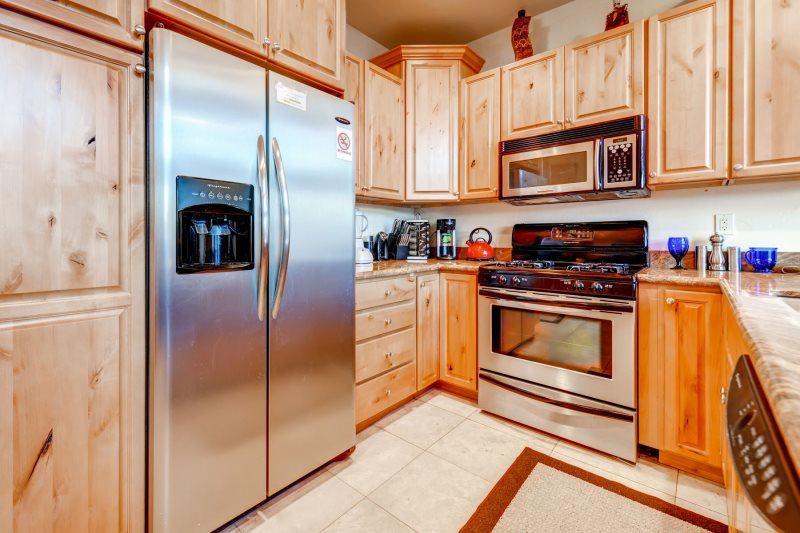 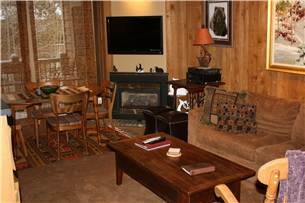 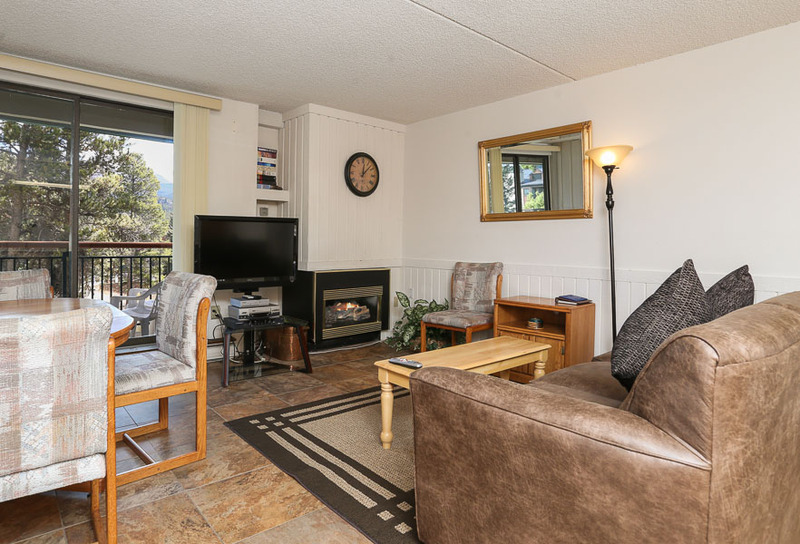 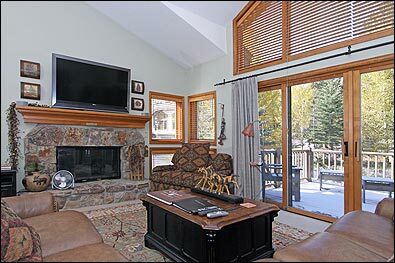 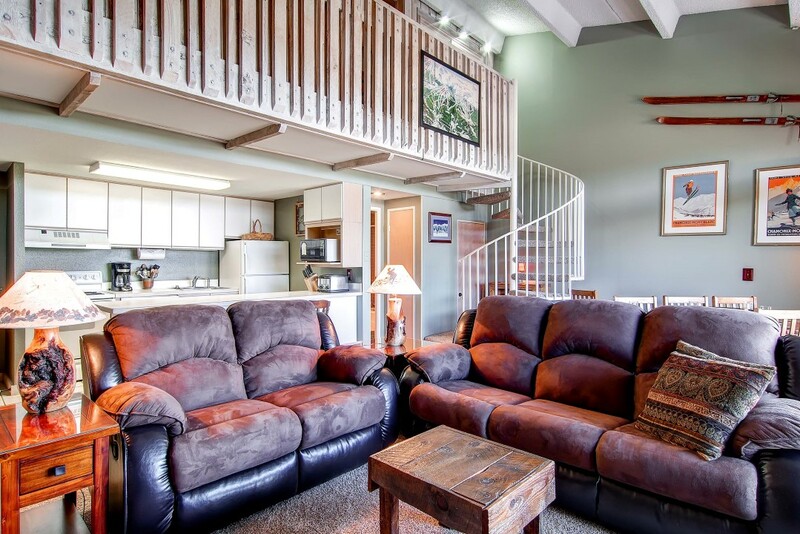 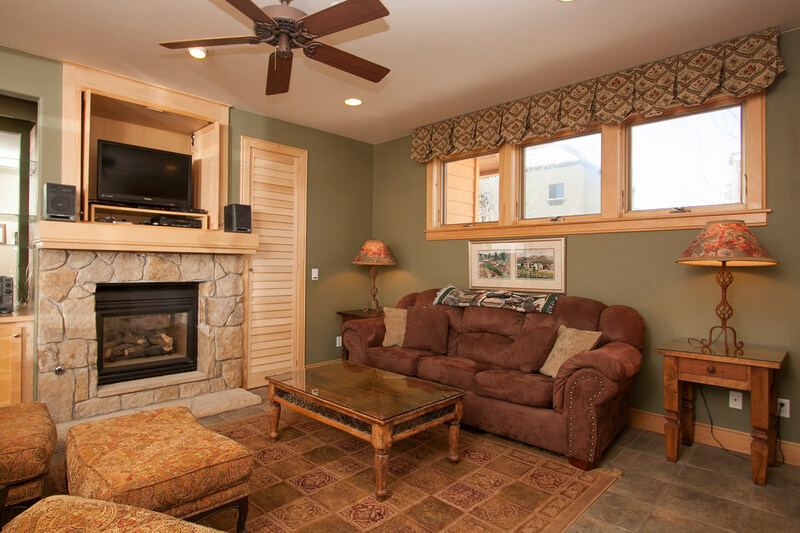 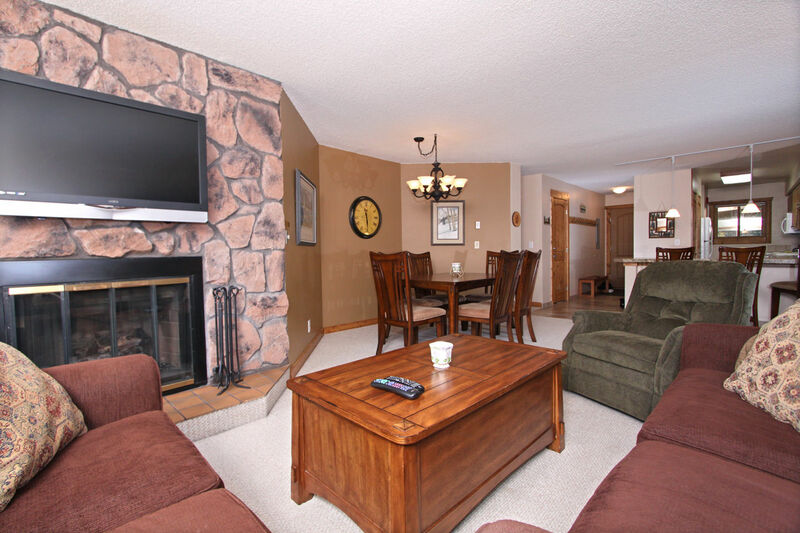 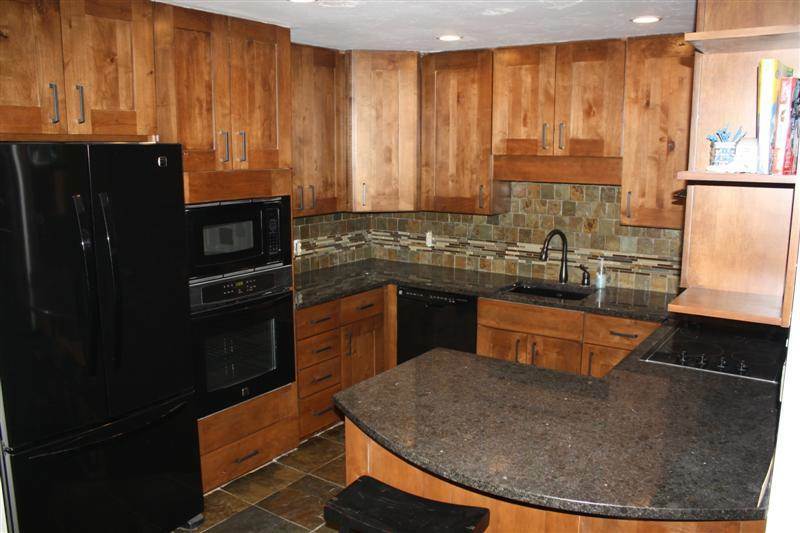 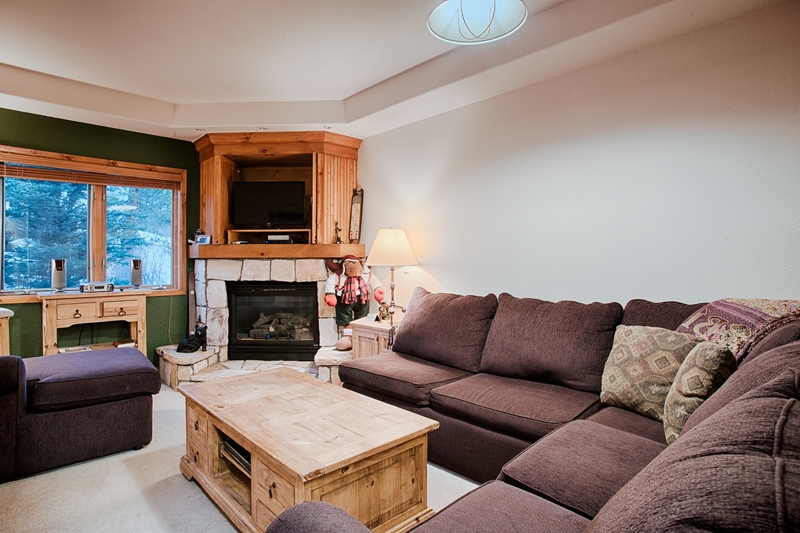 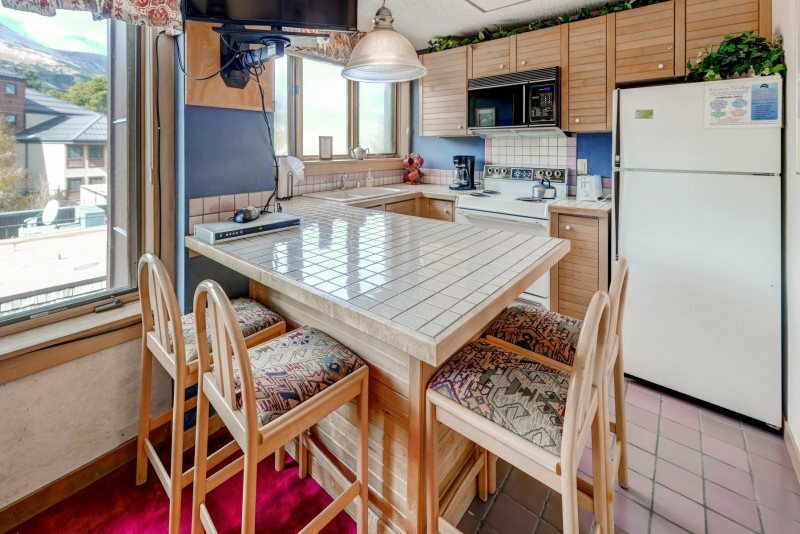 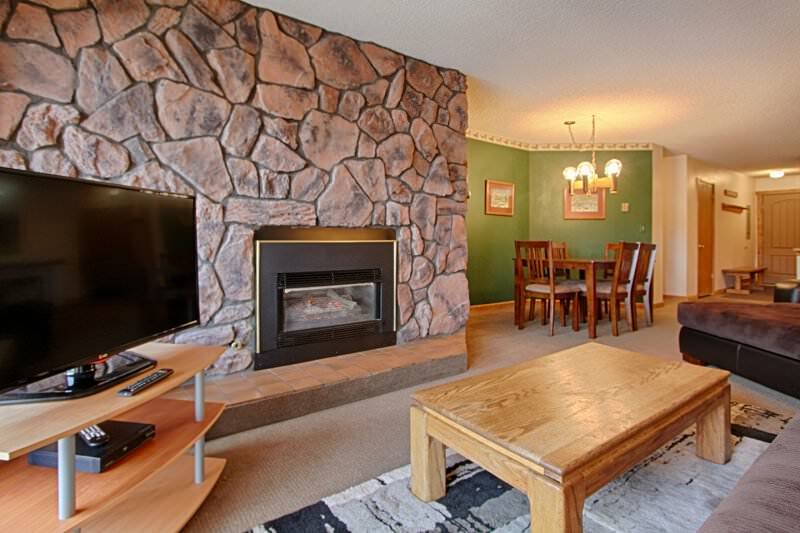 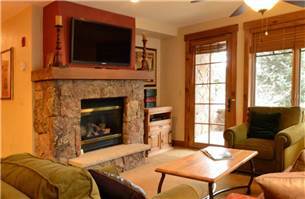 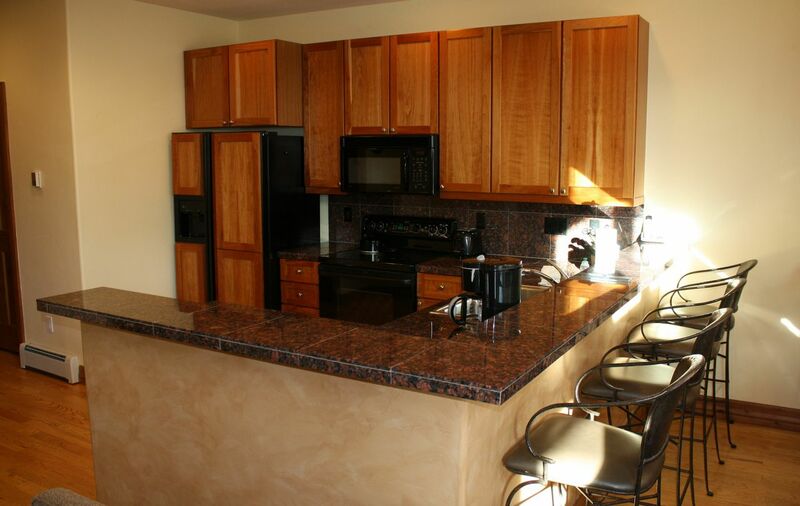 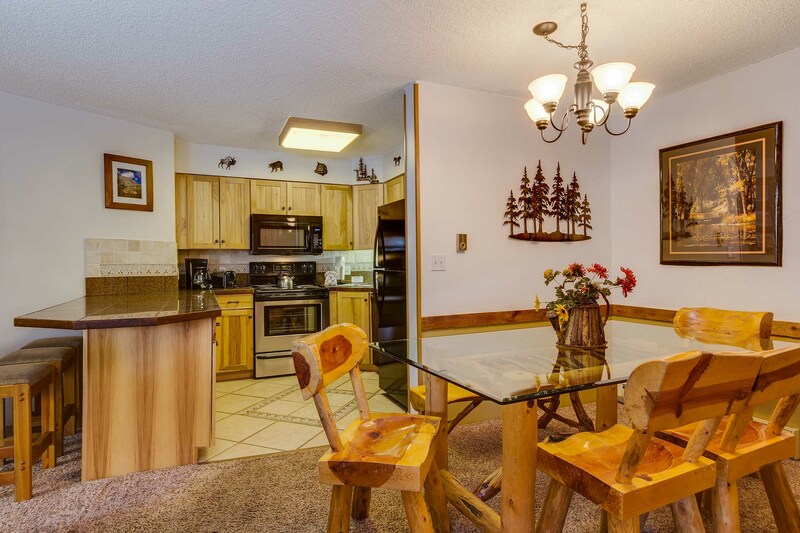 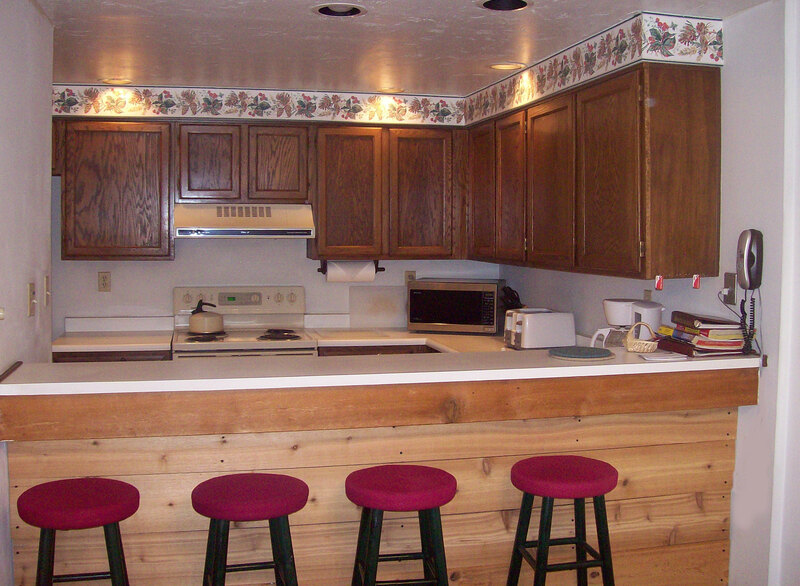 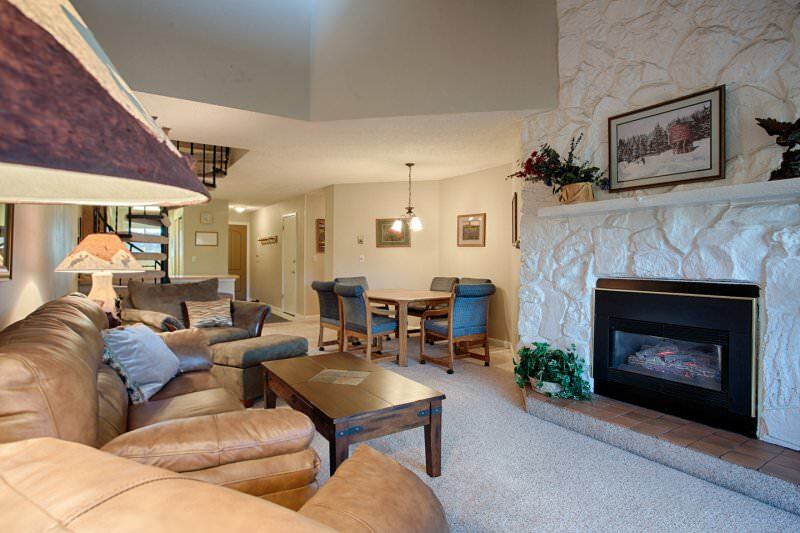 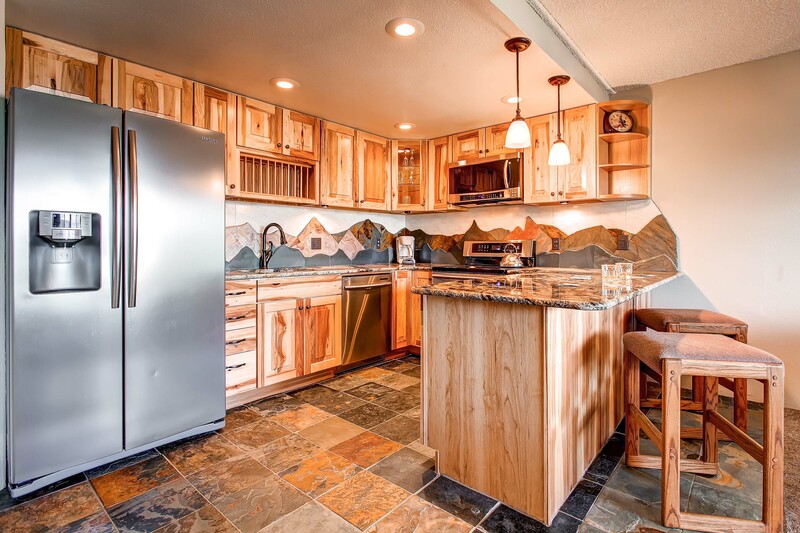 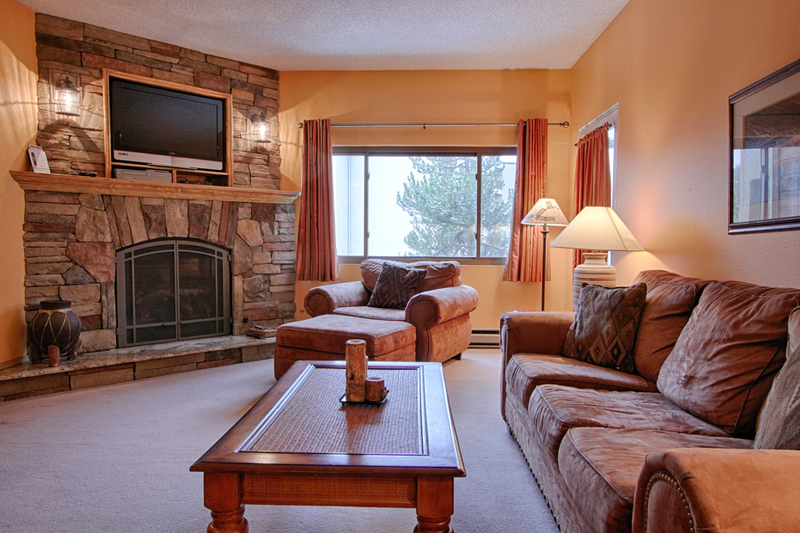 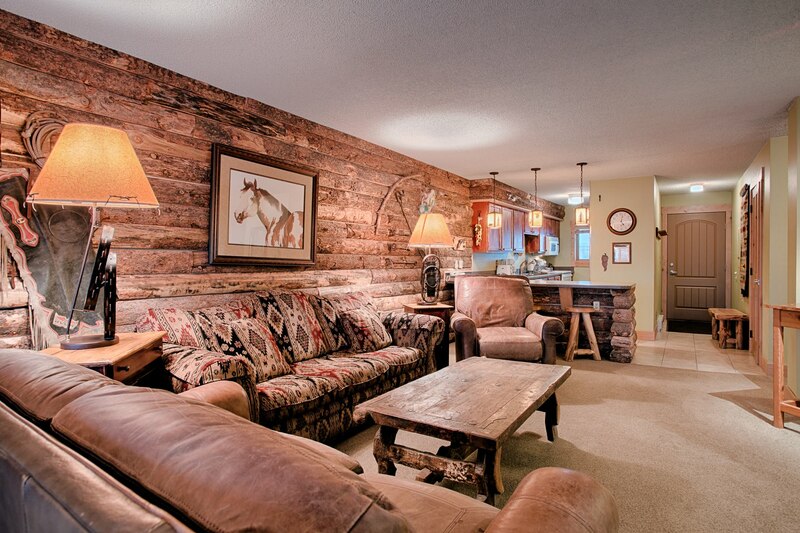 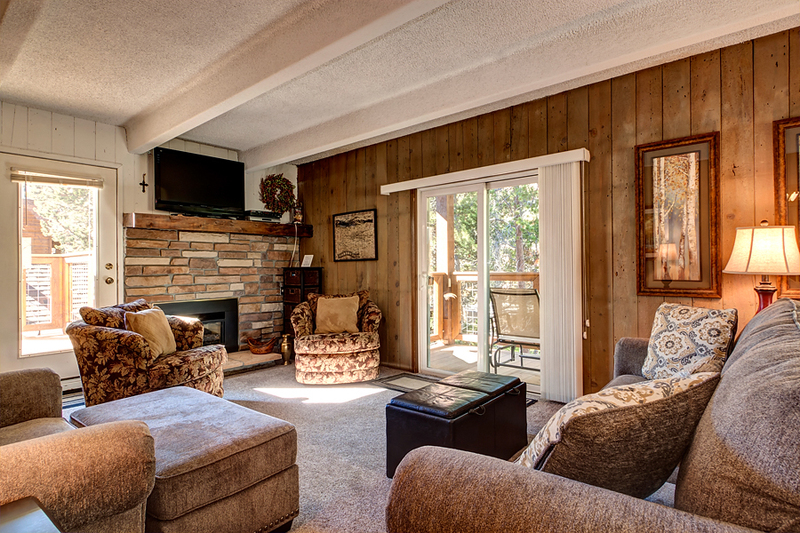 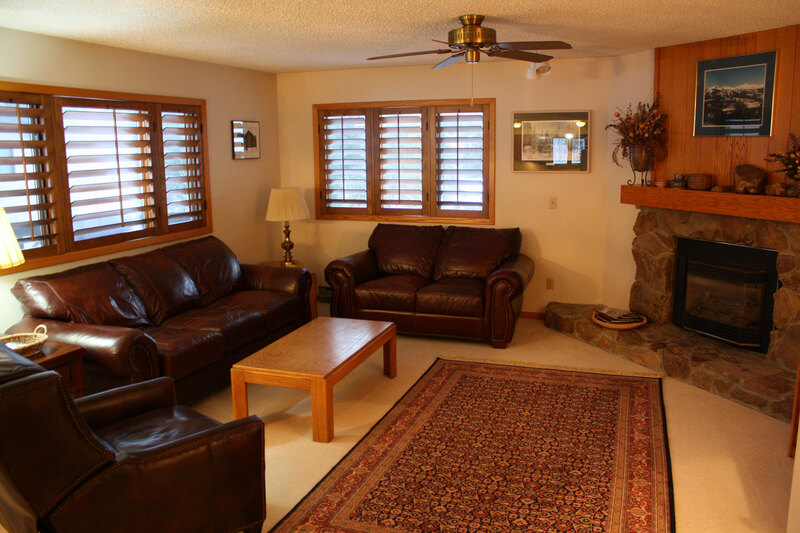 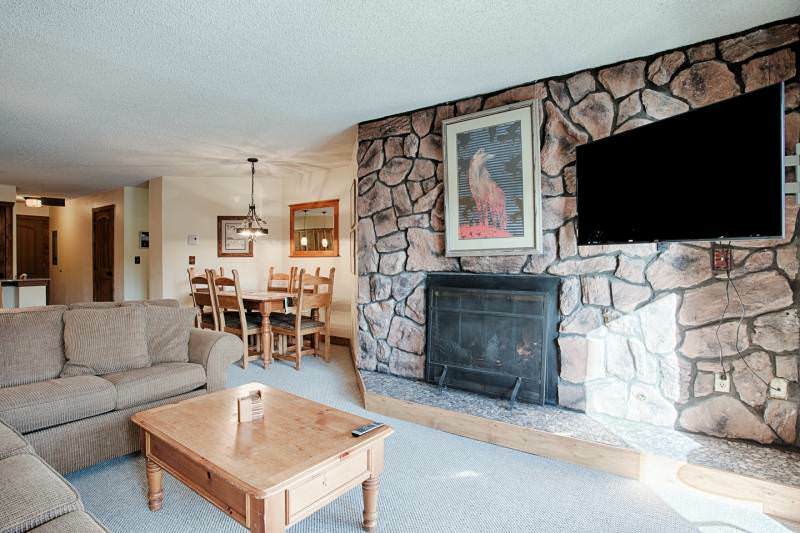 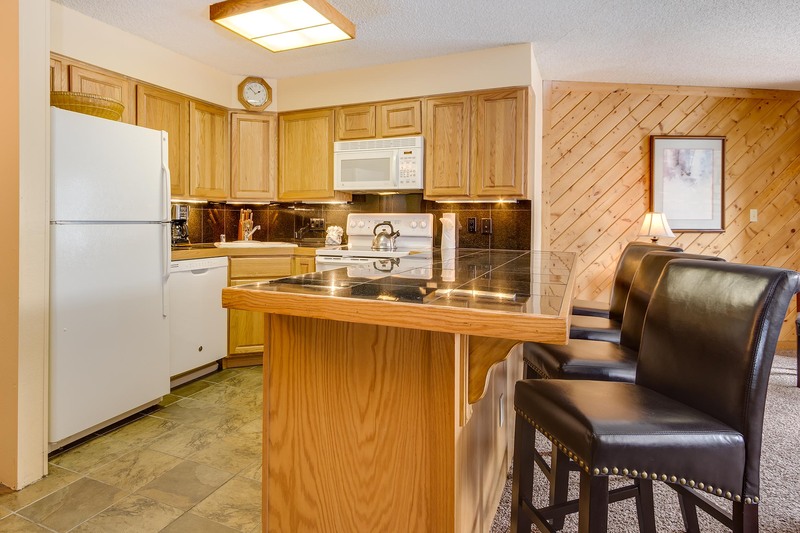 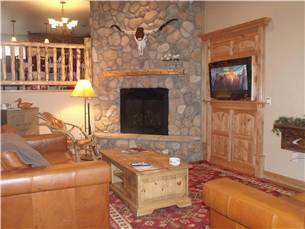 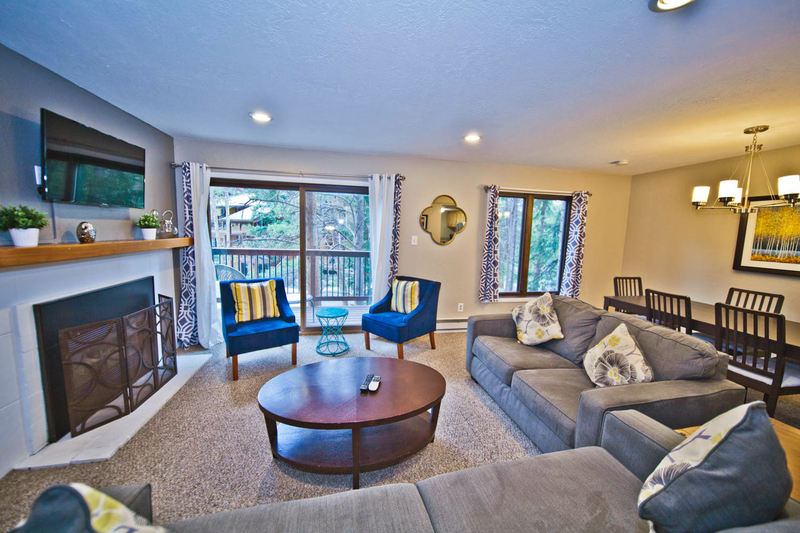 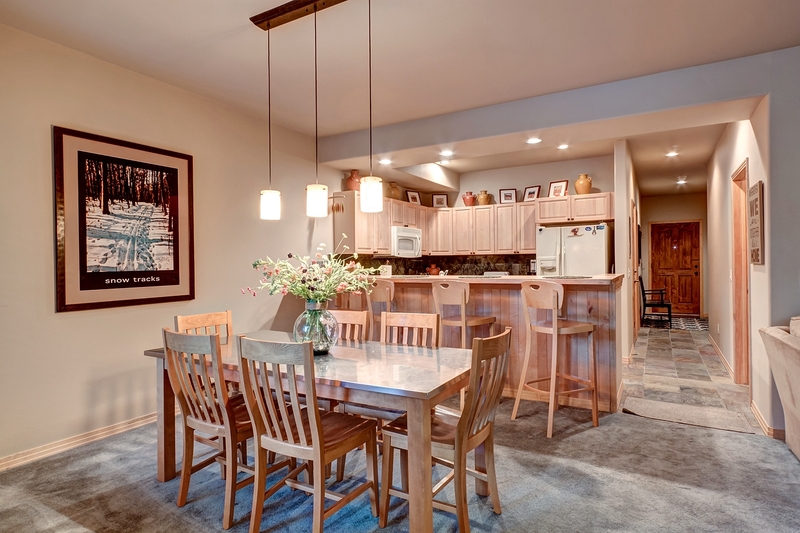 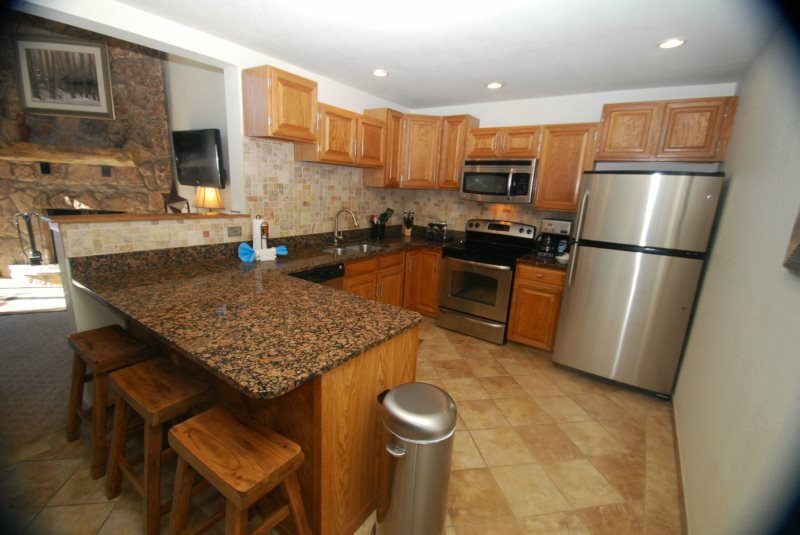 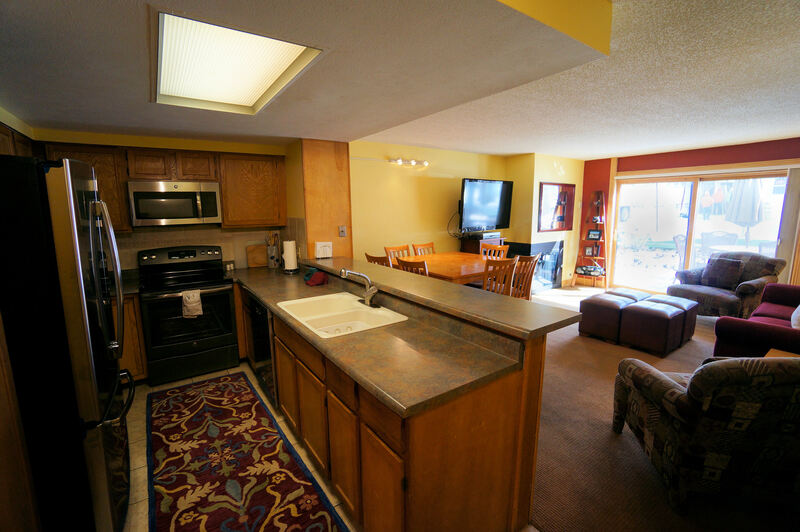 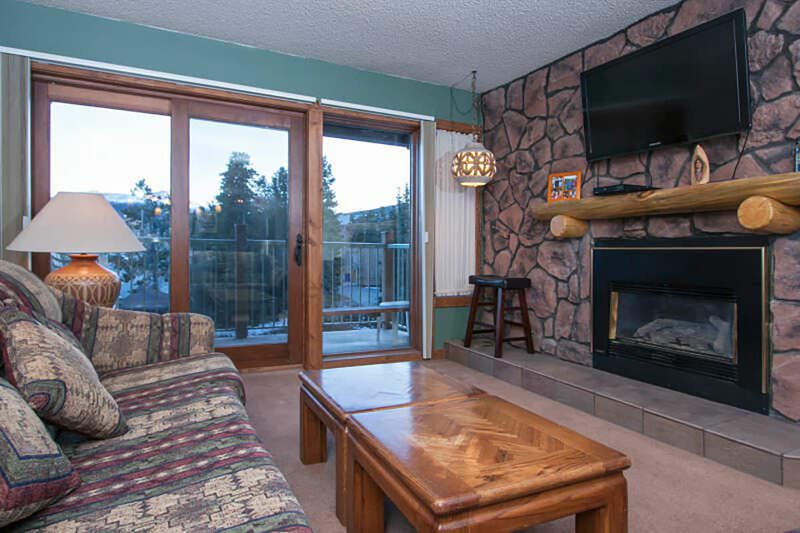 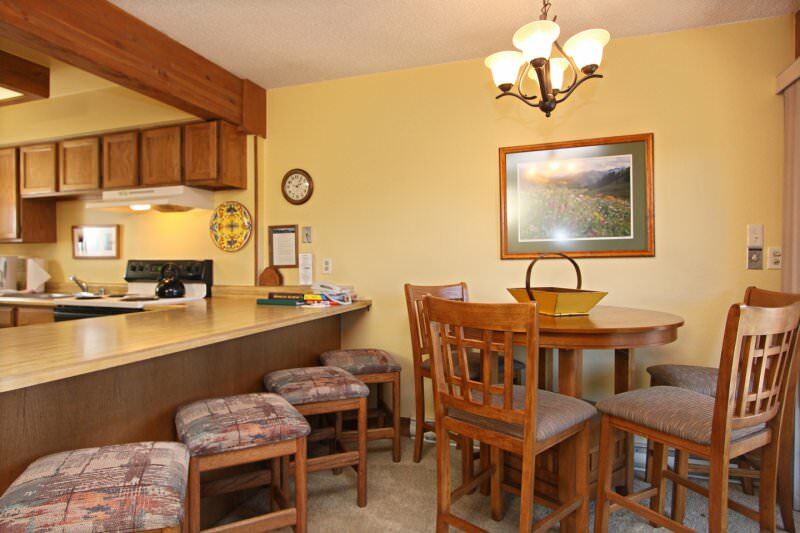 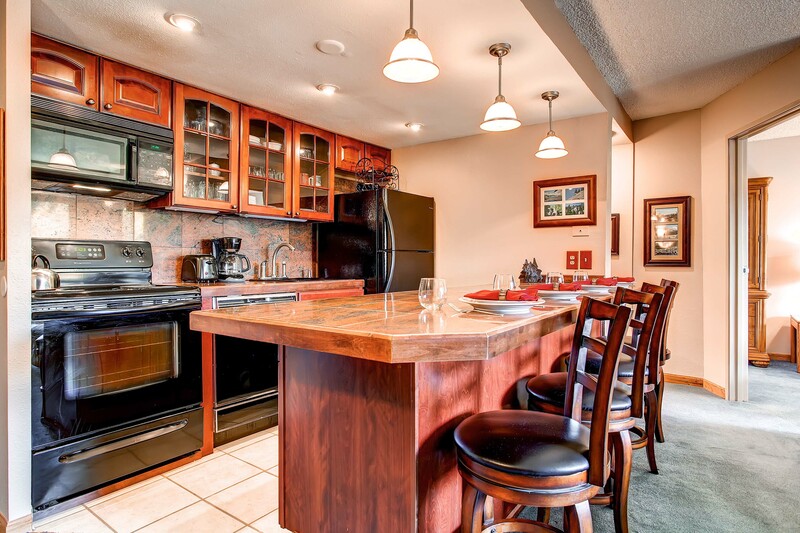 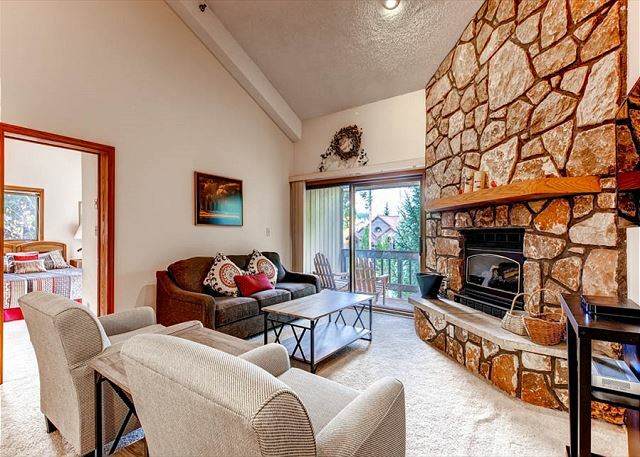 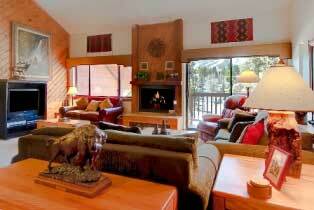 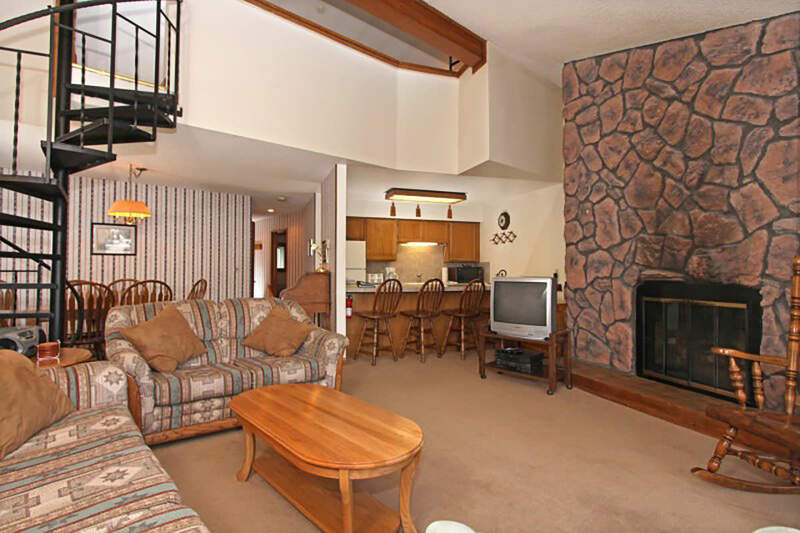 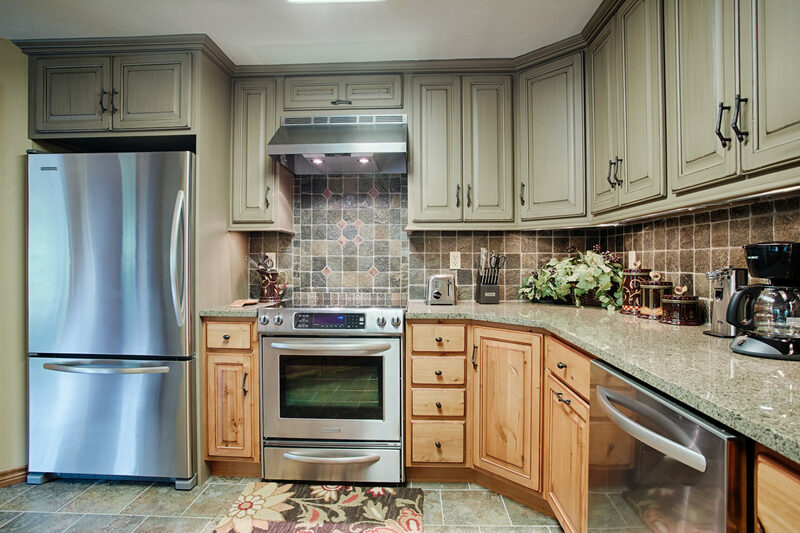 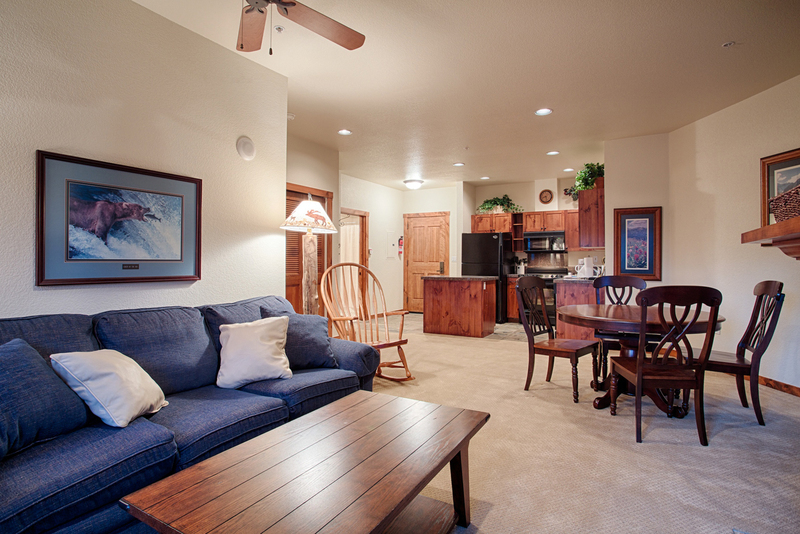 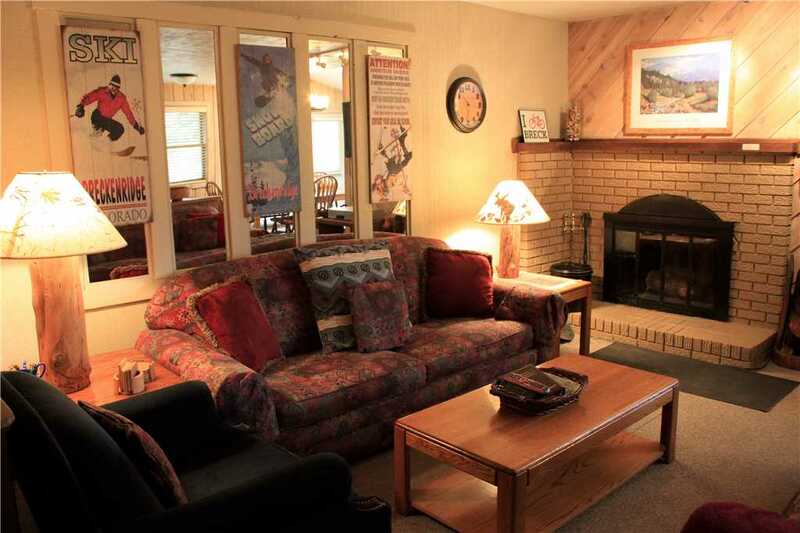 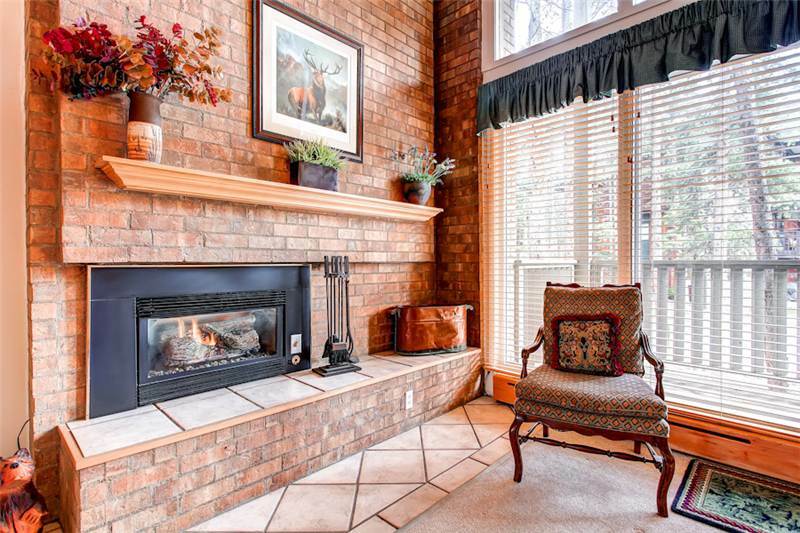 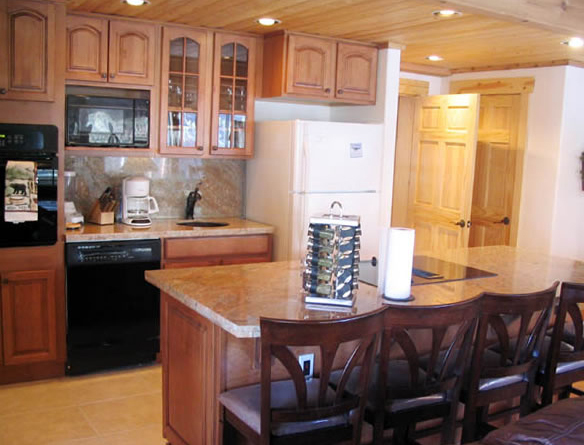 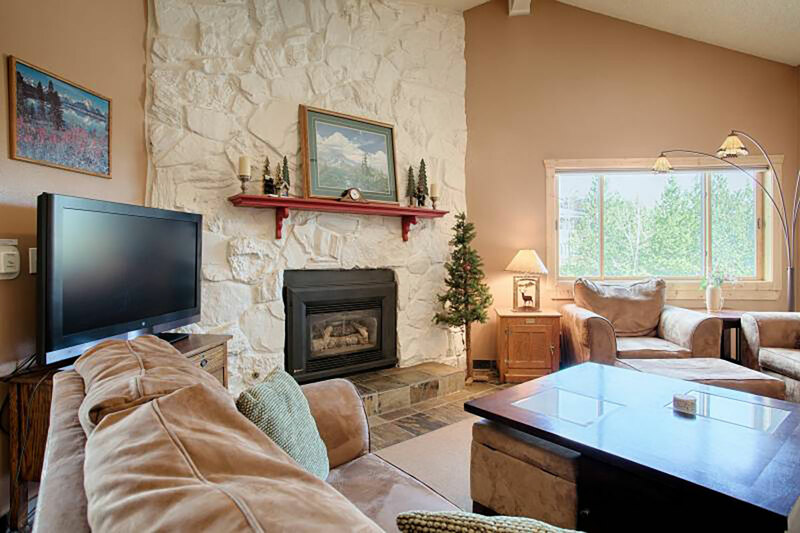 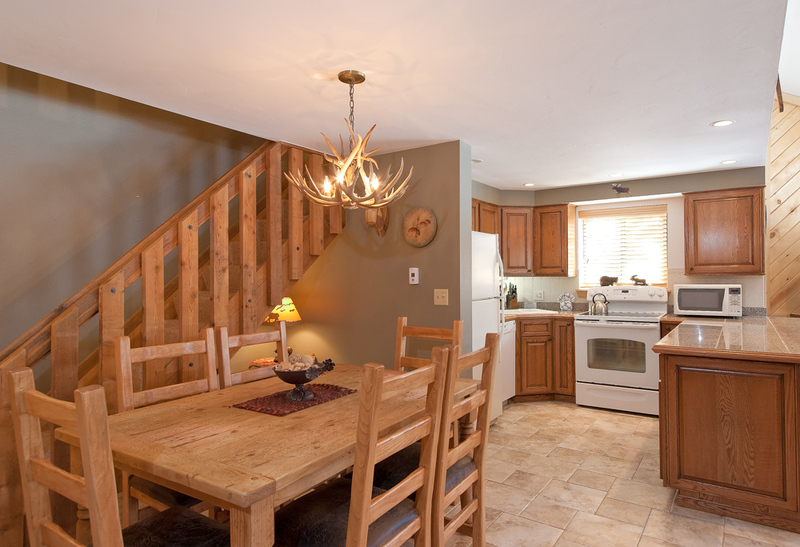 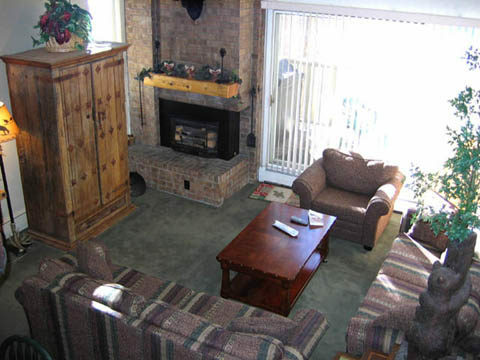 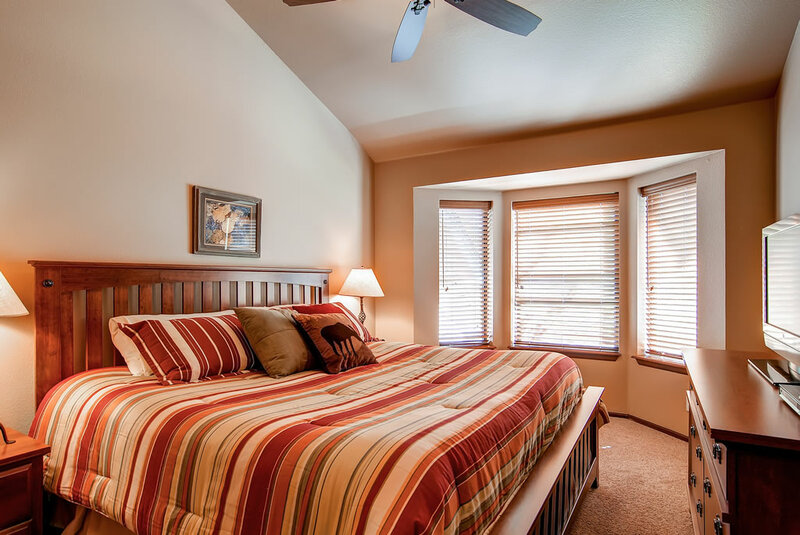 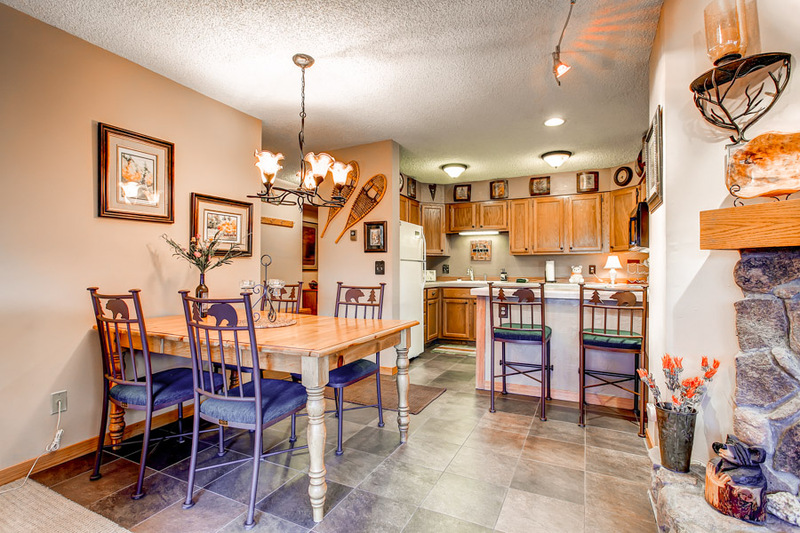 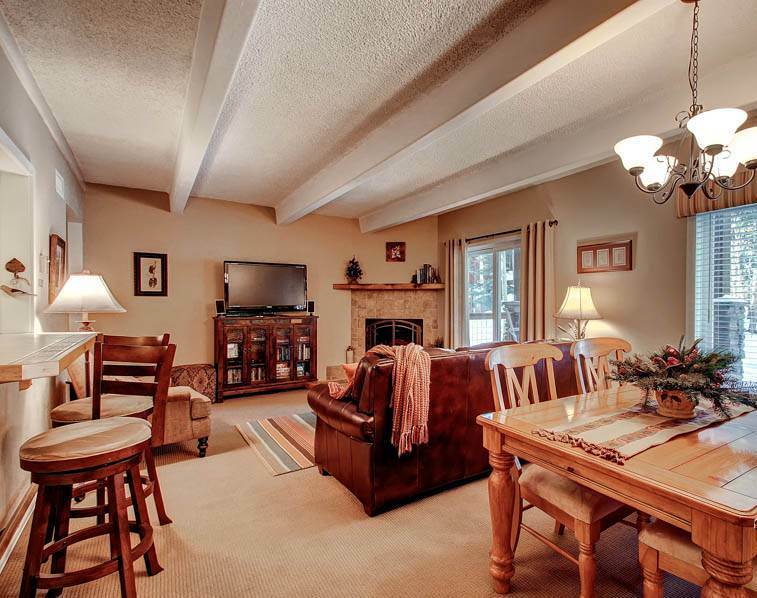 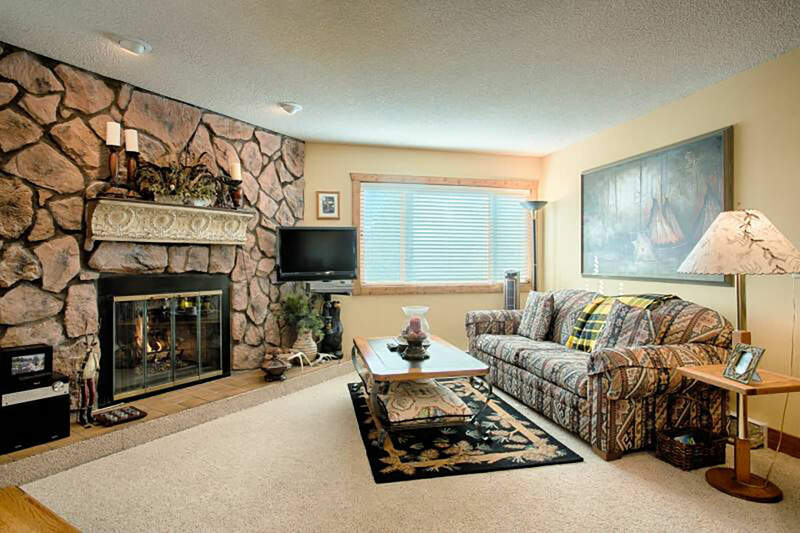 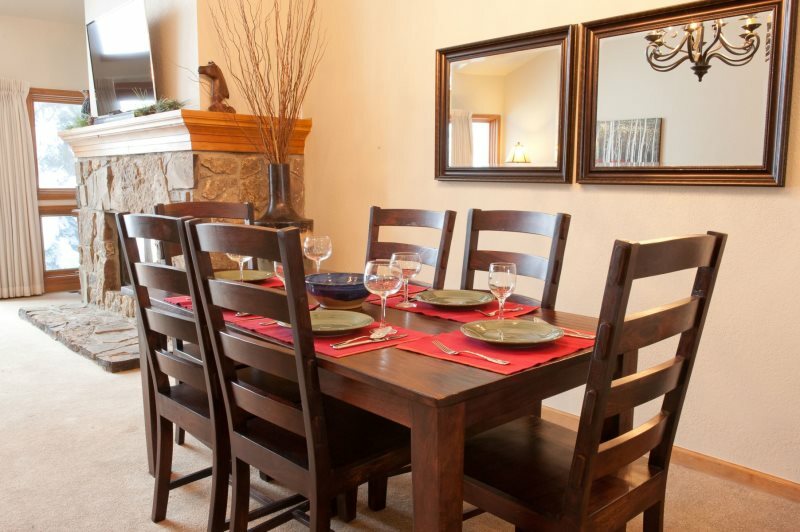 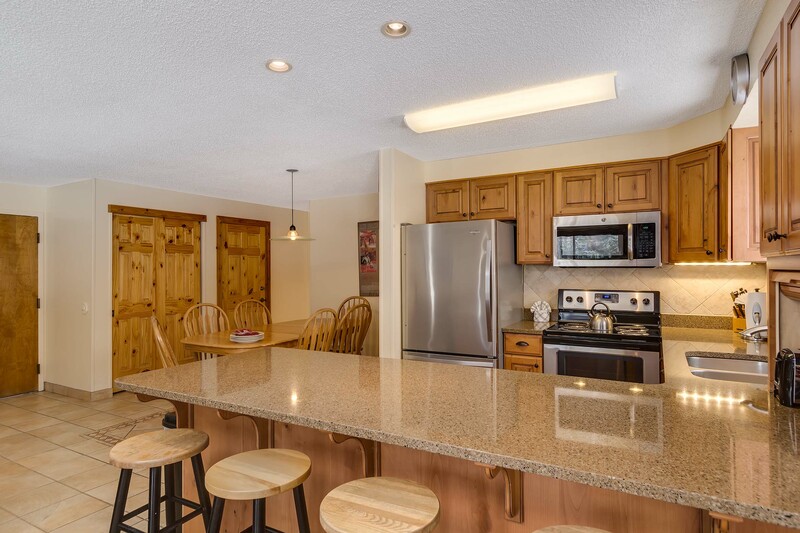 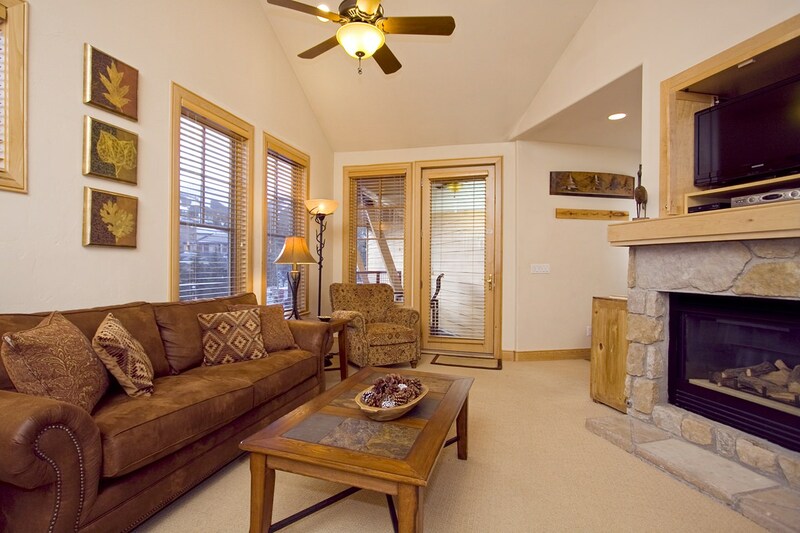 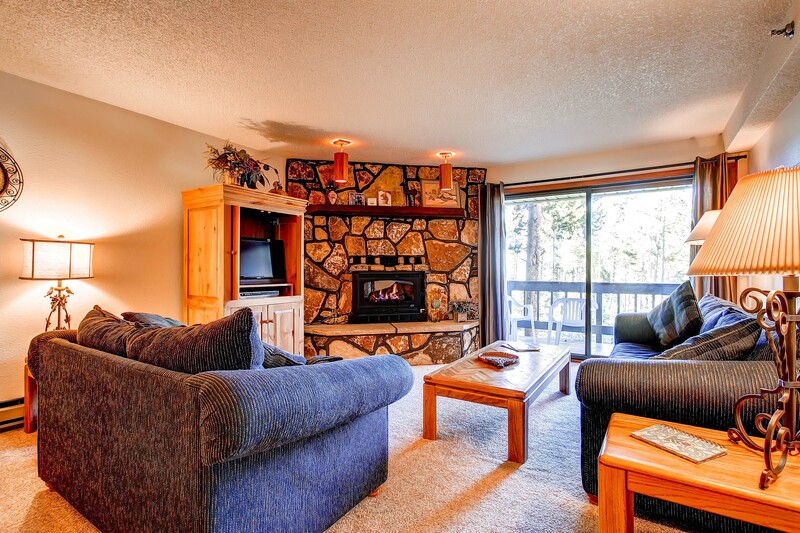 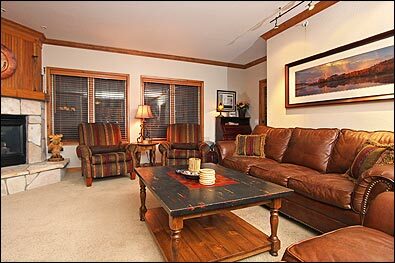 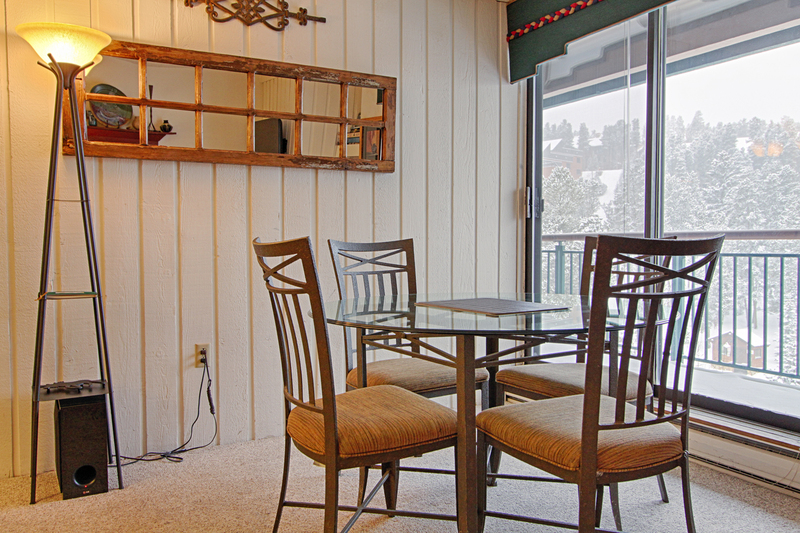 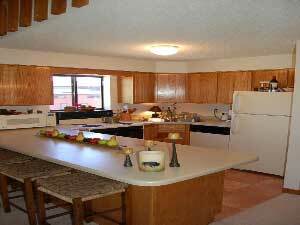 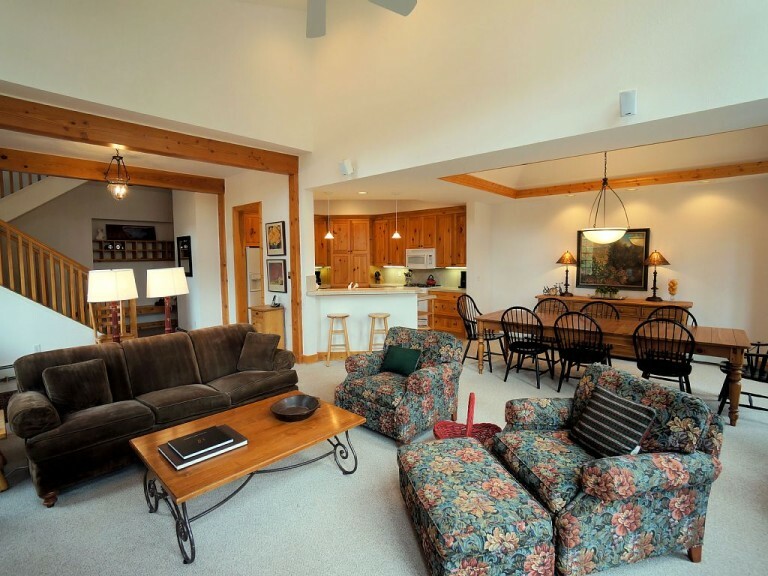 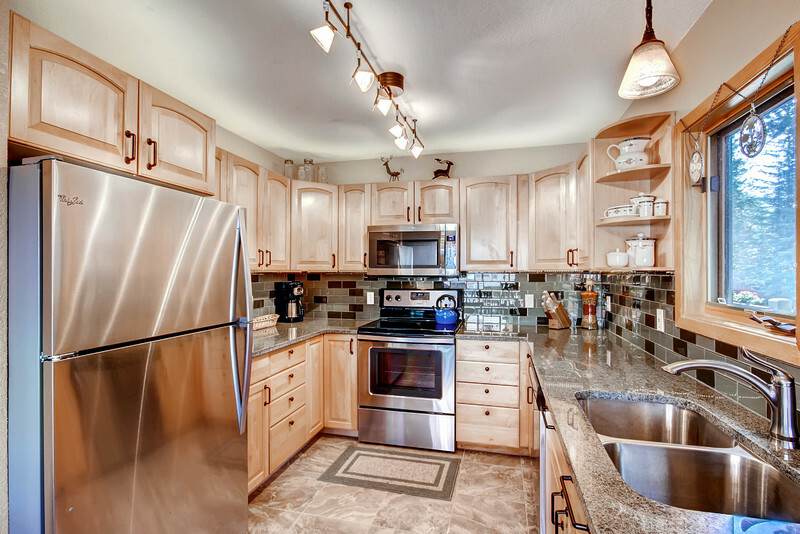 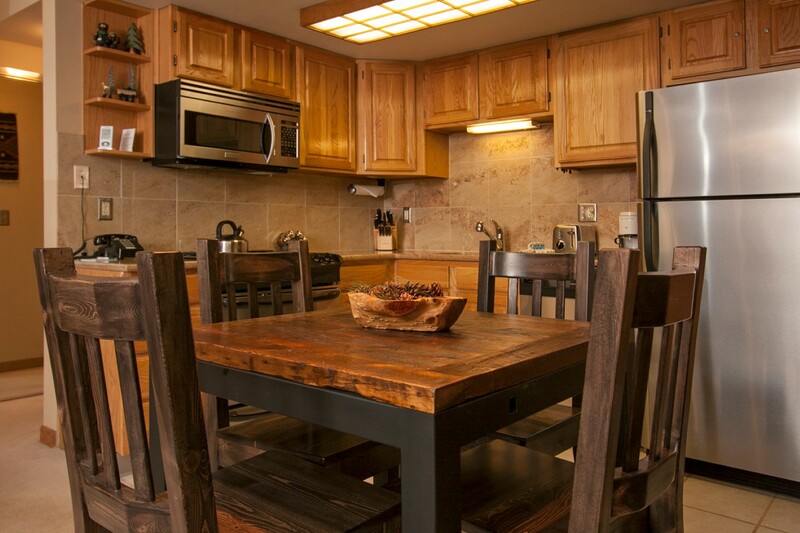 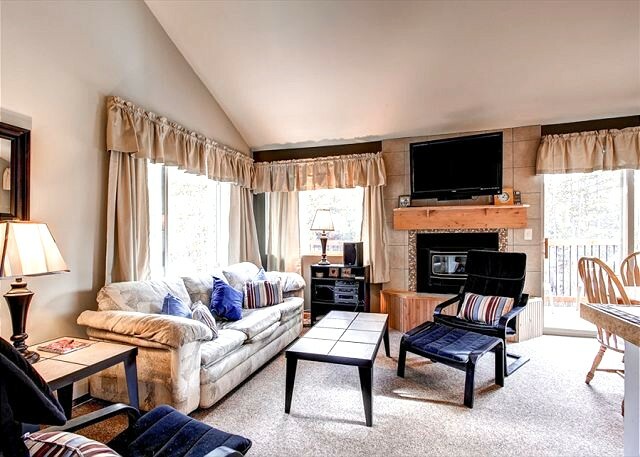 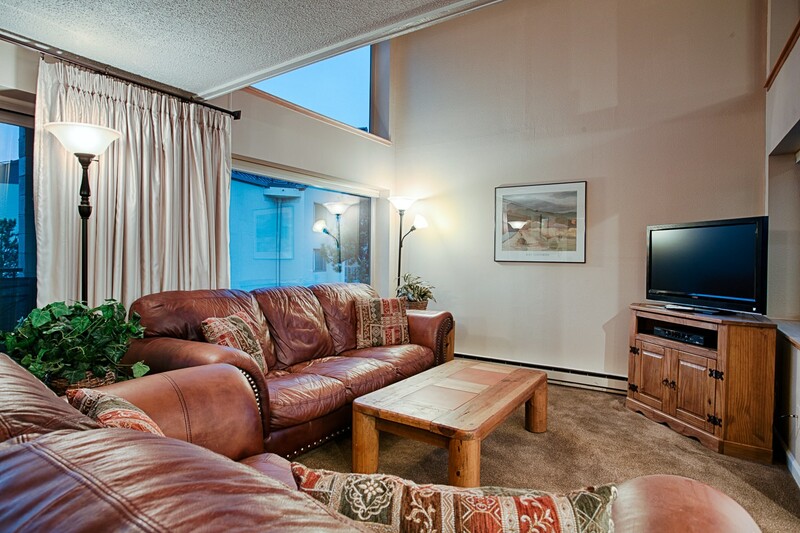 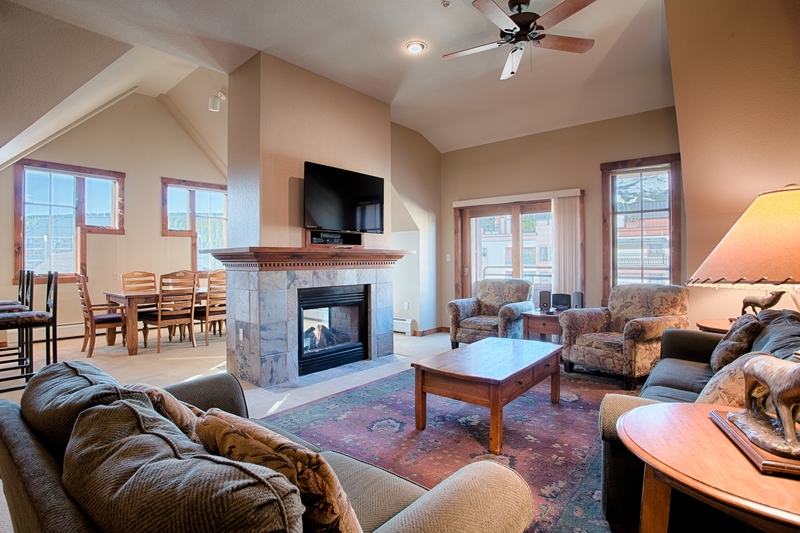 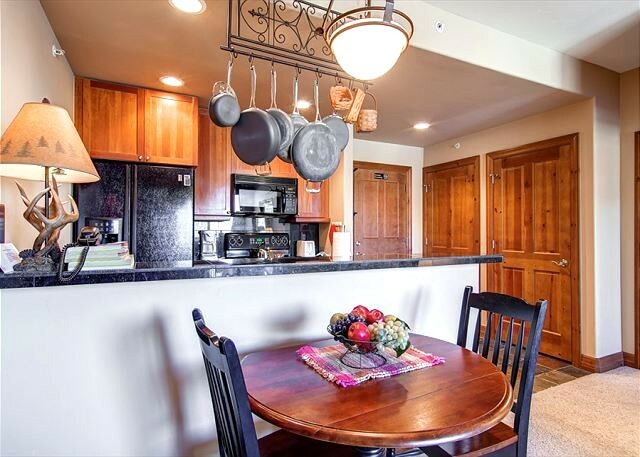 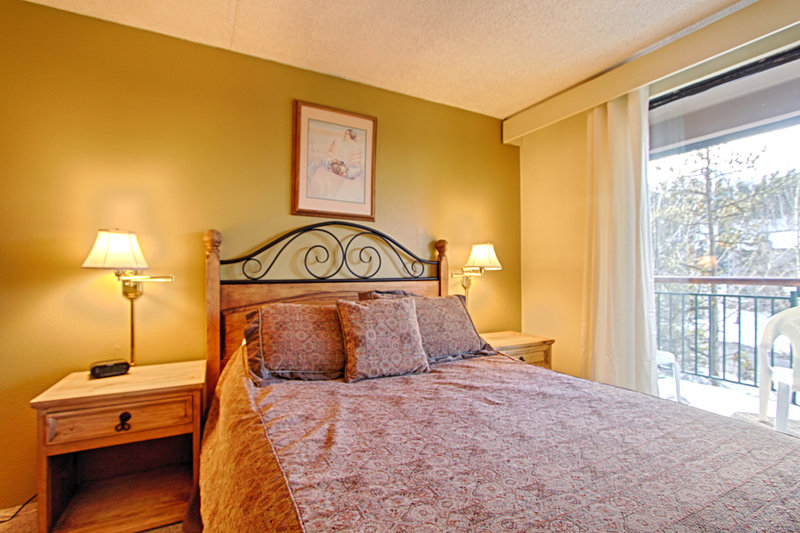 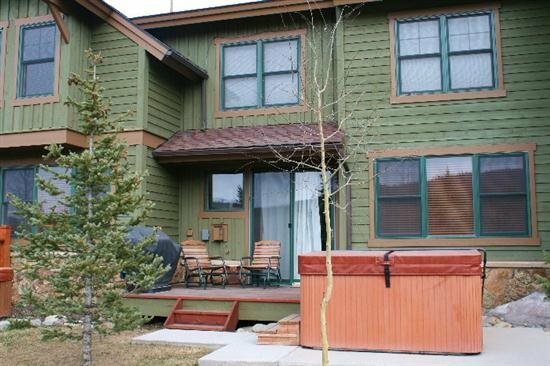 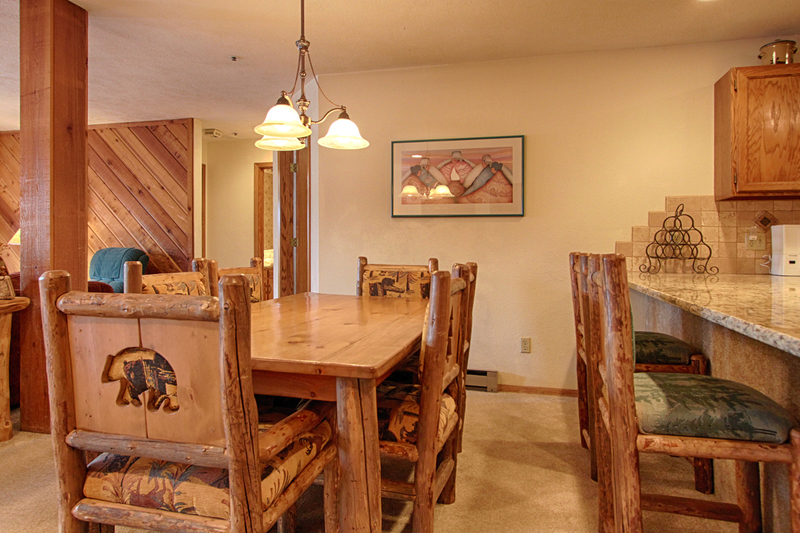 Guests can also enjoy a shared patio with gas grills and a large community hot tub.